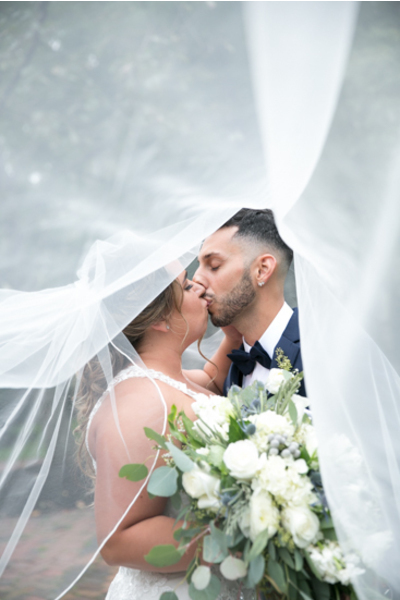 Congratulations to Carly and Lou on tying the knot! 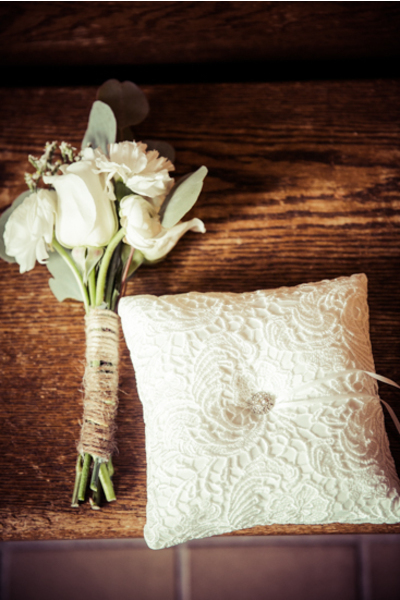 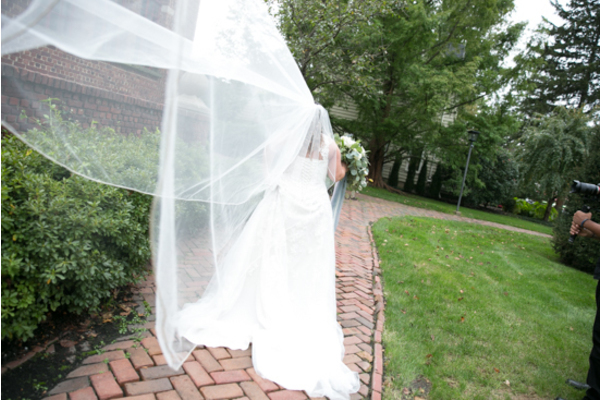 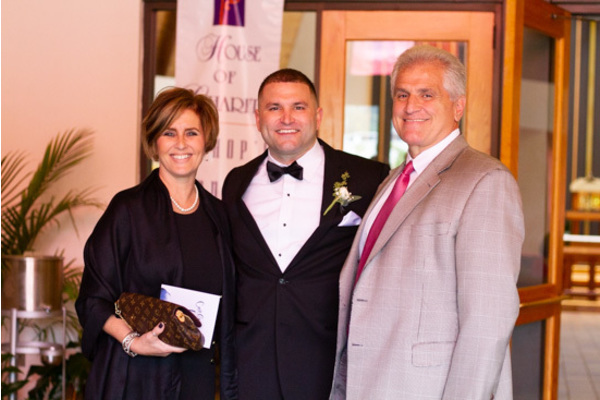 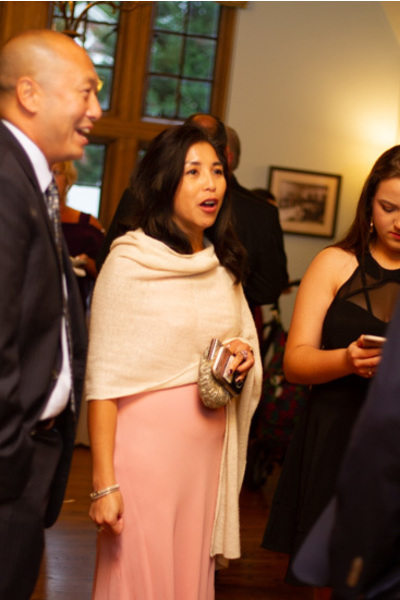 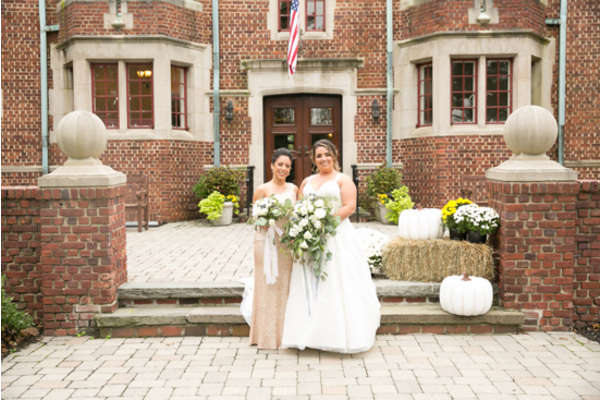 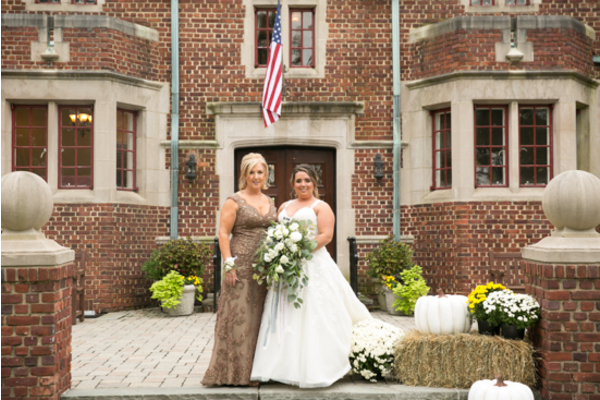 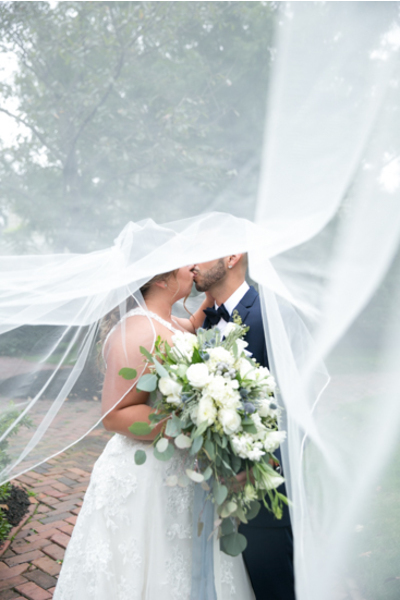 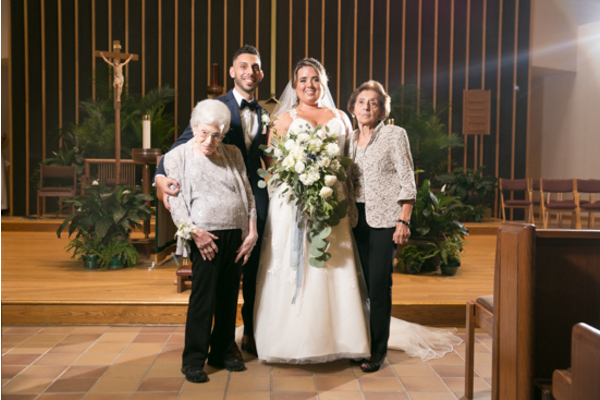 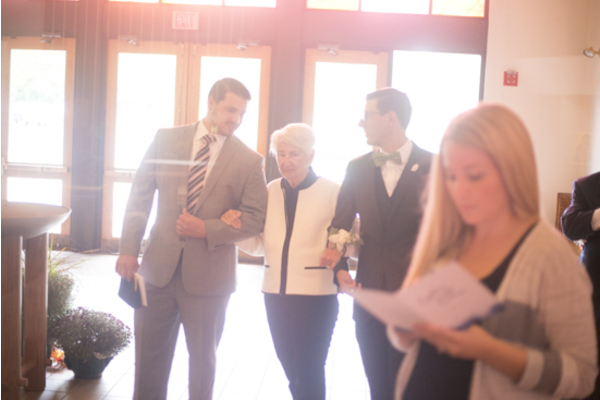 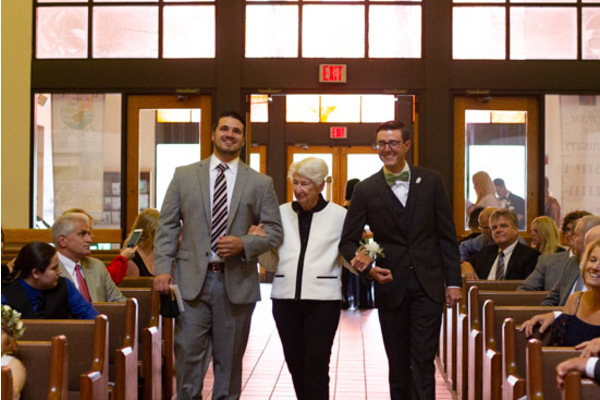 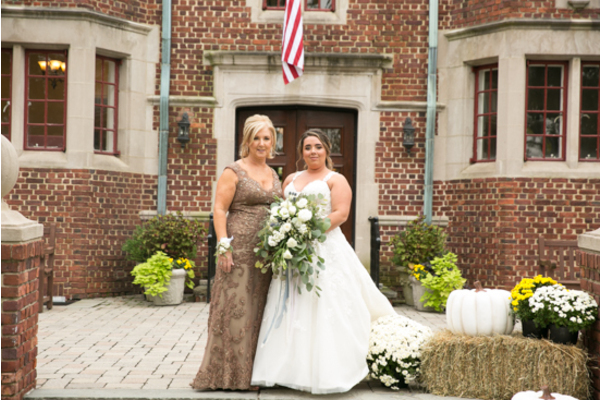 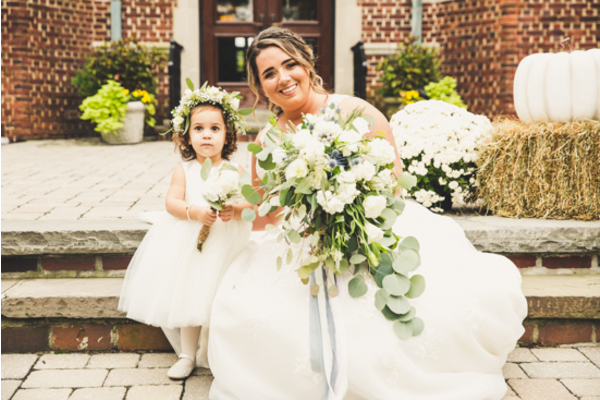 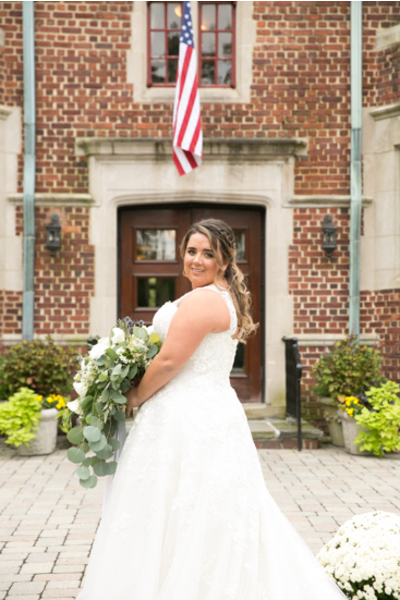 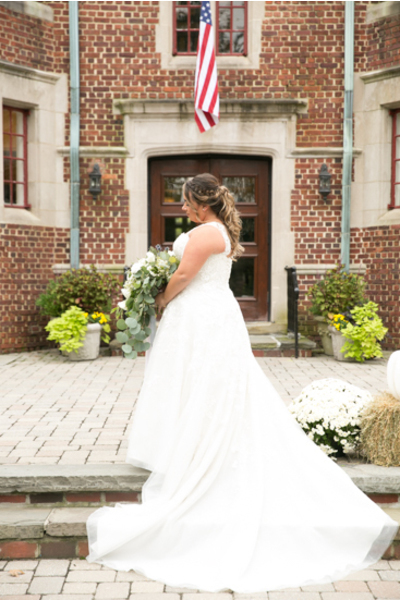 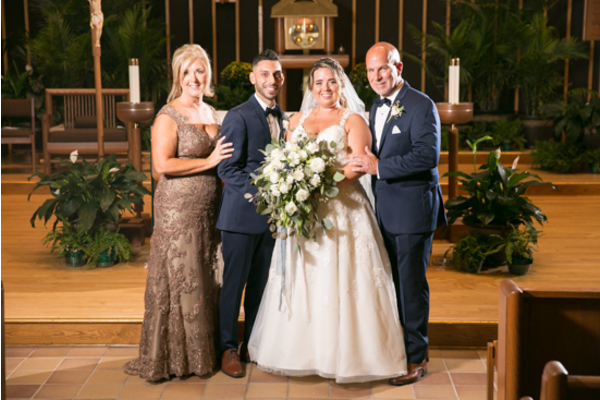 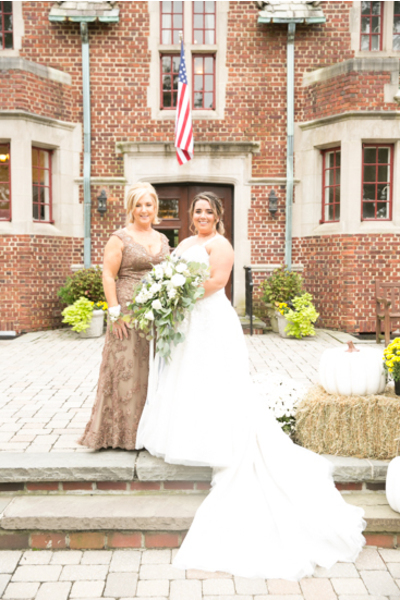 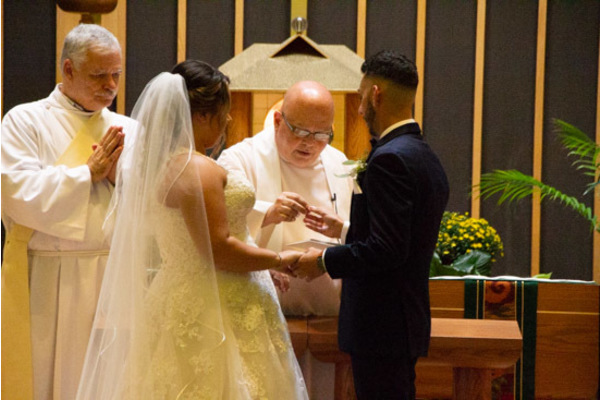 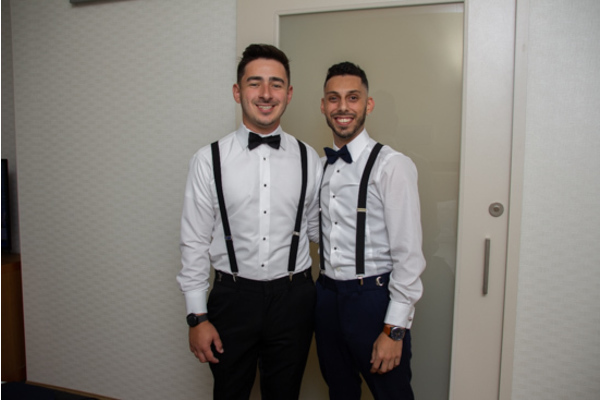 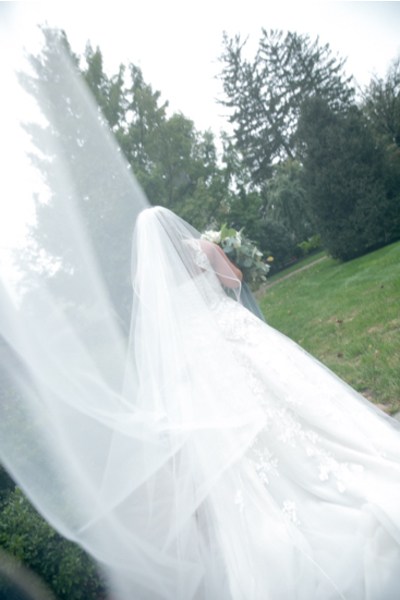 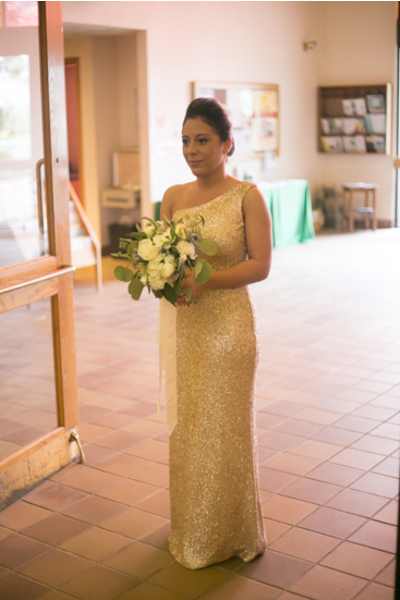 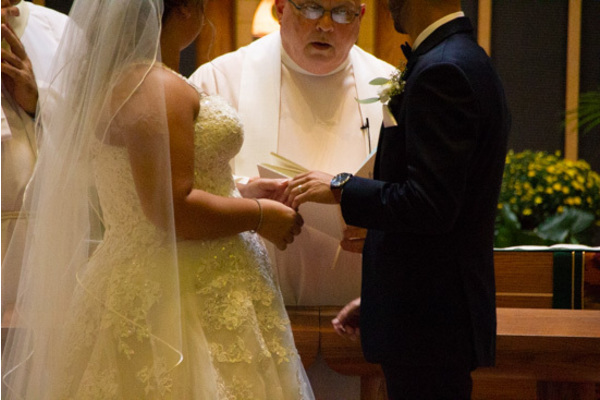 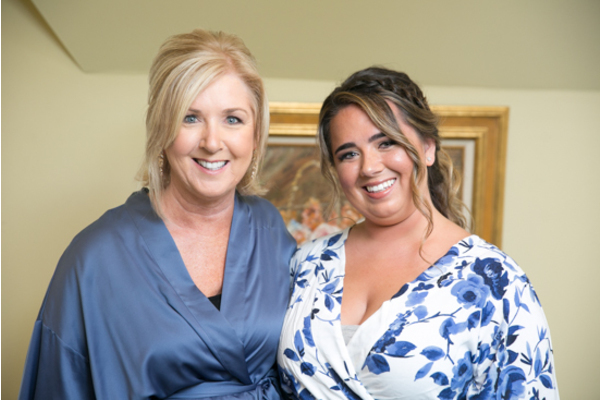 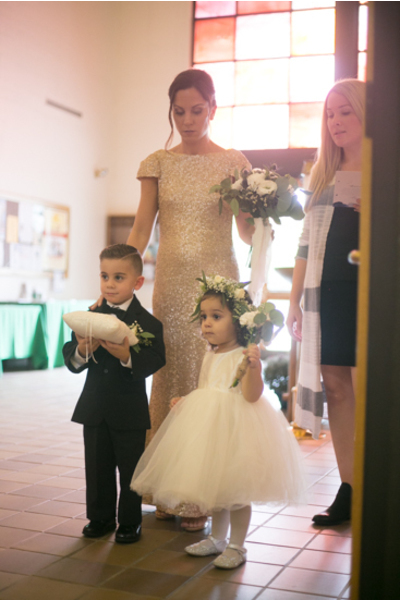 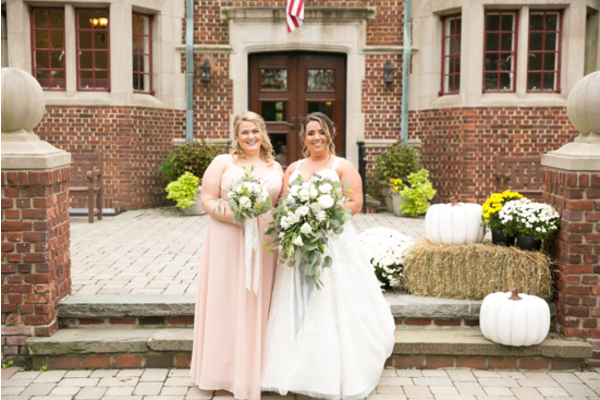 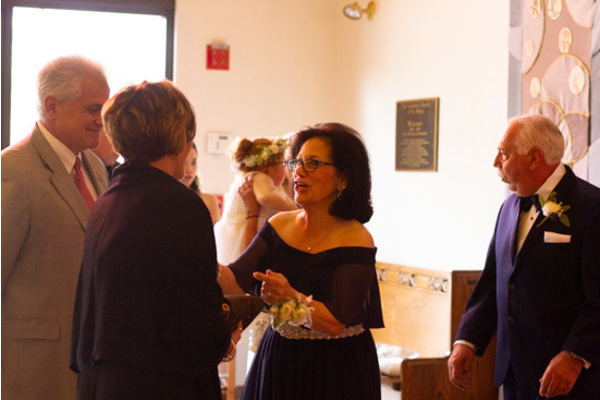 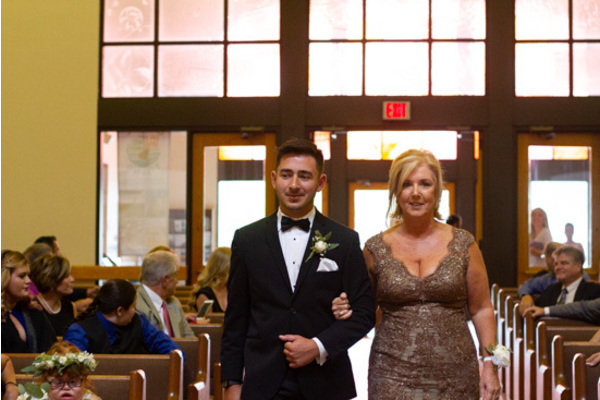 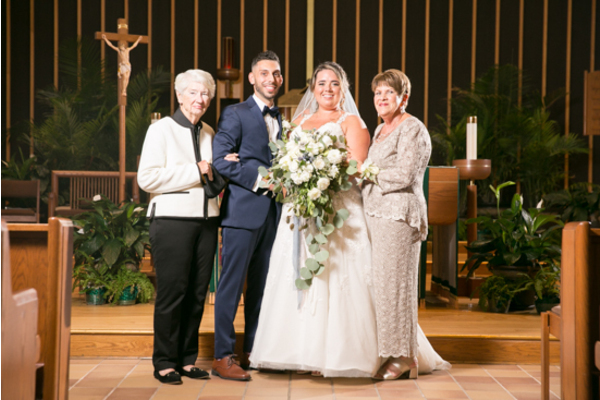 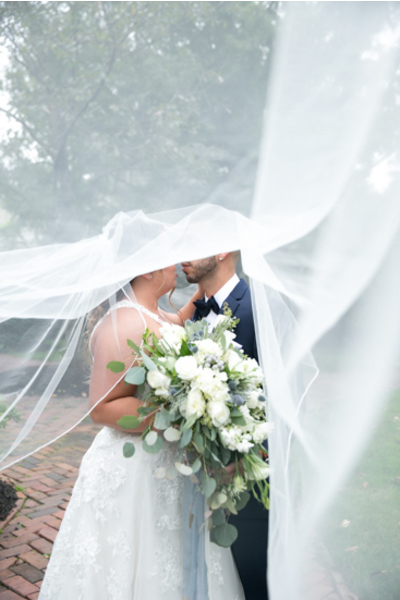 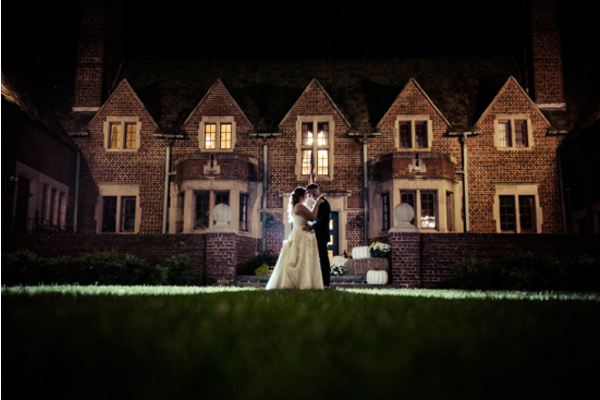 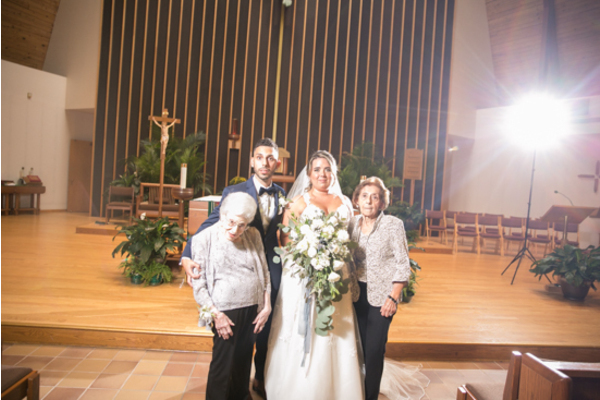 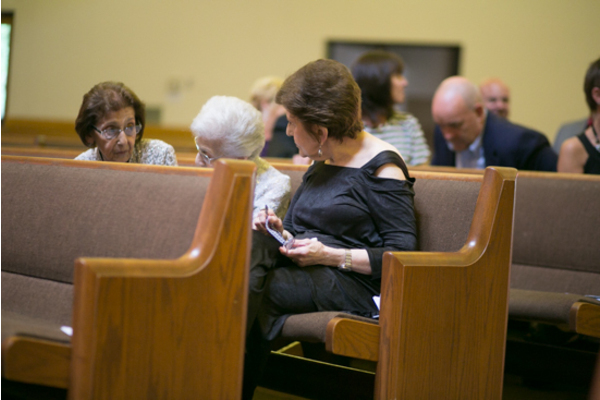 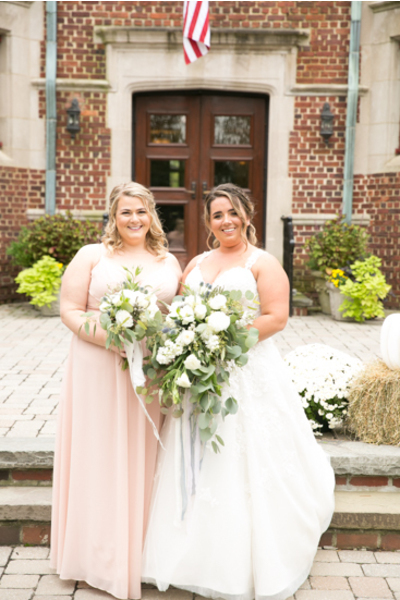 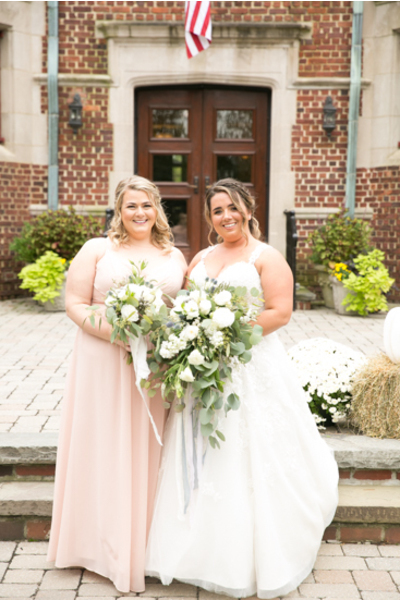 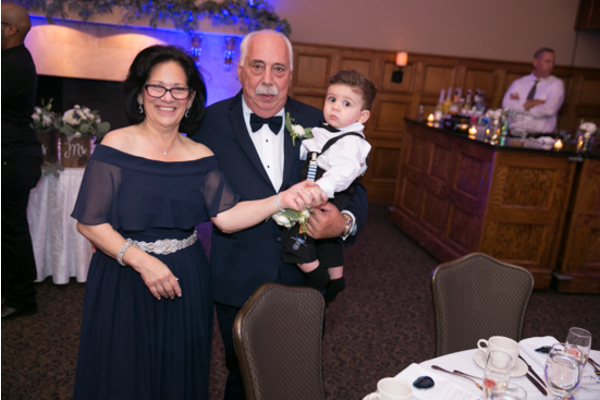 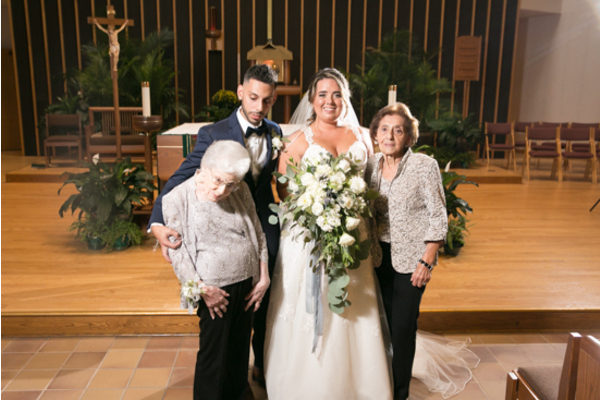 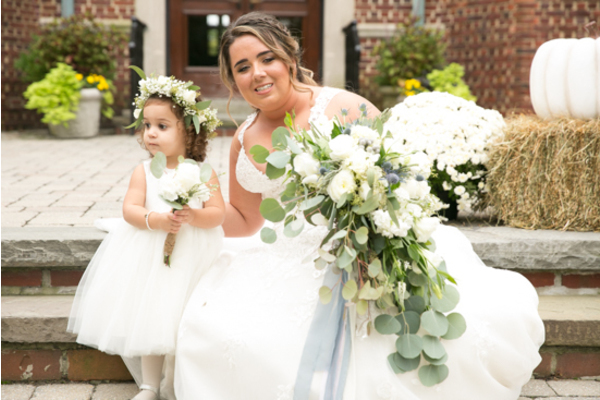 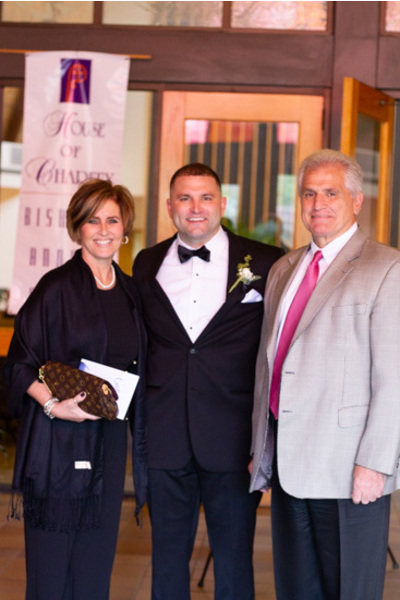 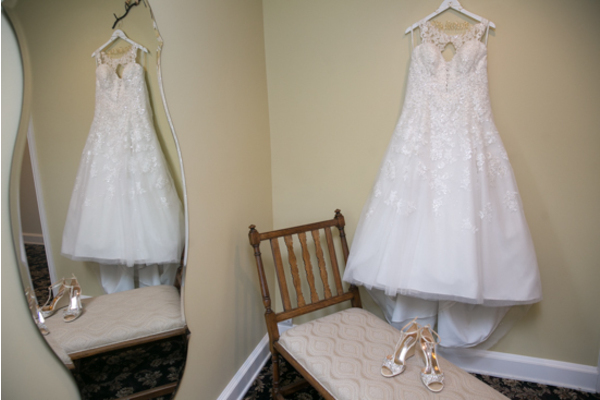 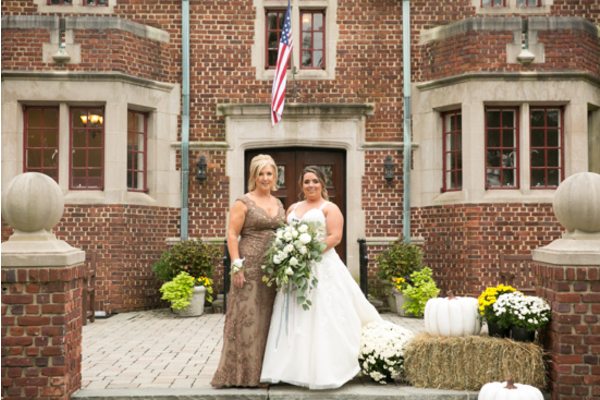 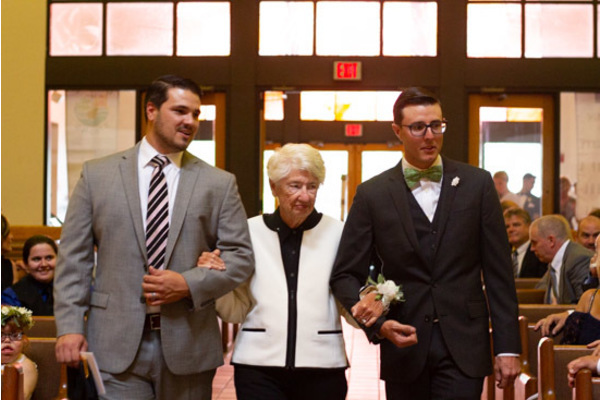 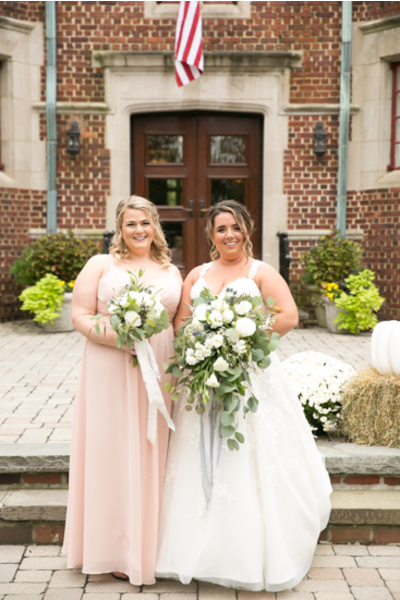 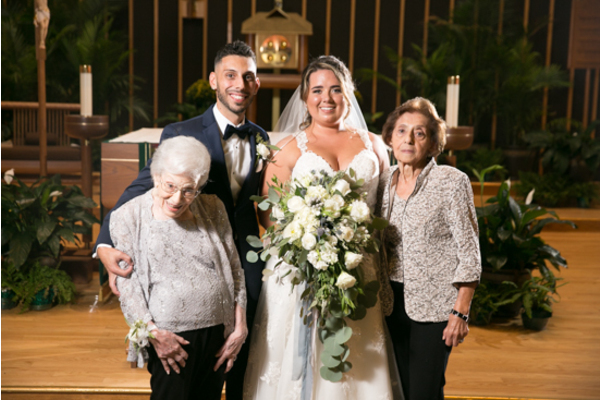 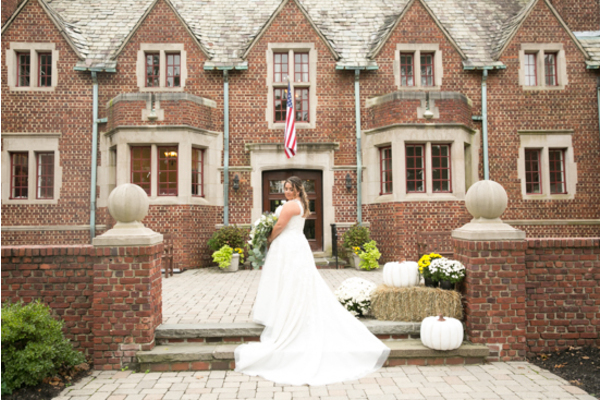 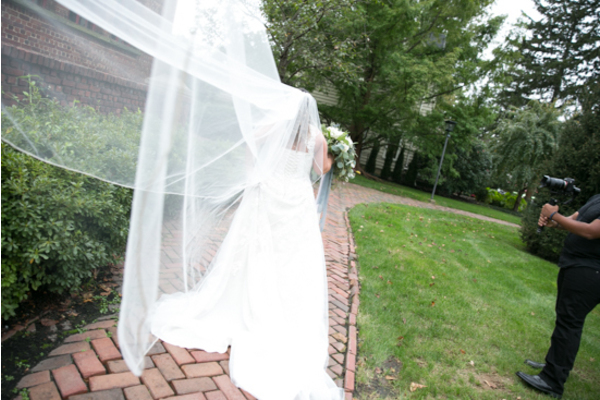 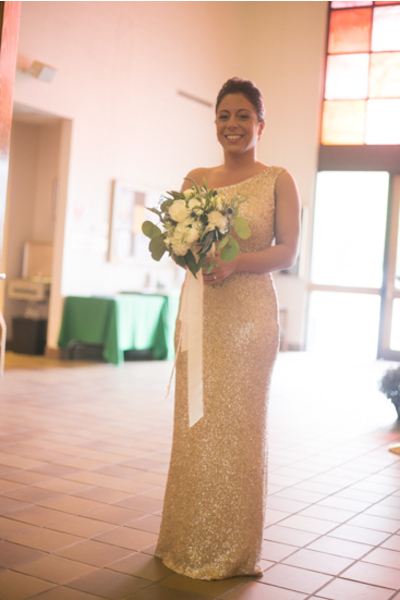 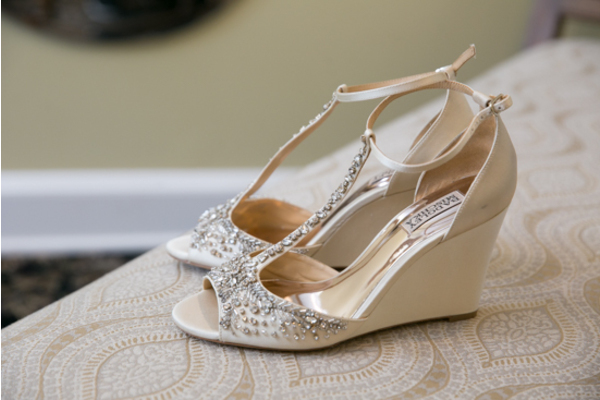 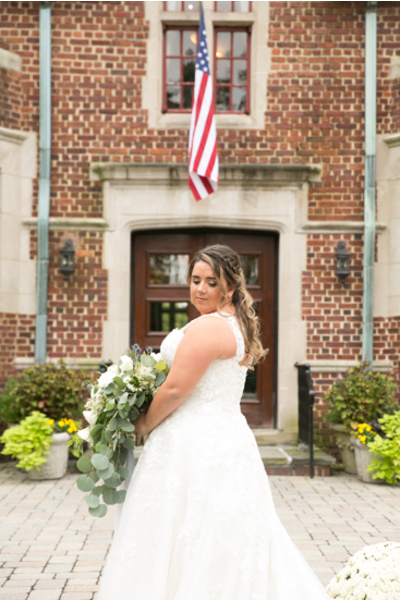 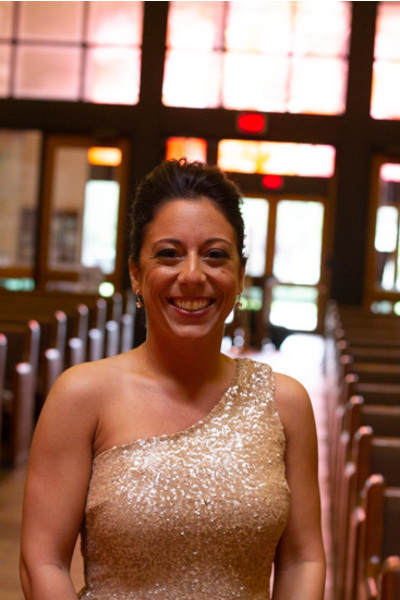 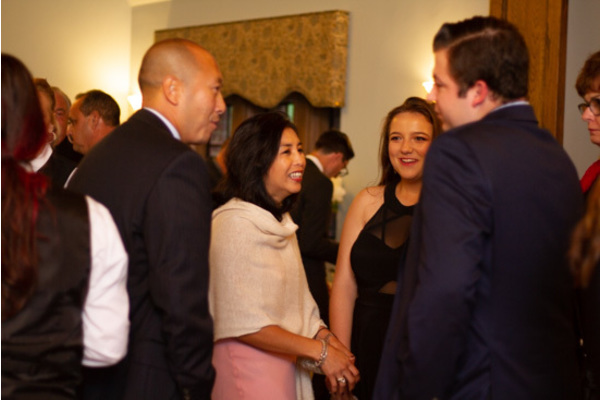 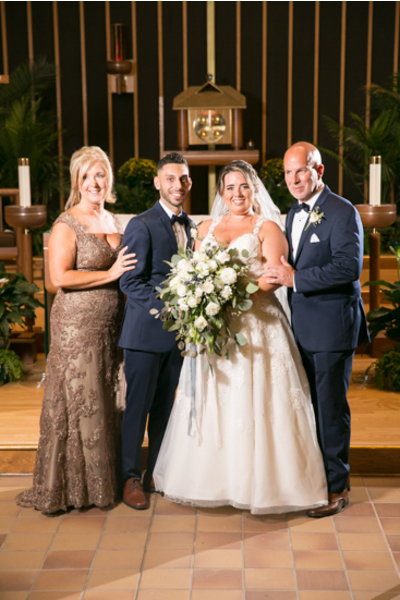 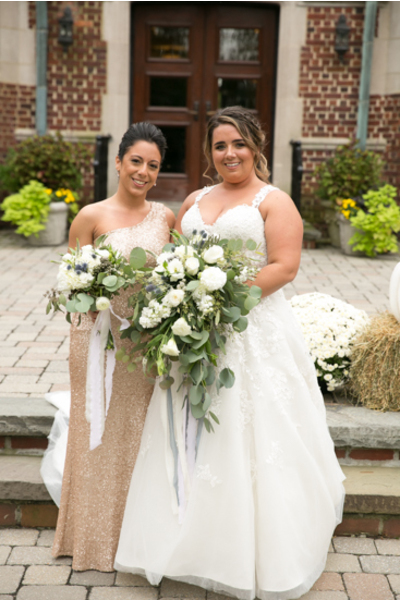 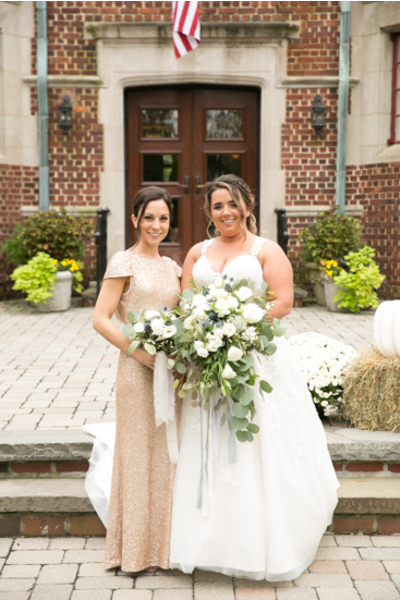 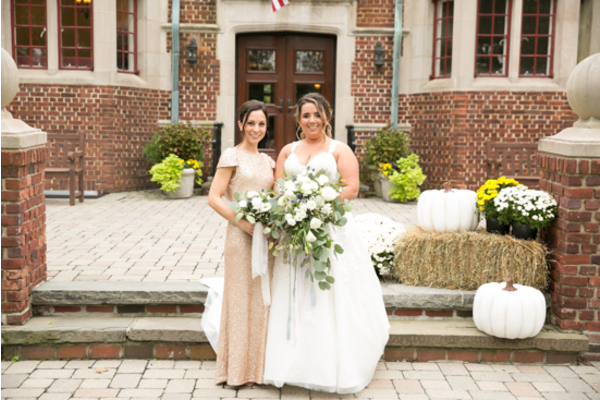 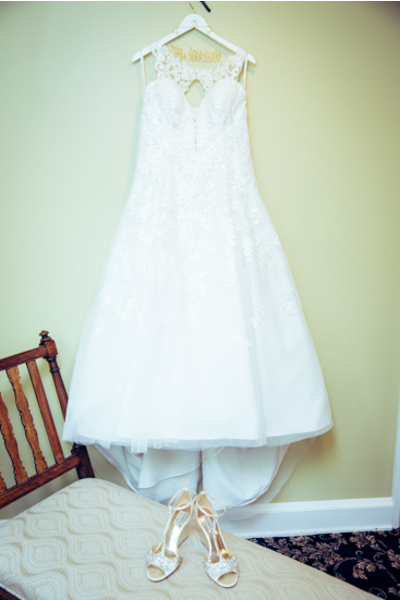 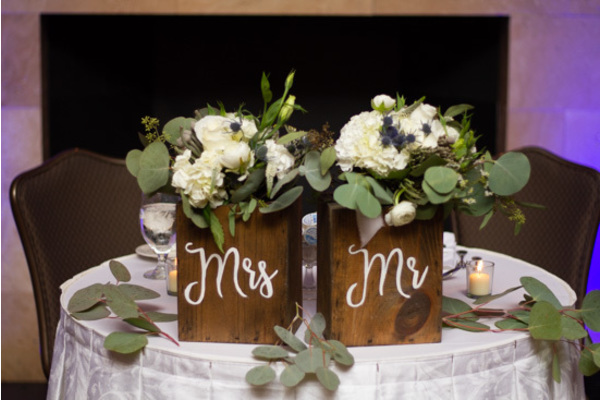 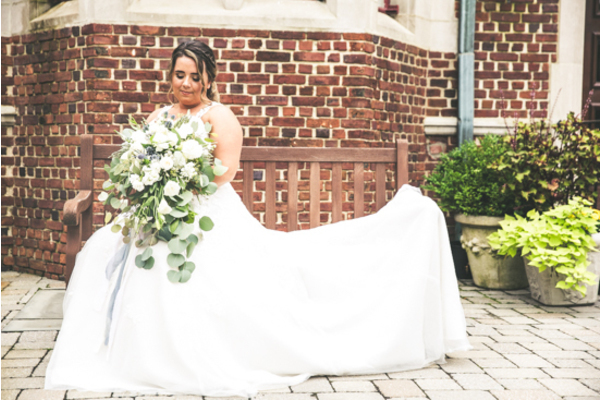 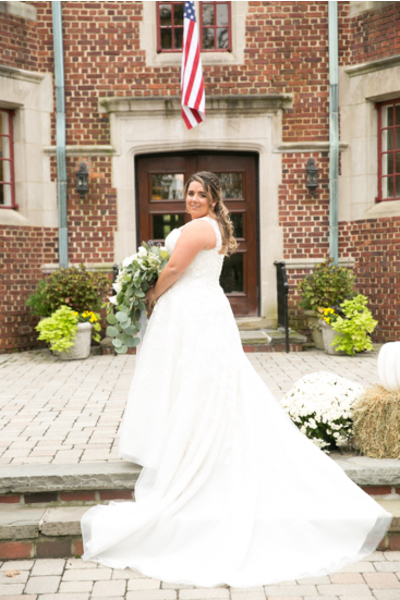 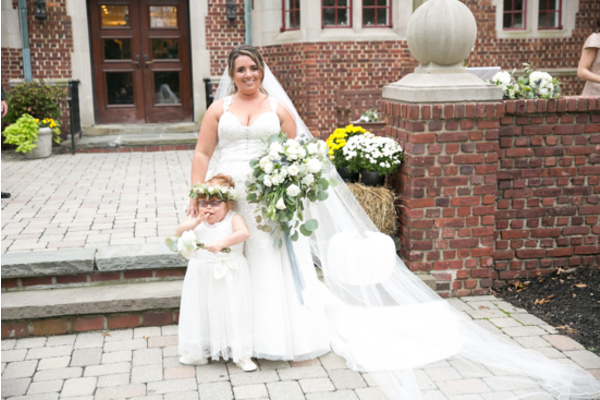 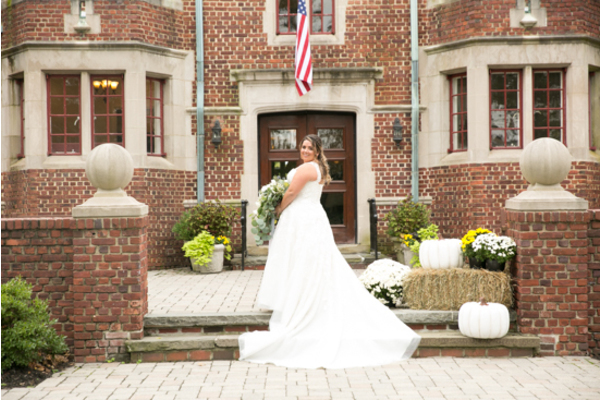 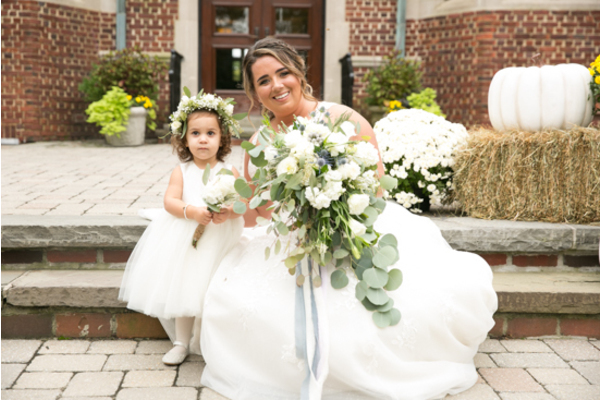 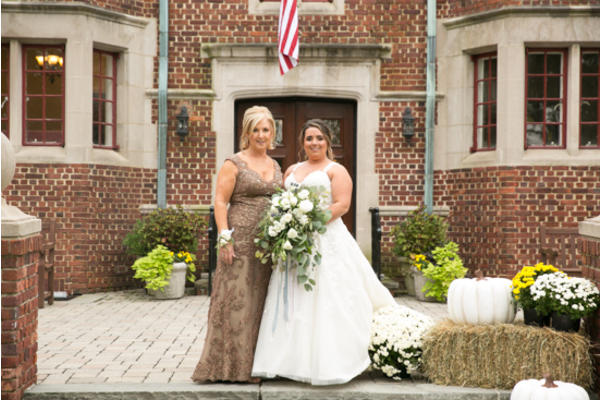 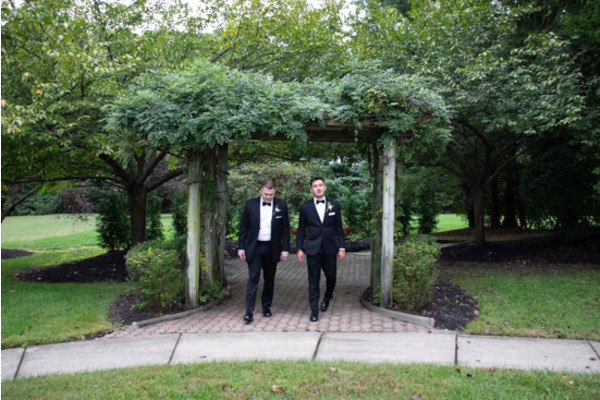 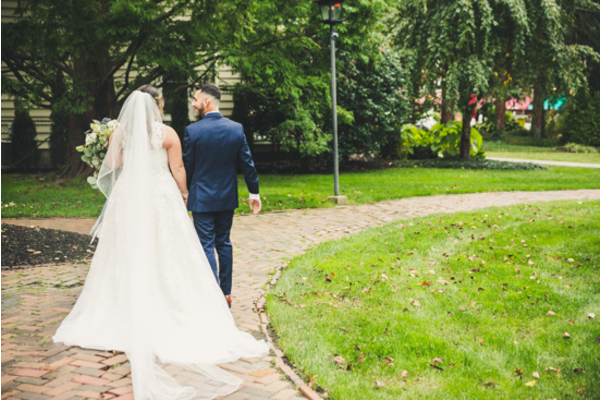 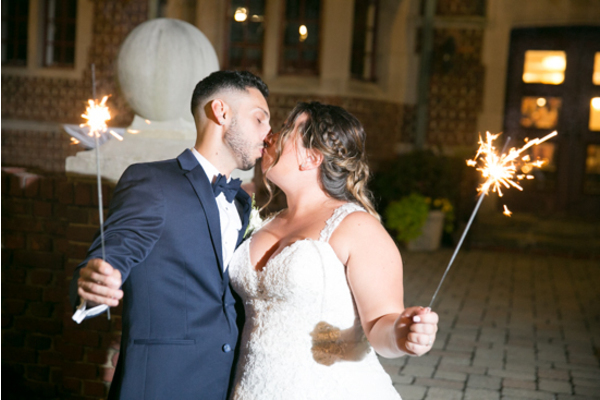 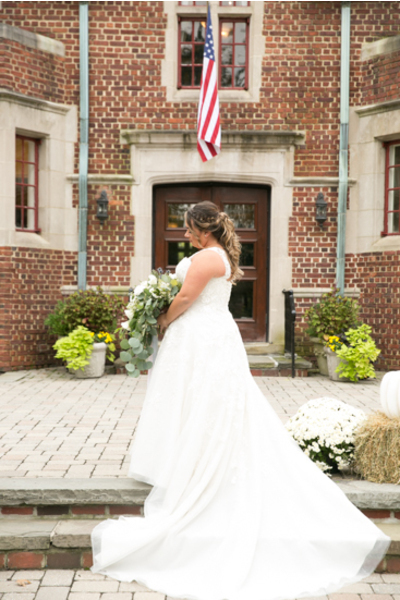 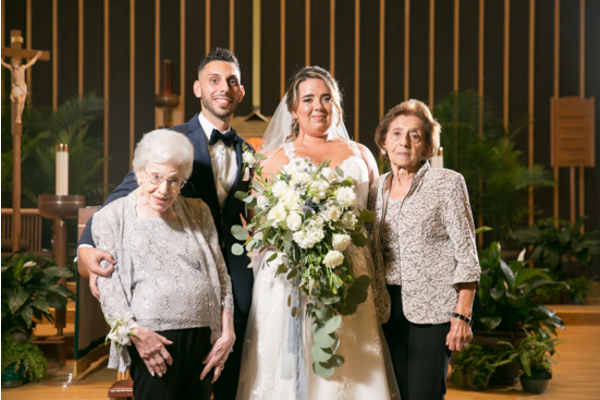 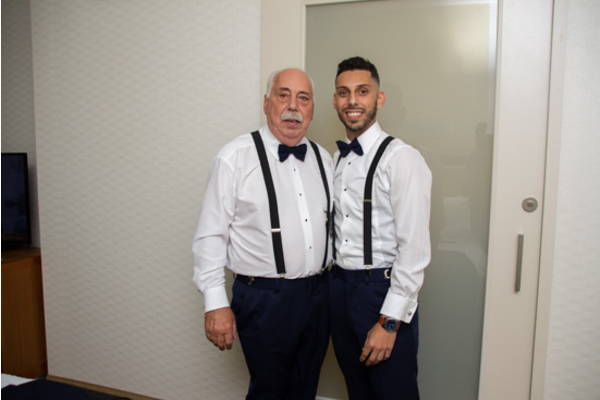 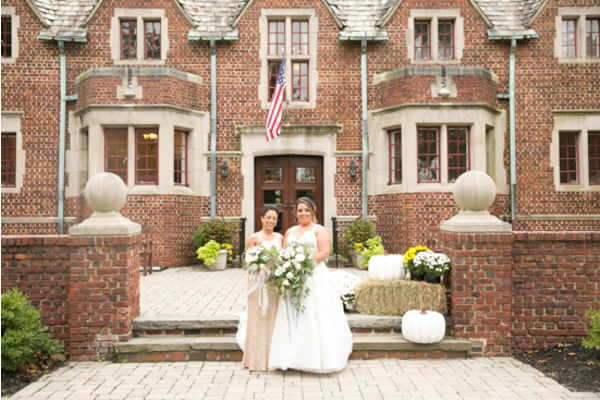 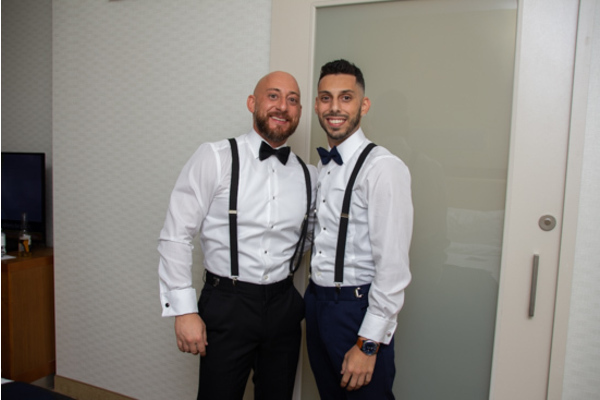 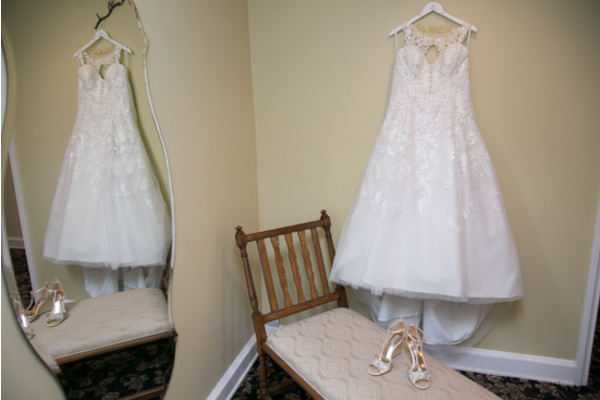 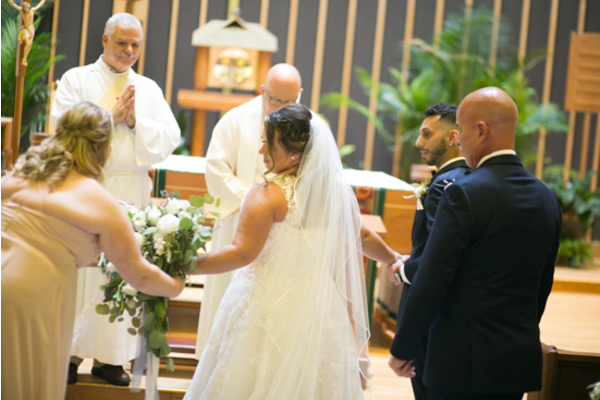 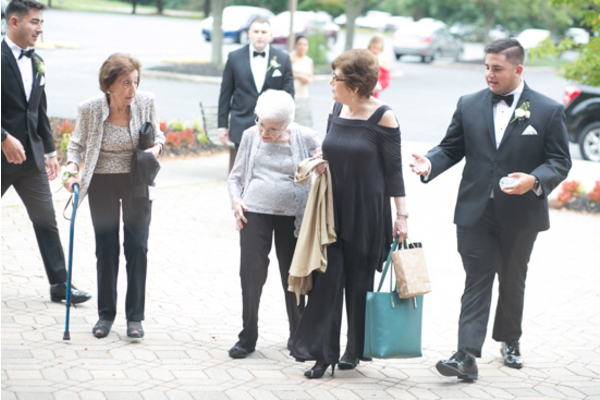 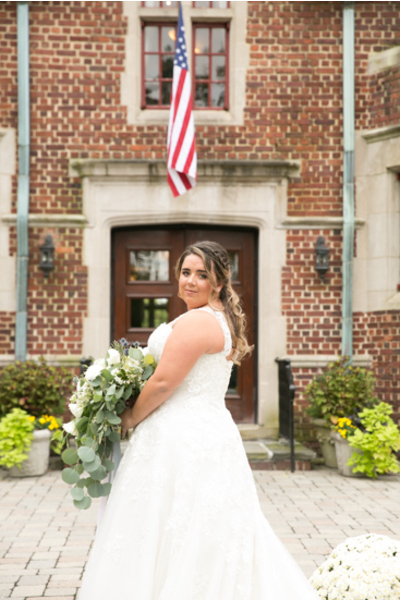 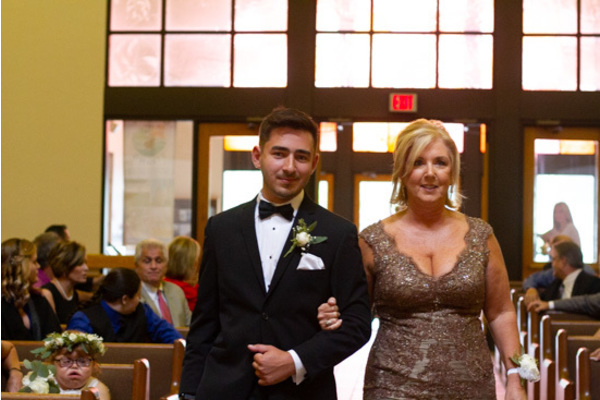 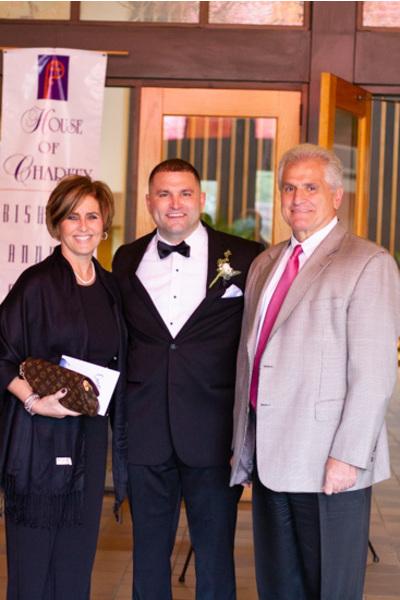 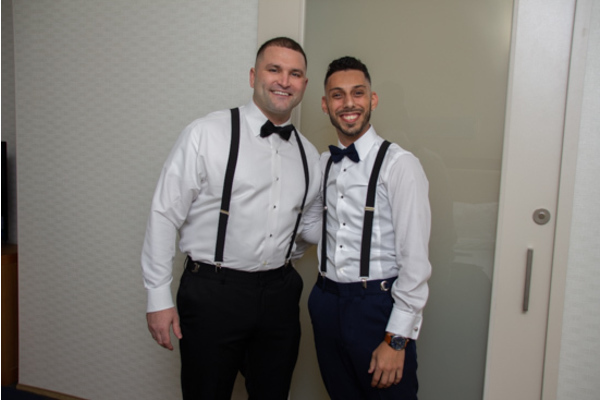 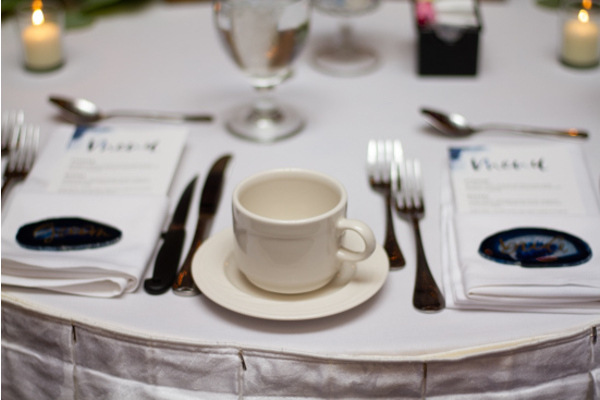 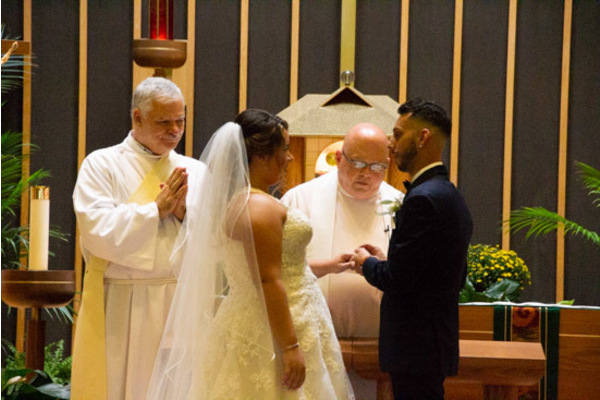 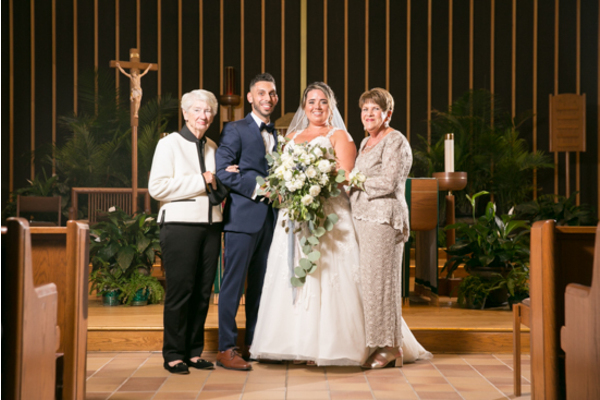 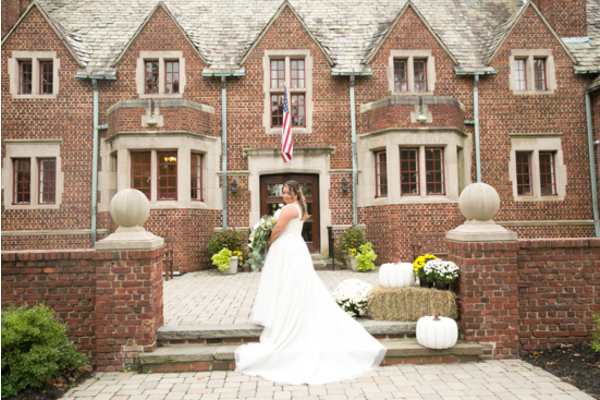 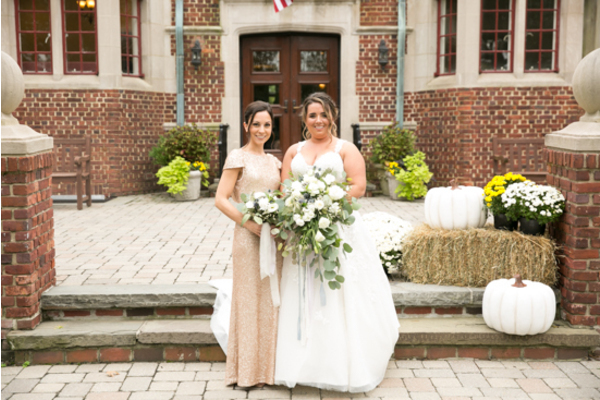 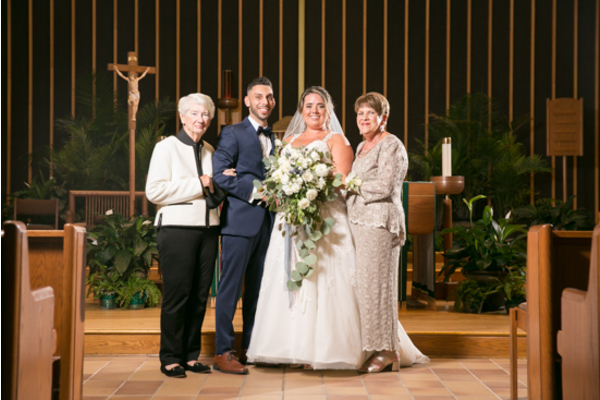 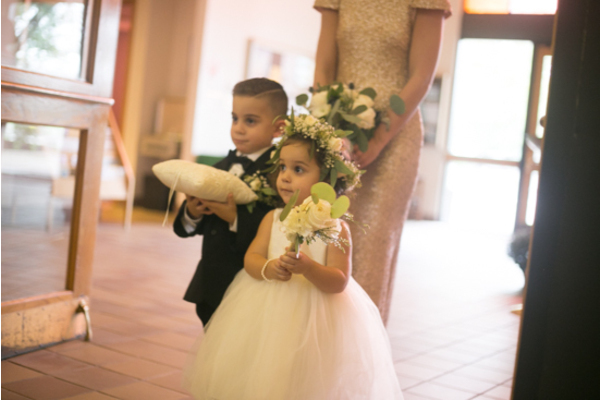 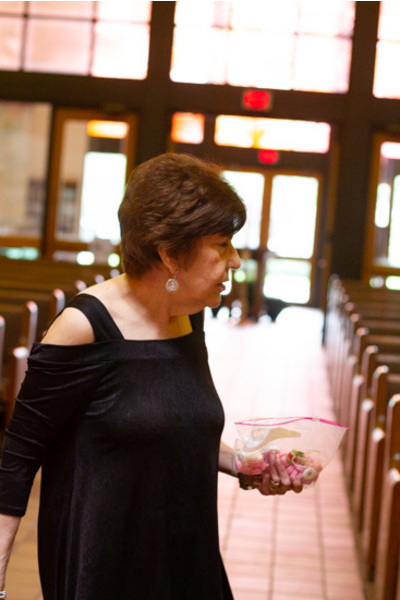 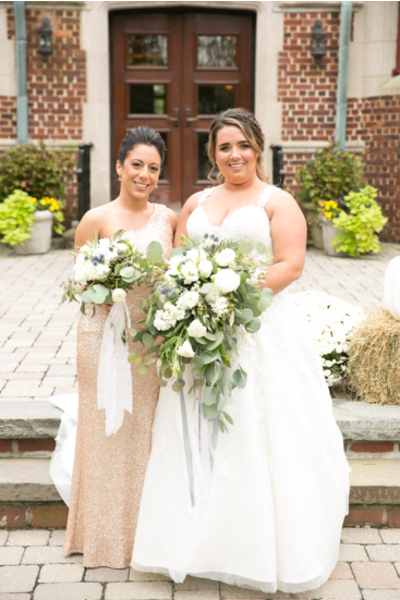 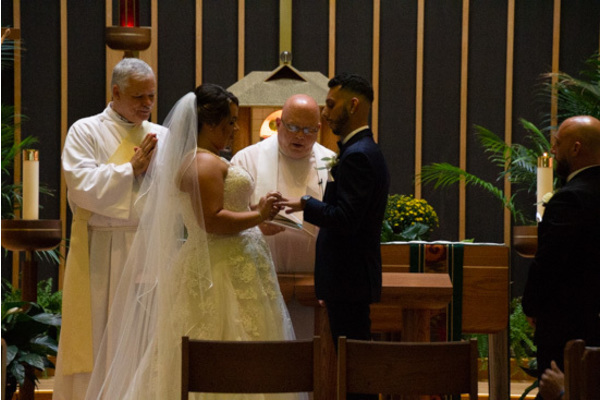 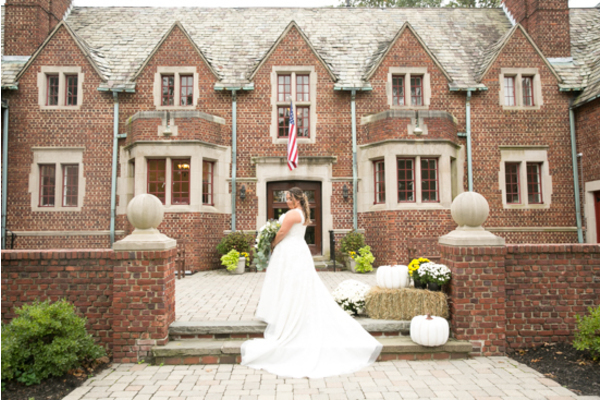 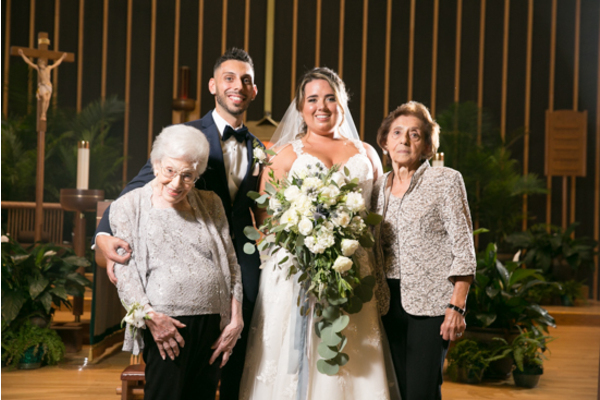 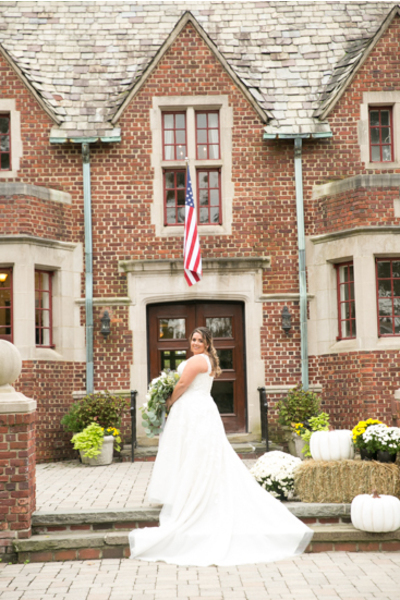 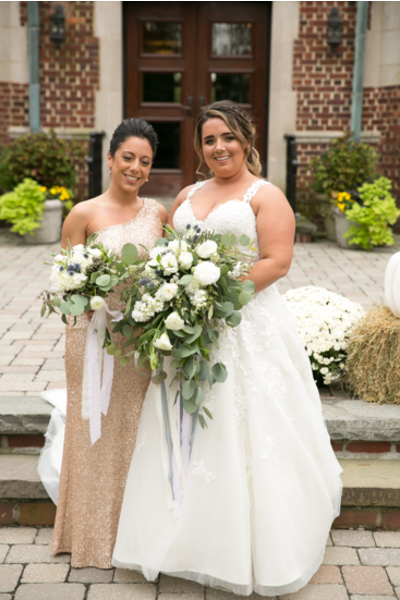 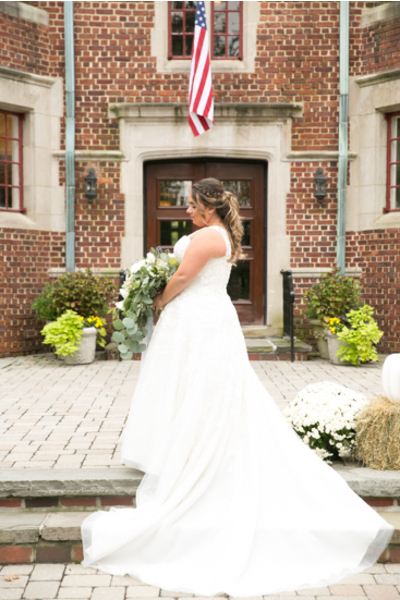 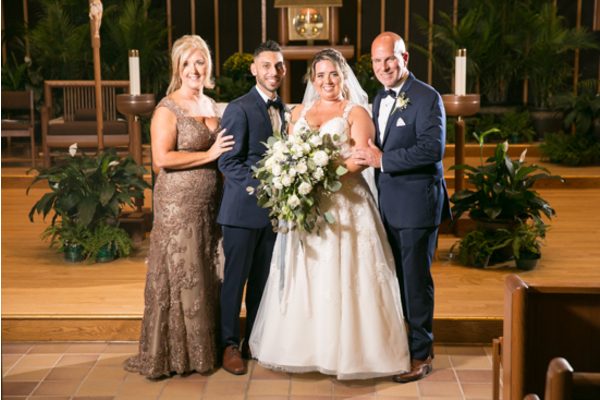 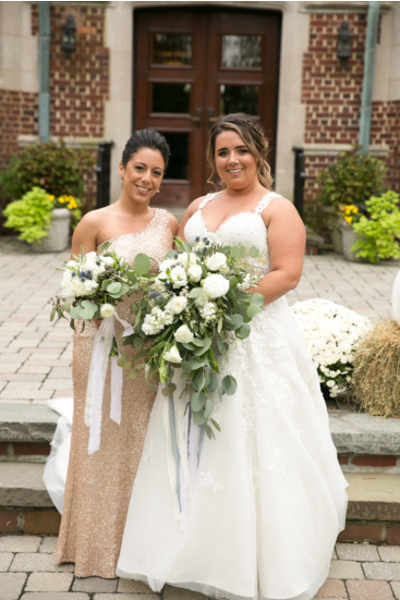 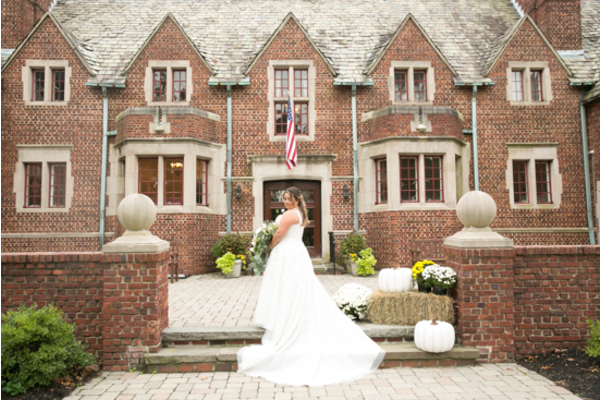 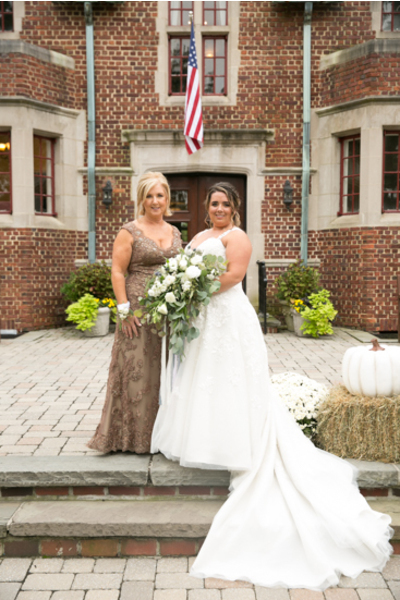 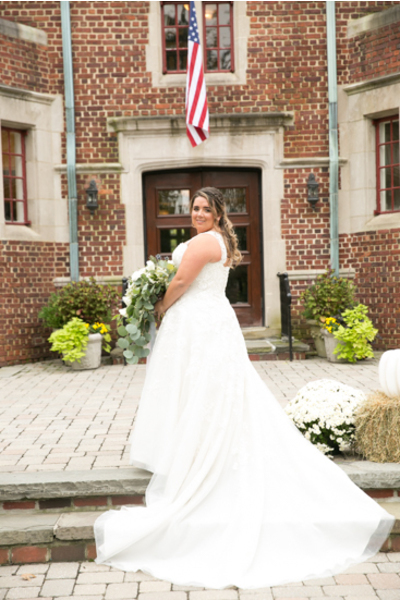 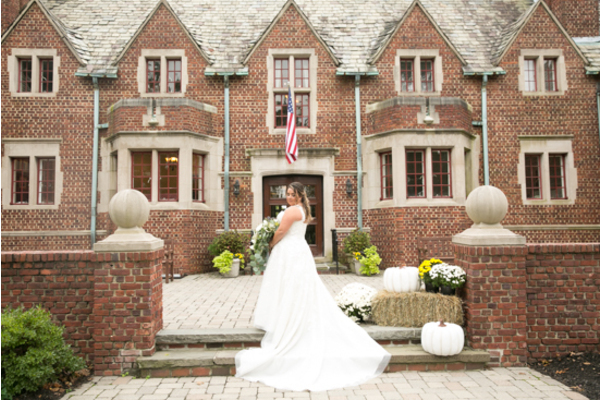 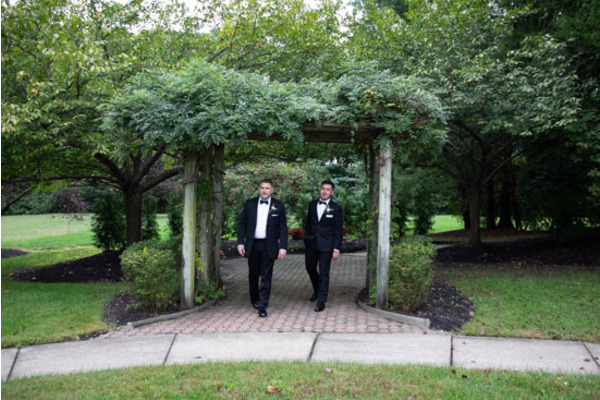 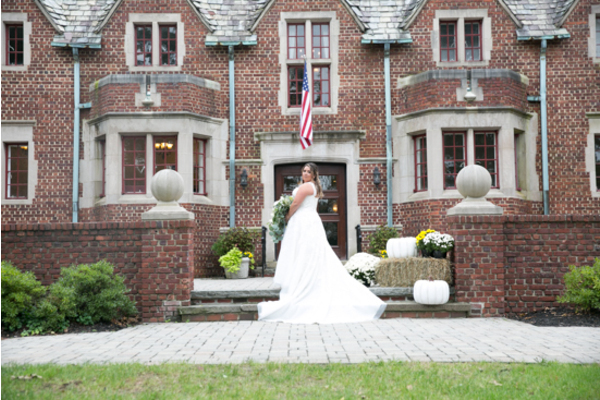 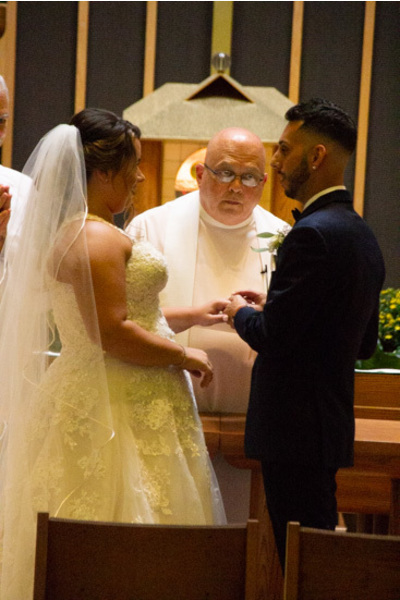 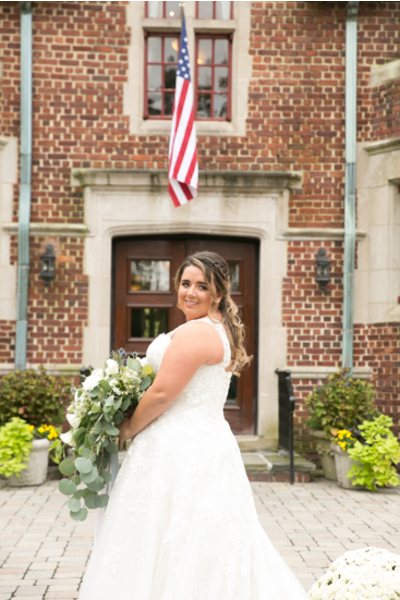 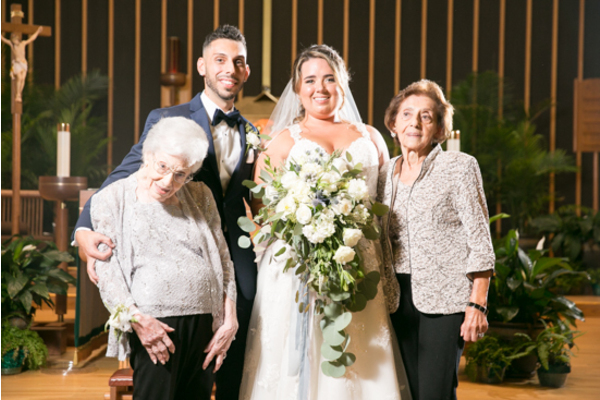 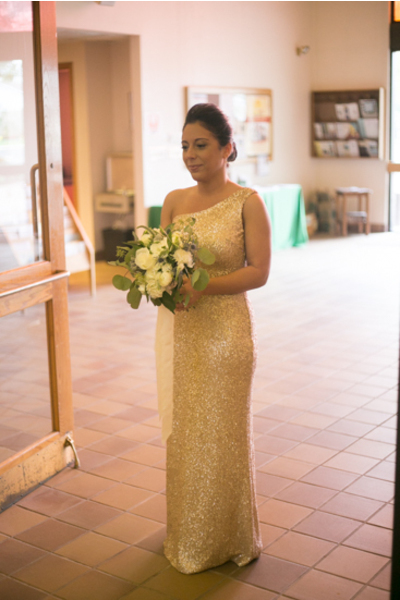 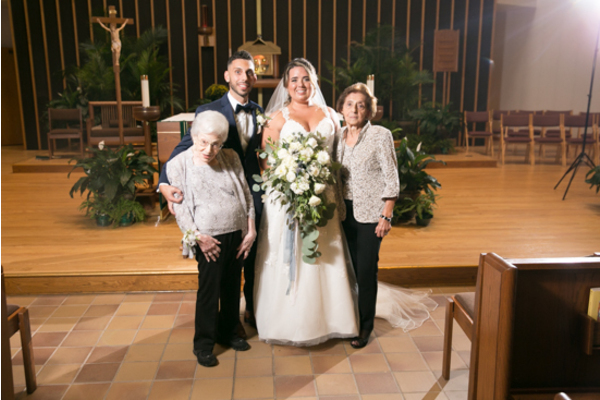 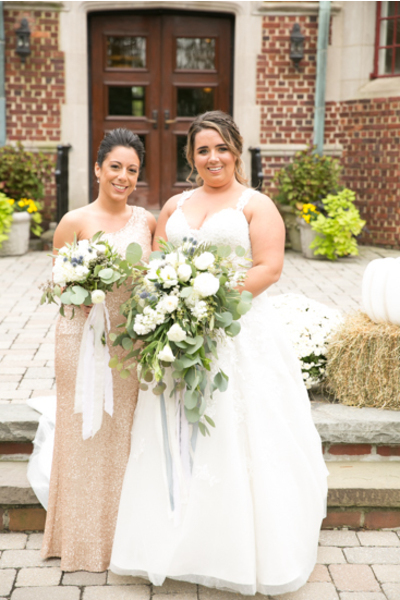 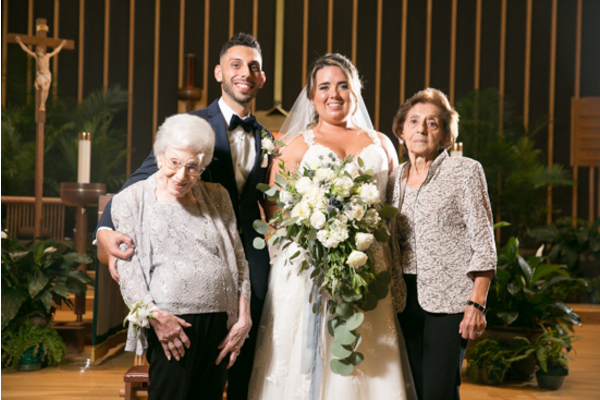 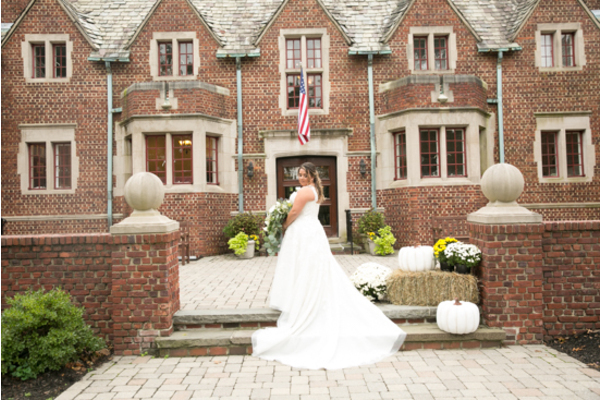 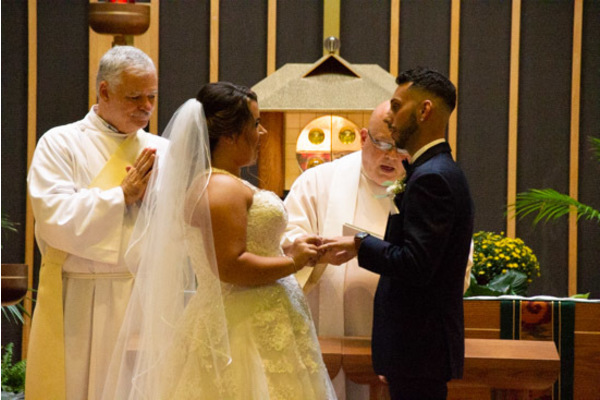 This lovely couple got married this past fall at the Moorestown Community Center. 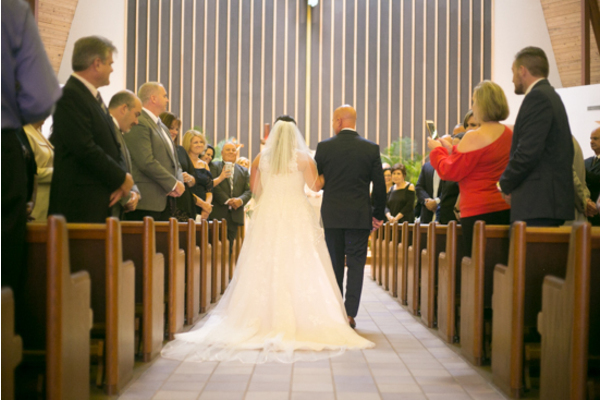 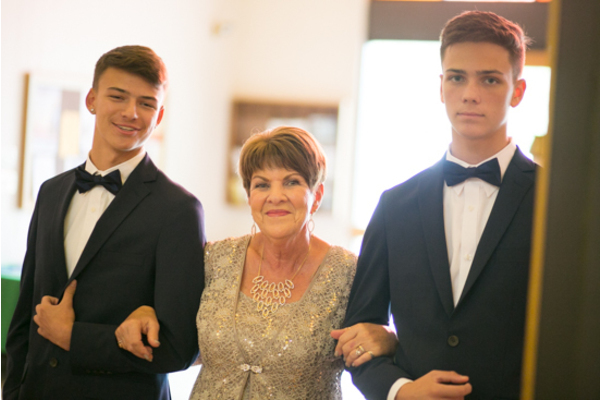 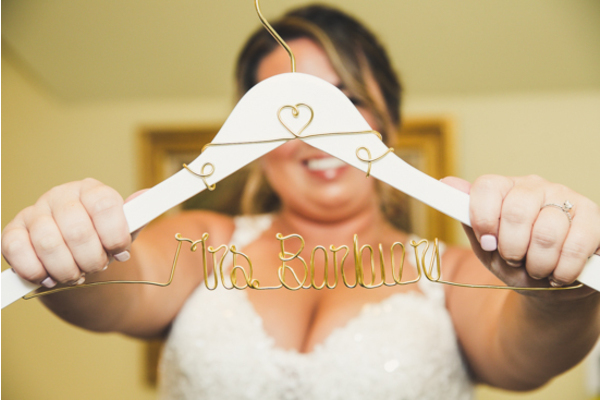 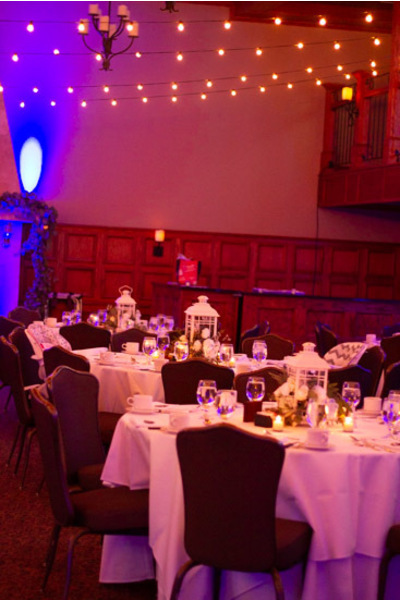 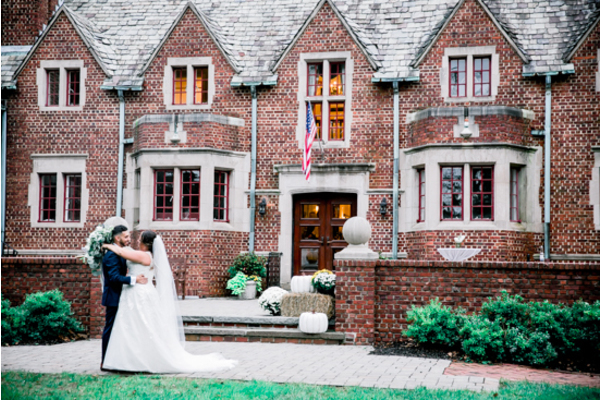 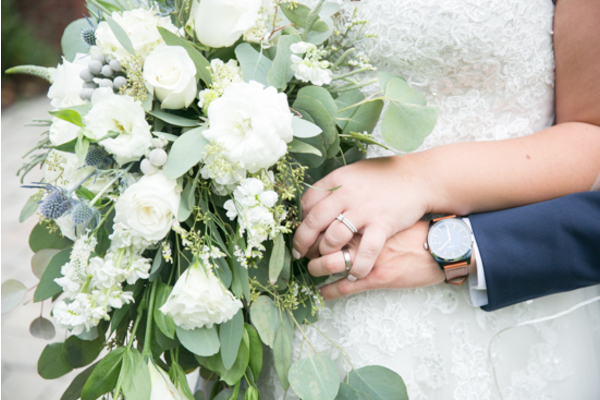 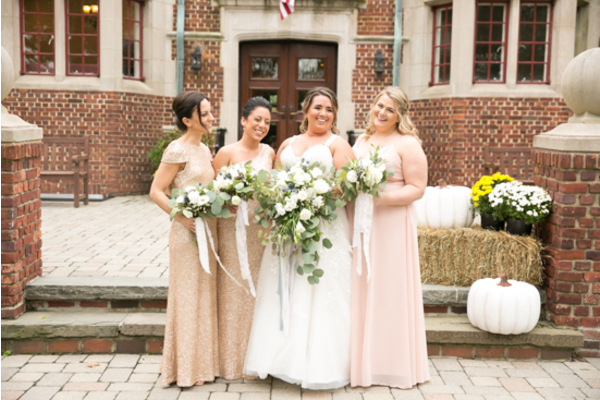 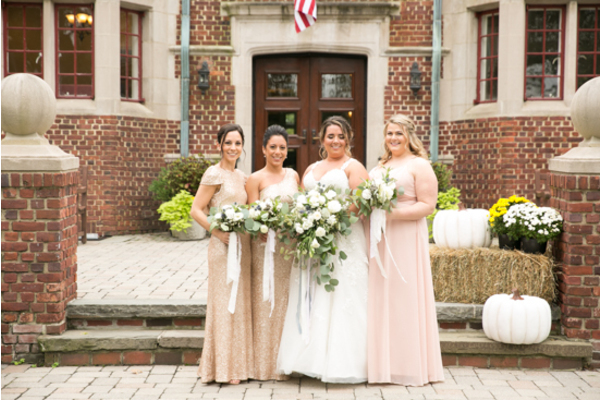 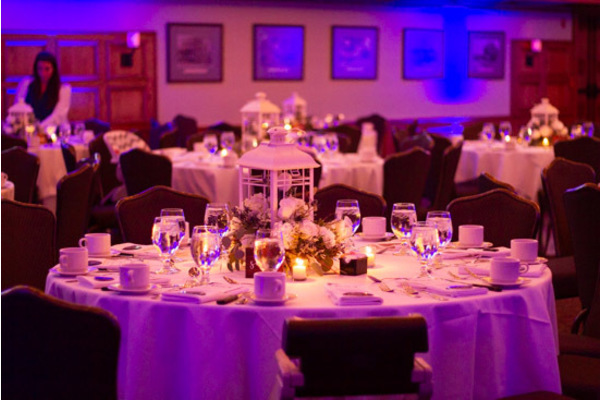 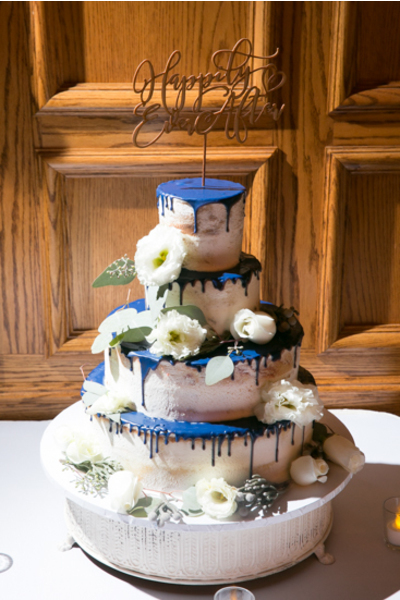 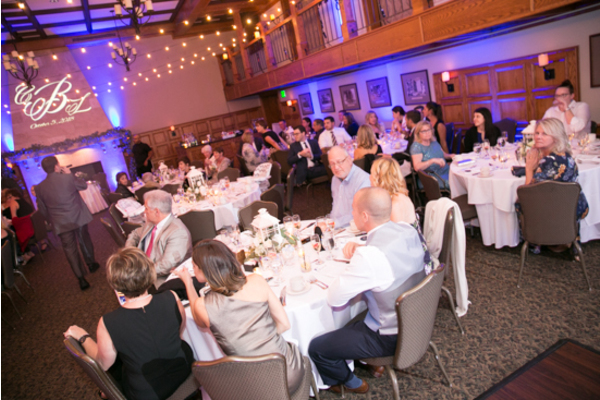 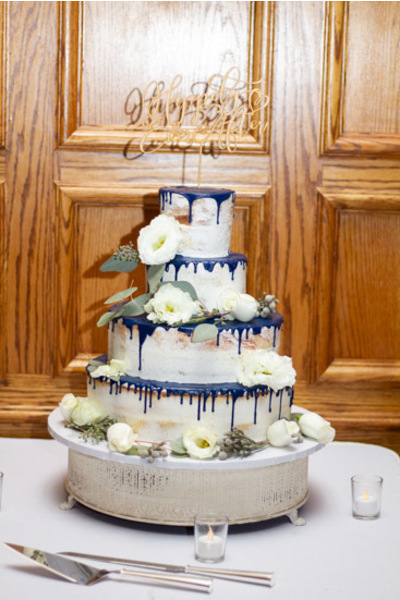 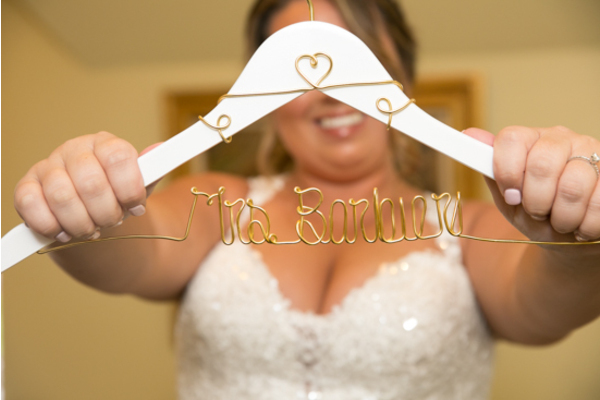 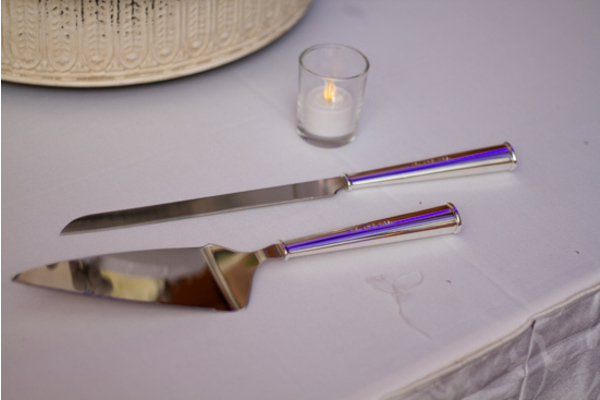 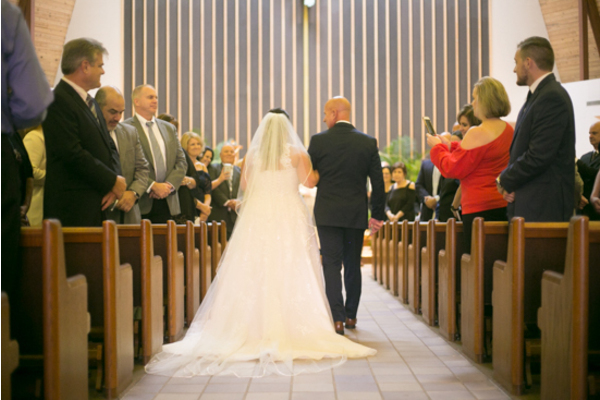 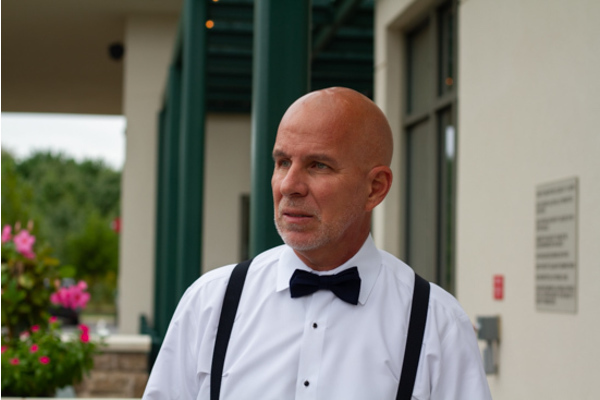 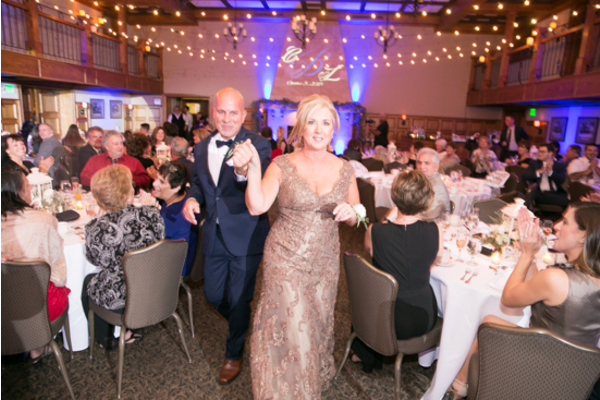 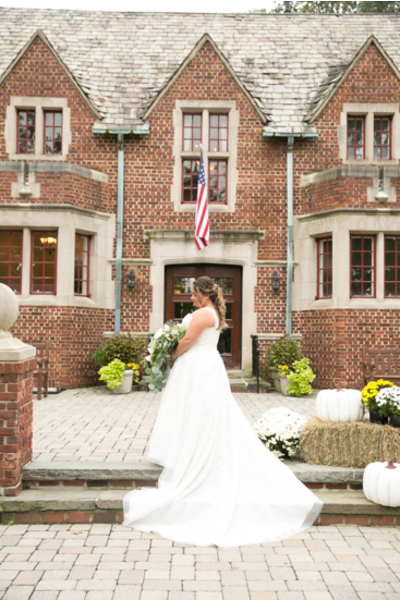 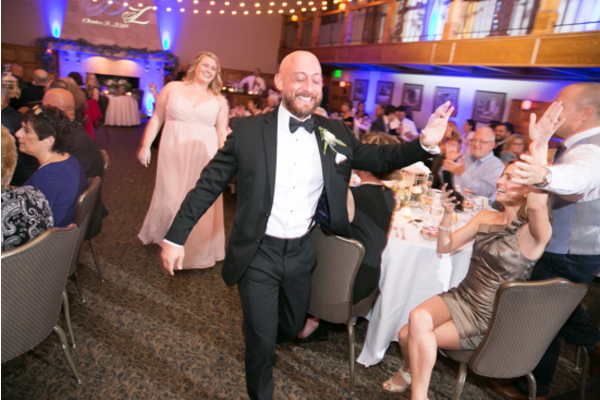 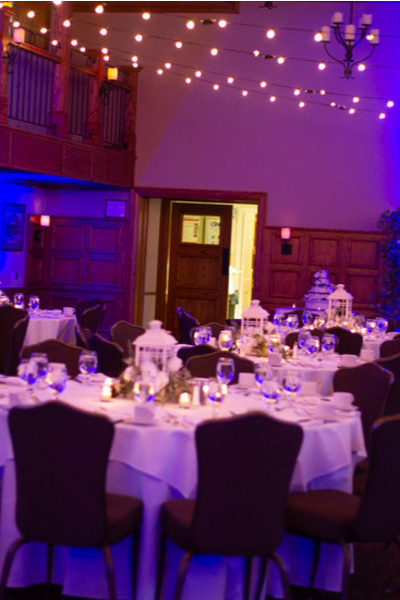 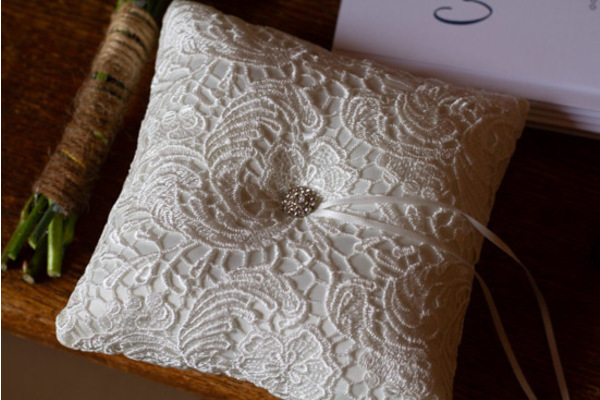 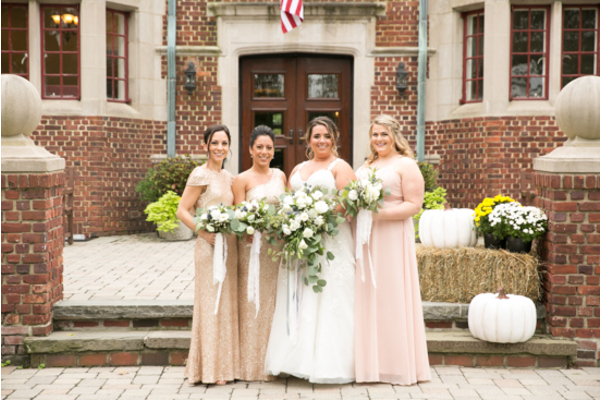 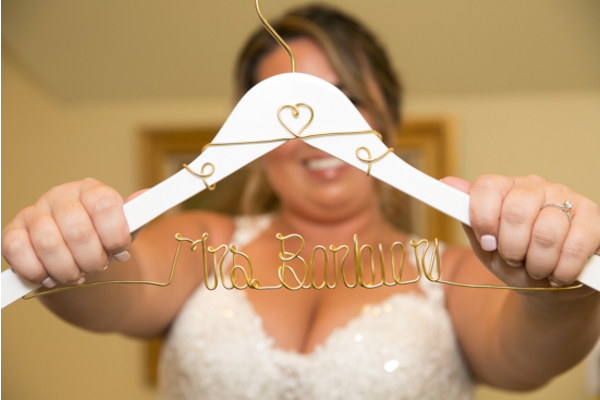 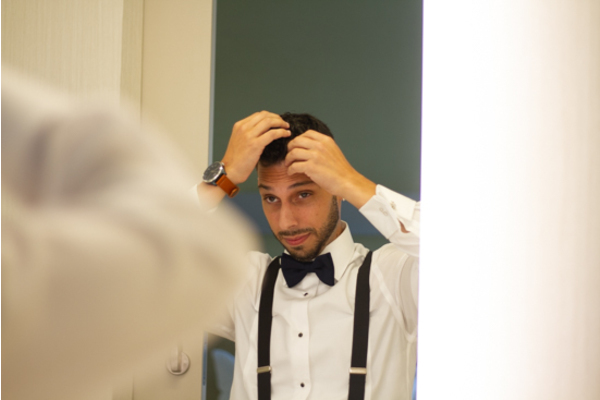 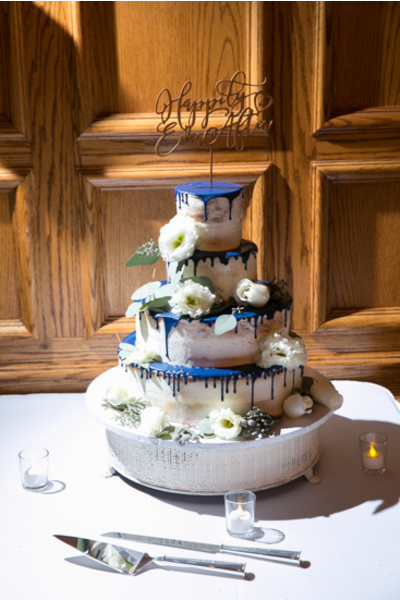 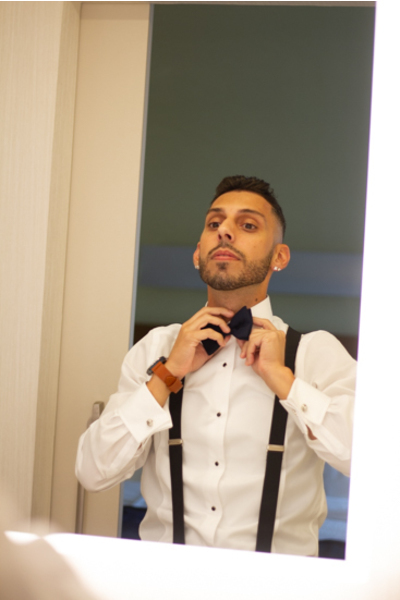 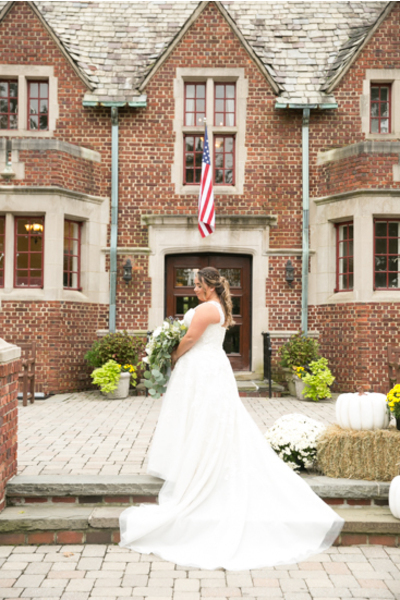 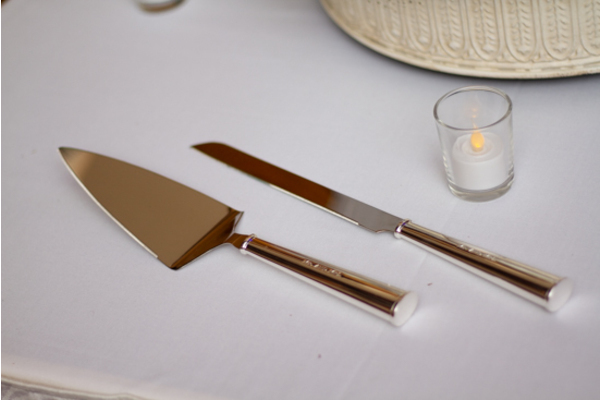 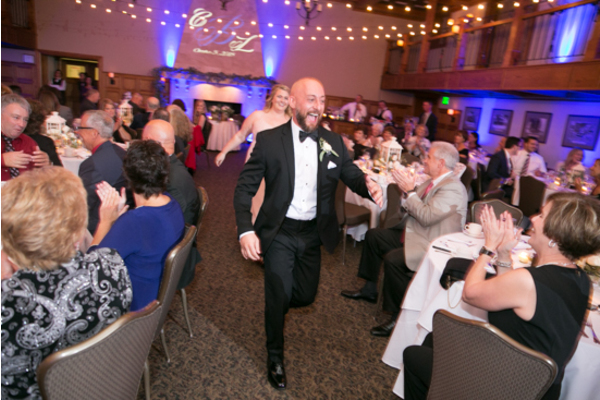 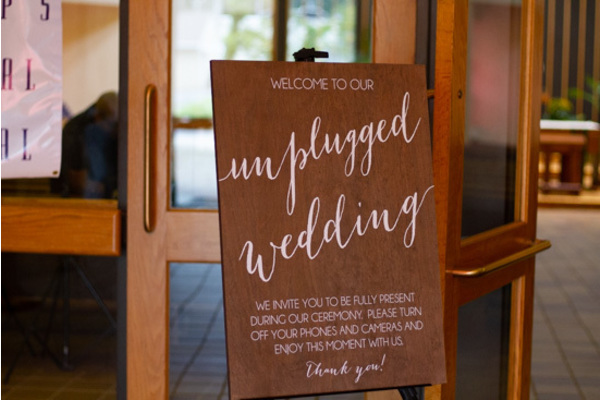 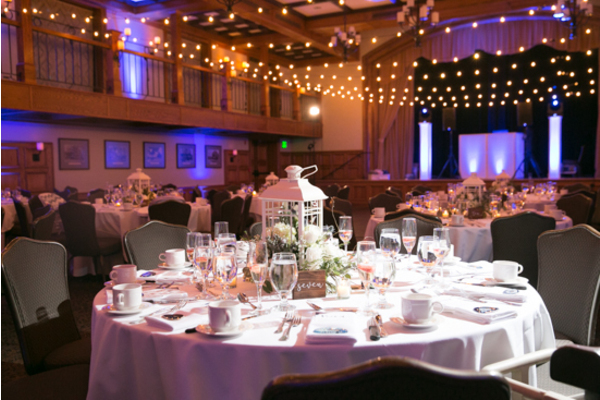 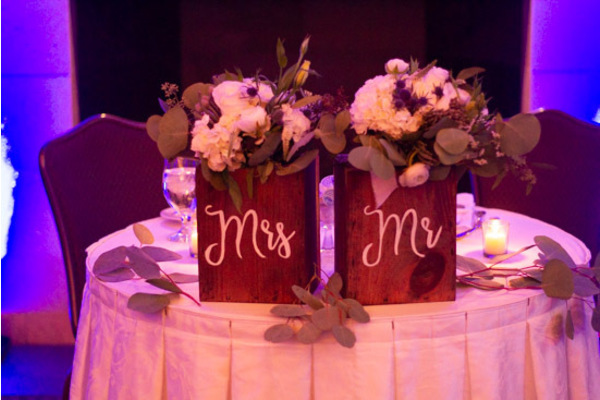 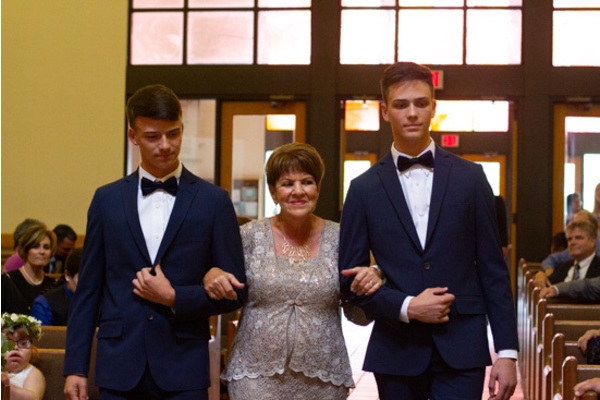 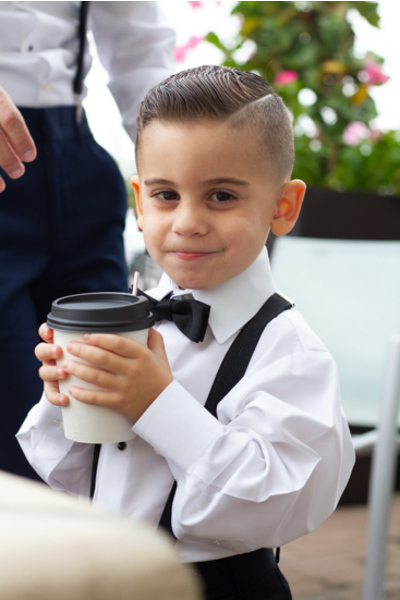 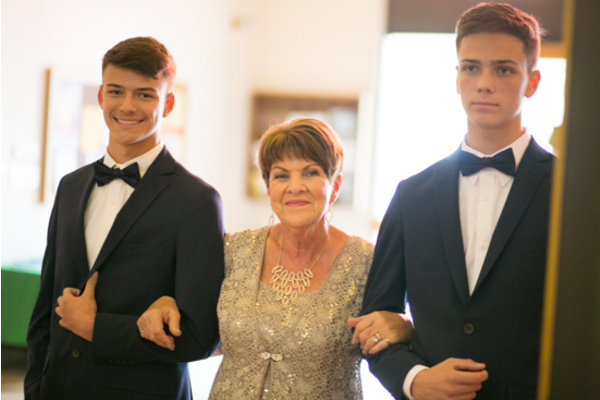 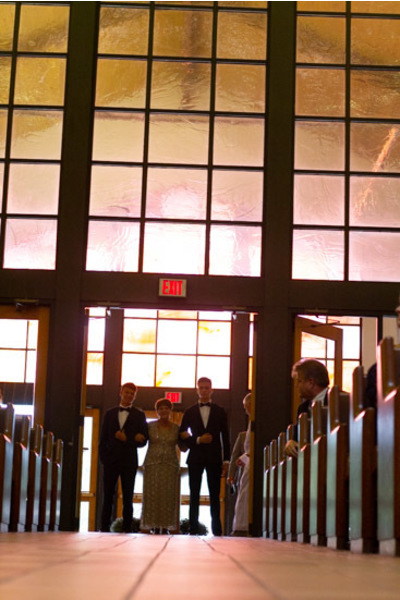 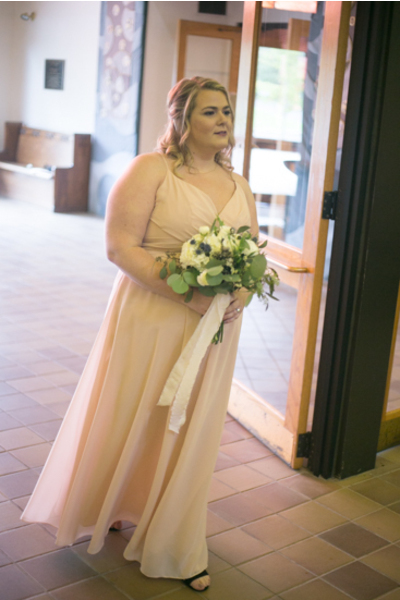 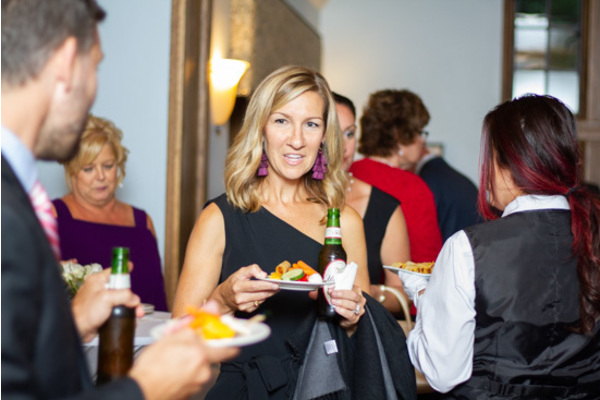 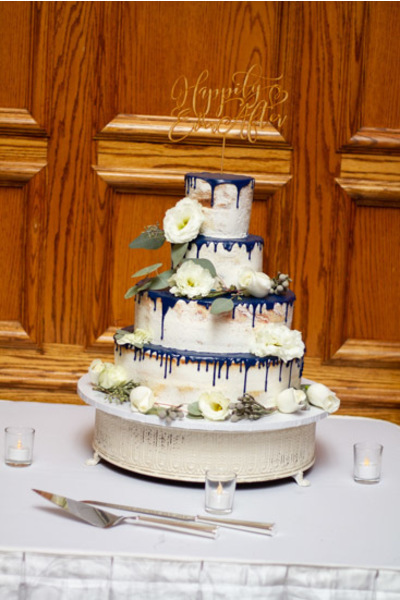 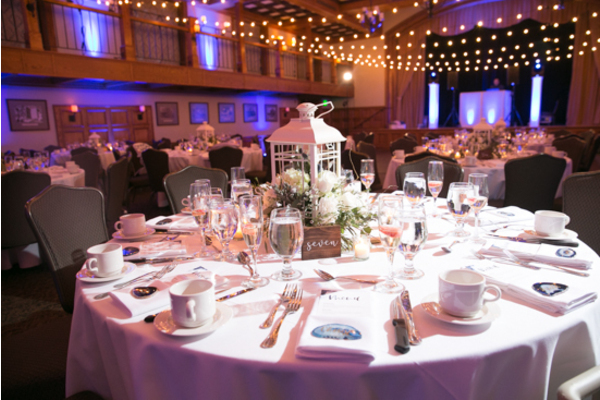 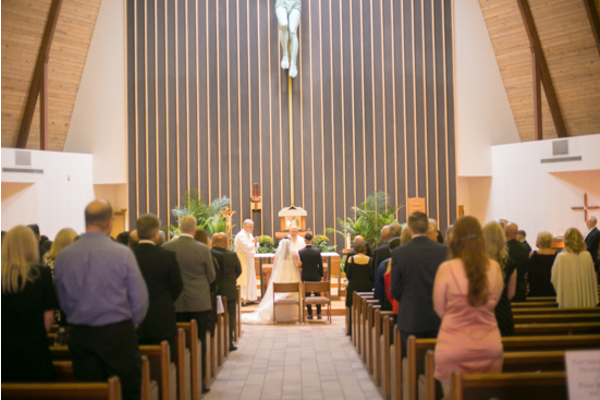 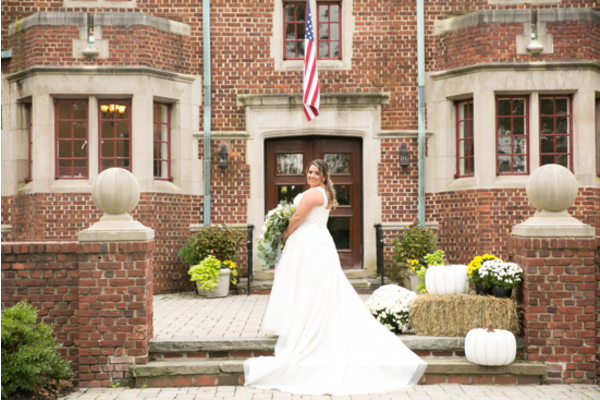 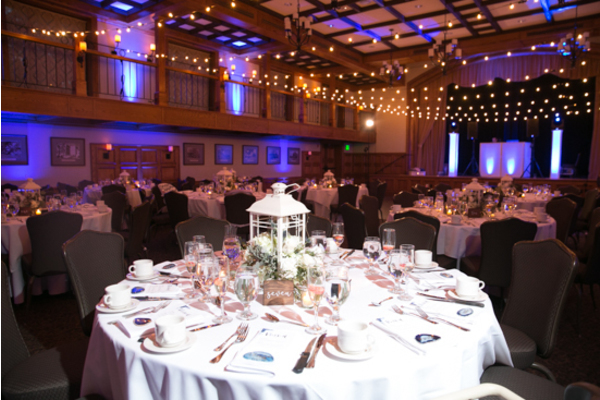 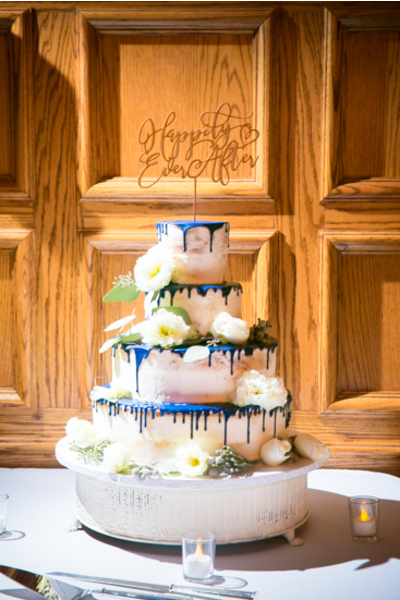 It was everything you would imagine in a beautiful October wedding! 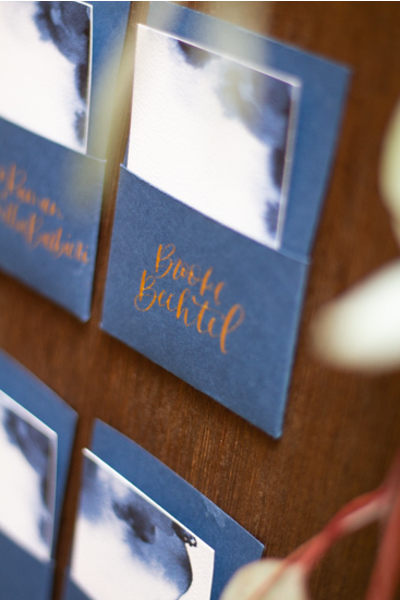 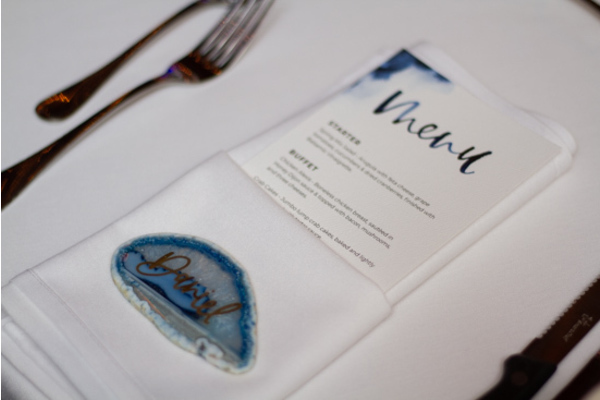 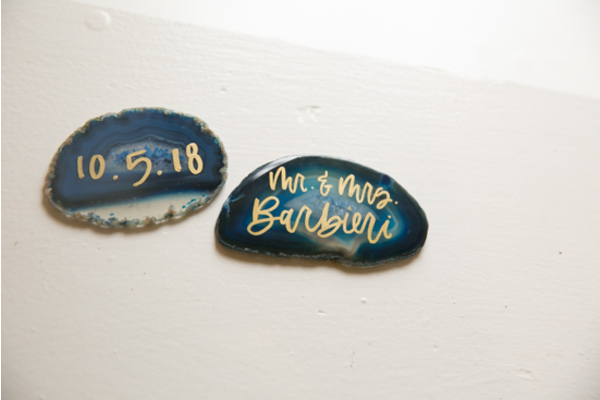 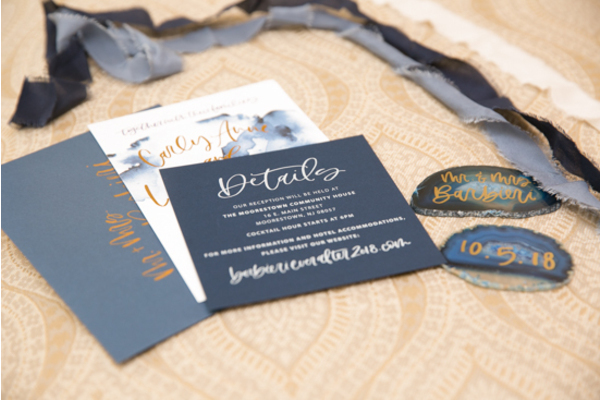 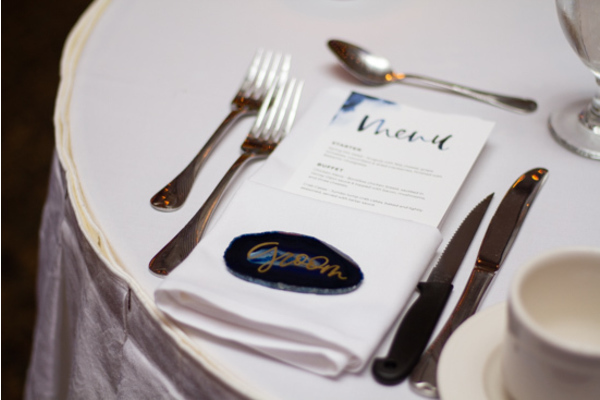 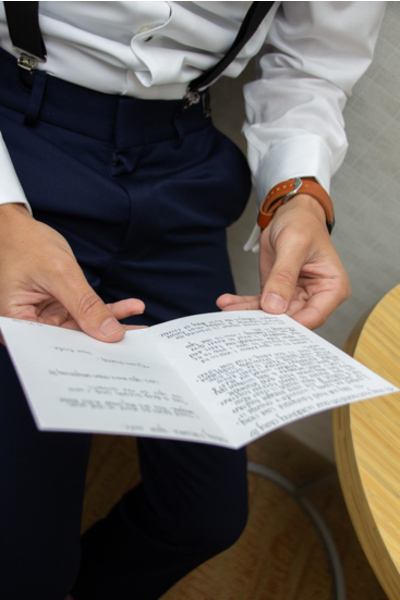 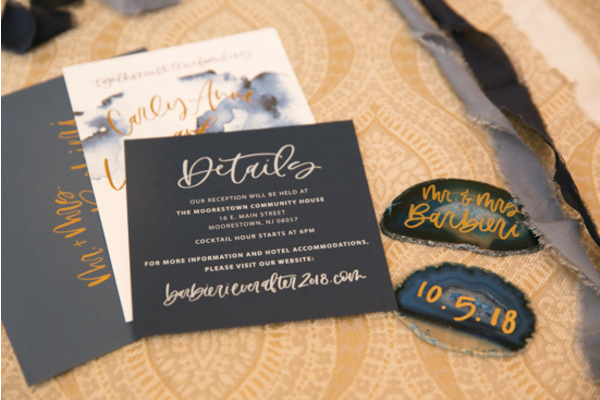 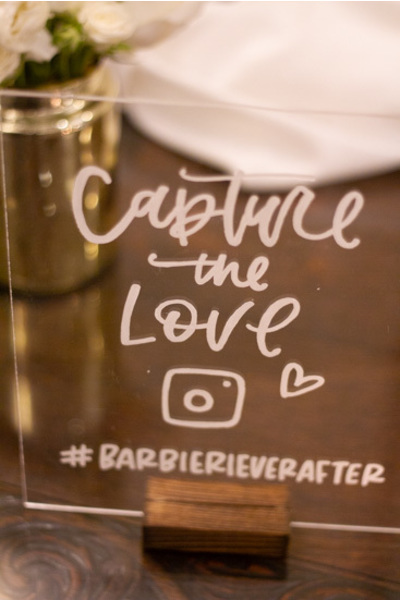 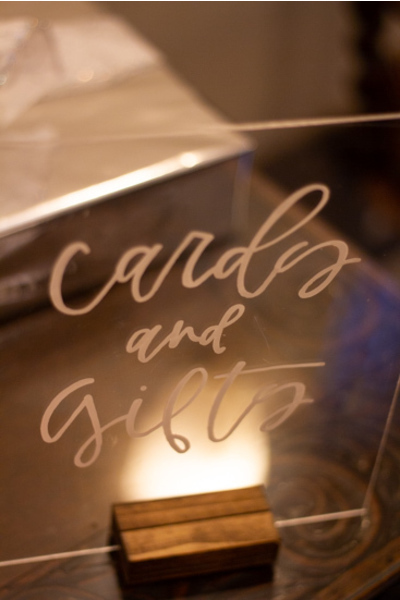 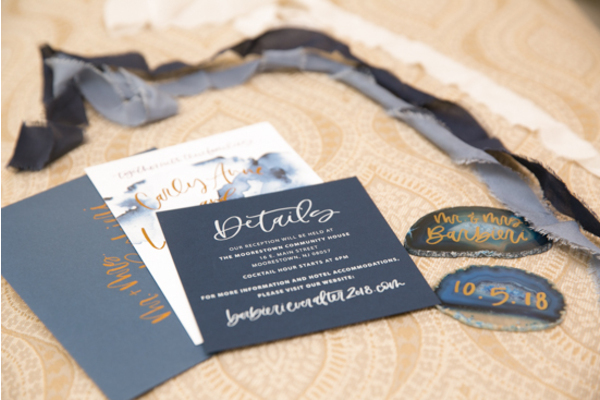 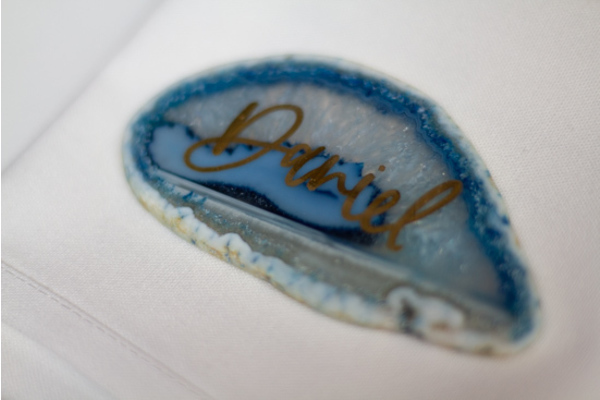 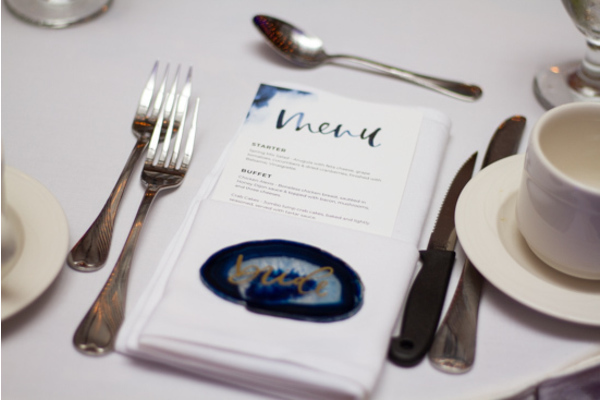 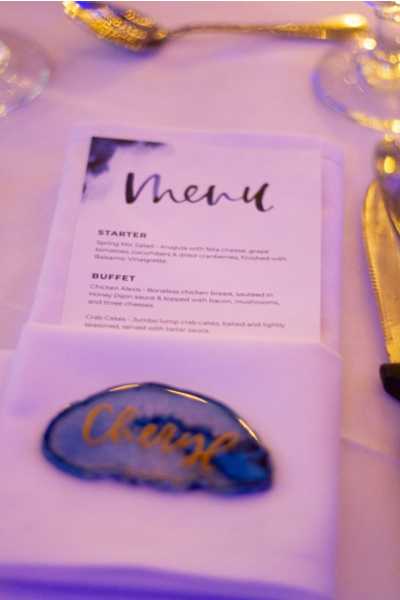 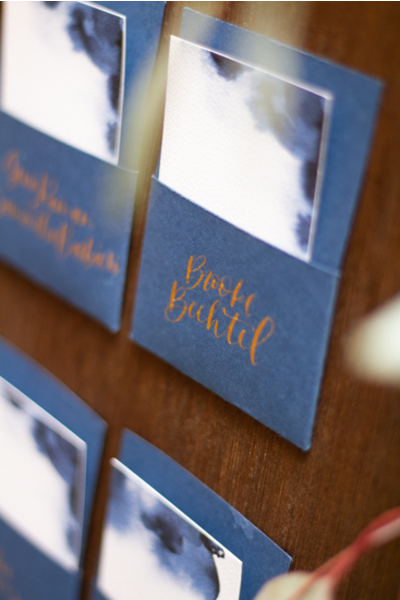 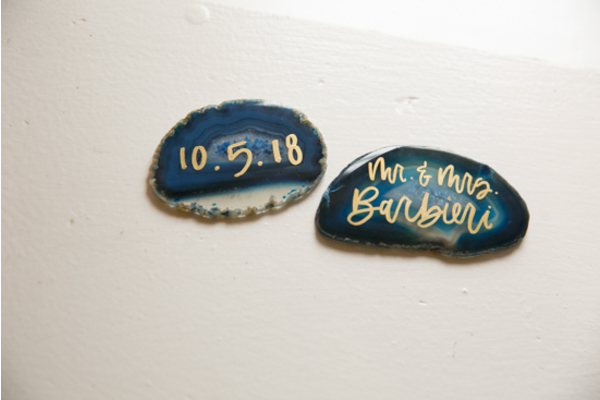 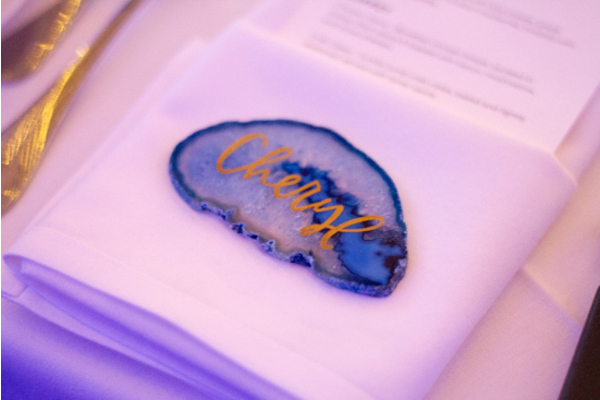 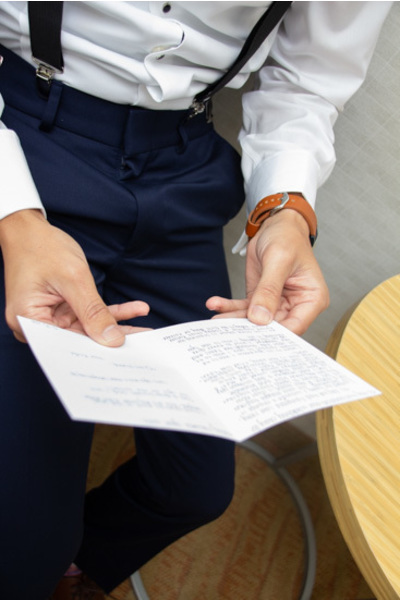 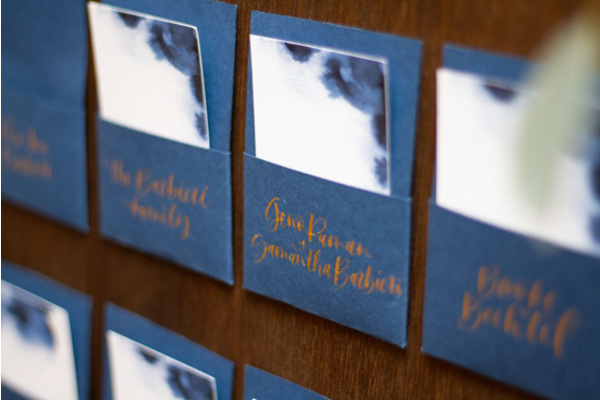 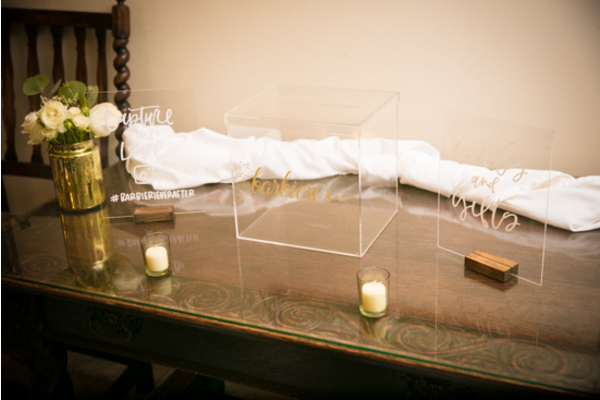 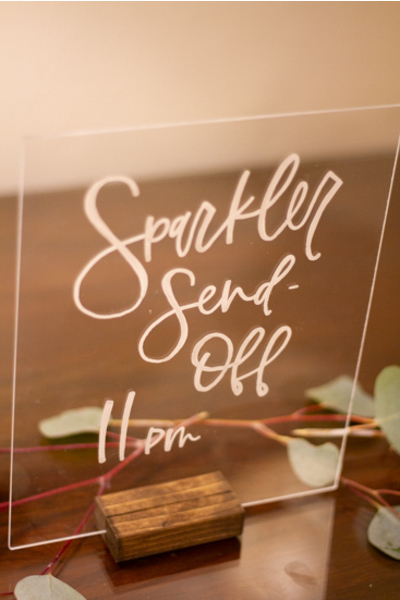 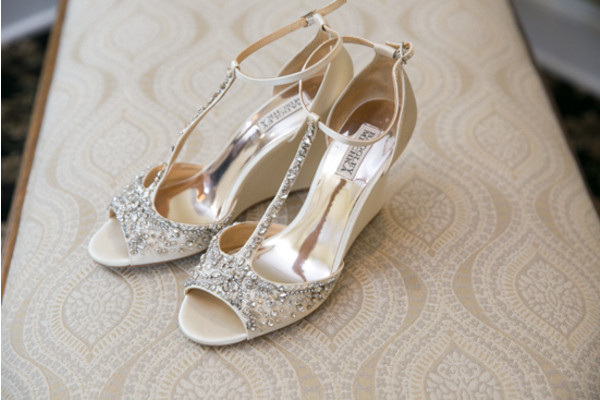 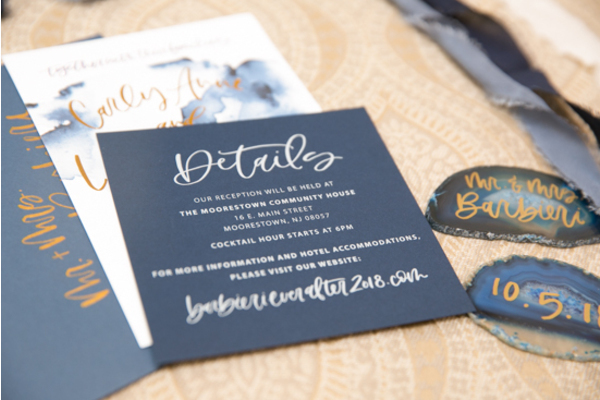 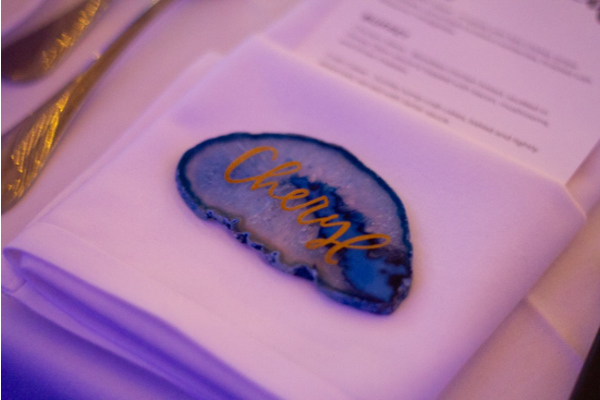 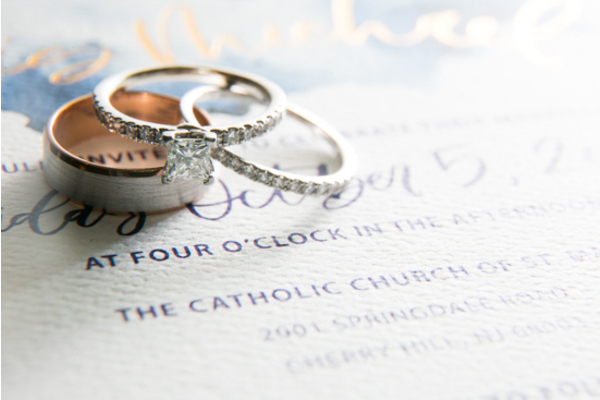 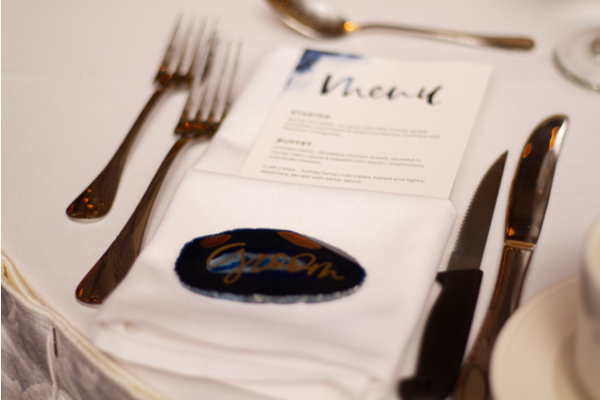 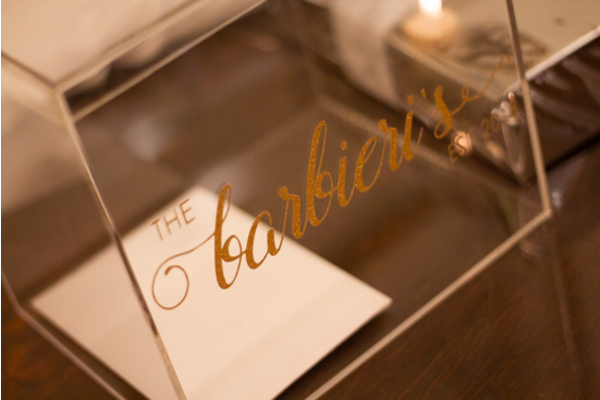 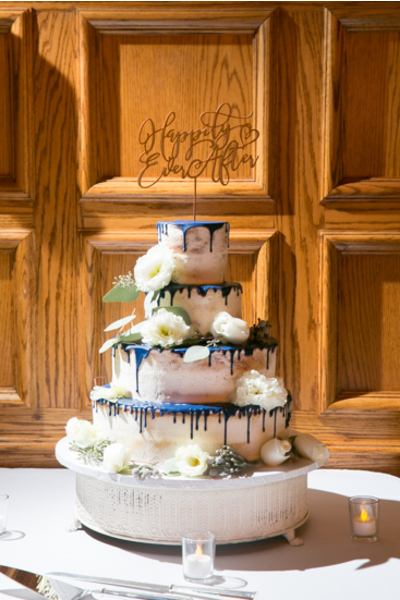 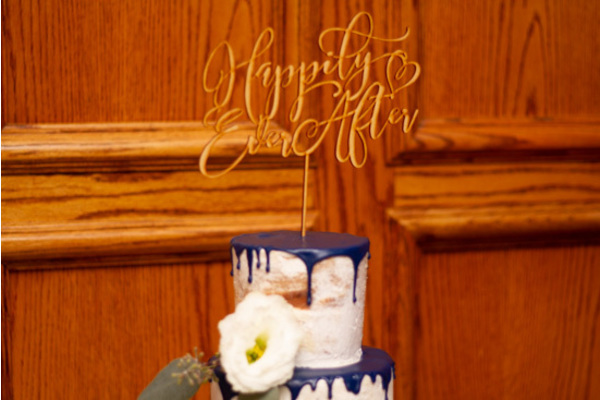 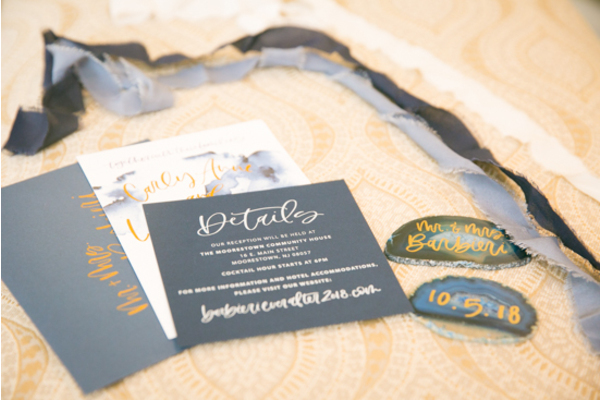 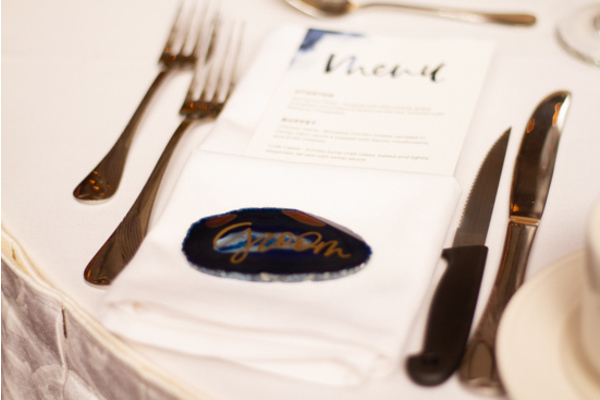 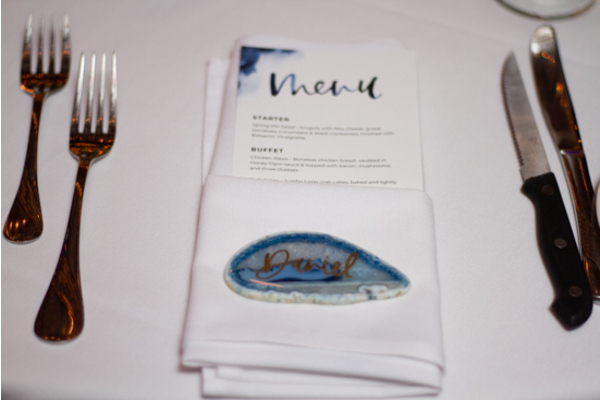 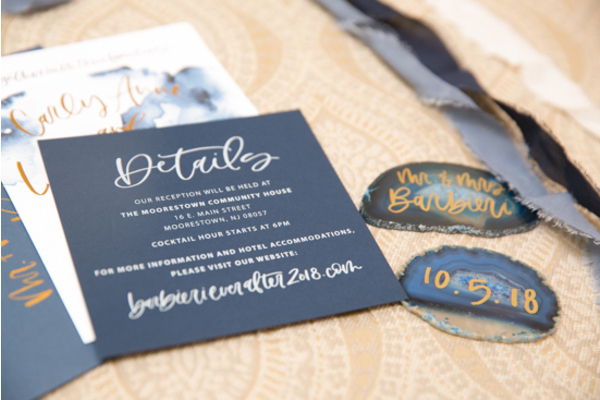 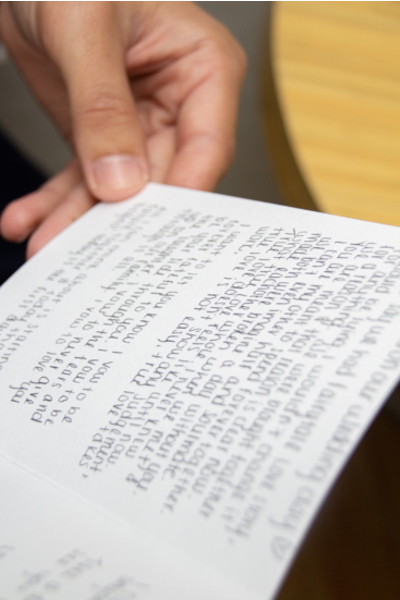 Once upon a time, their wedding date was written in gold on blue glass stones to start the day! 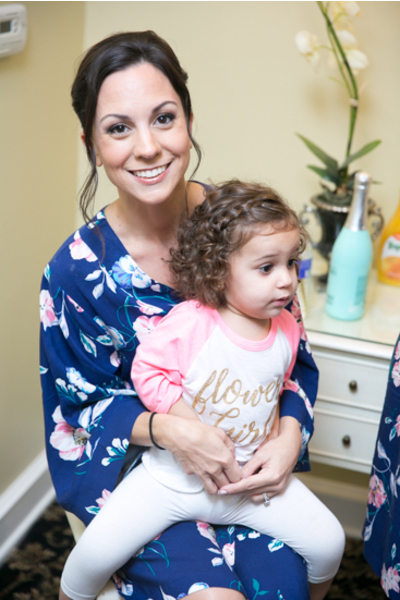 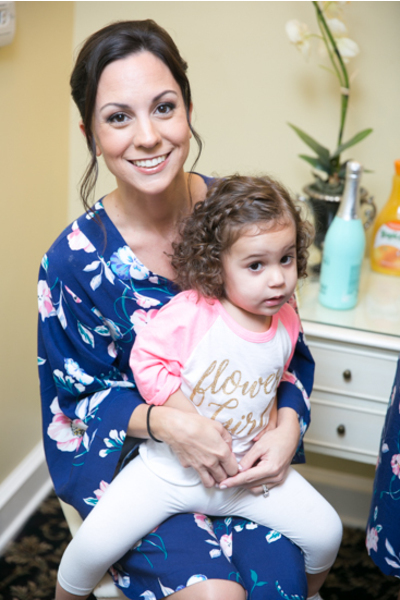 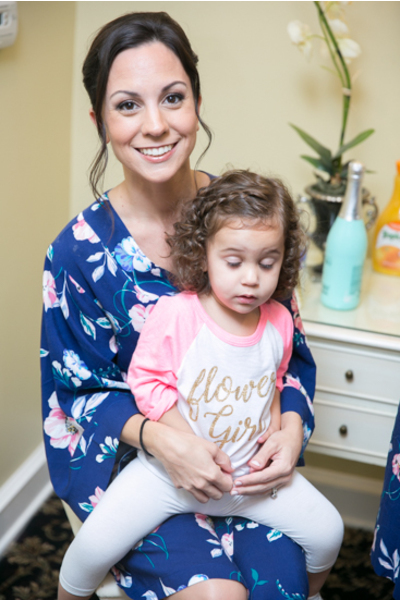 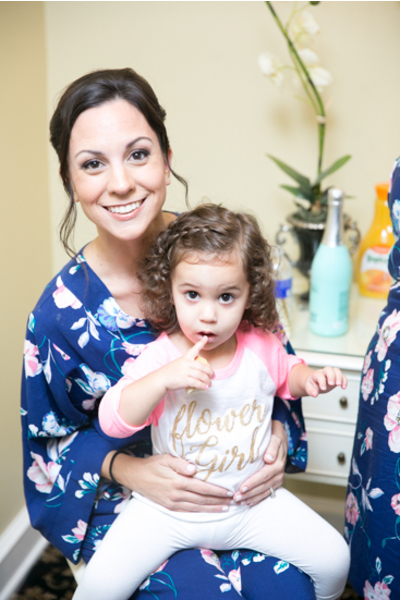 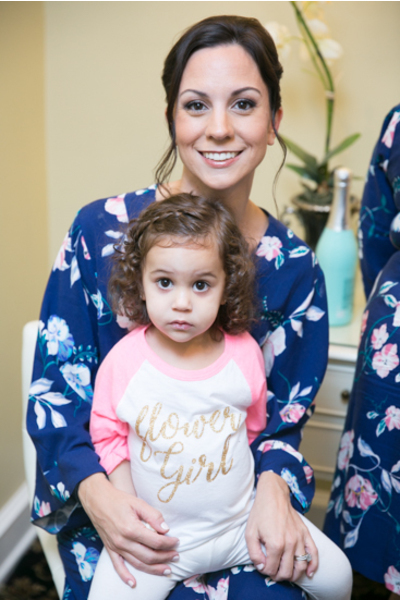 Carly and her girls were busy that morning getting primped and pampered! 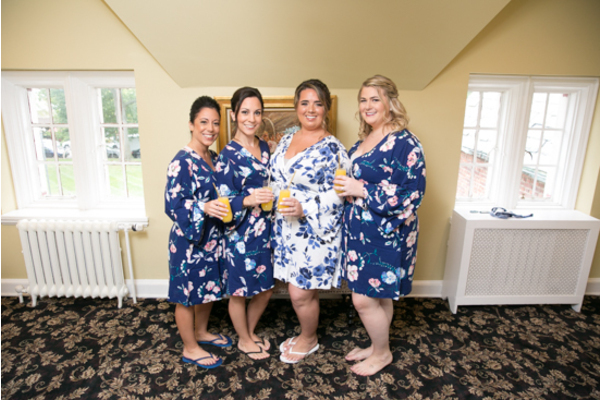 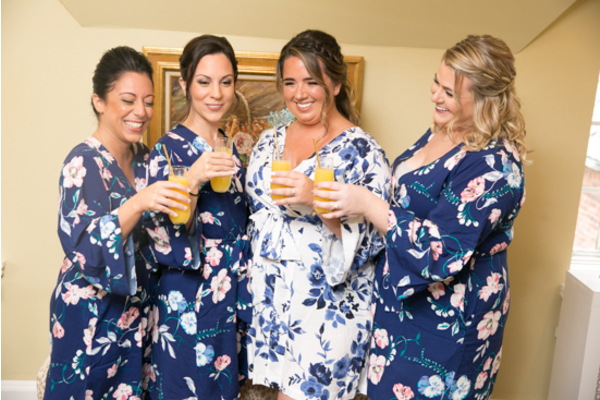 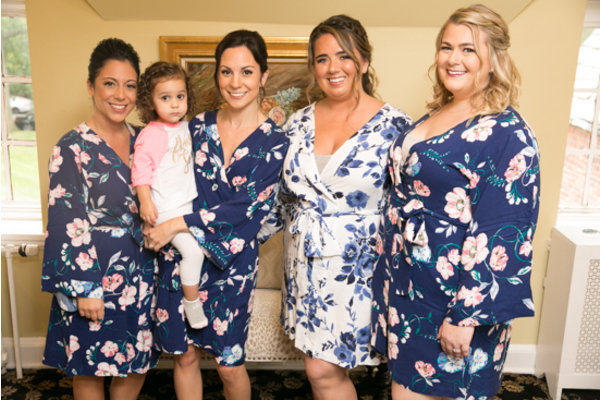 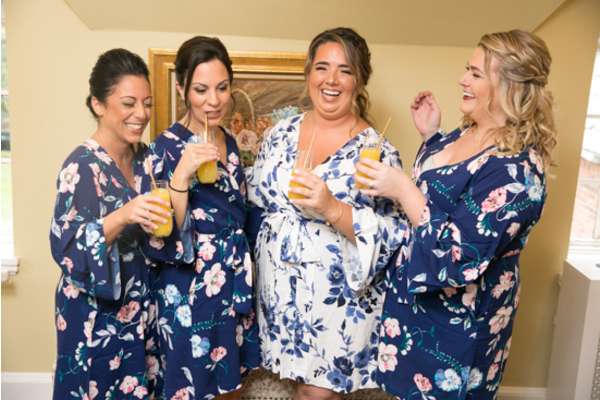 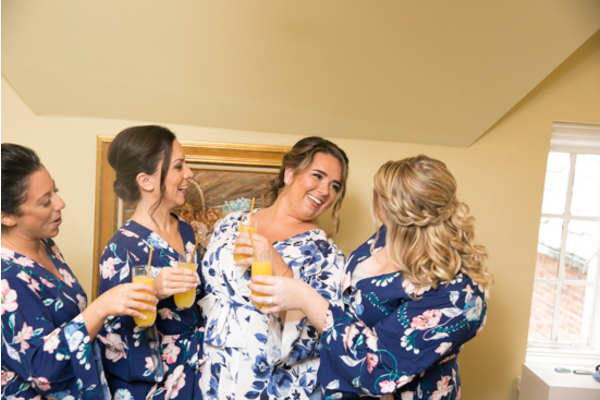 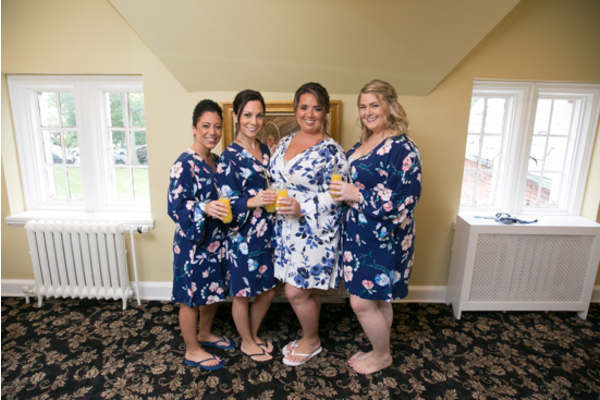 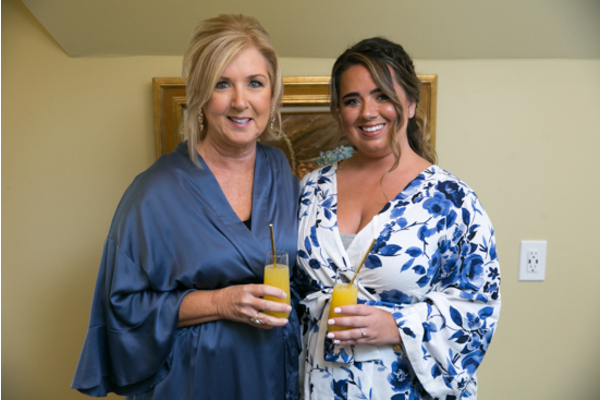 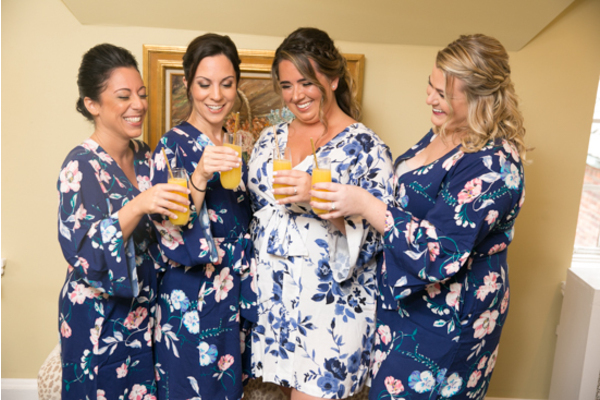 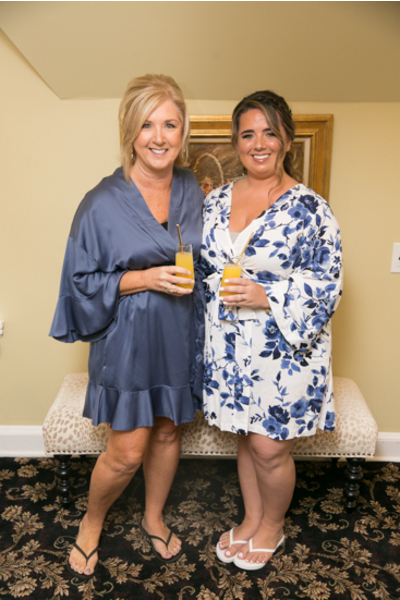 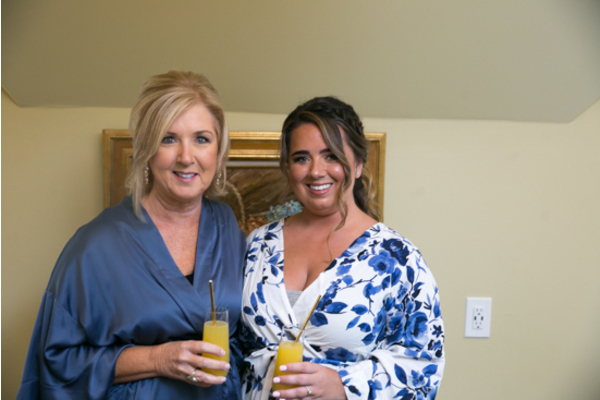 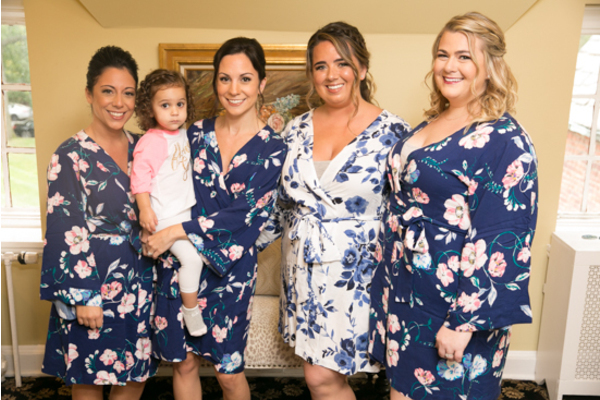 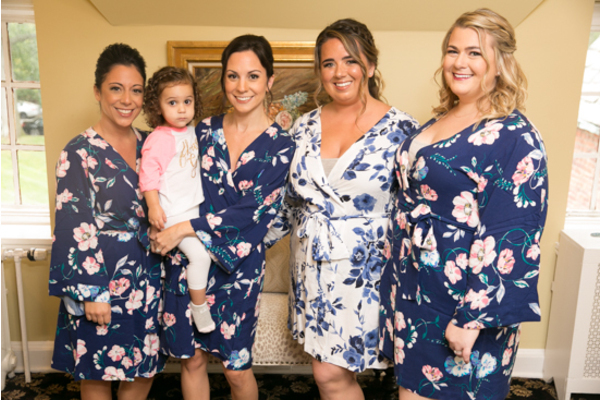 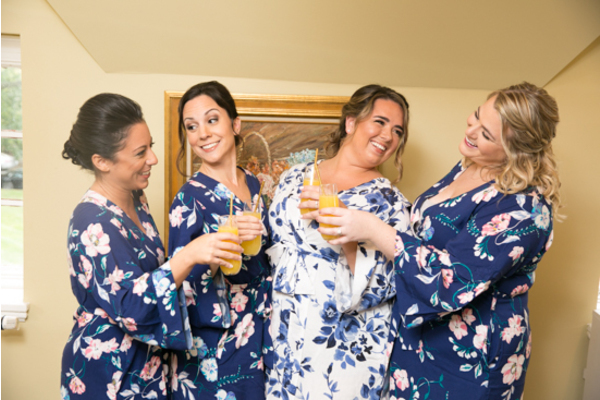 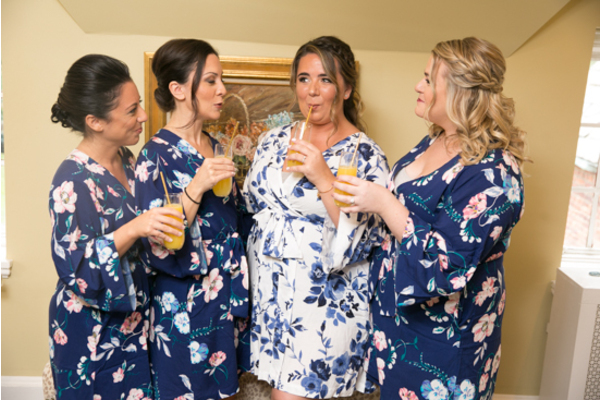 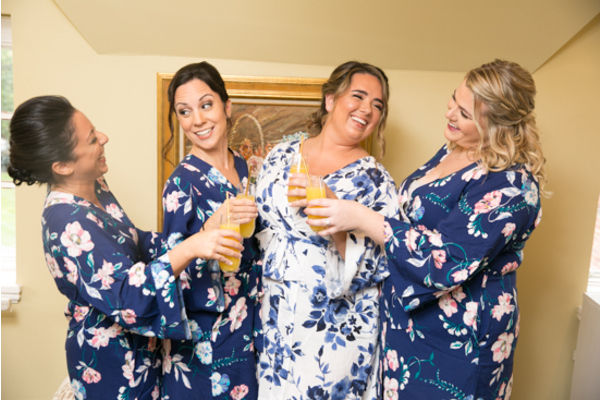 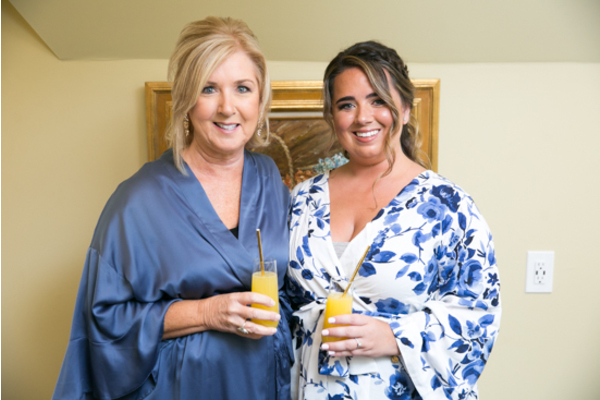 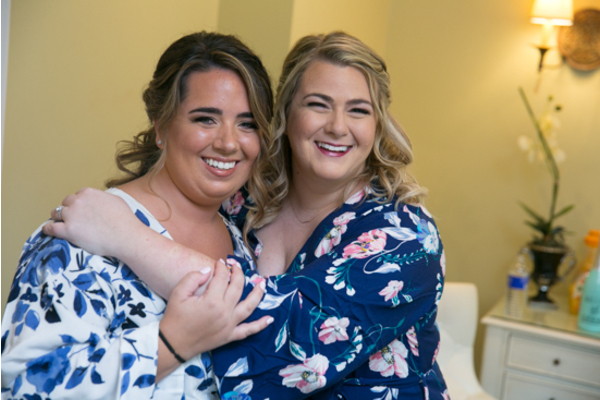 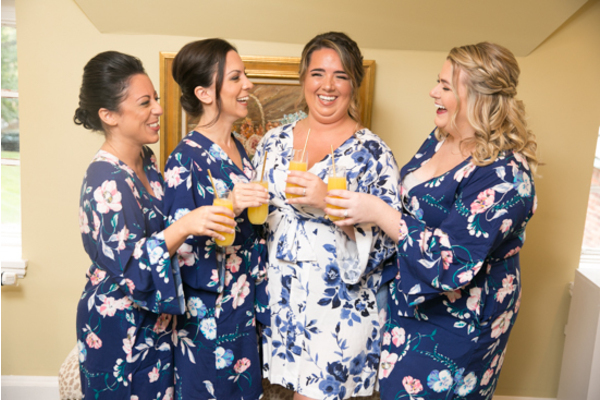 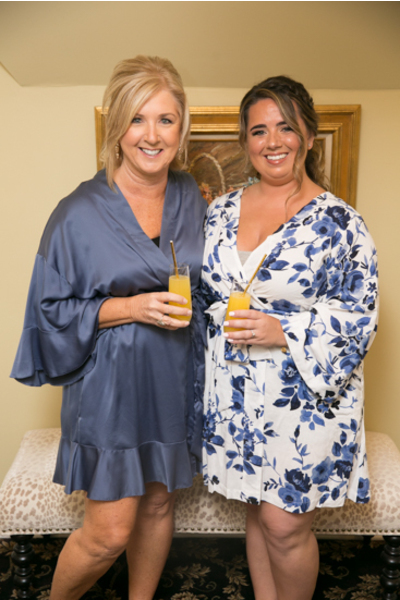 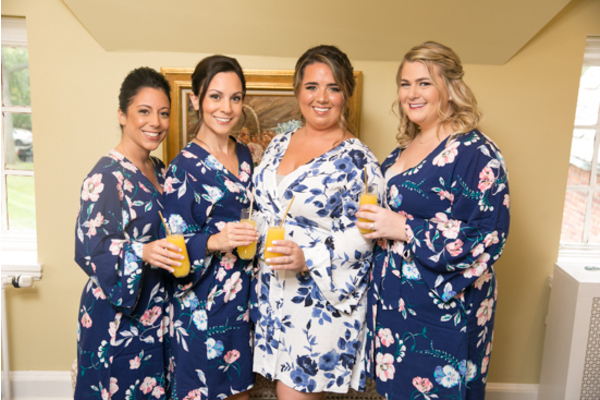 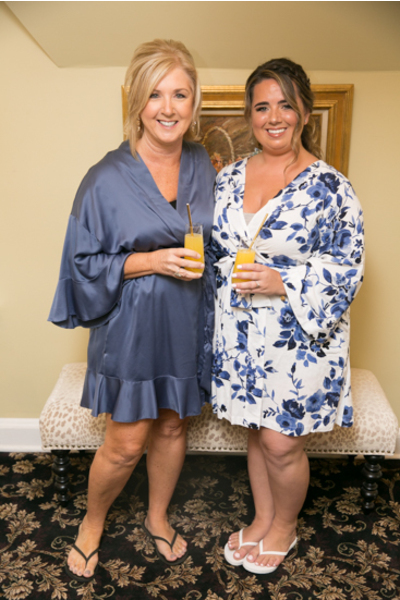 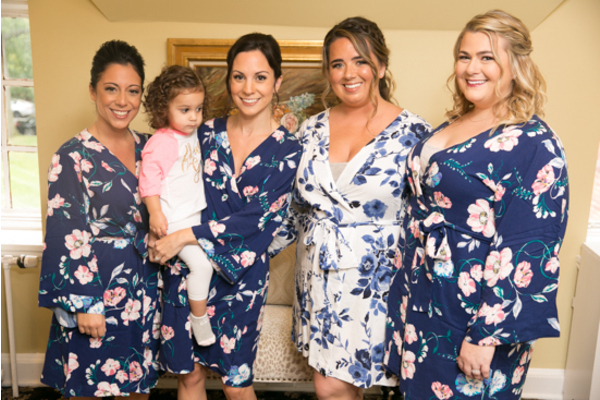 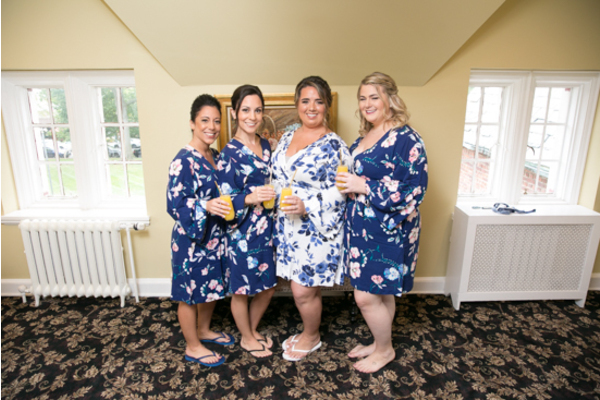 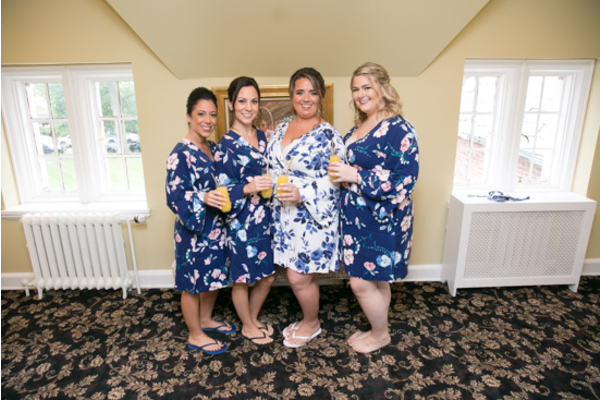 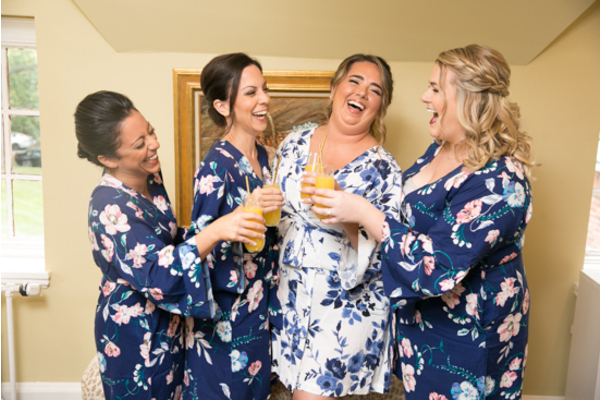 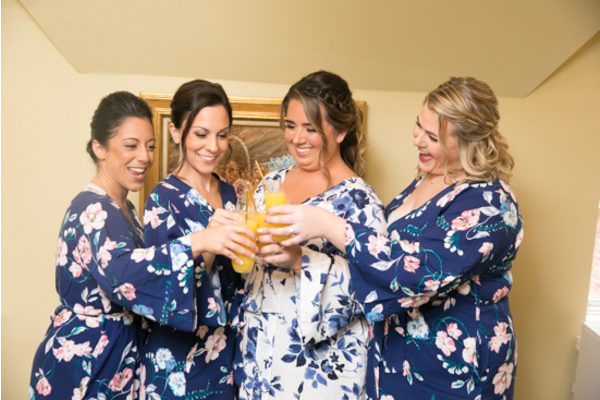 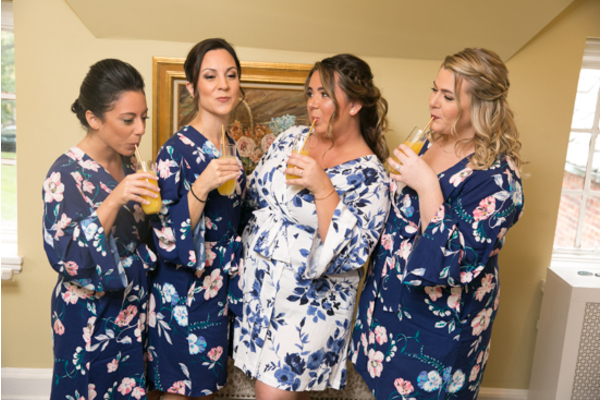 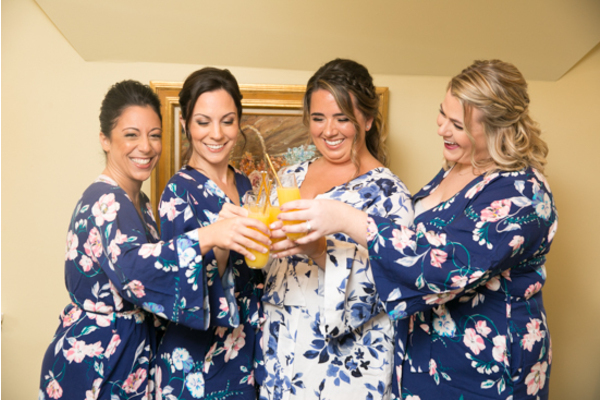 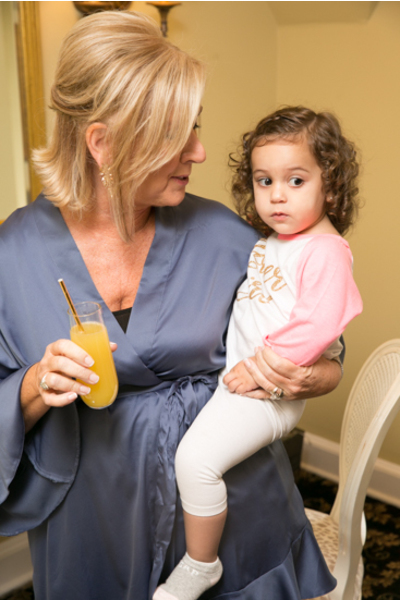 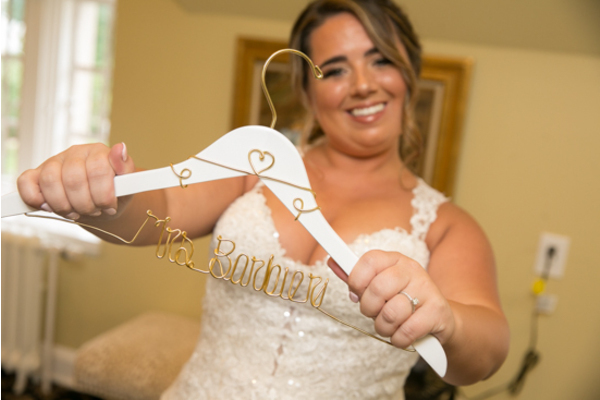 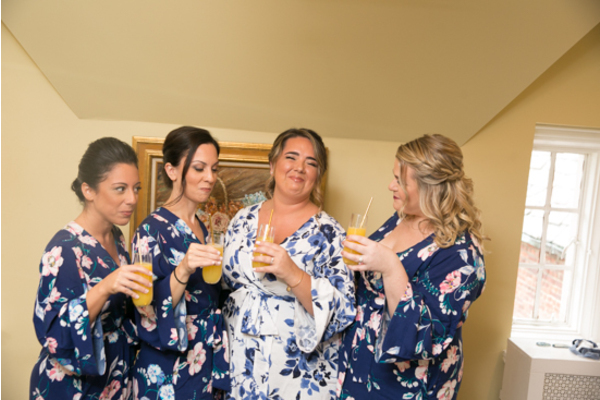 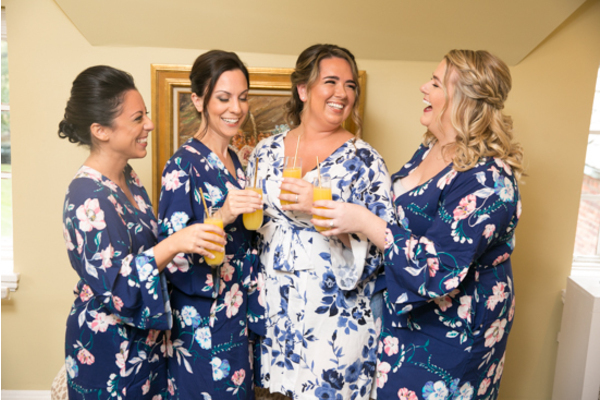 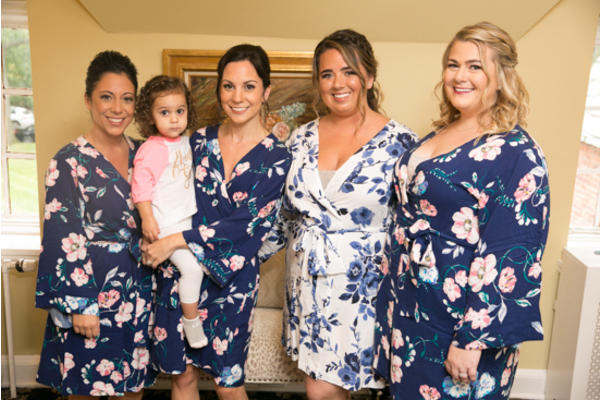 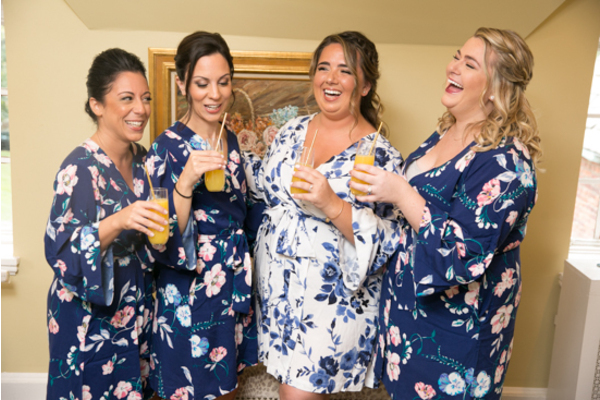 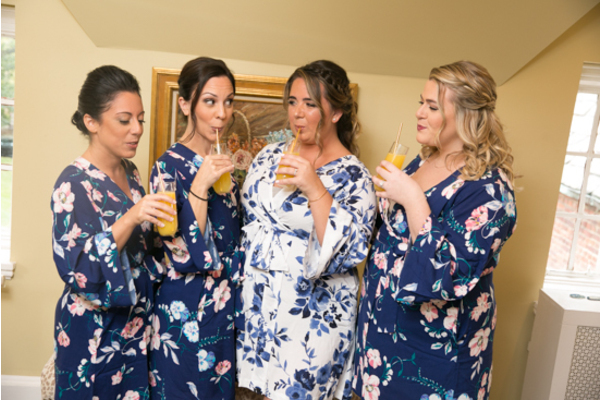 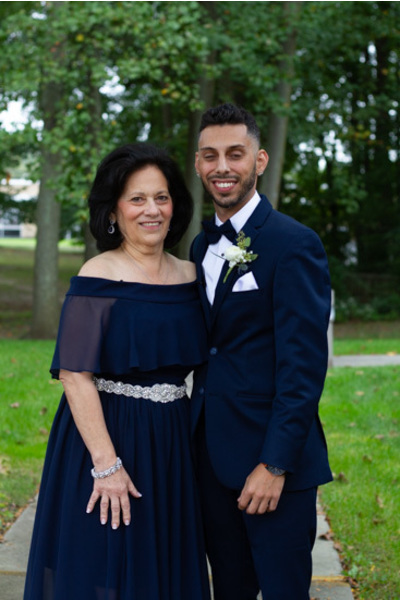 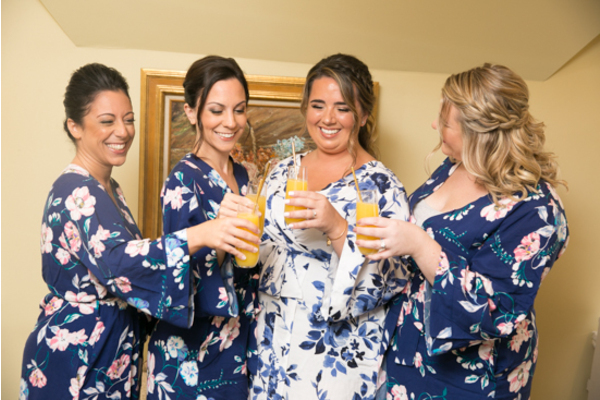 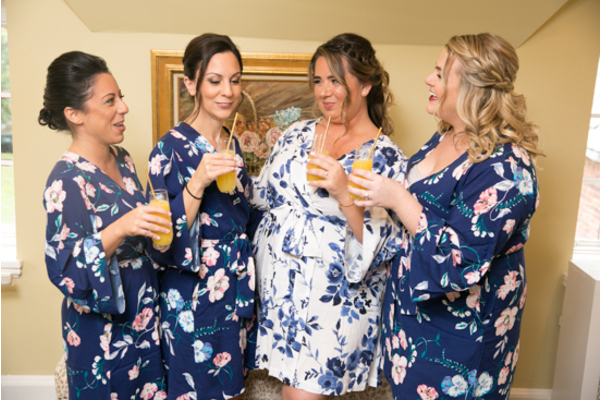 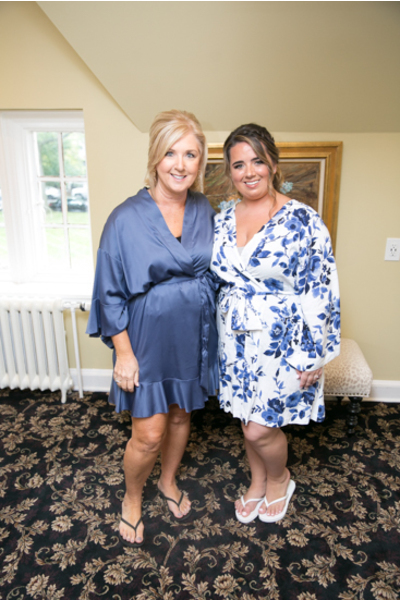 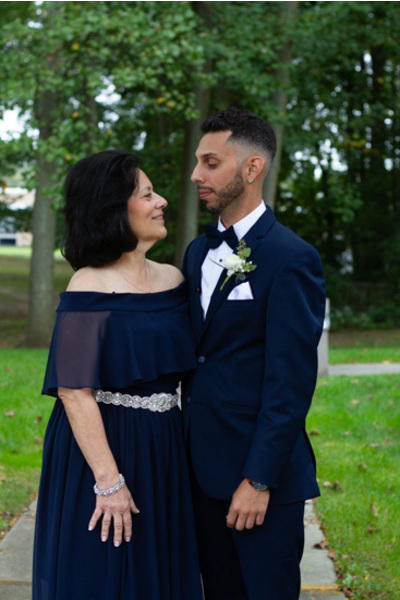 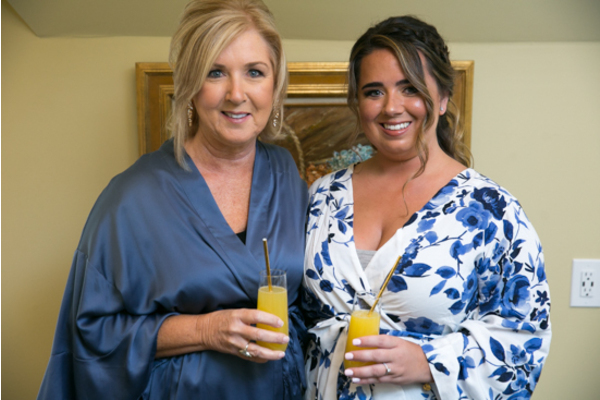 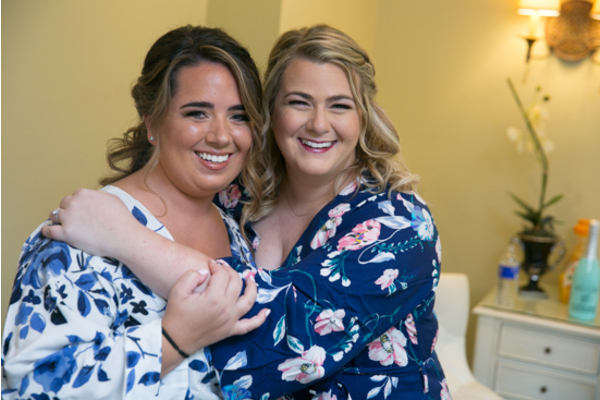 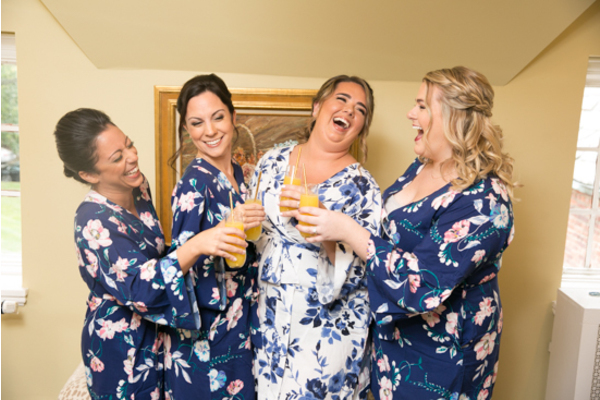 Our NJ Wedding Photographer was there as they all wore matching floral robes with mimosas in hand! 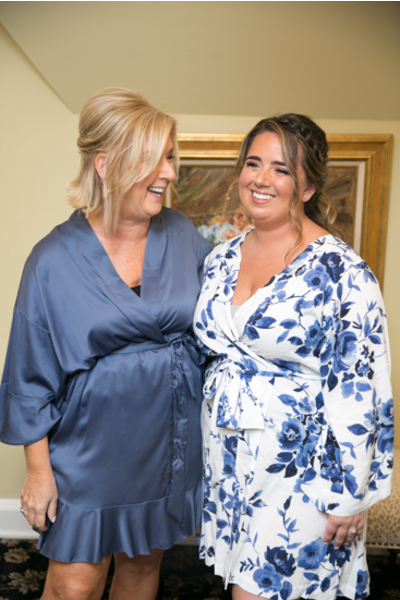 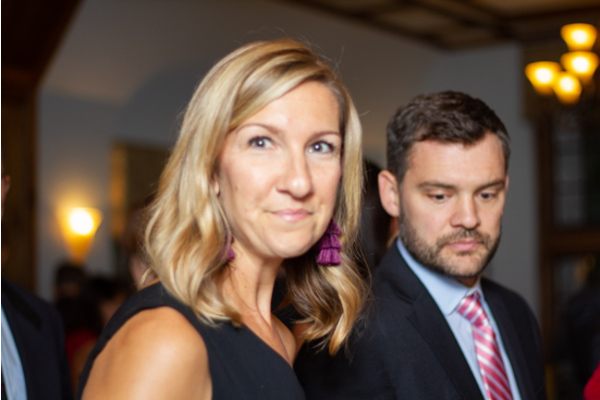 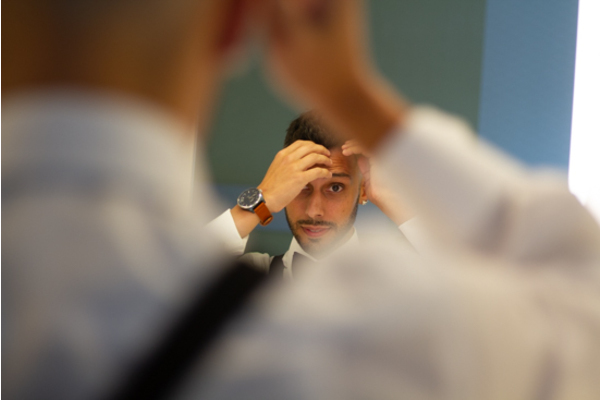 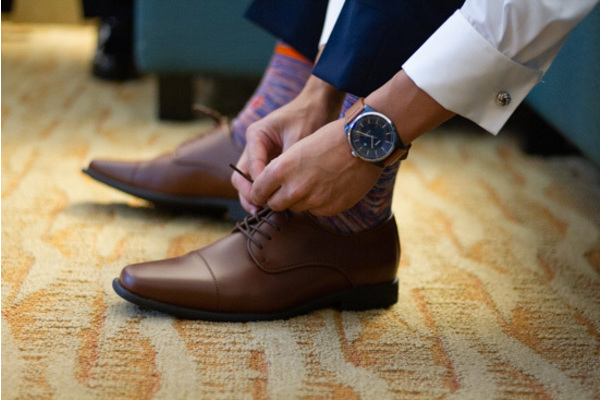 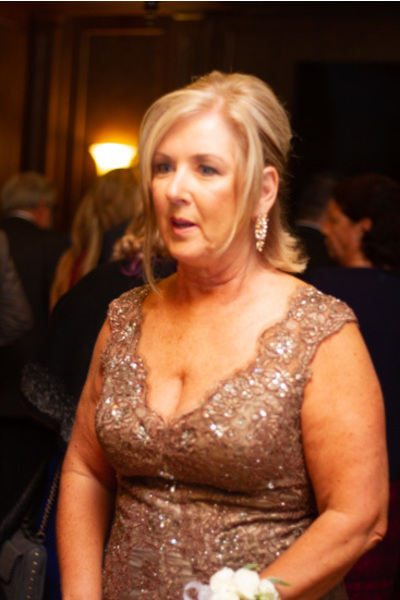 Moments later, Carly slipped into her dress and it was all hands on deck to complete the finishing touches of Carly’s look. 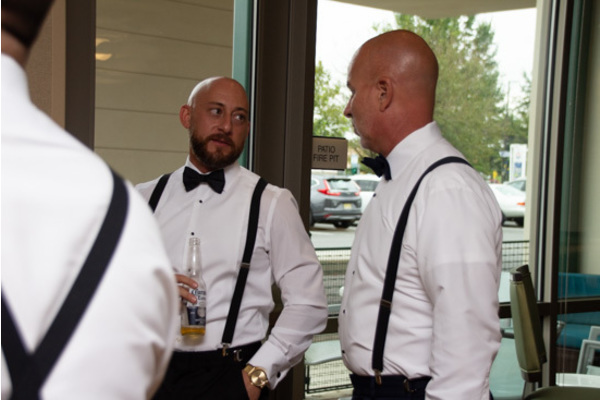 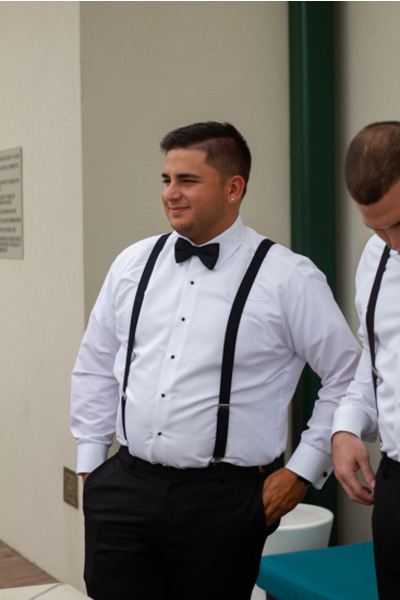 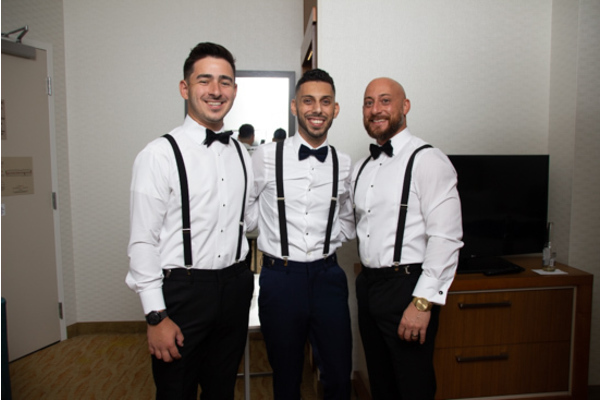 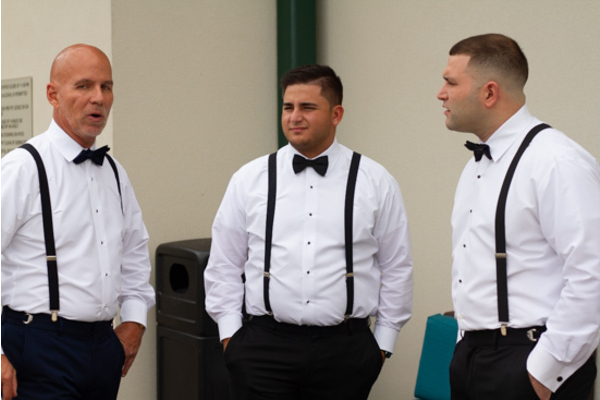 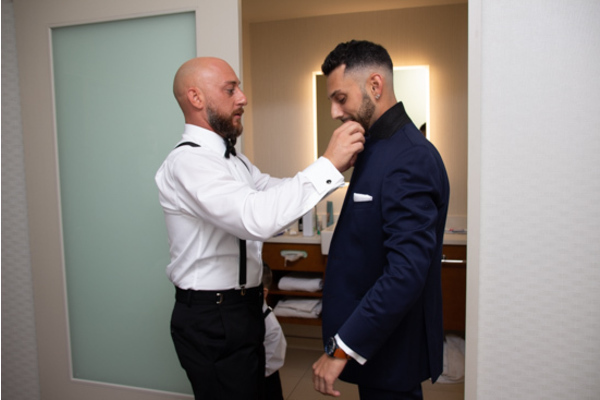 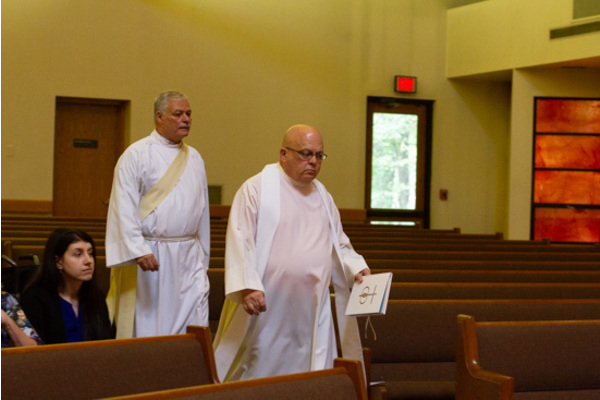 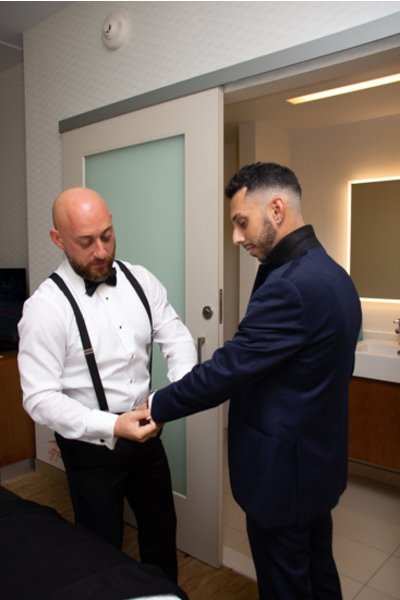 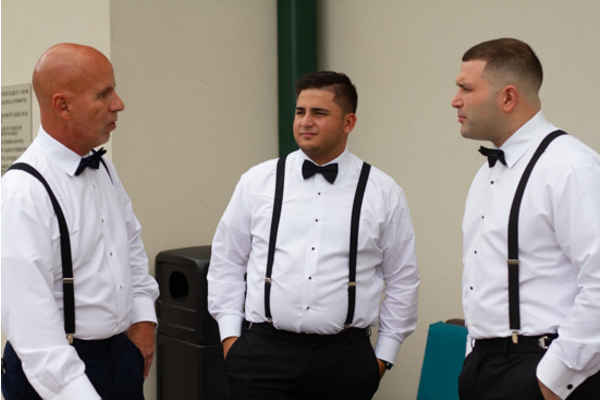 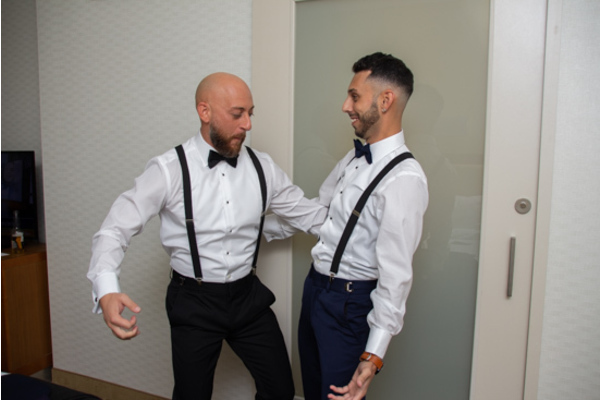 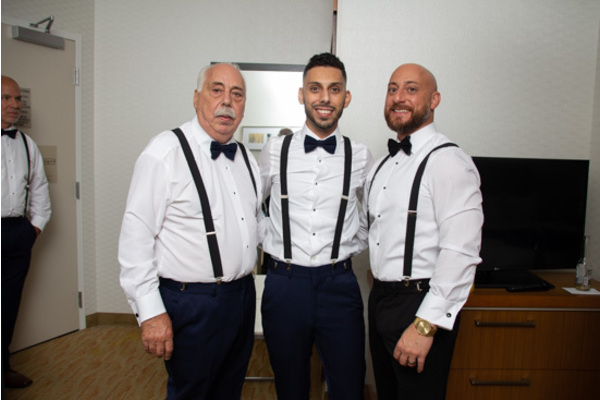 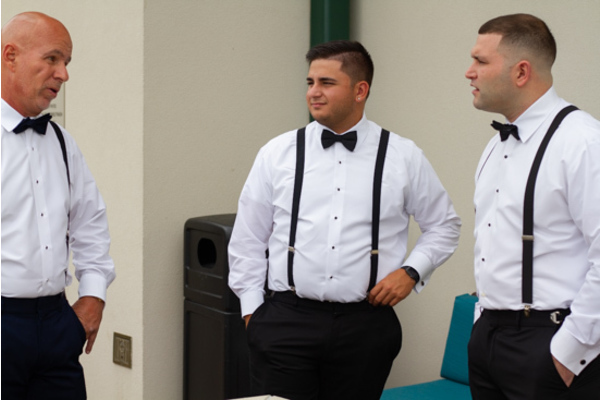 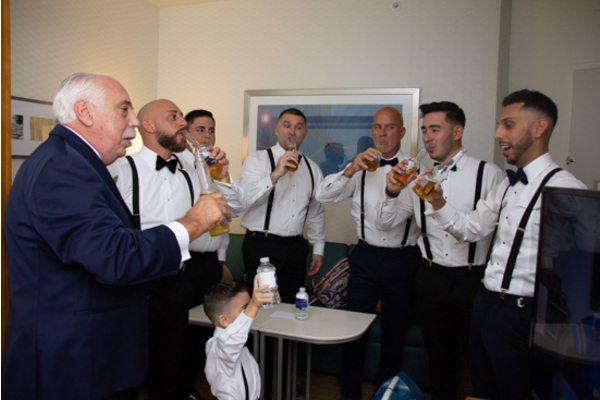 Meanwhile, Lou was with his best men sharing memories together before the big moment up at the alter. 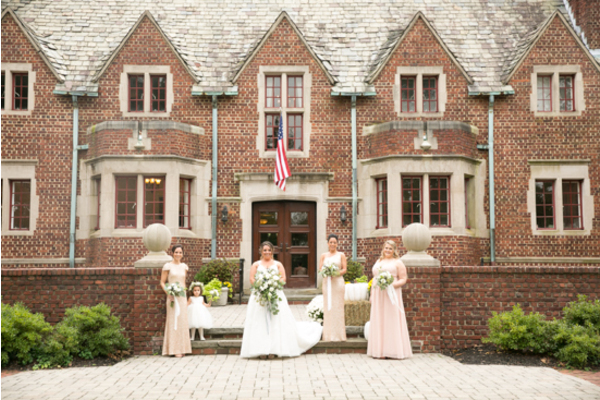 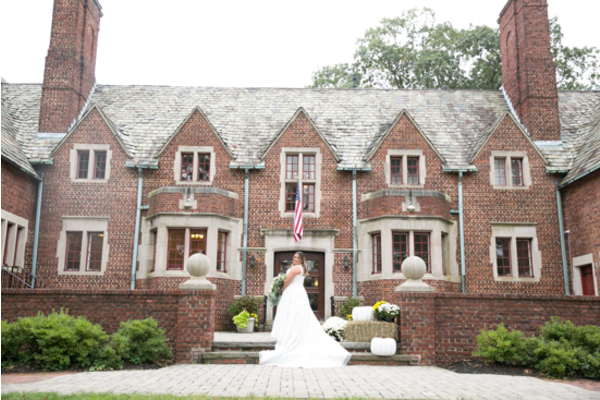 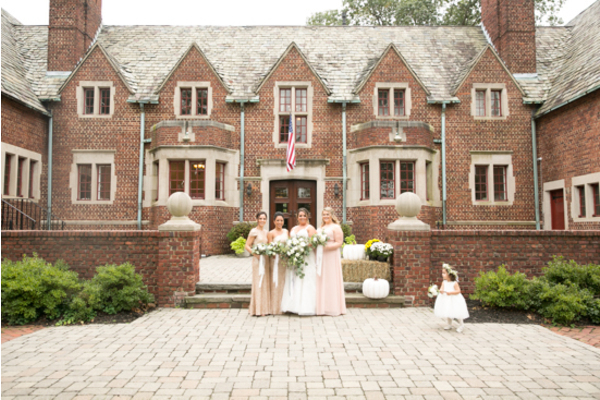 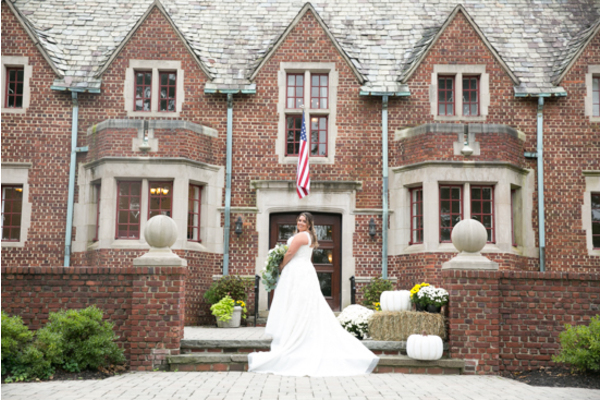 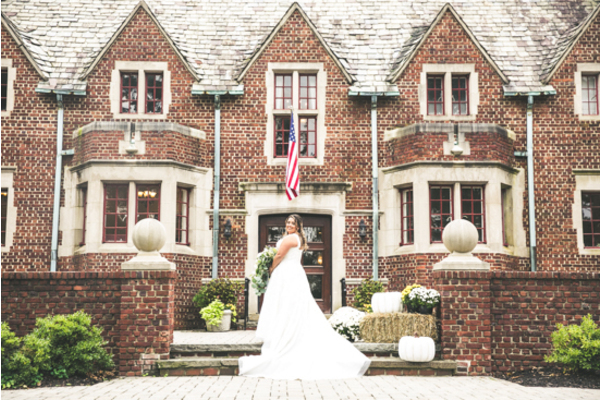 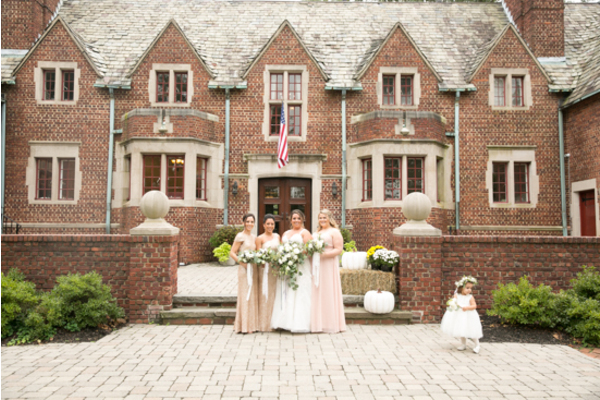 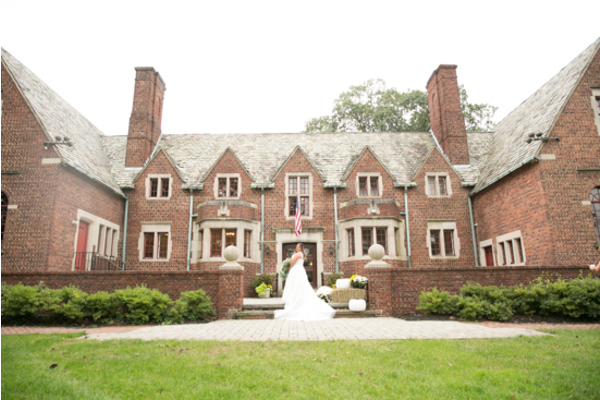 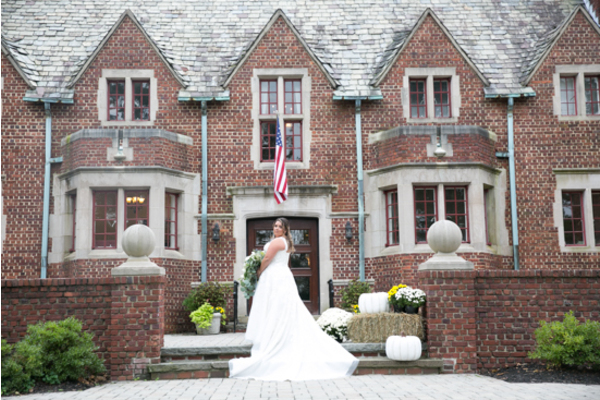 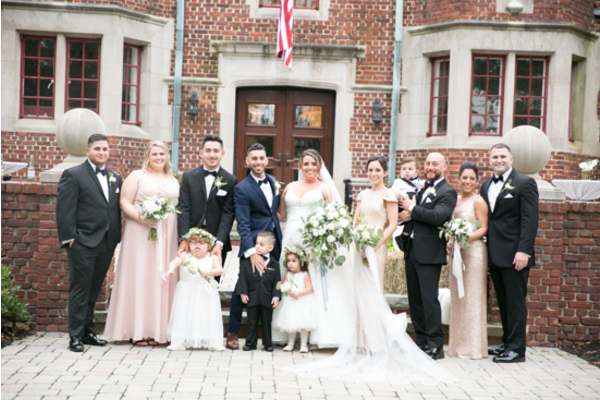 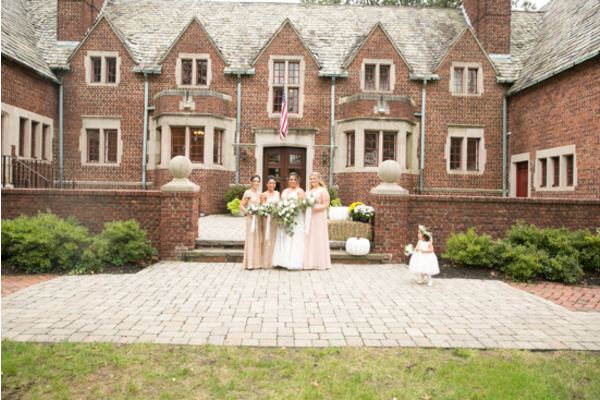 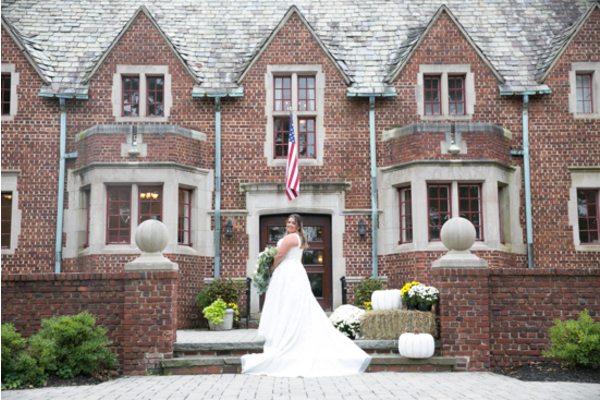 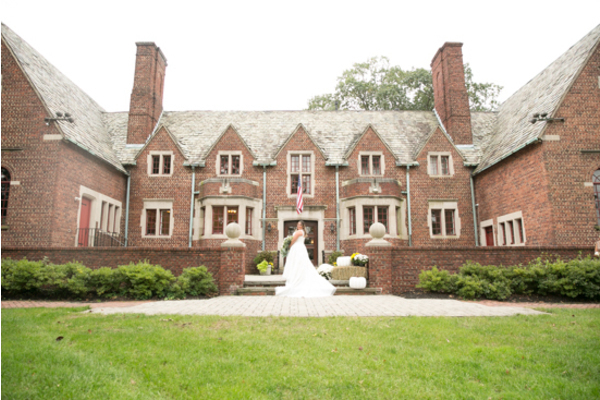 Outside, the bridal party and flower girl posed in front of the gorgeous brick building. 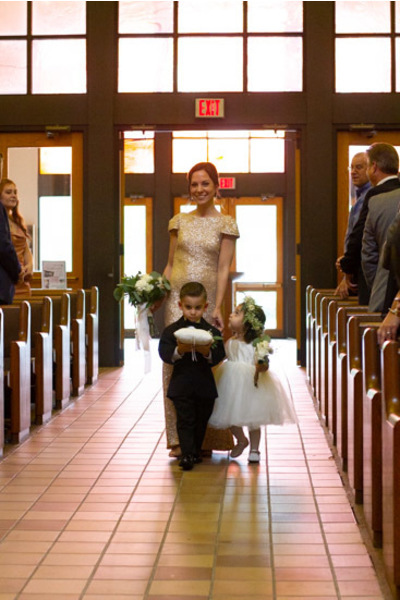 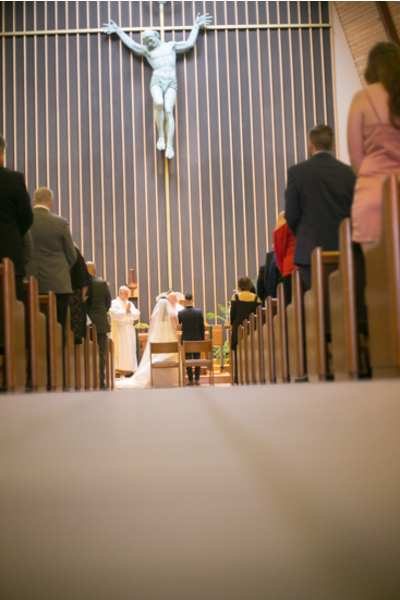 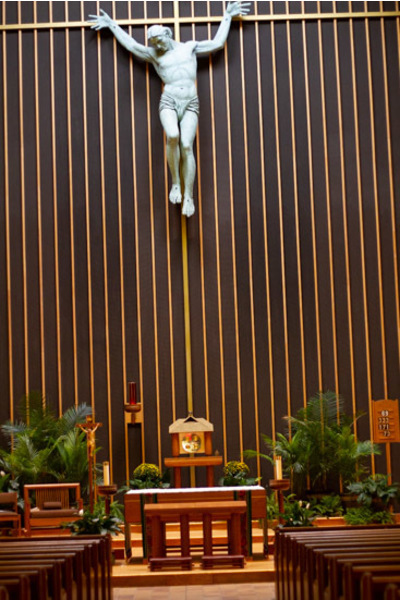 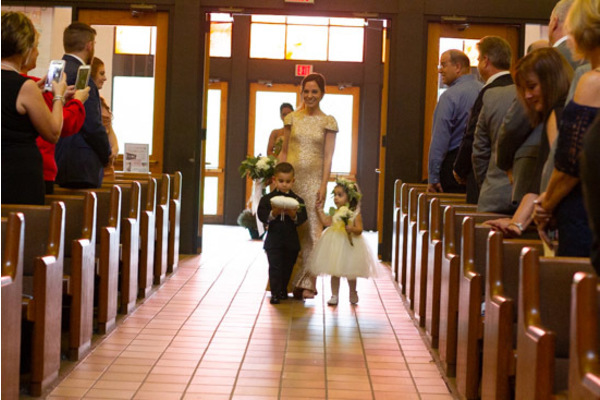 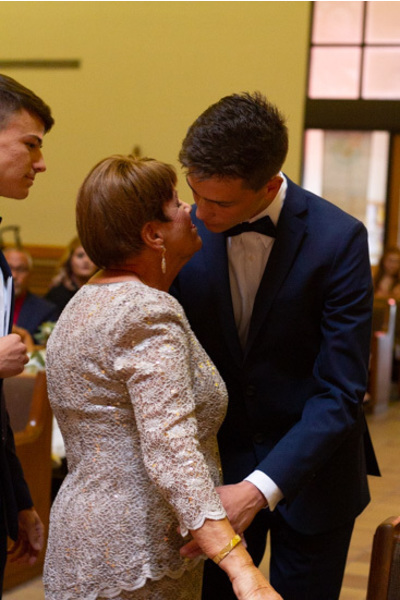 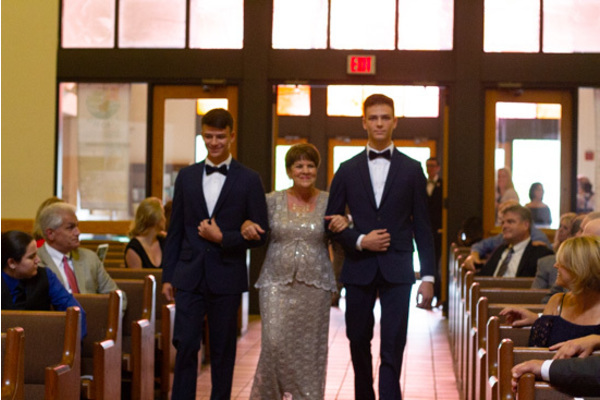 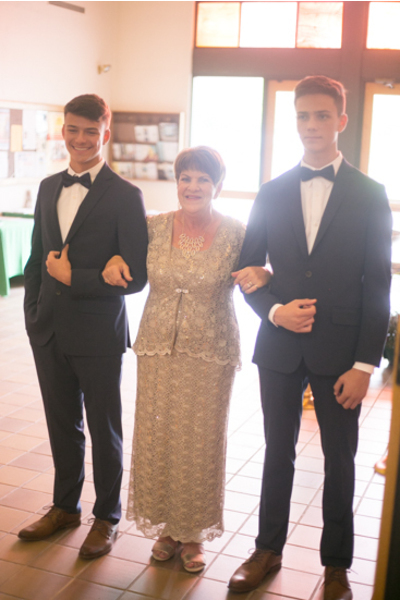 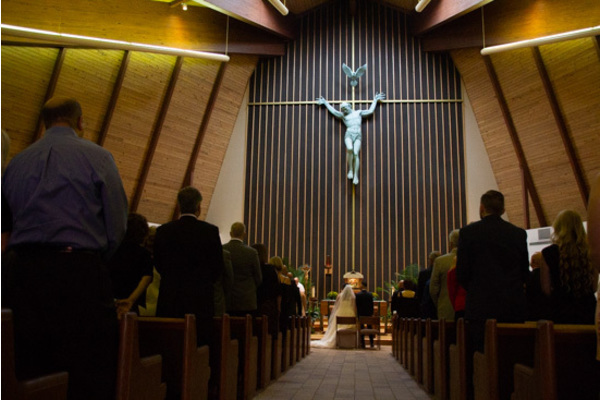 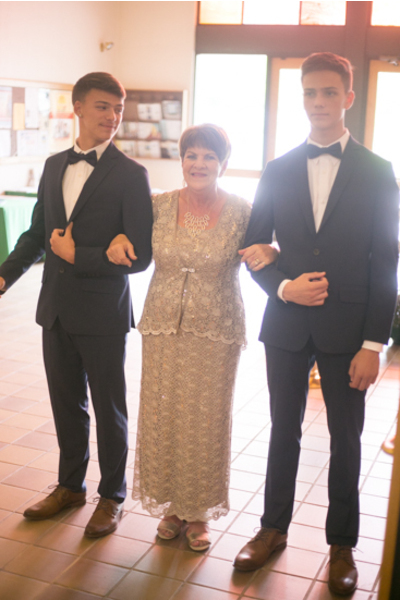 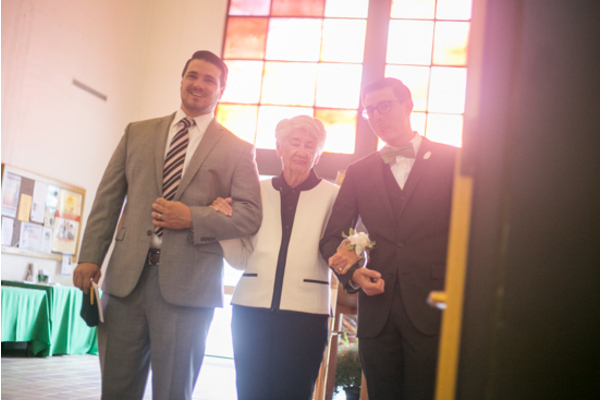 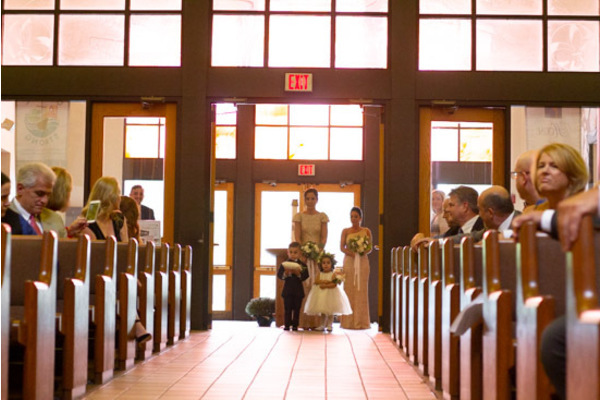 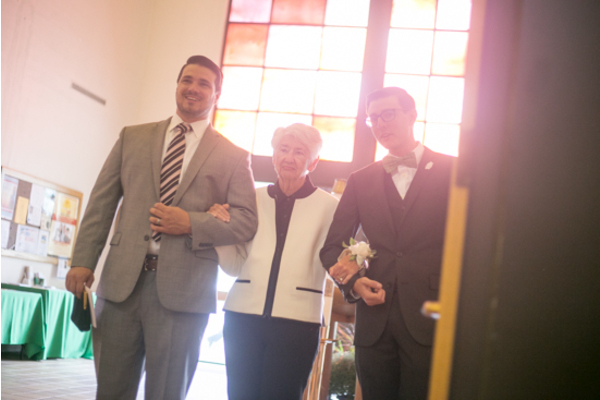 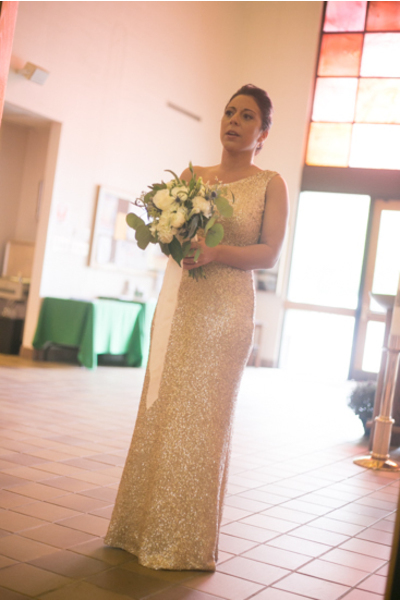 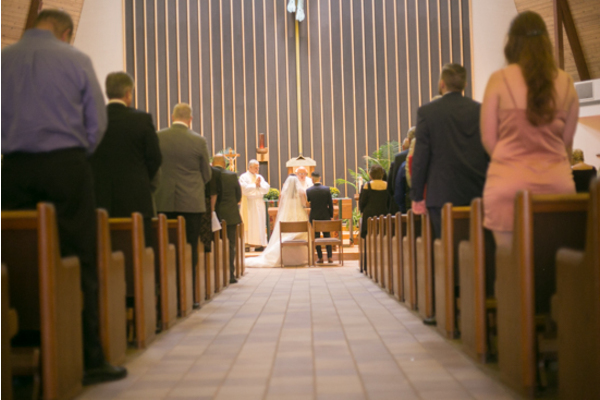 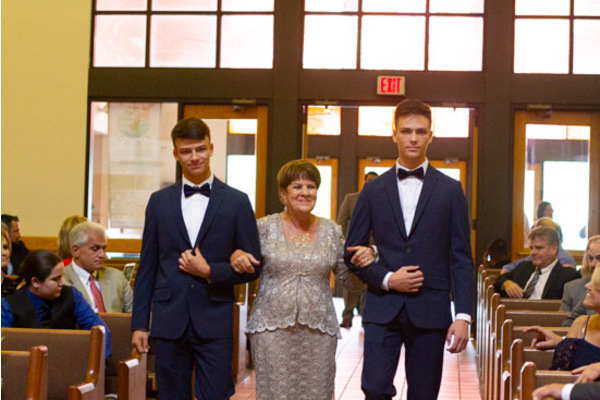 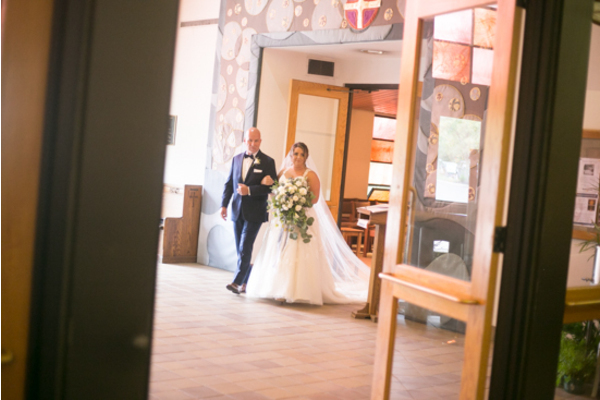 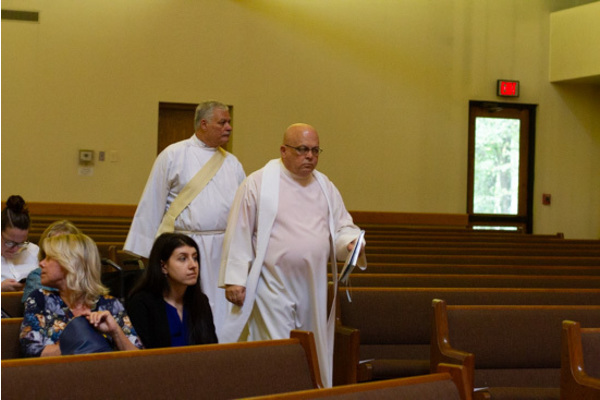 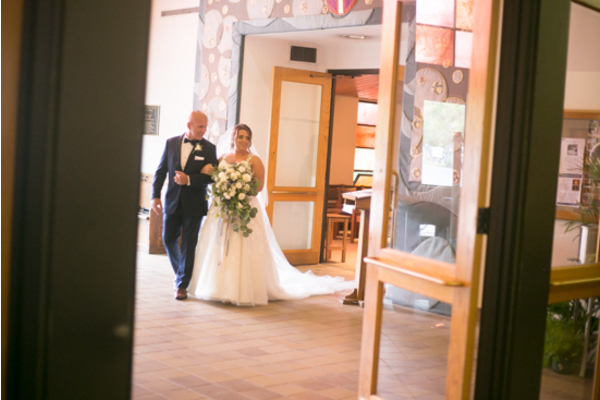 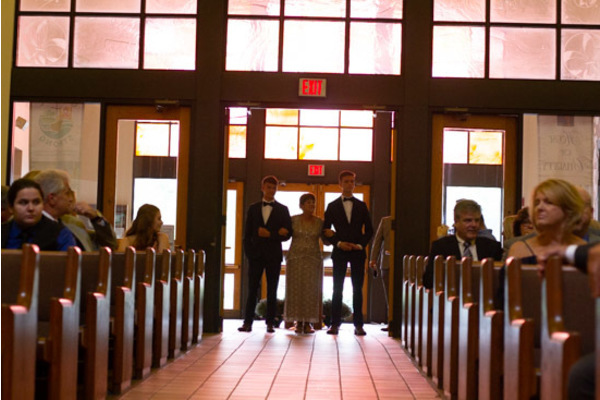 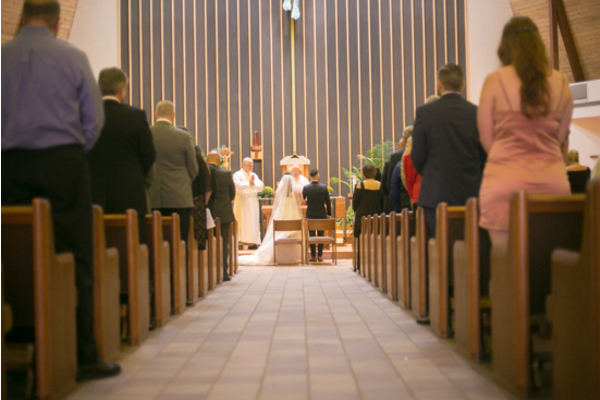 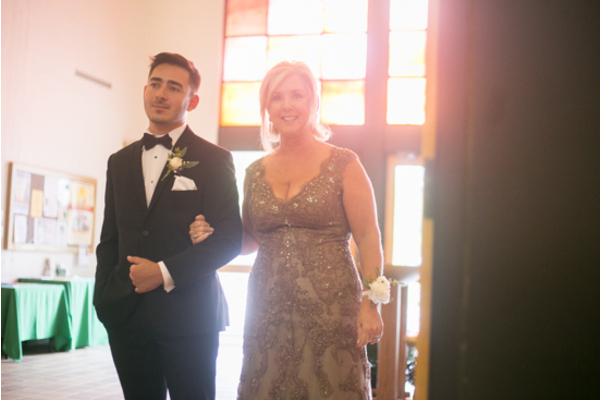 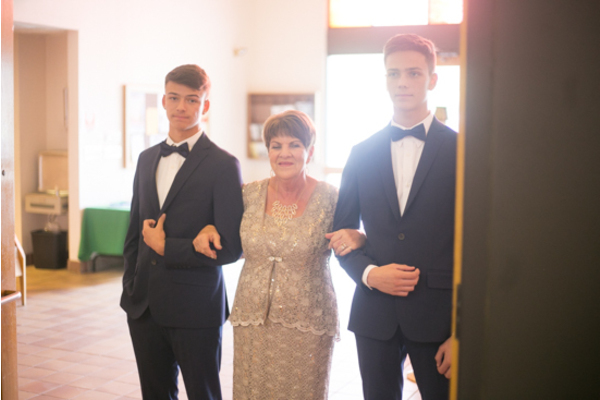 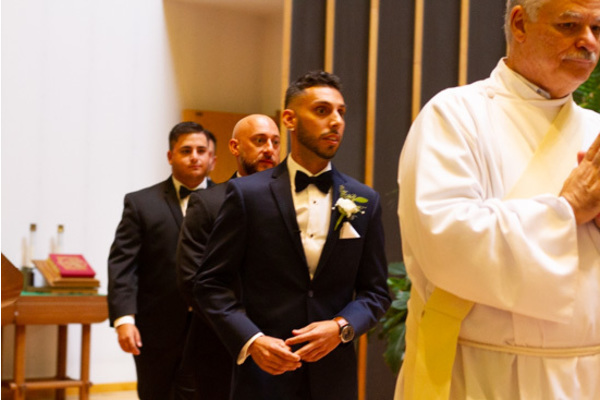 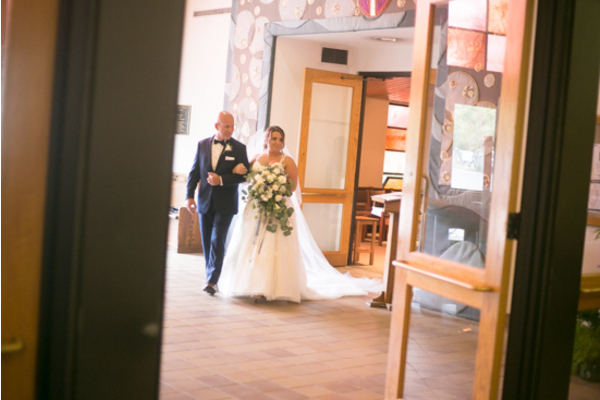 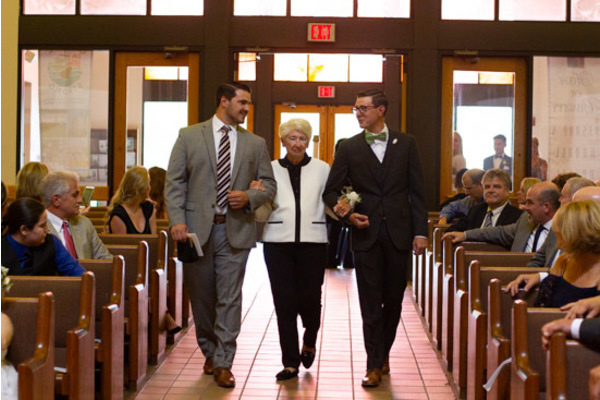 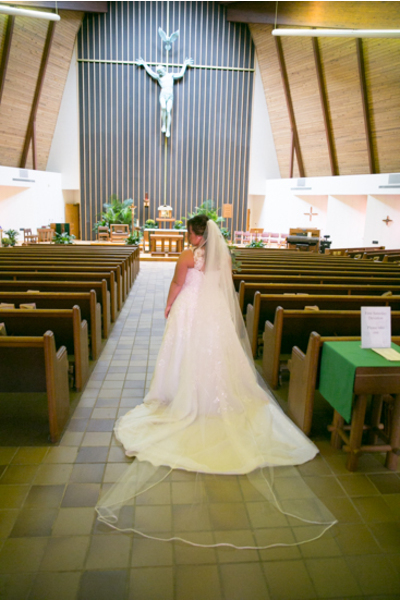 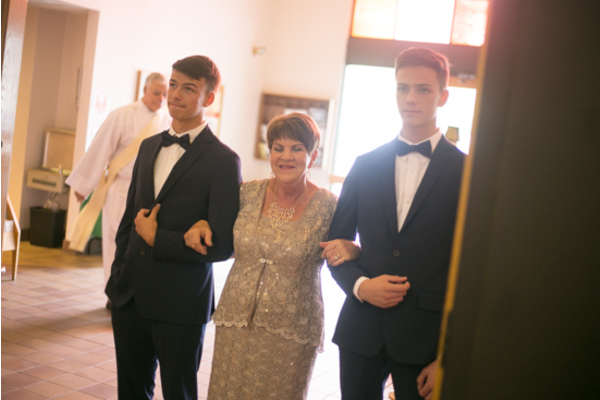 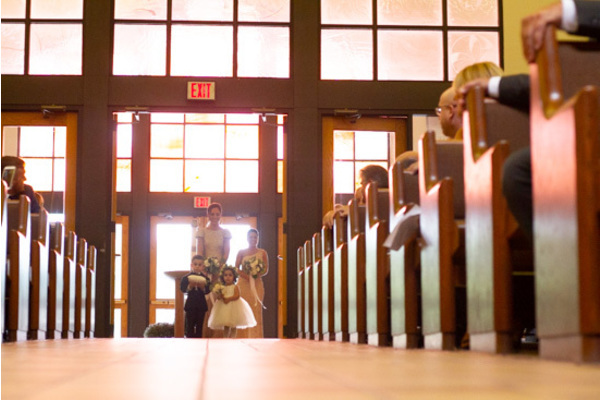 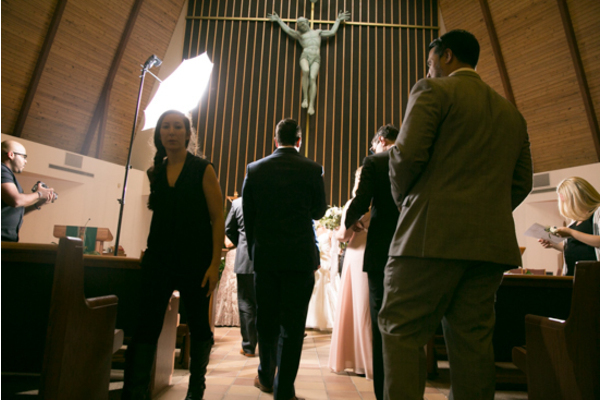 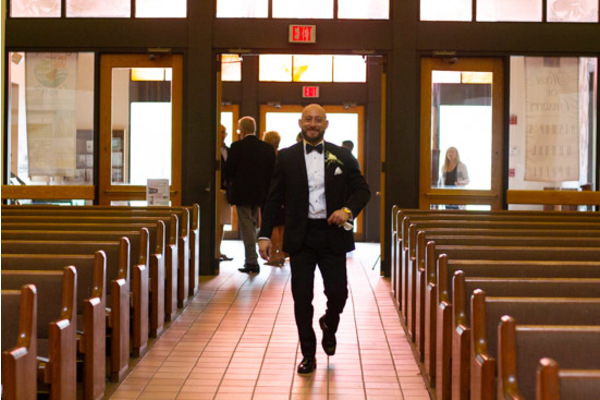 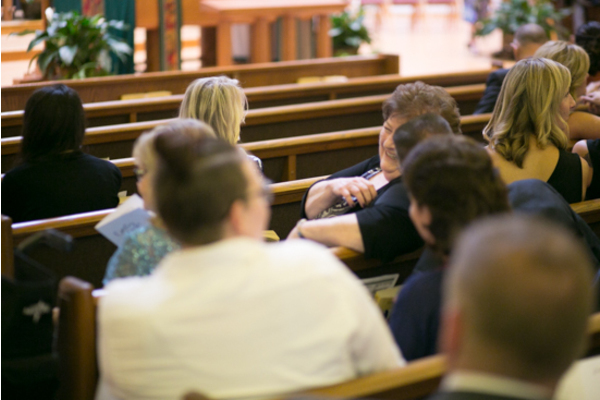 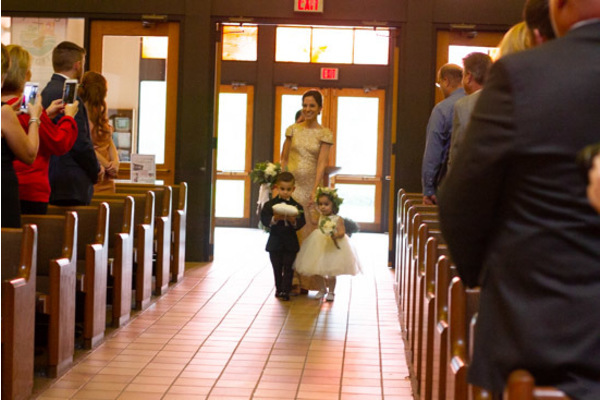 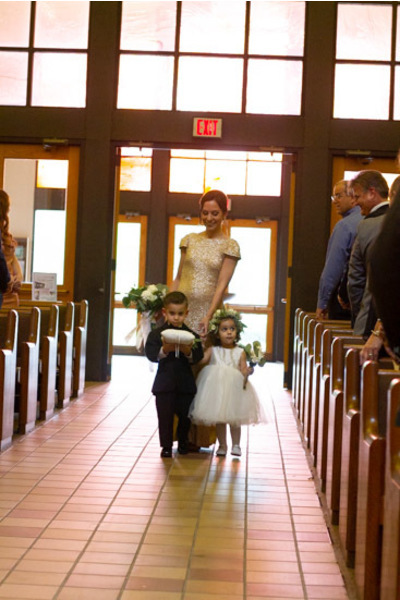 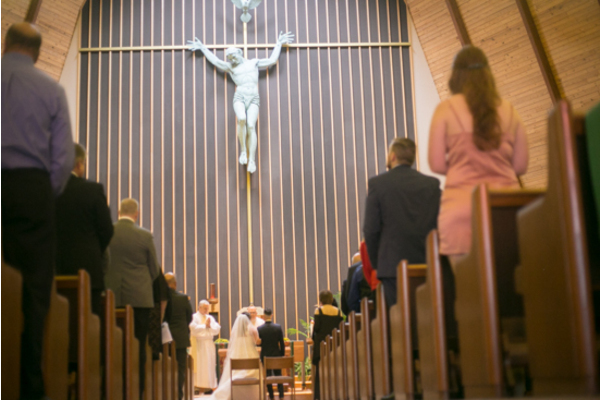 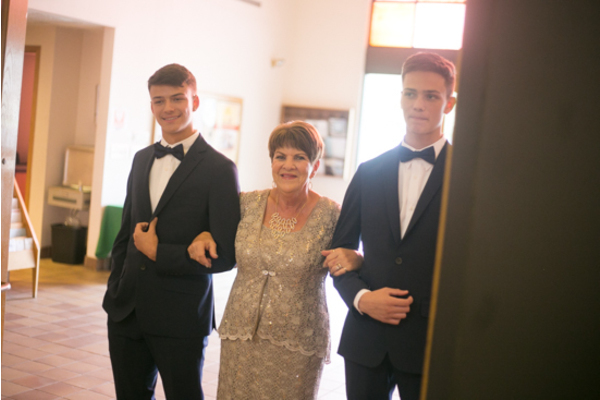 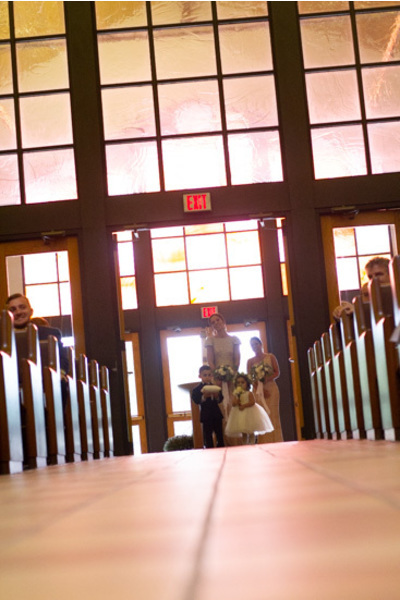 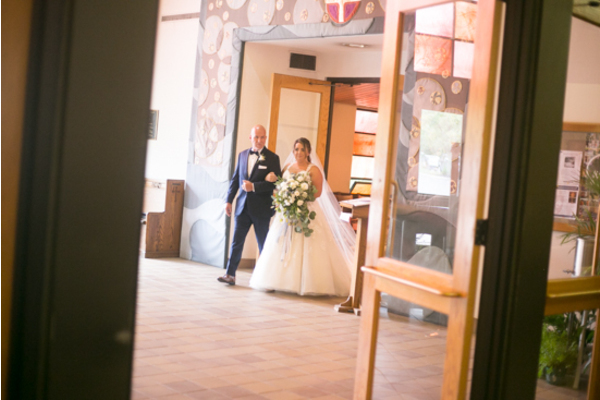 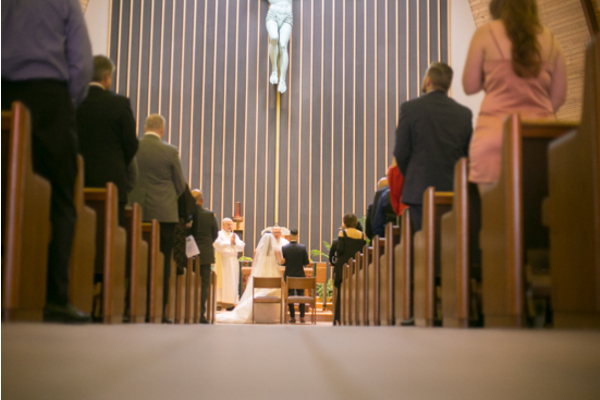 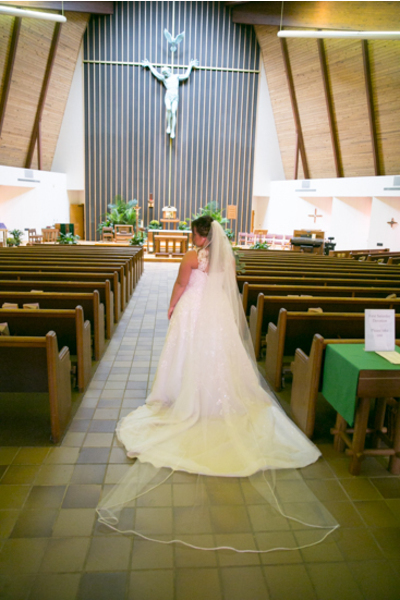 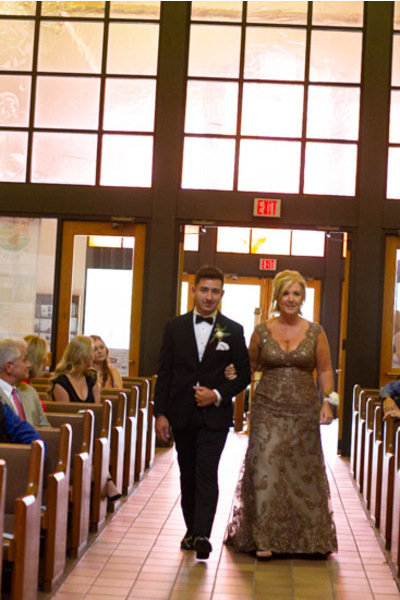 Suddenly, it was time to head over to the church for the ceremony! 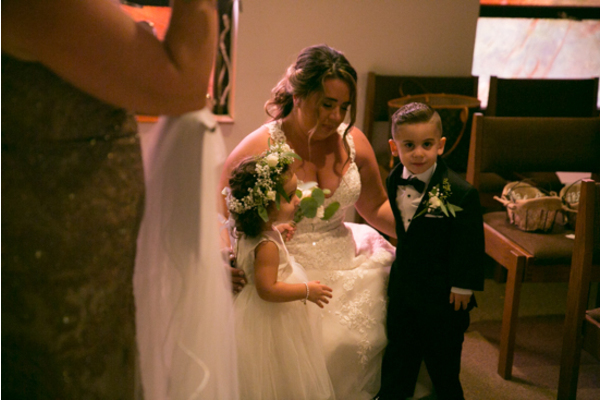 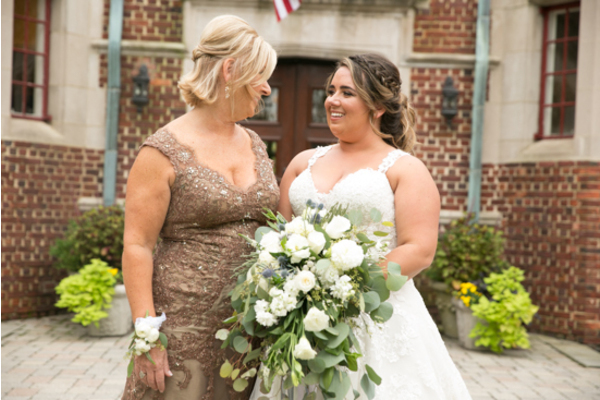 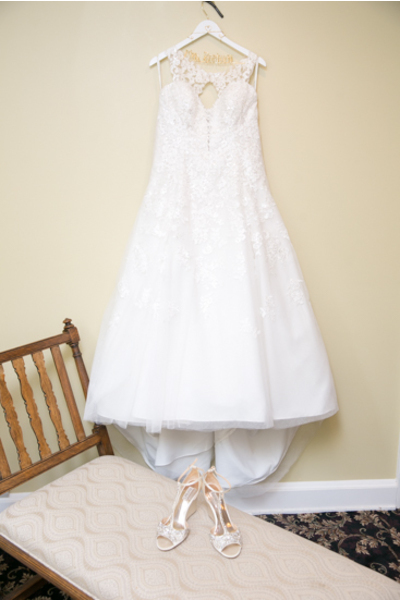 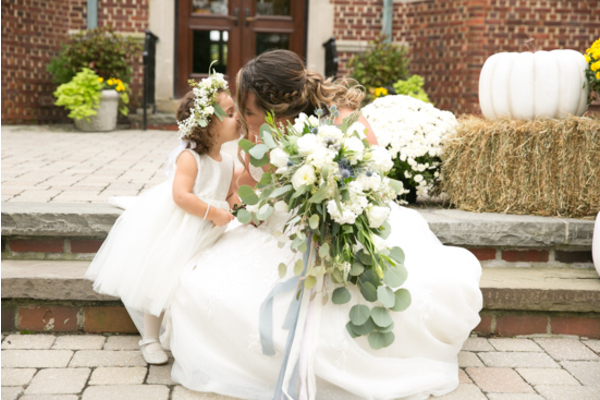 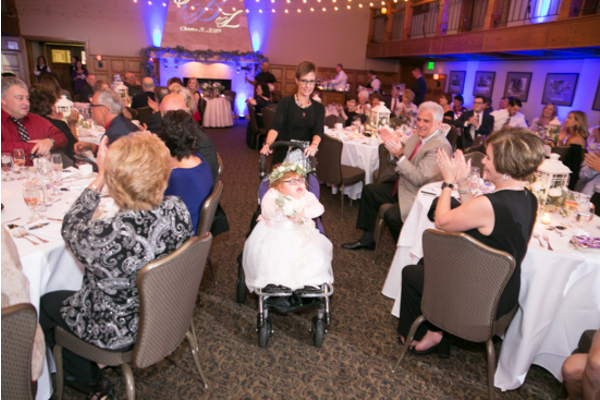 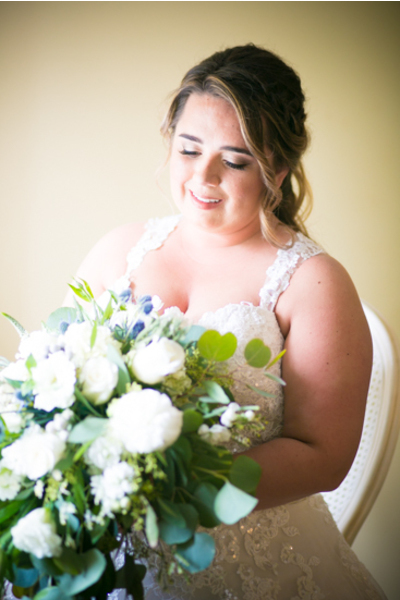 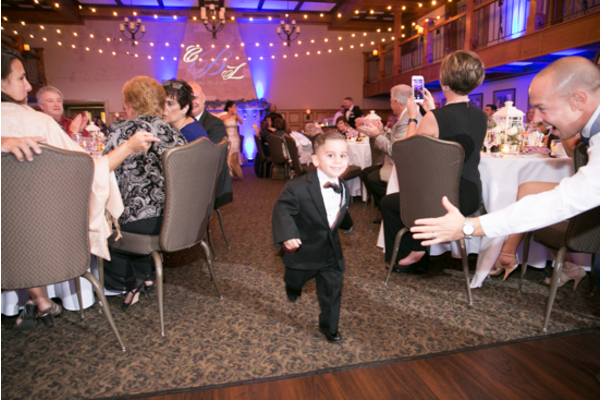 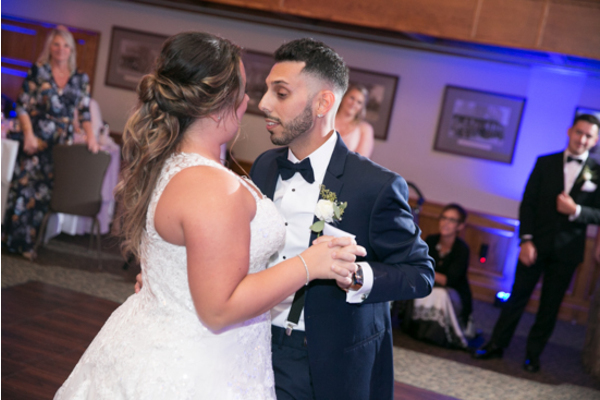 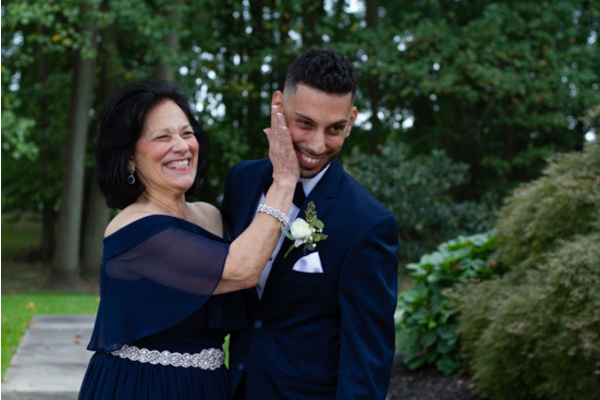 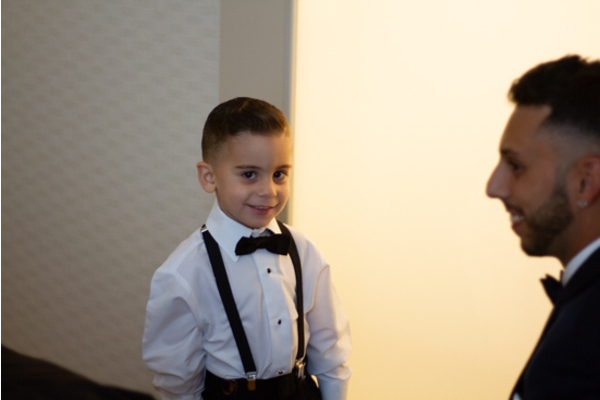 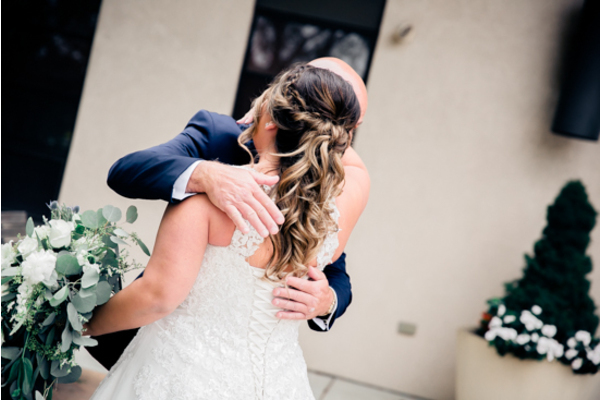 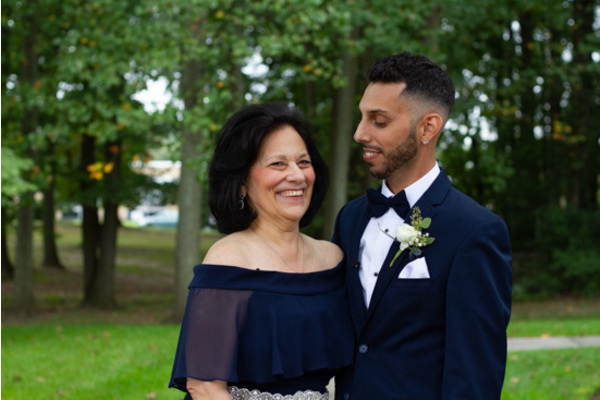 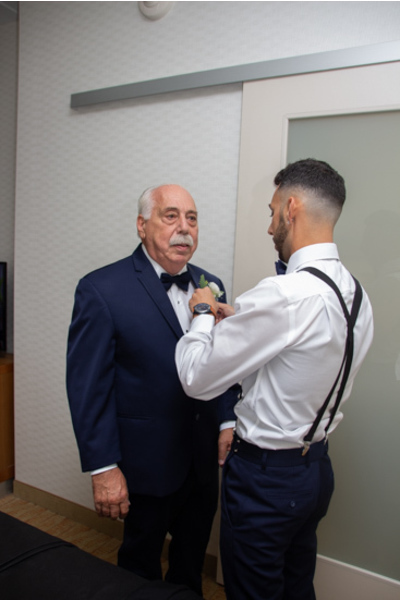 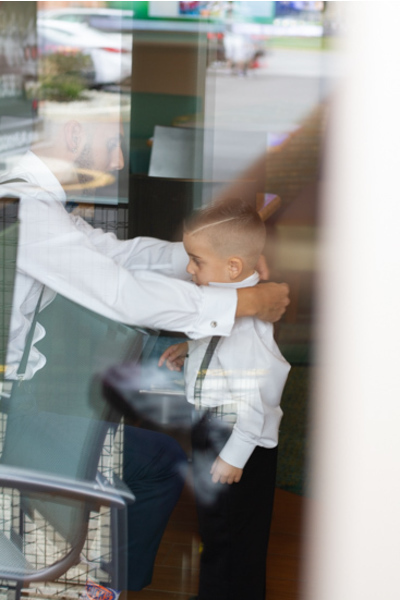 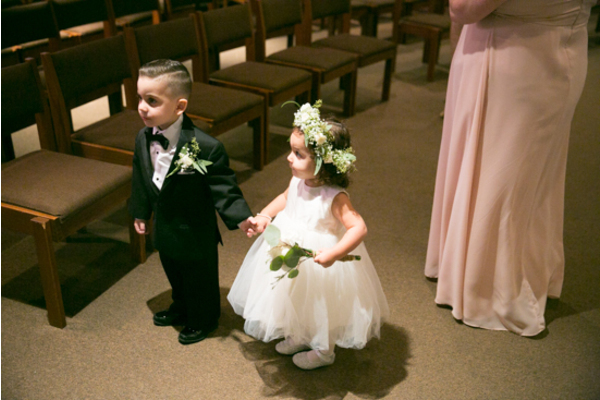 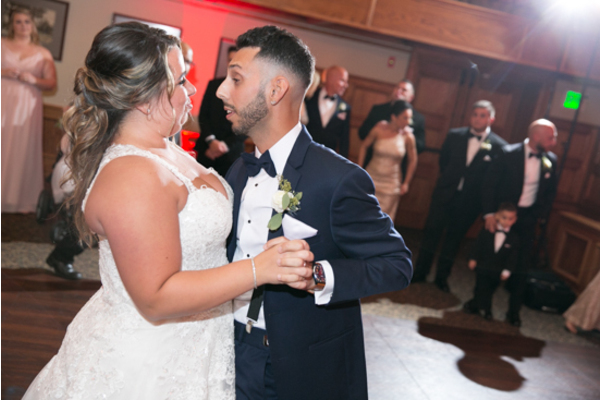 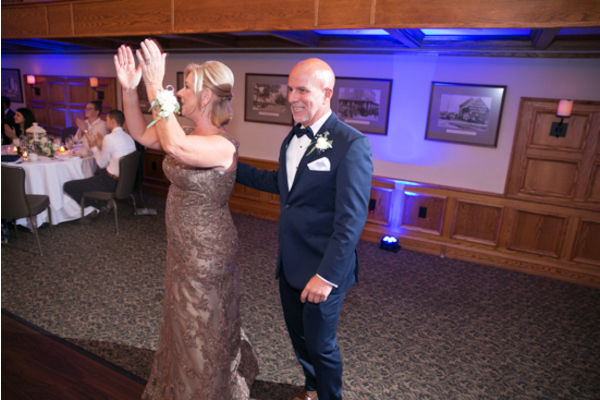 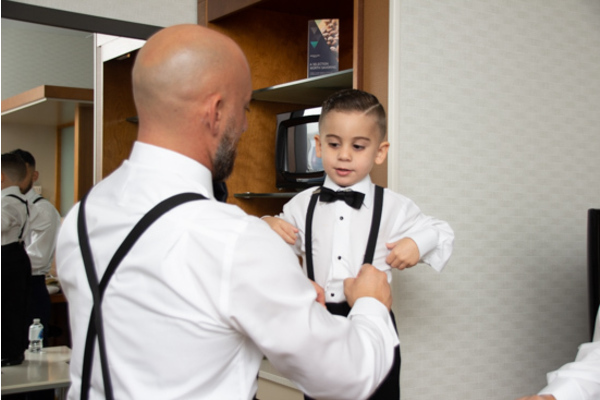 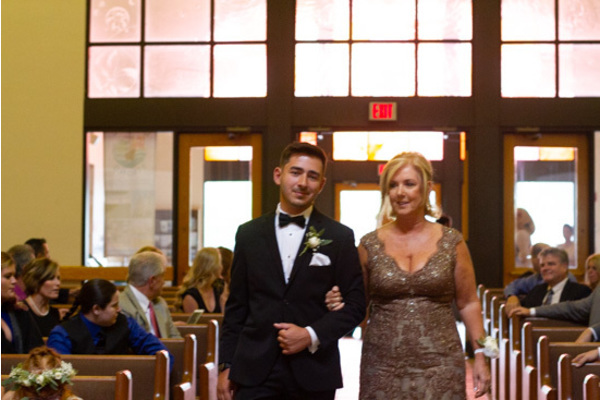 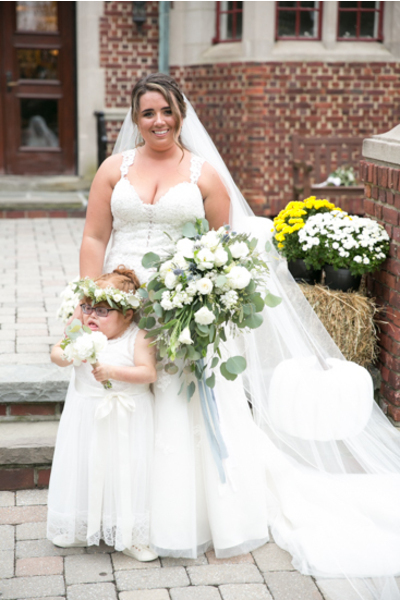 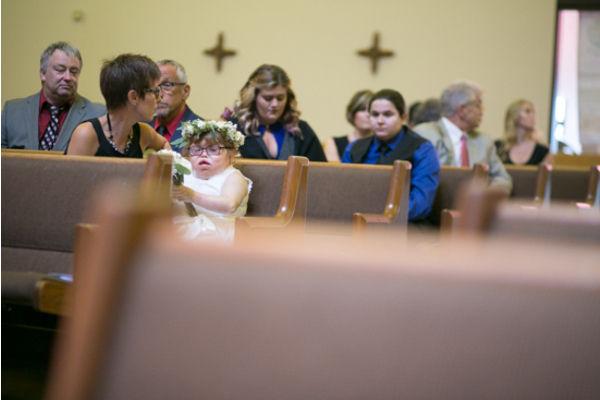 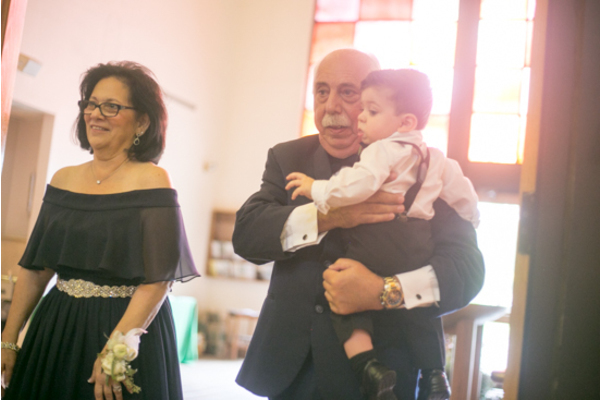 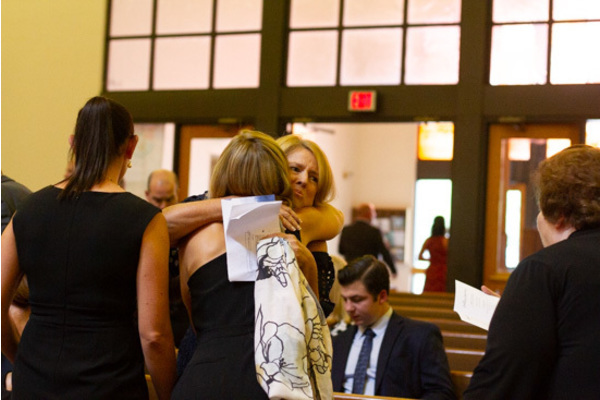 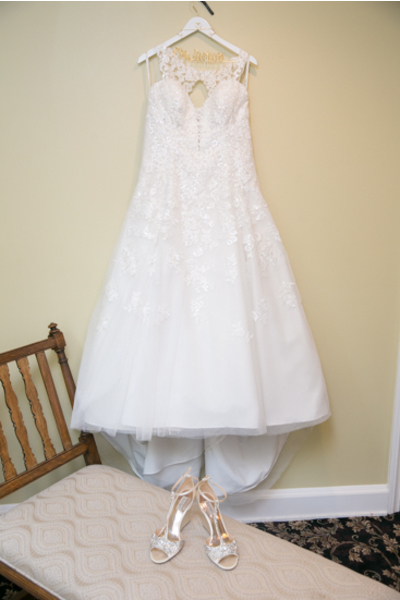 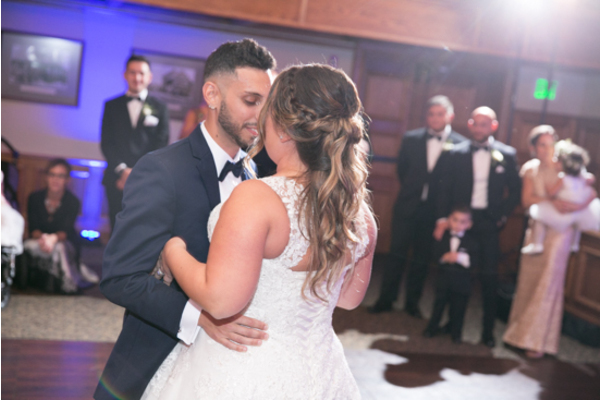 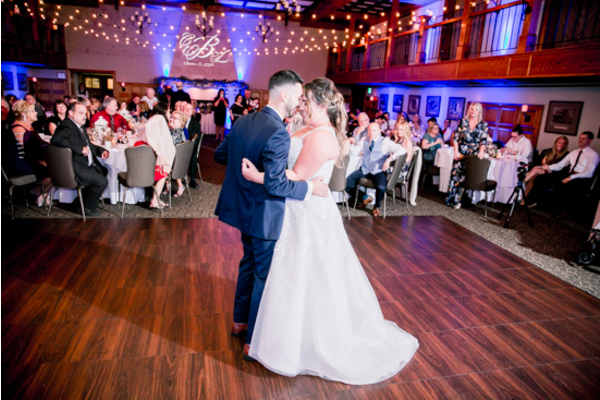 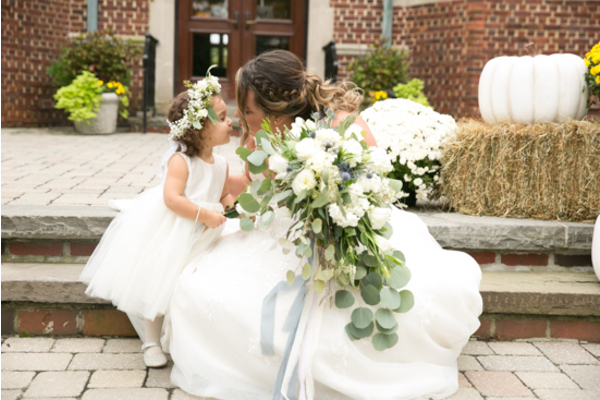 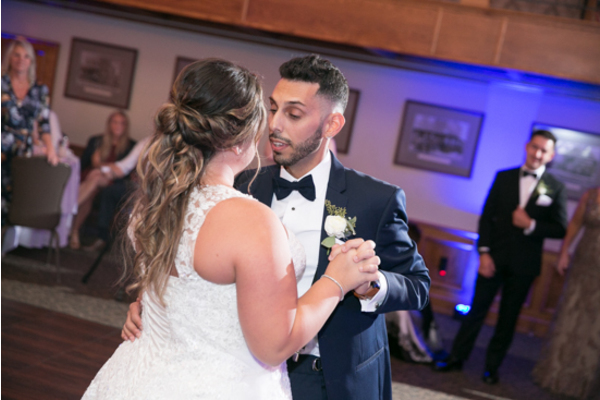 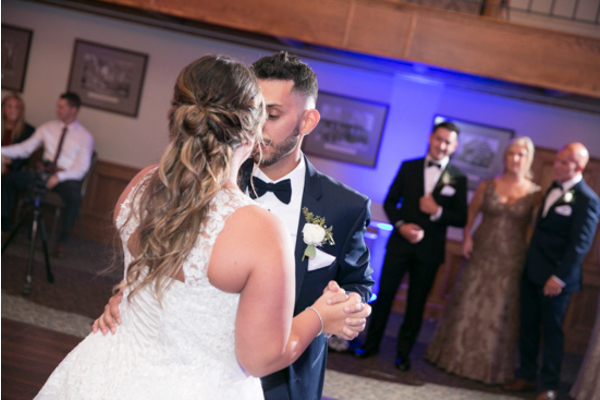 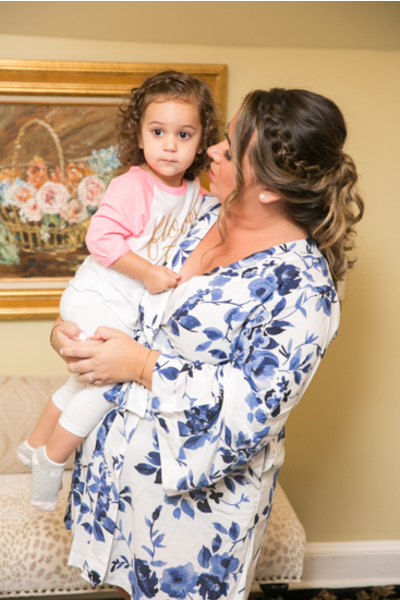 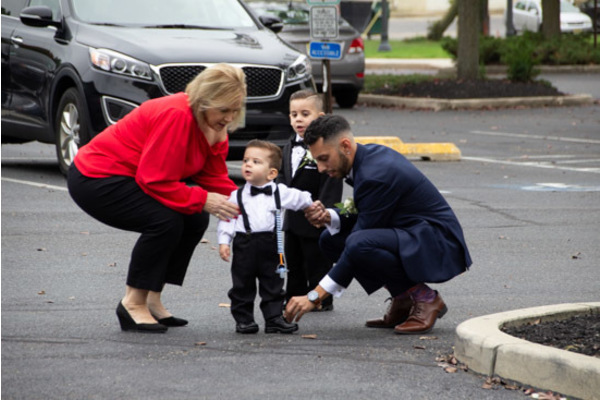 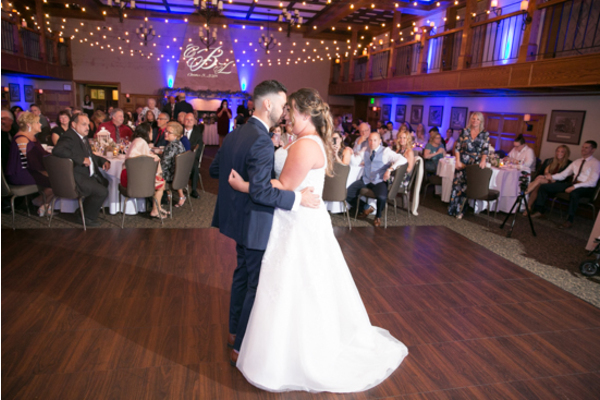 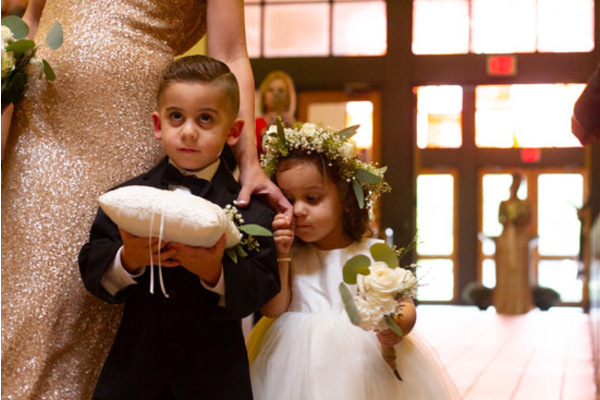 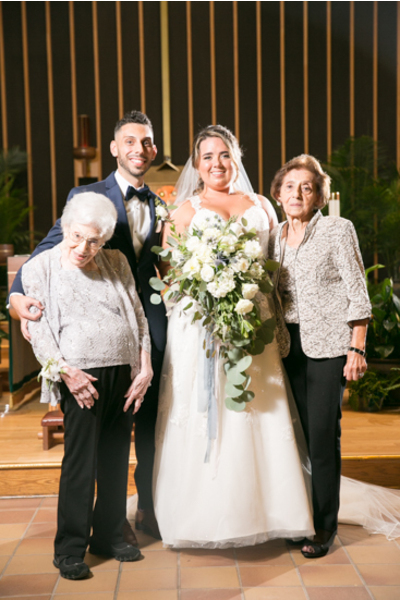 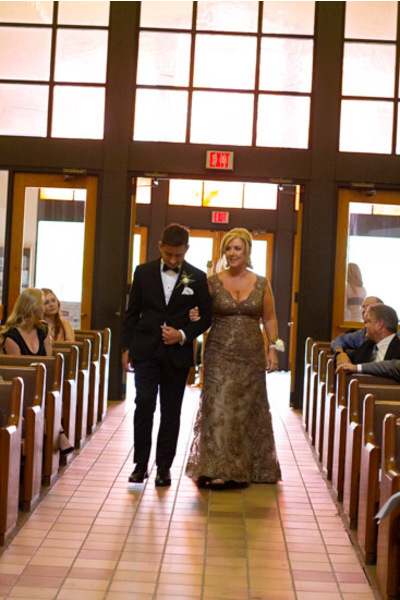 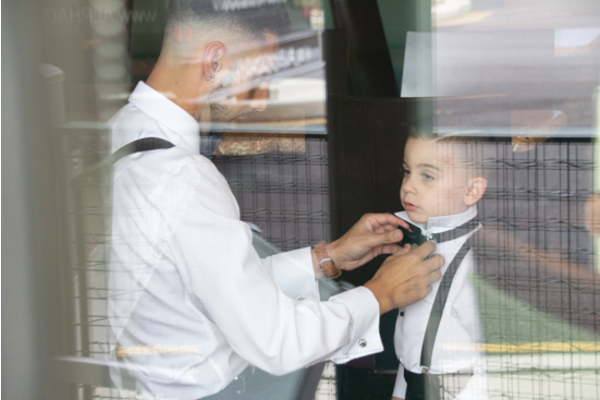 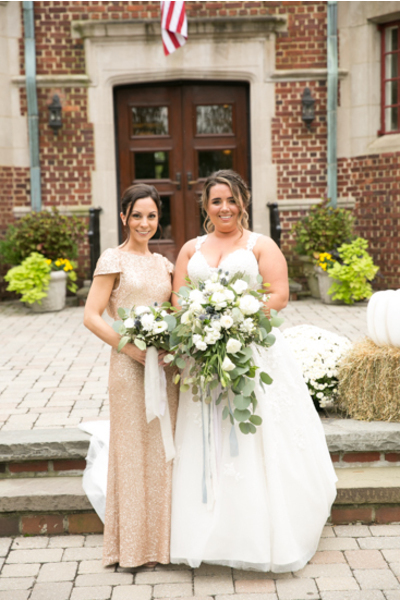 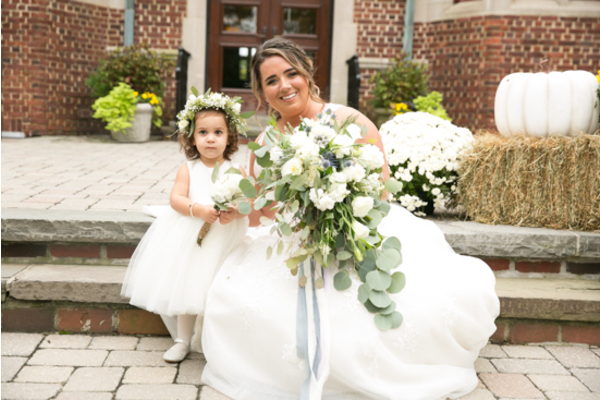 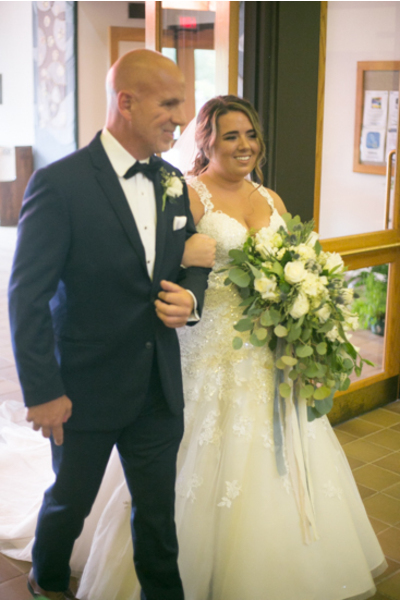 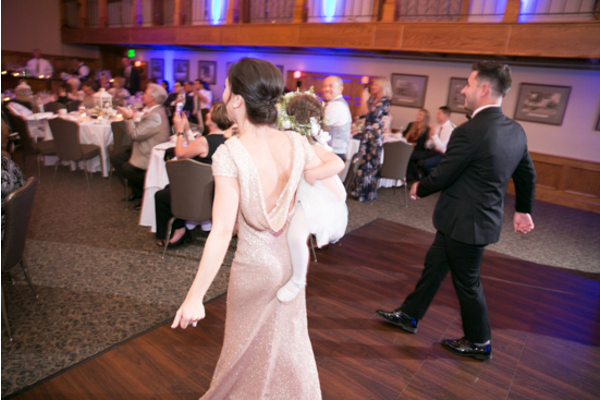 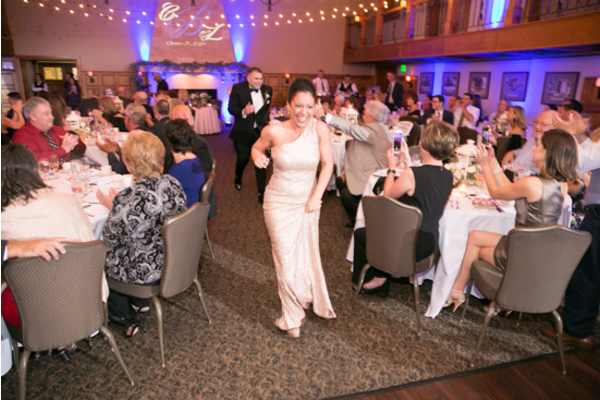 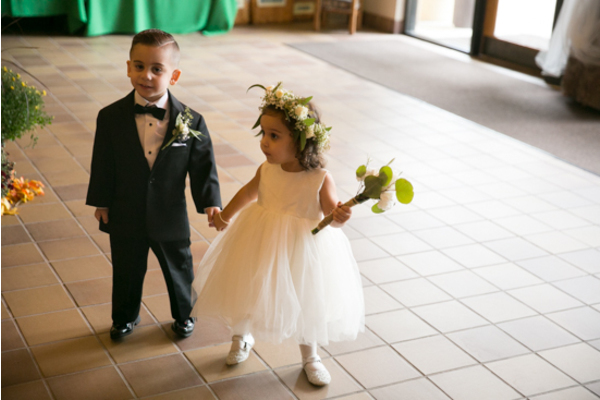 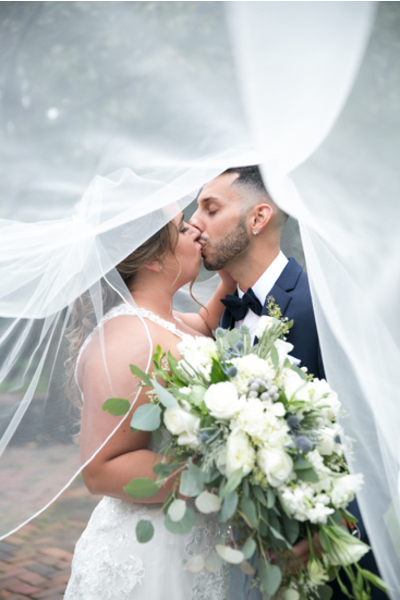 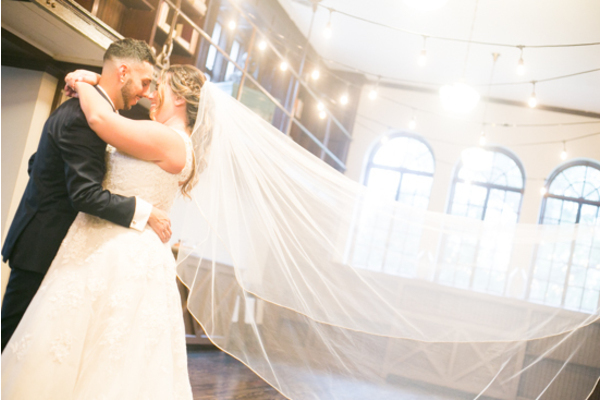 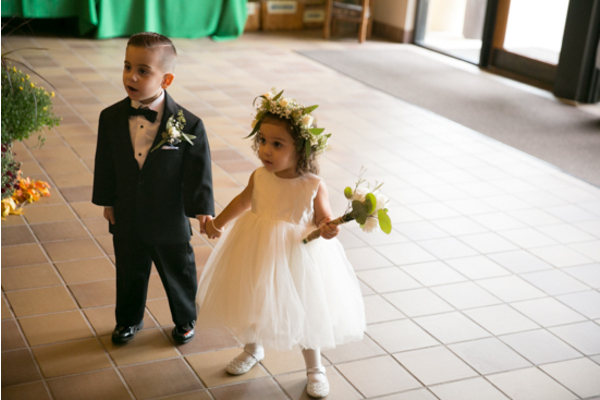 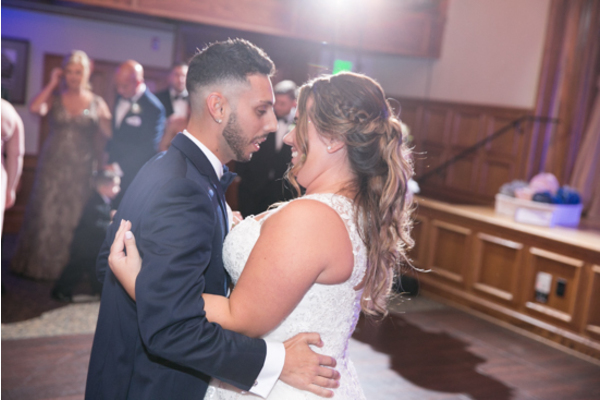 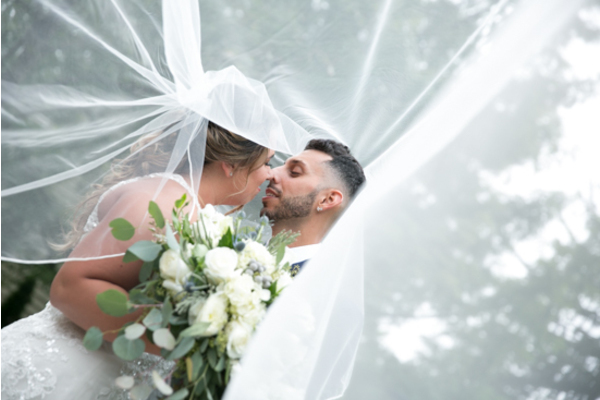 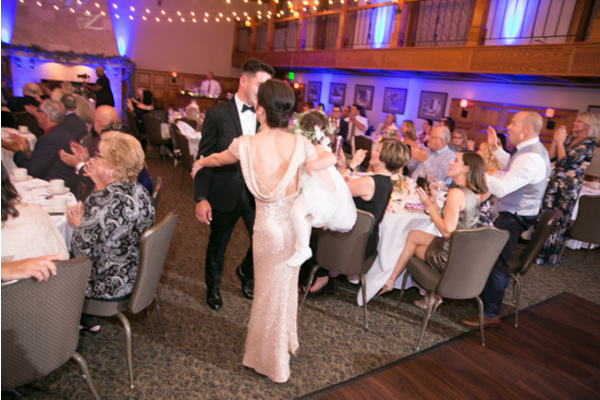 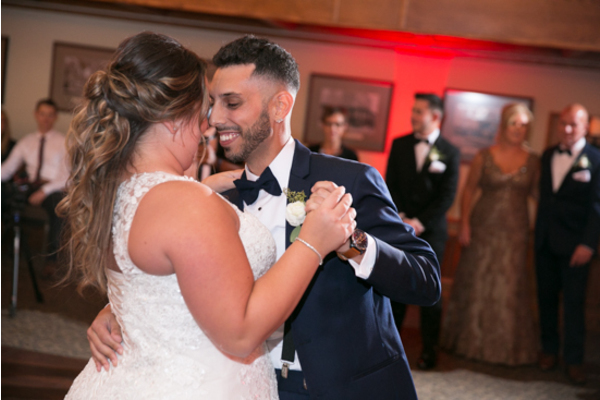 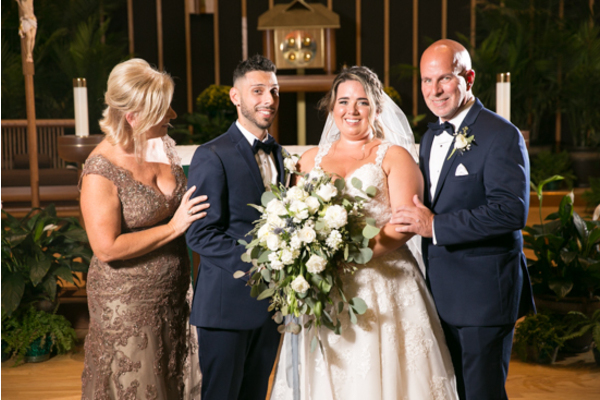 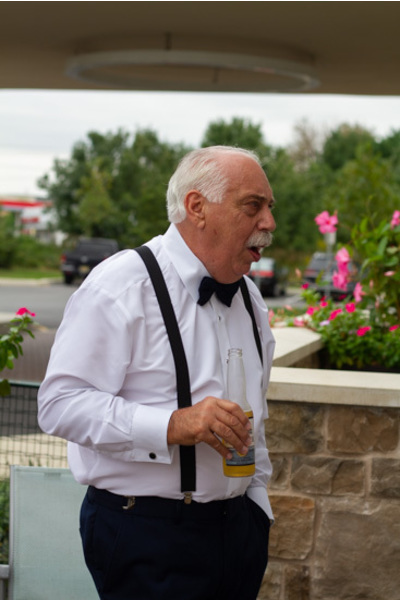 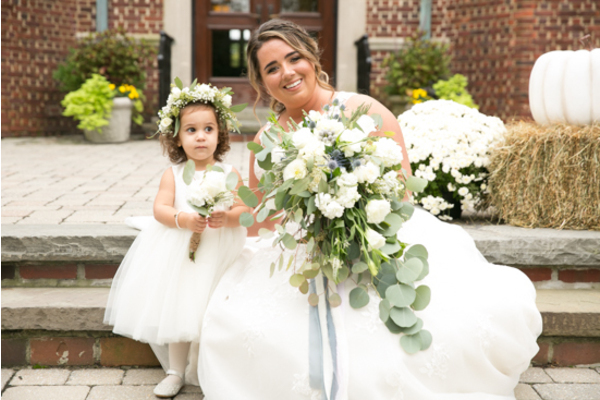 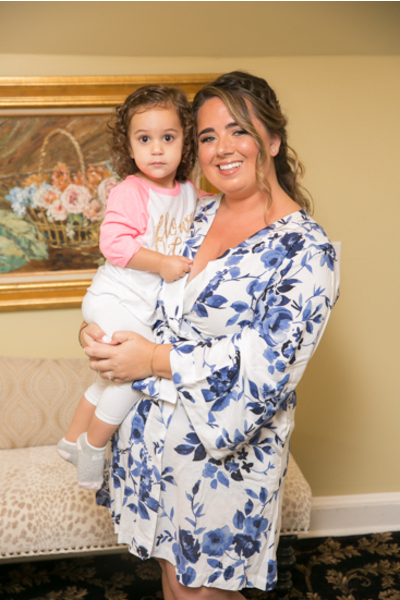 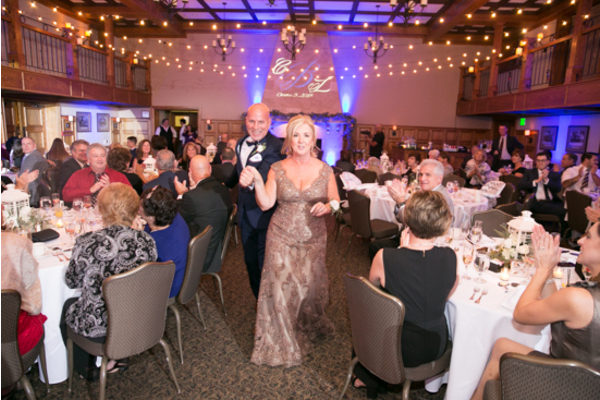 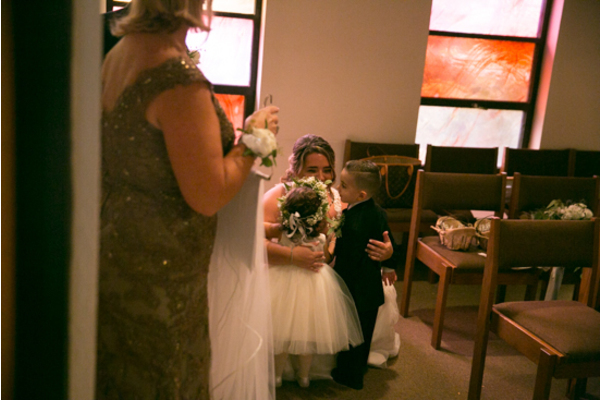 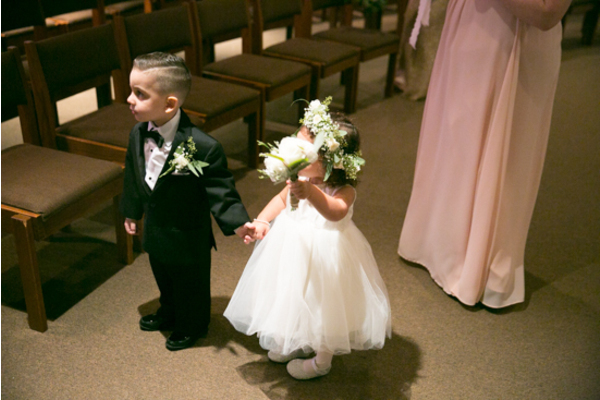 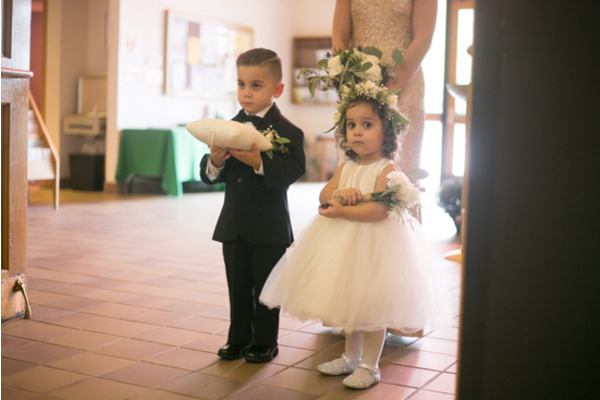 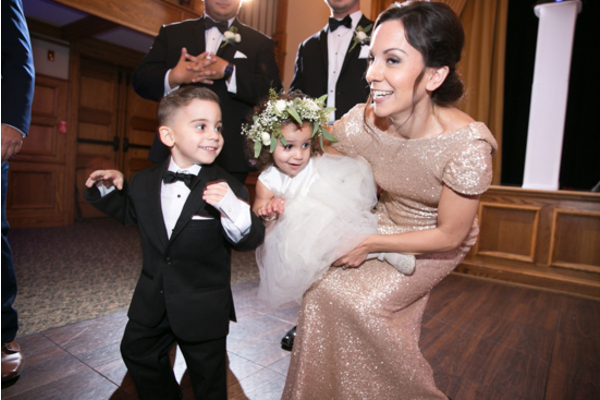 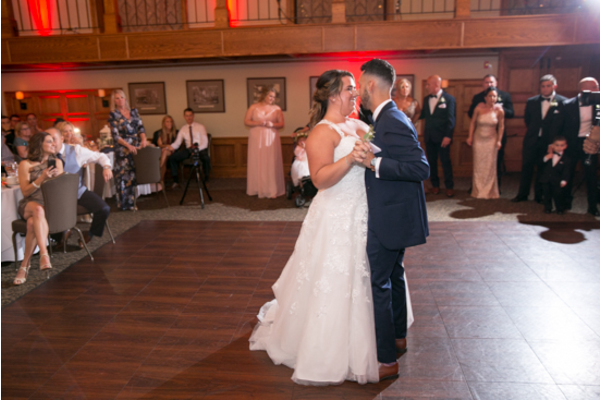 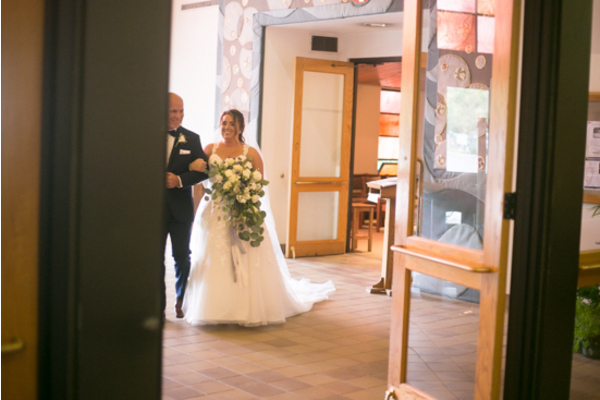 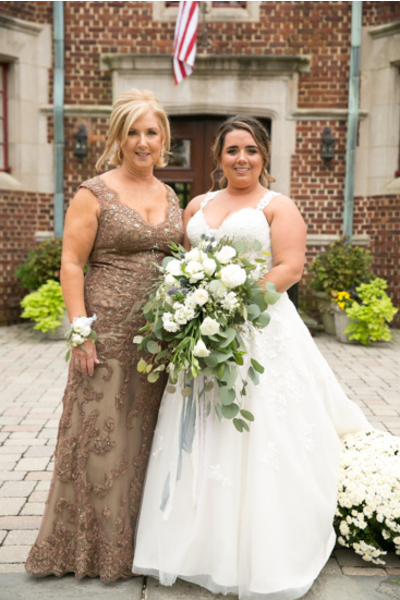 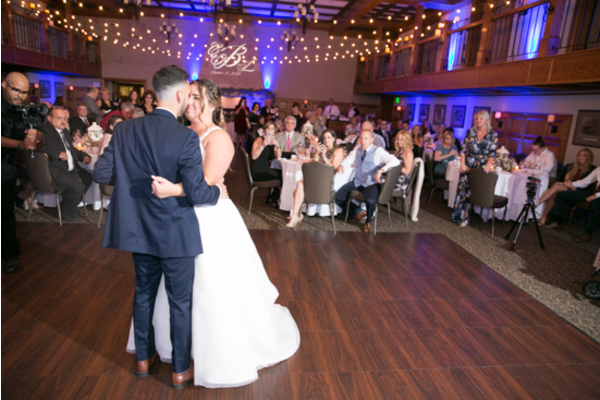 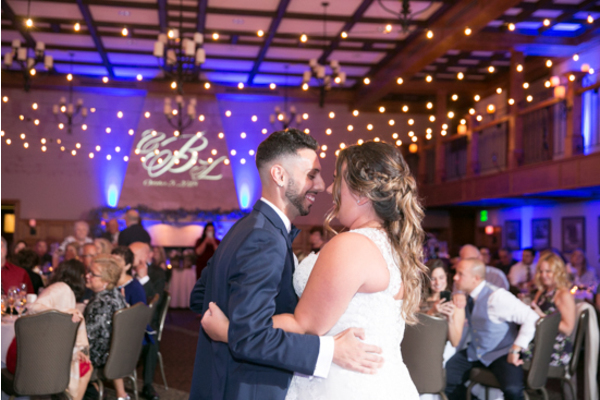 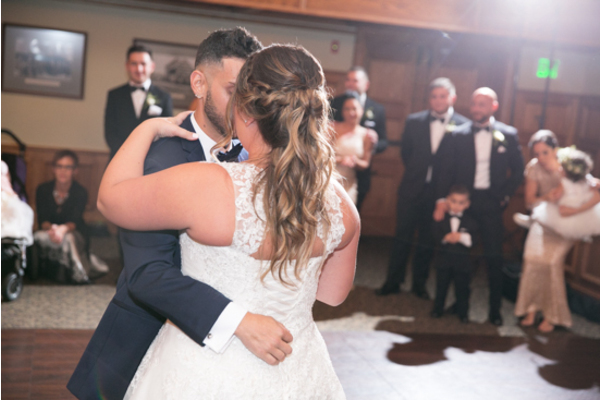 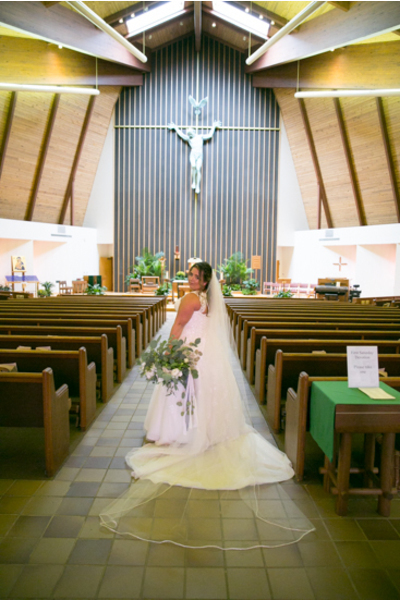 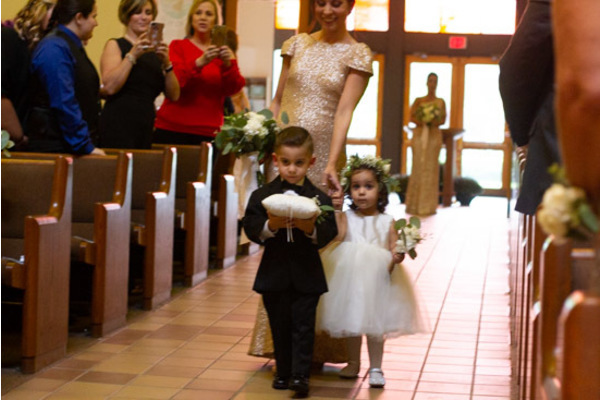 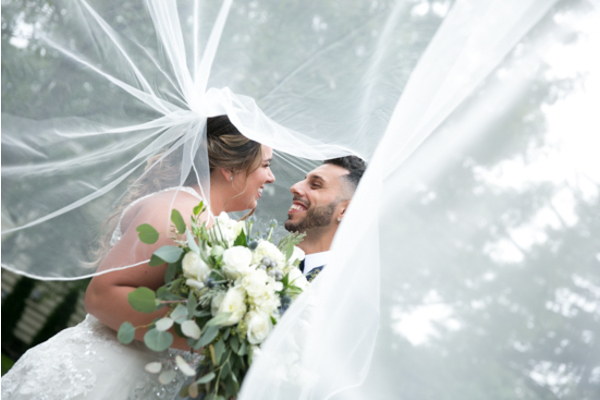 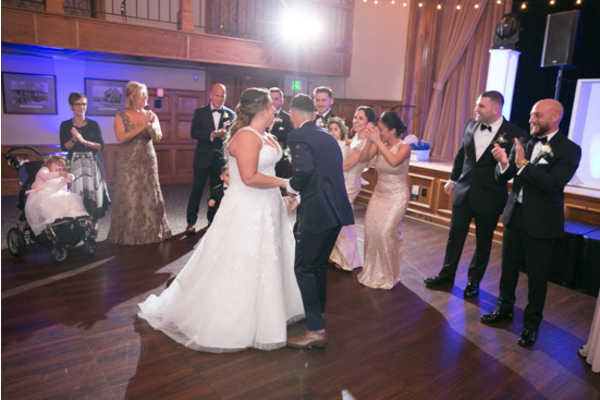 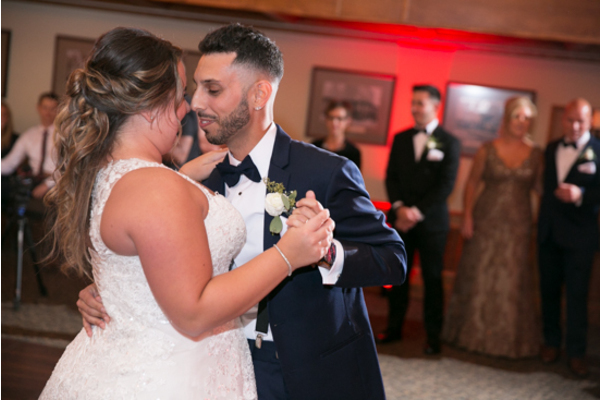 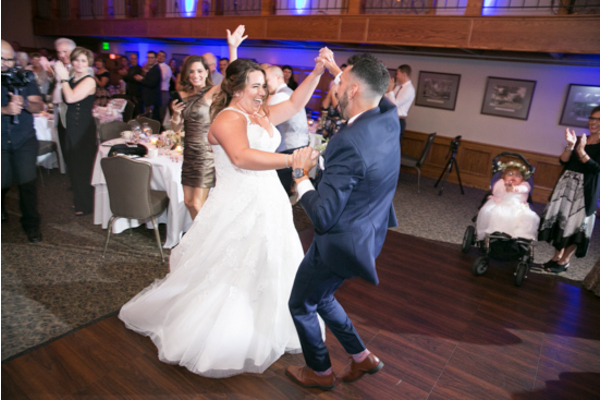 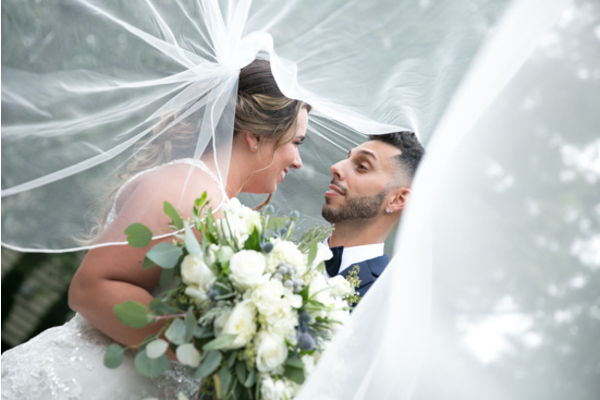 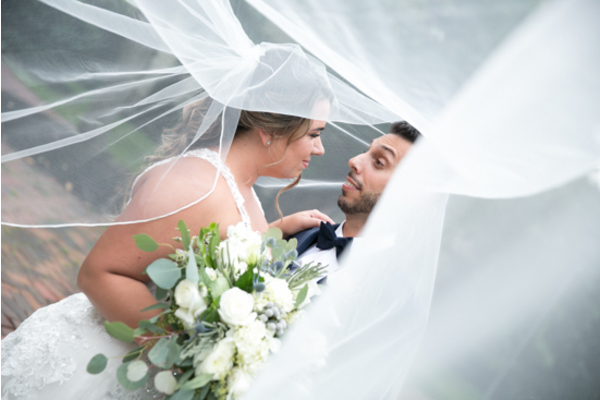 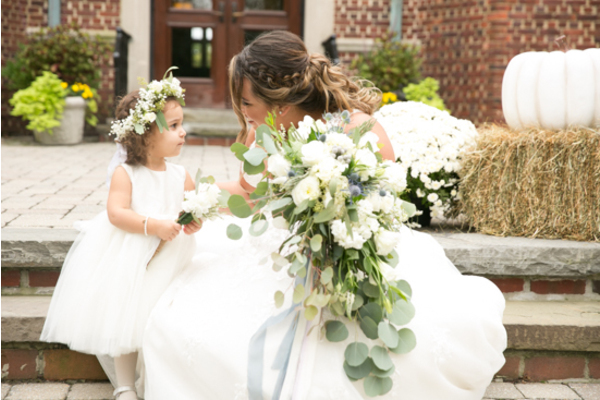 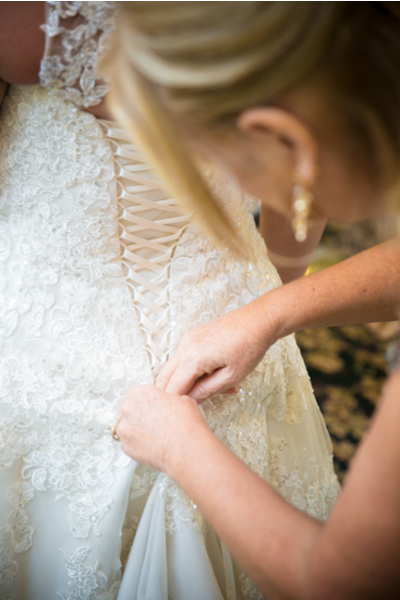 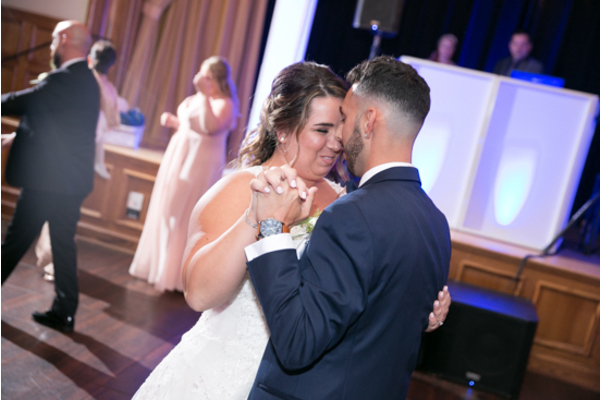 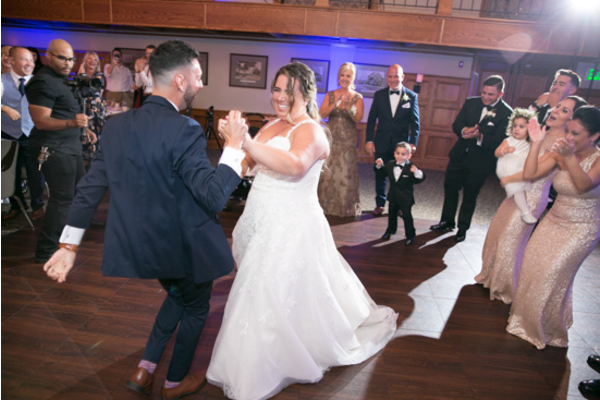 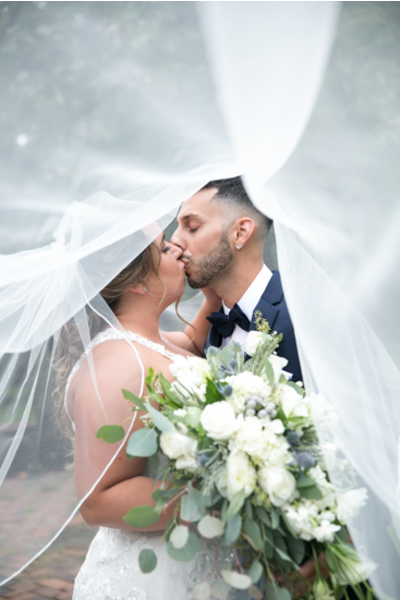 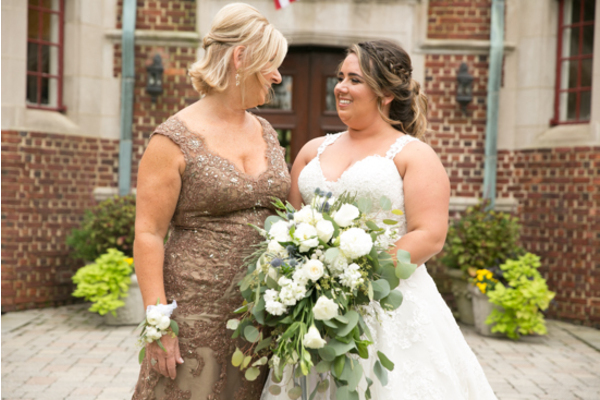 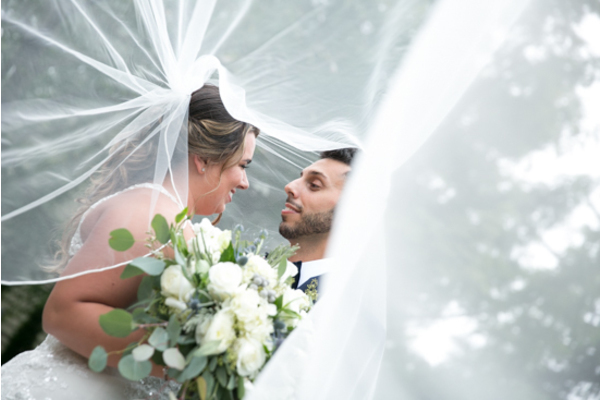 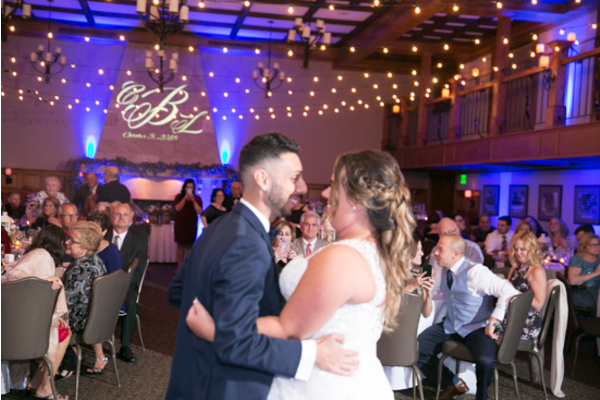 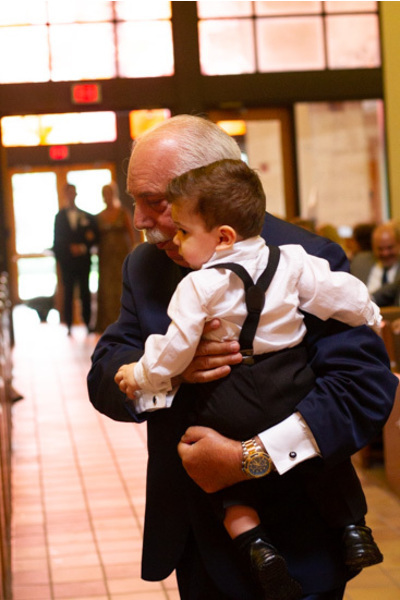 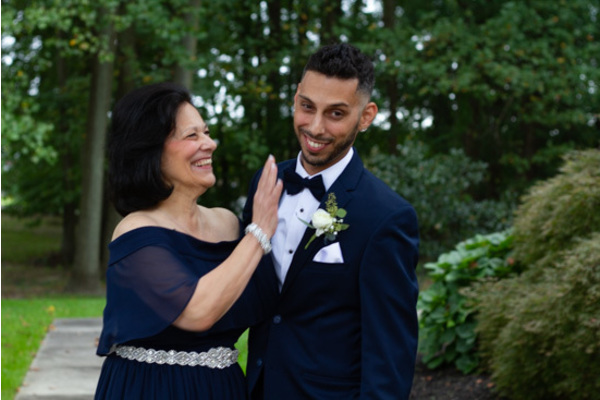 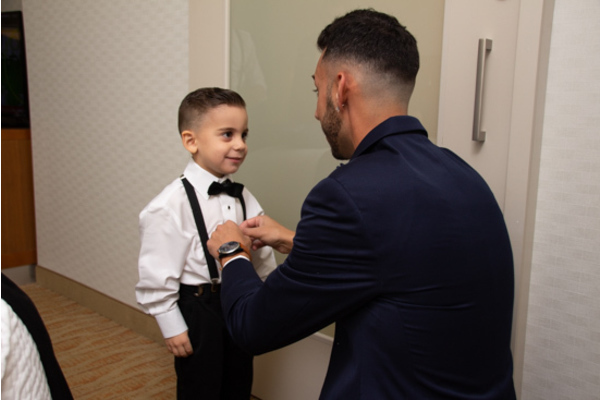 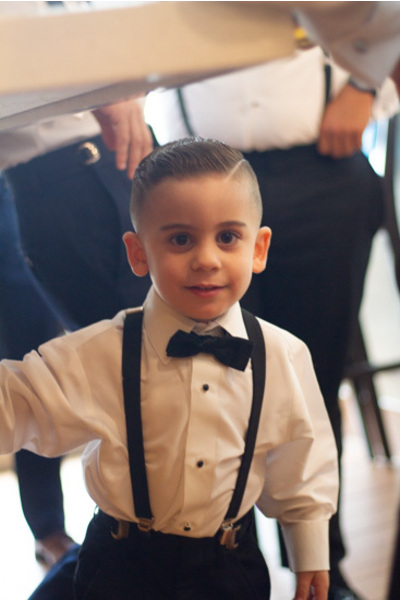 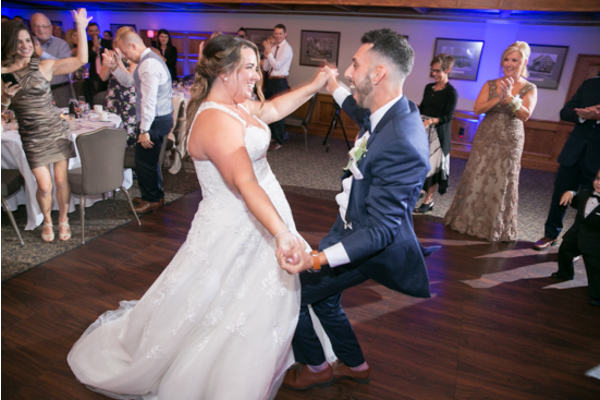 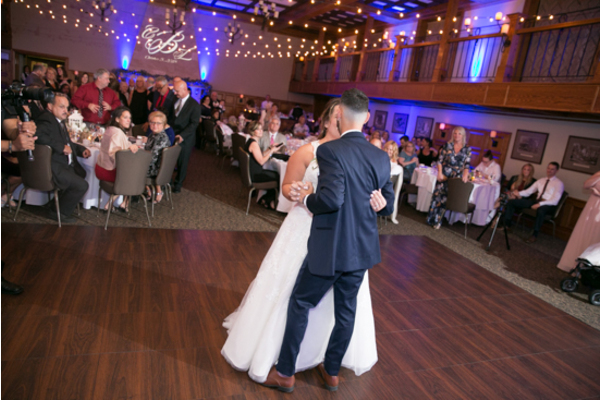 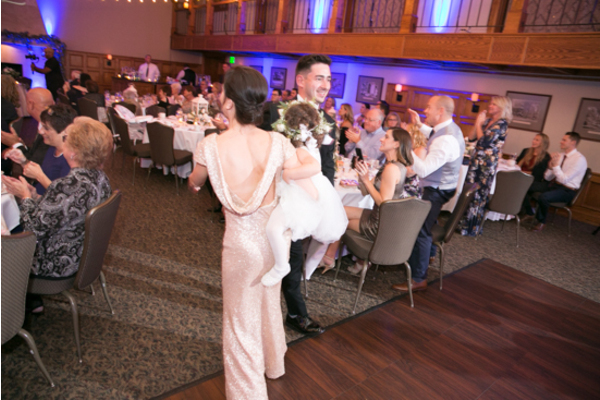 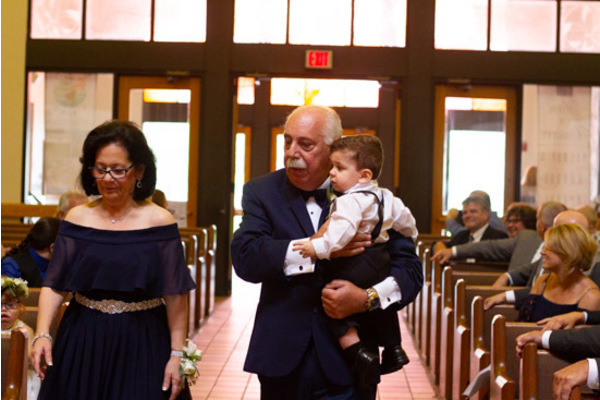 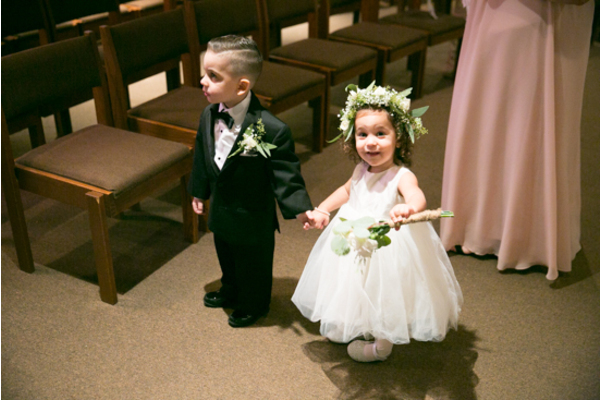 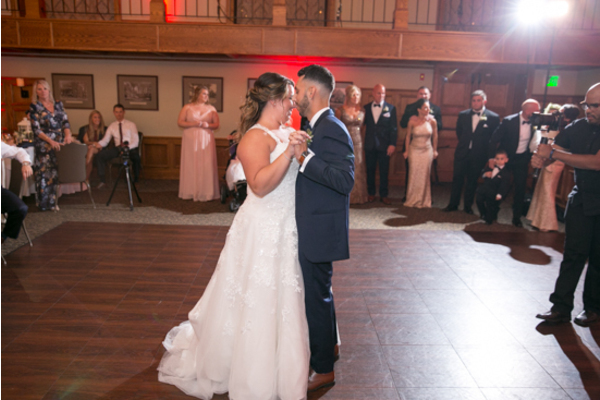 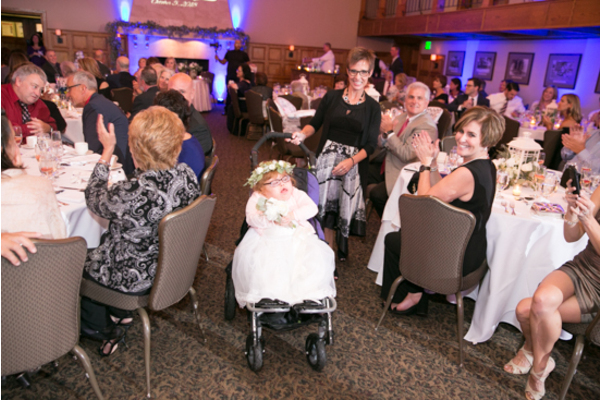 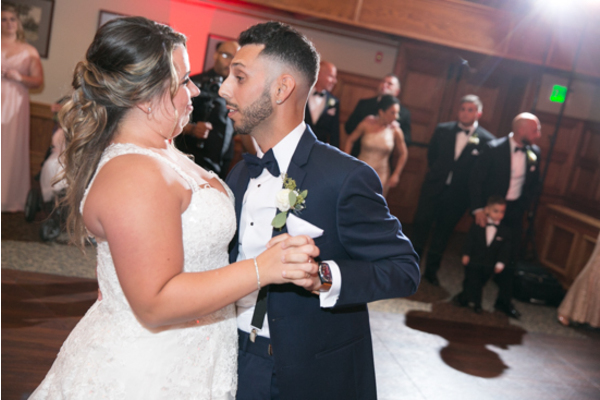 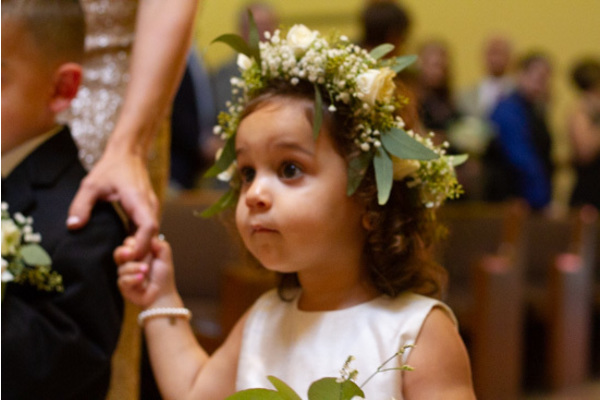 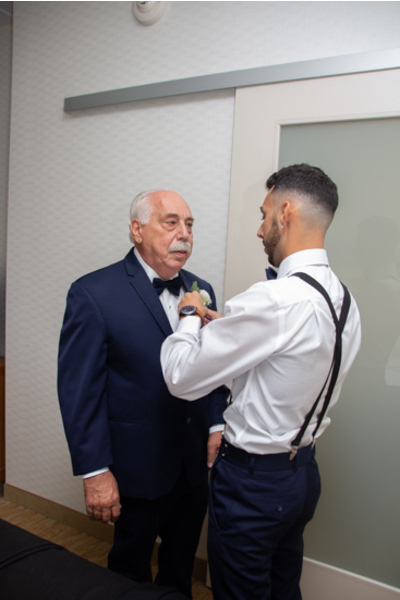 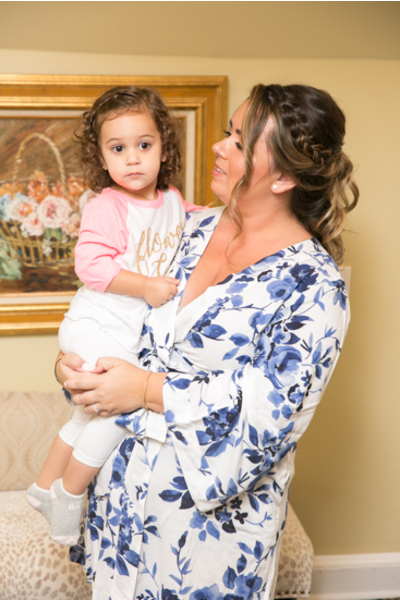 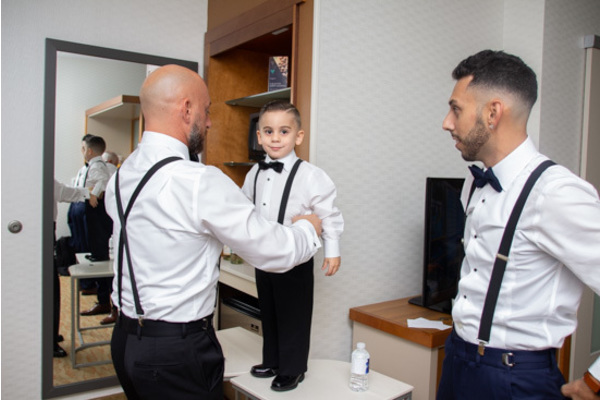 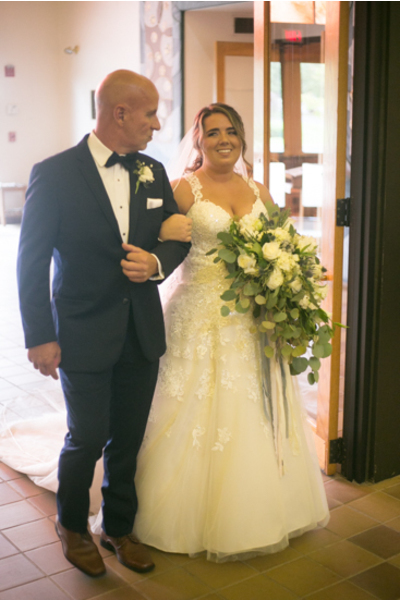 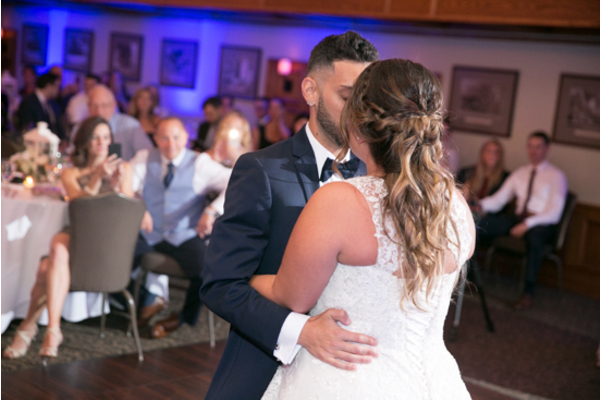 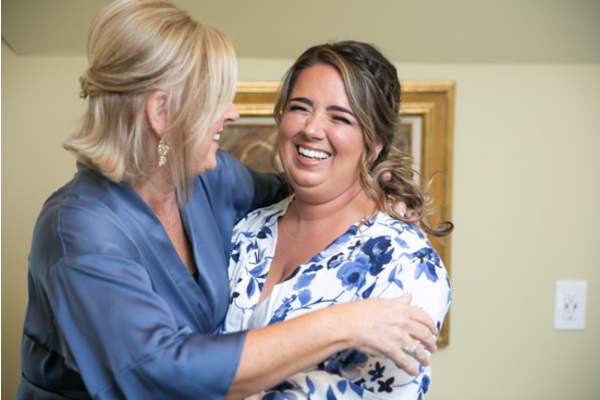 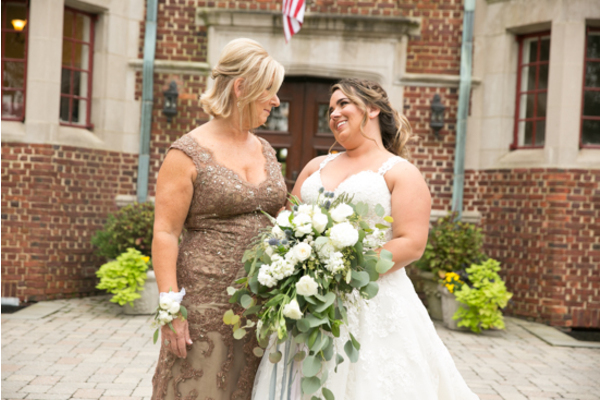 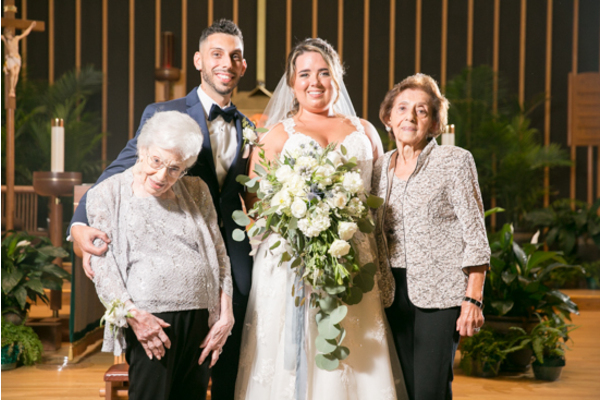 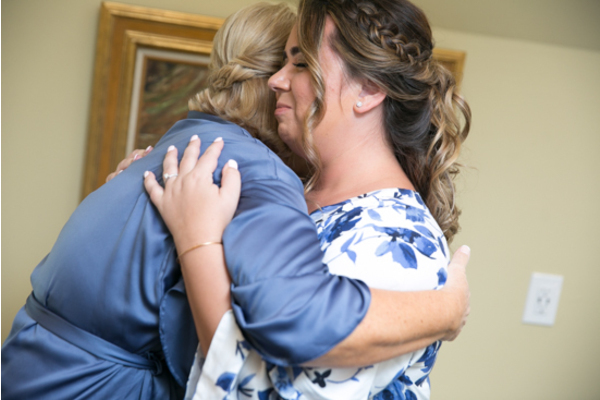 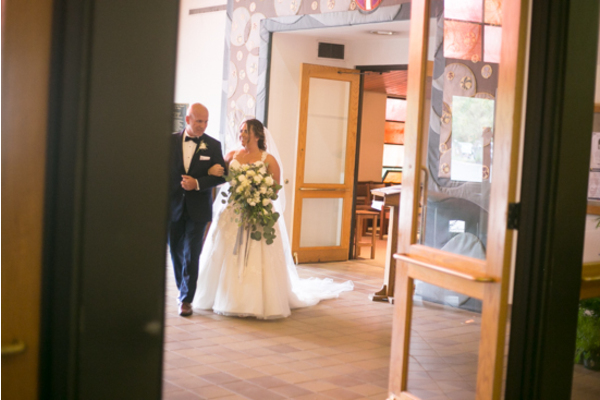 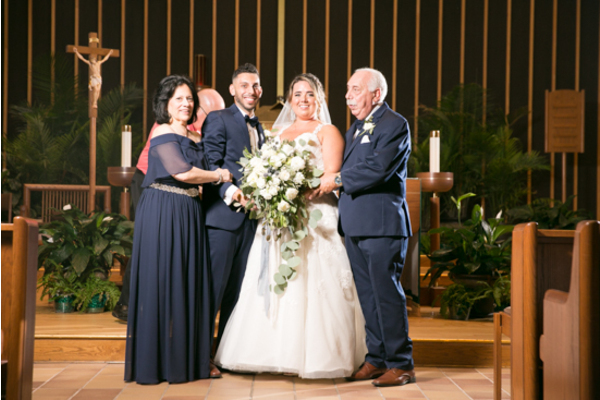 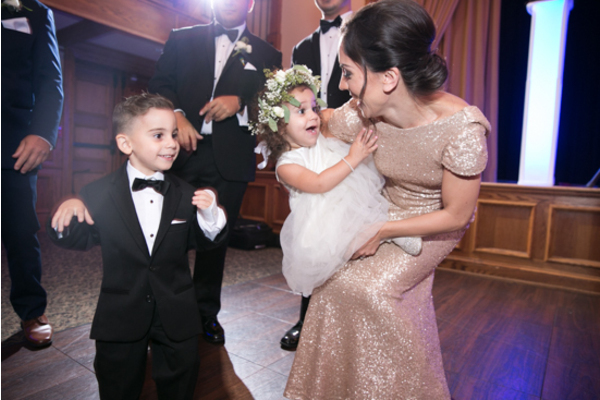 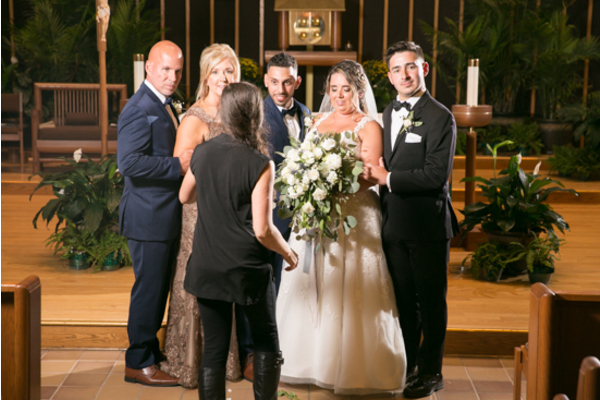 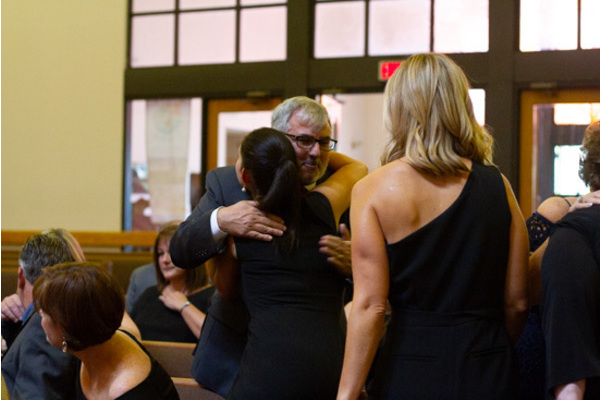 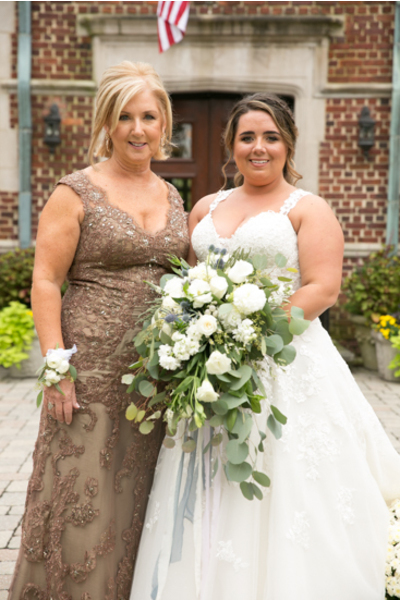 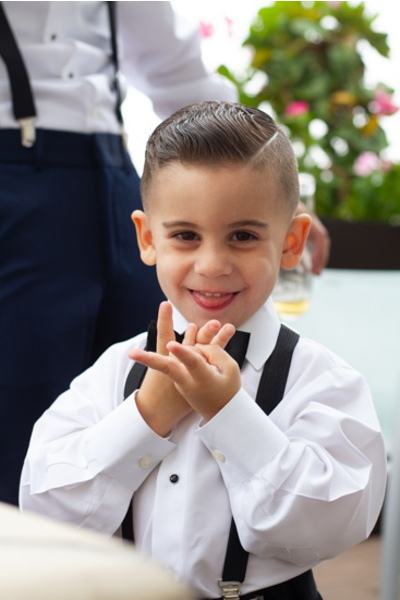 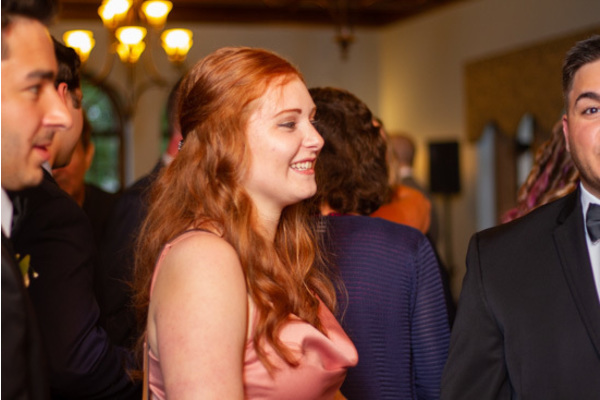 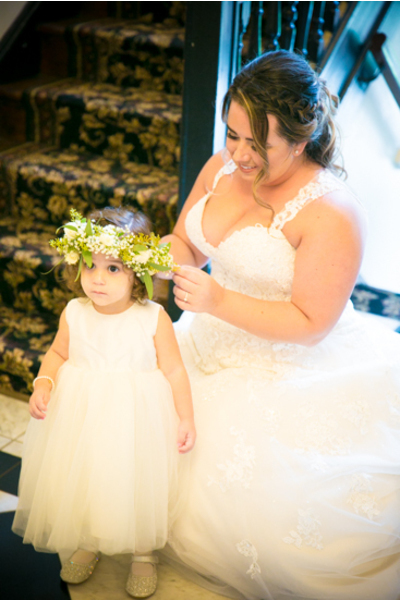 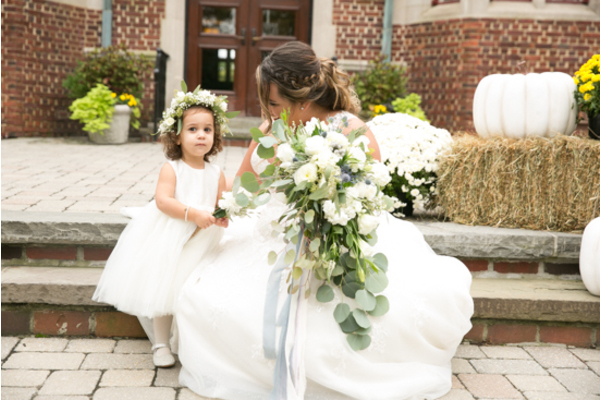 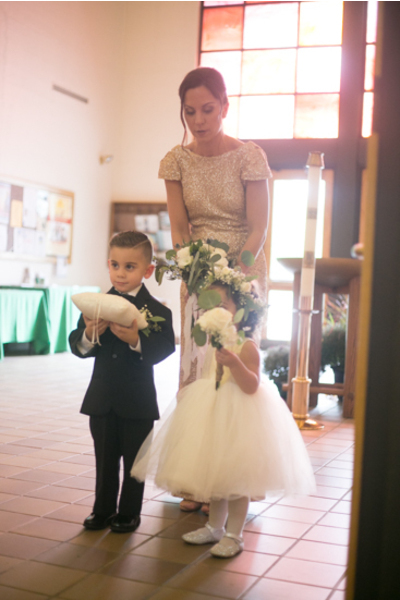 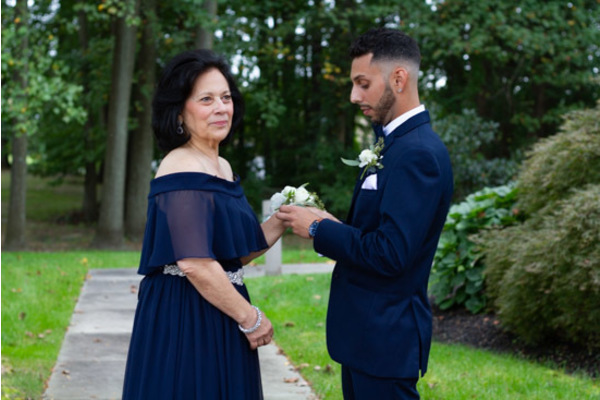 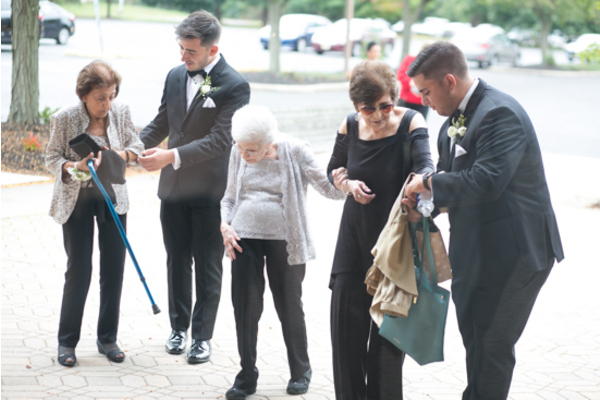 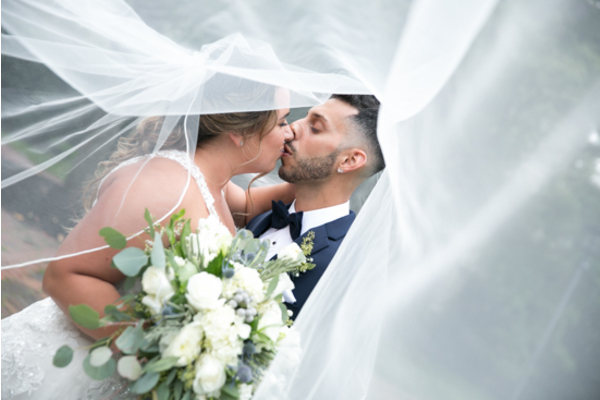 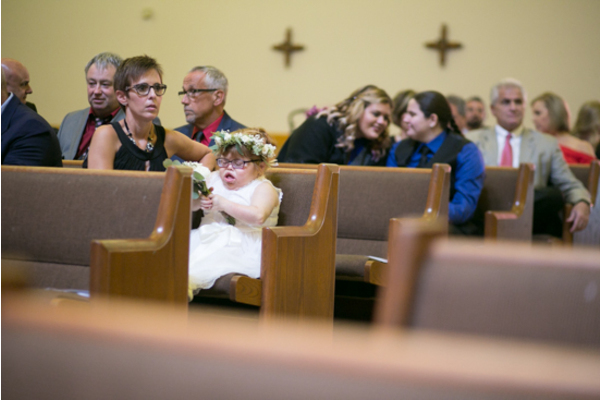 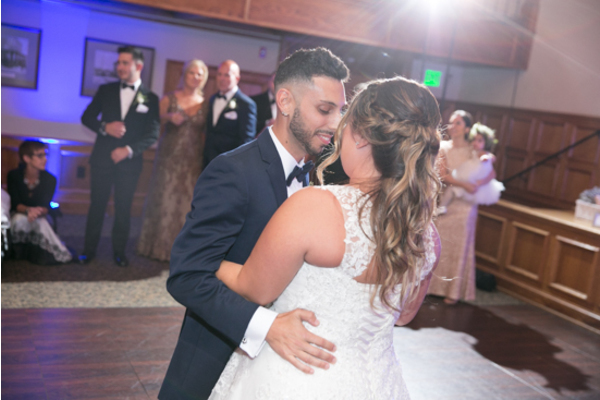 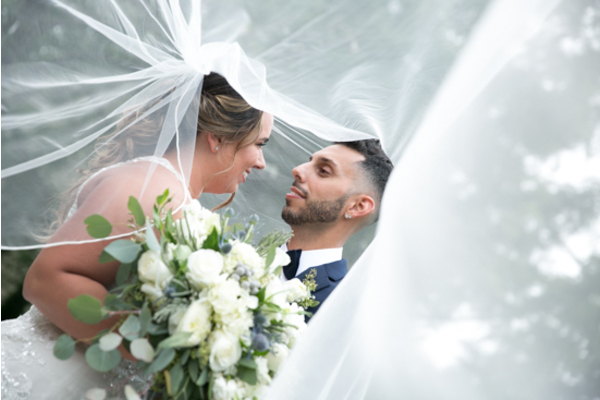 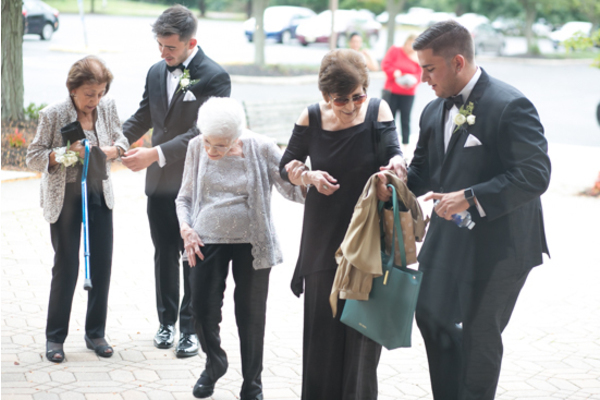 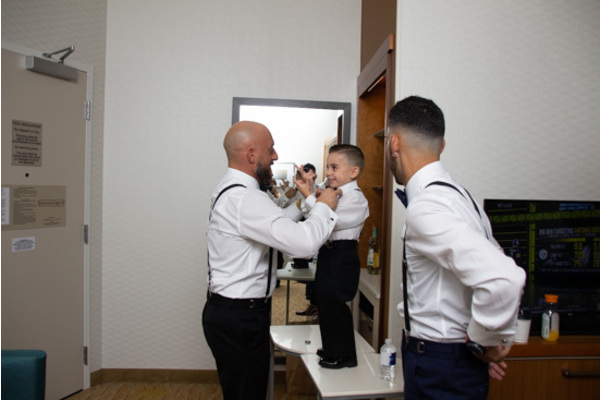 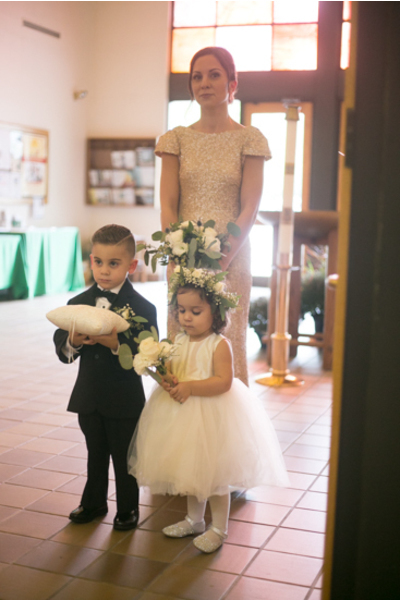 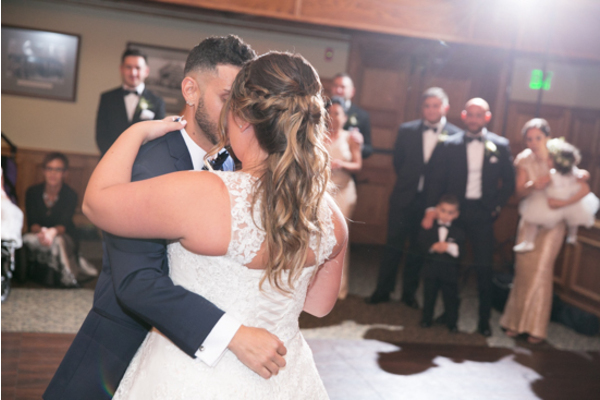 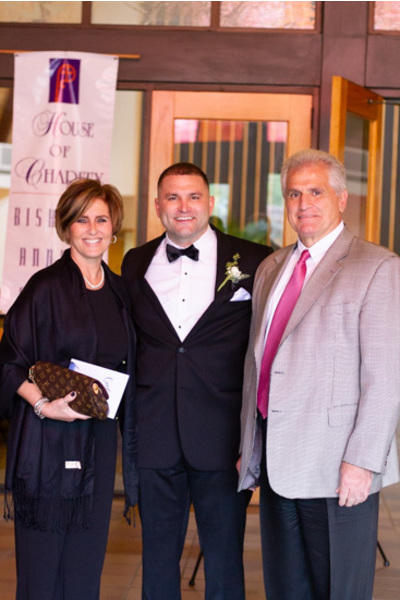 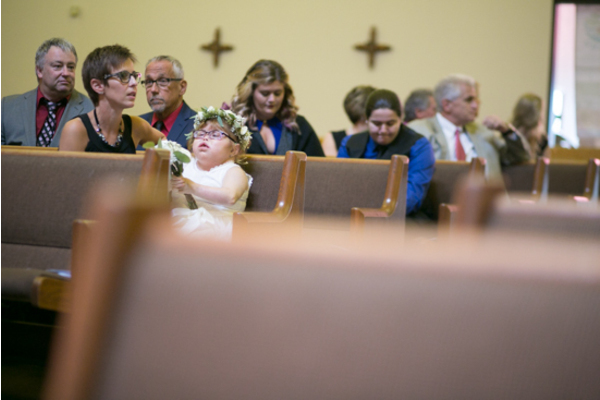 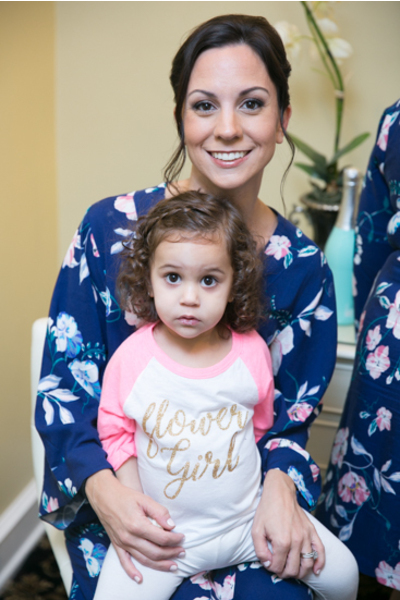 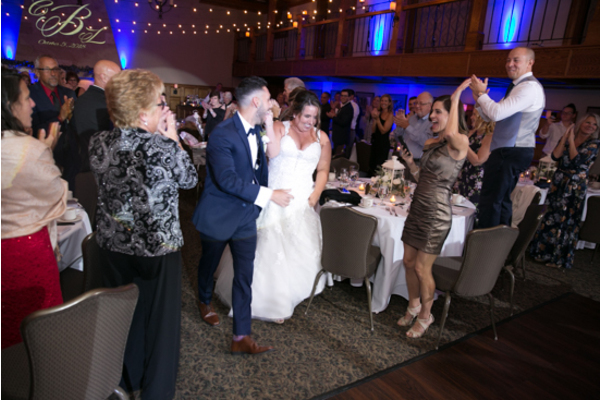 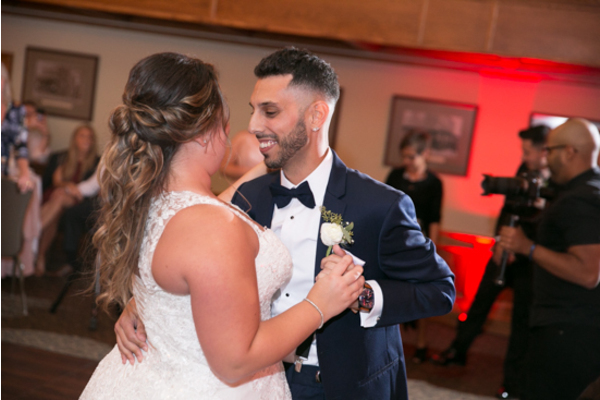 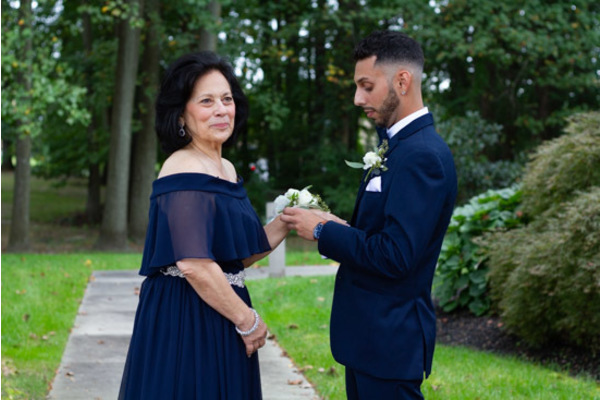 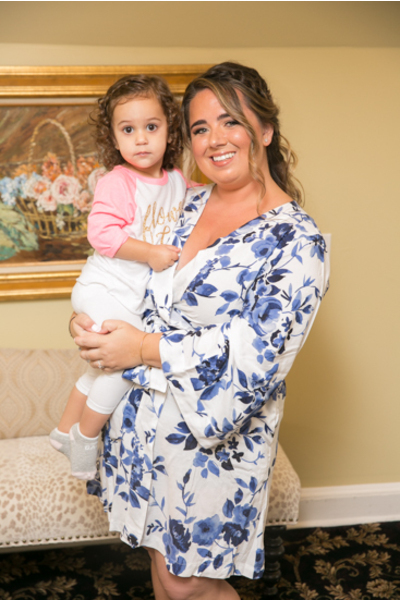 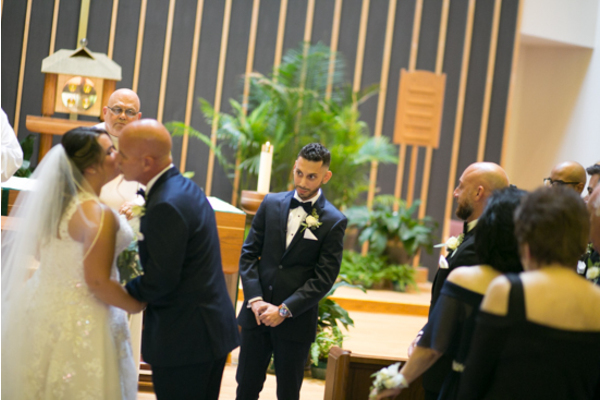 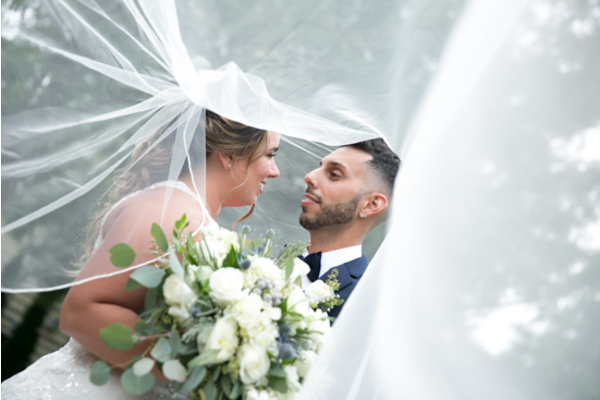 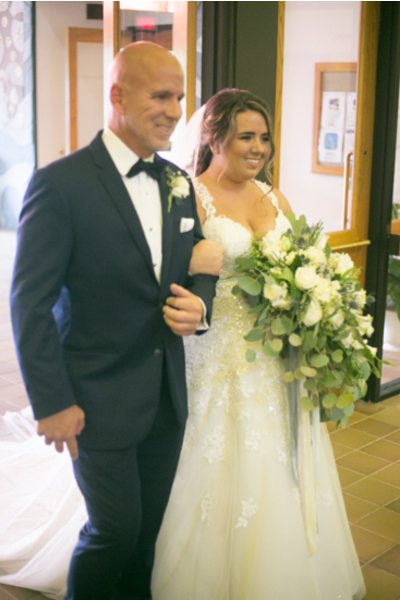 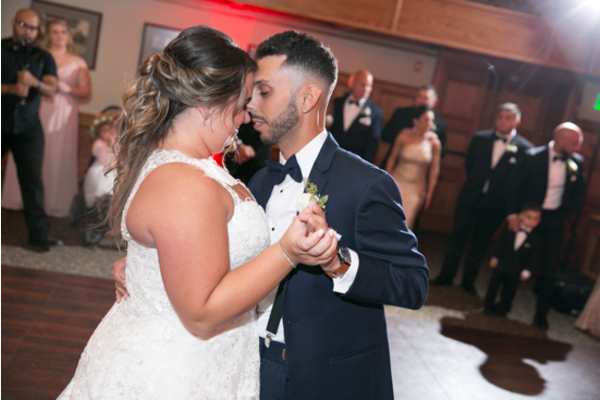 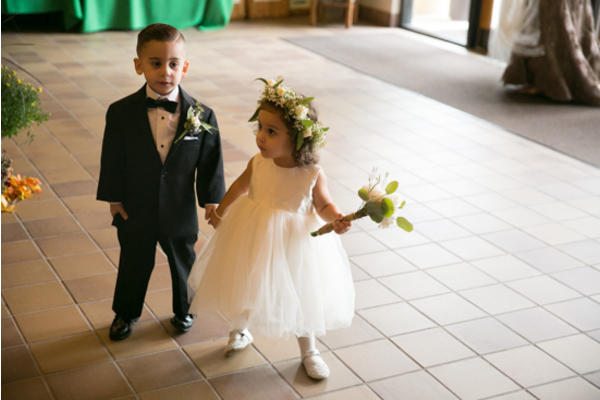 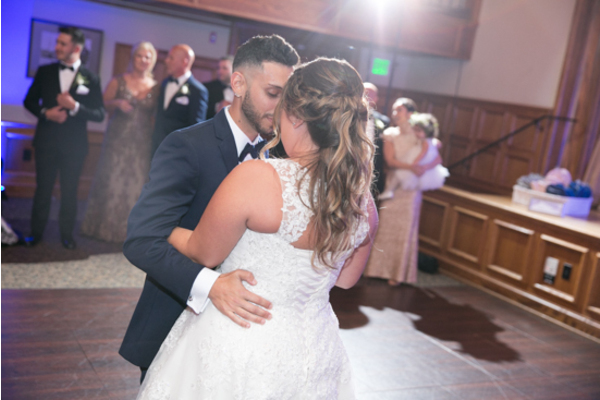 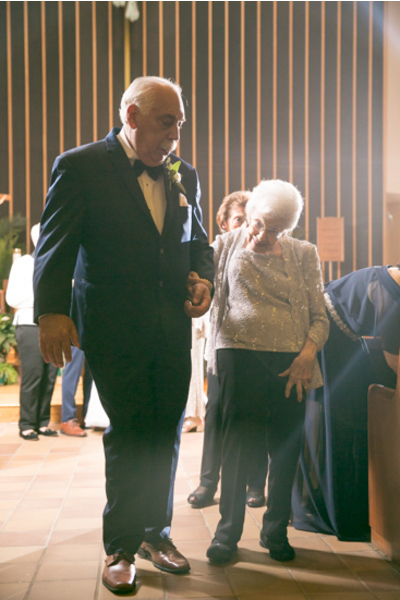 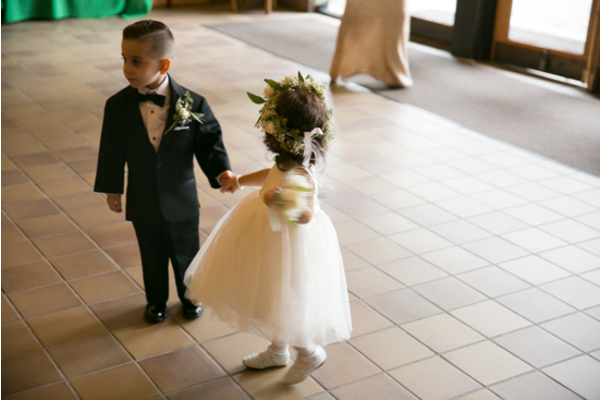 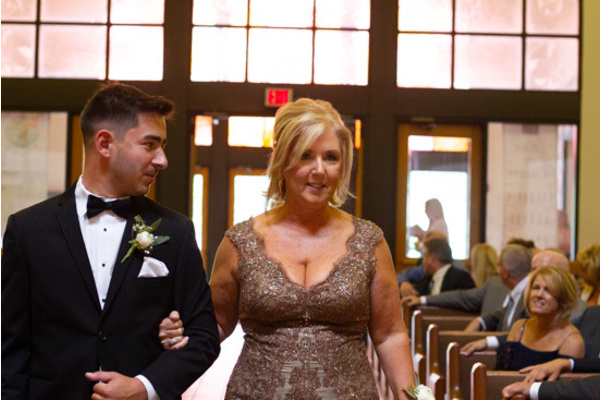 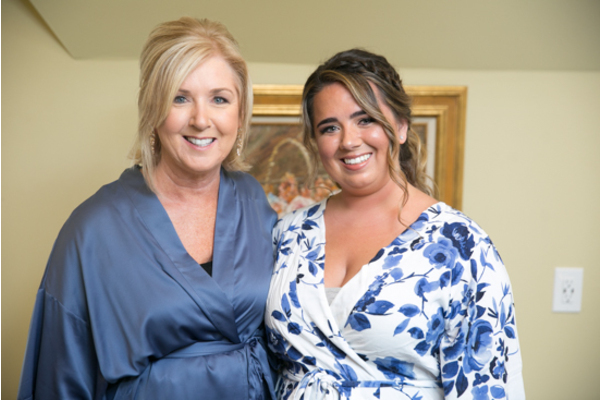 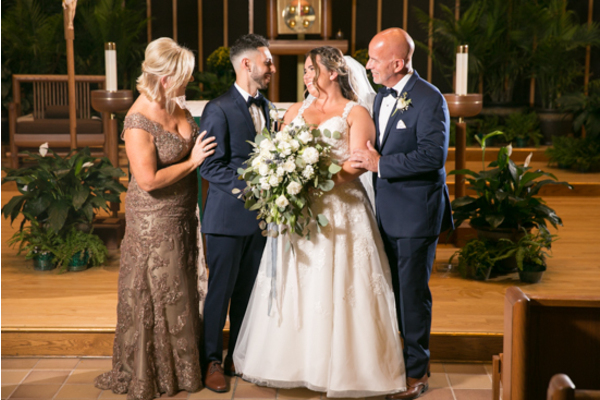 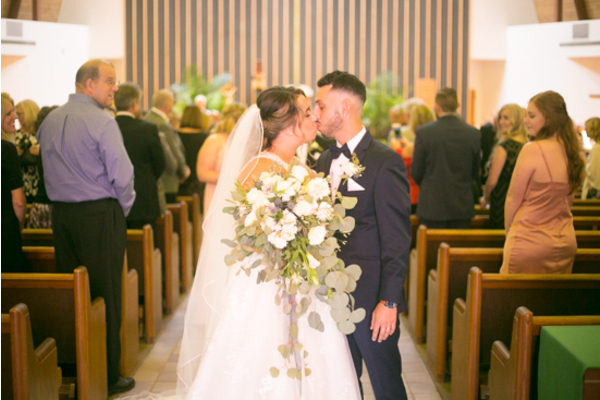 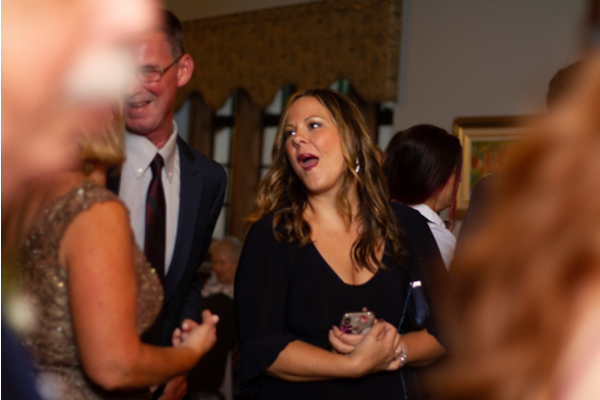 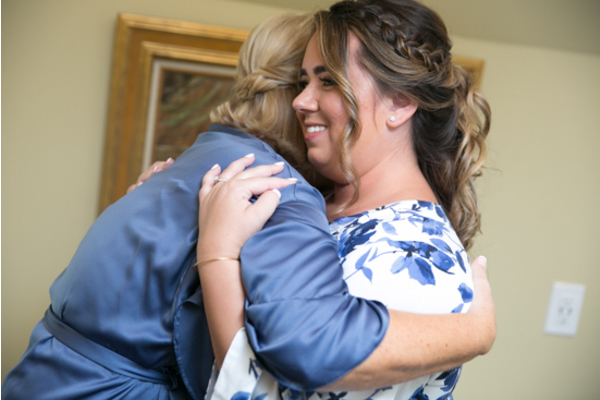 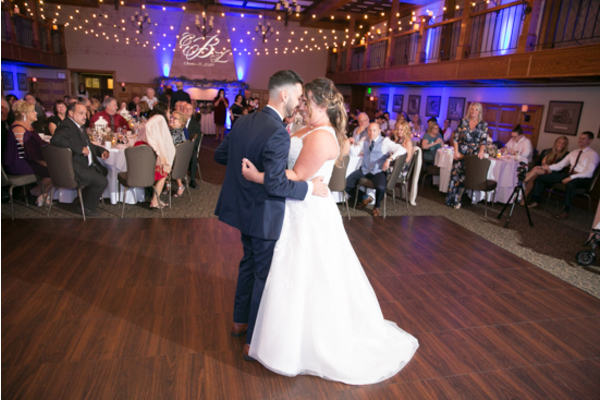 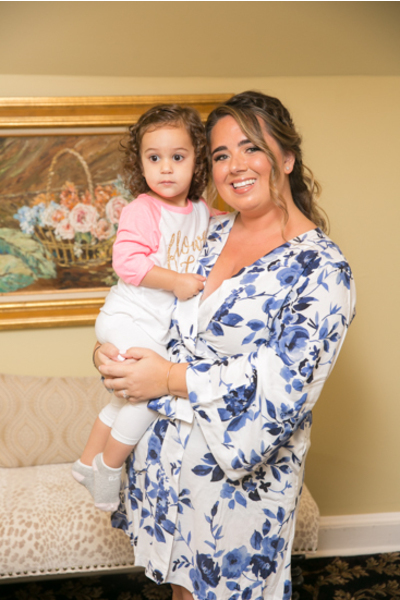 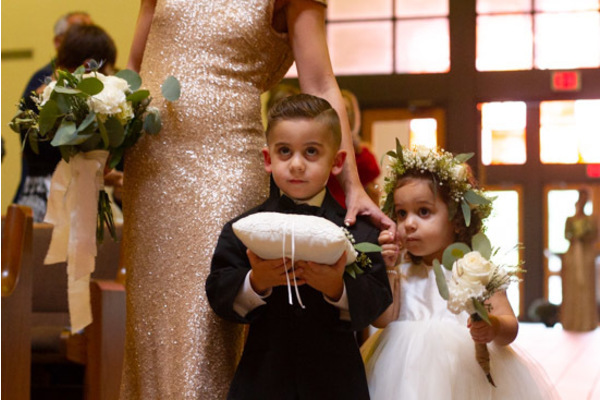 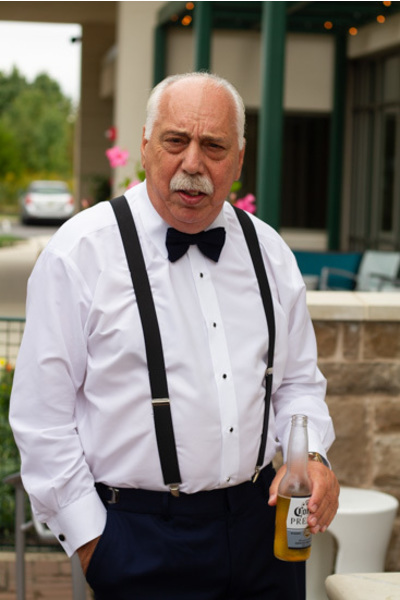 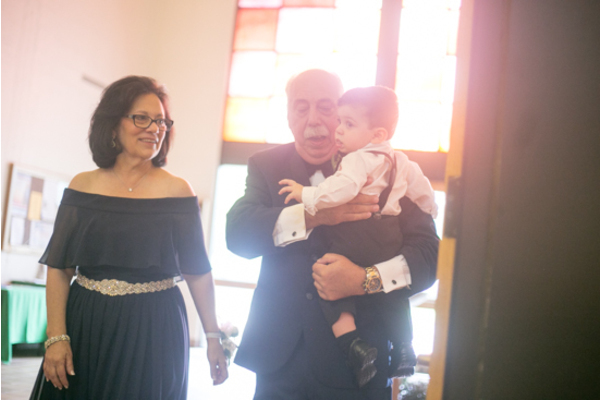 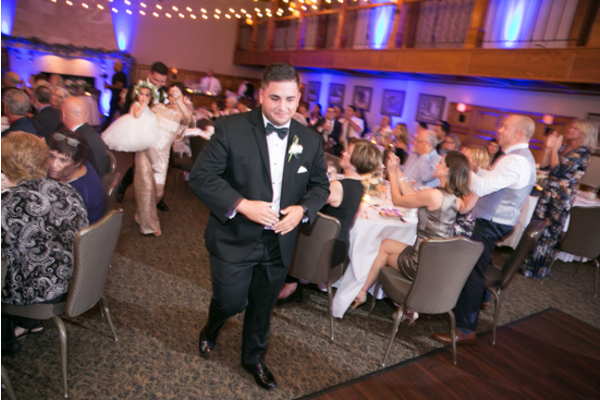 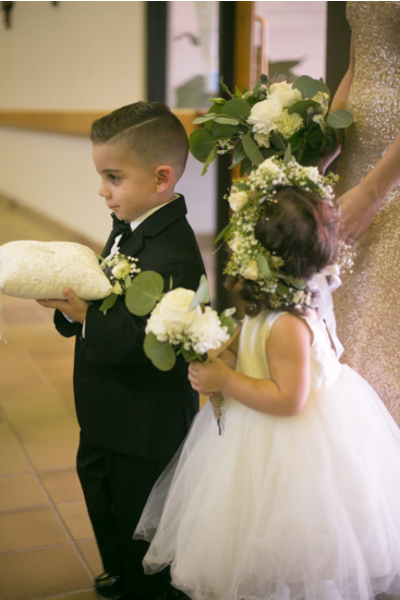 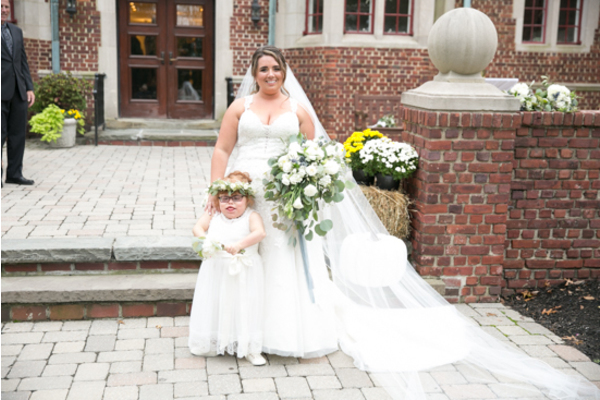 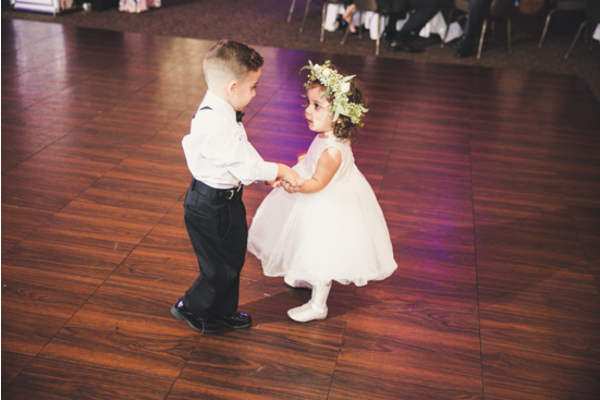 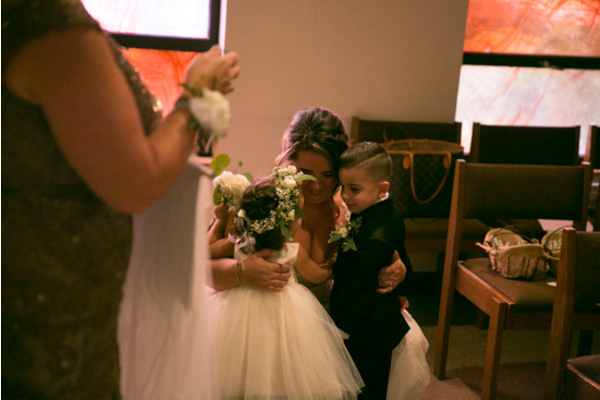 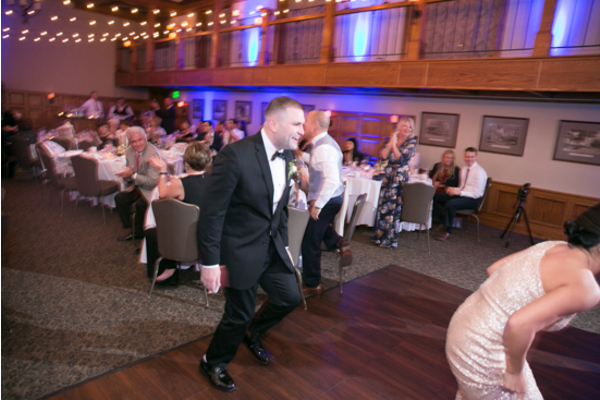 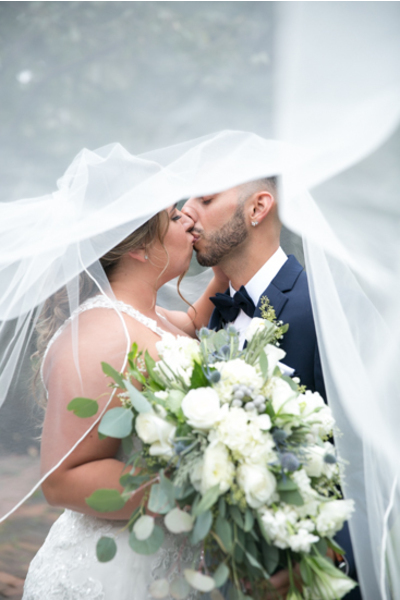 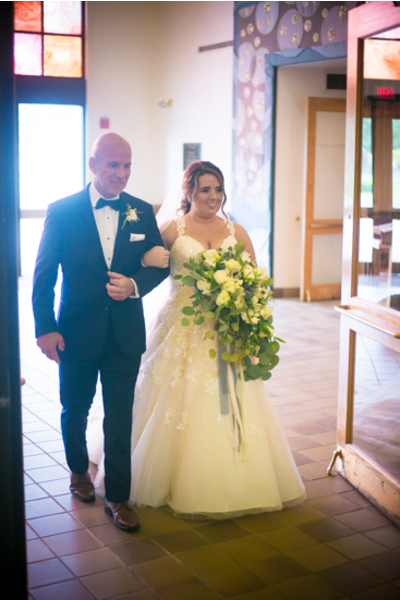 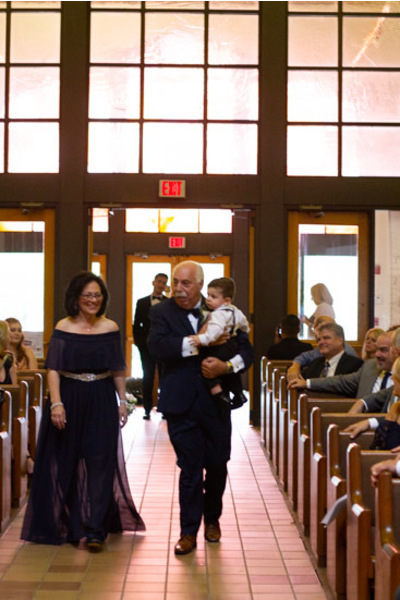 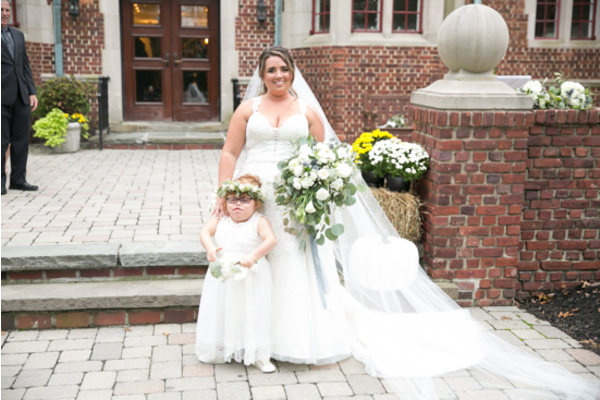 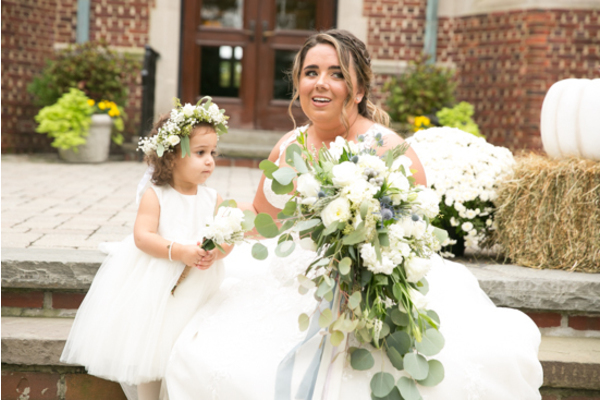 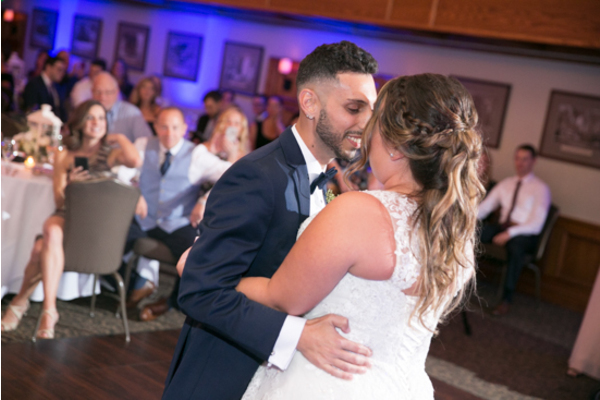 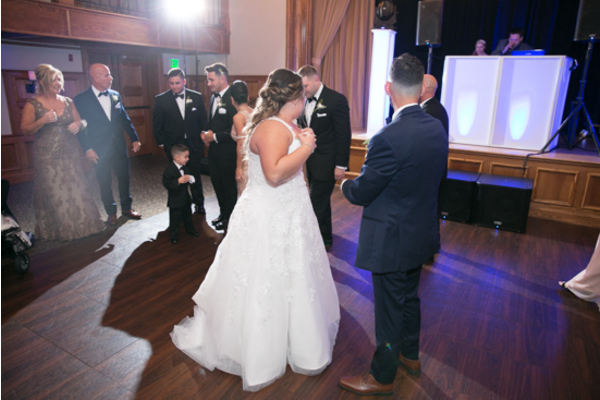 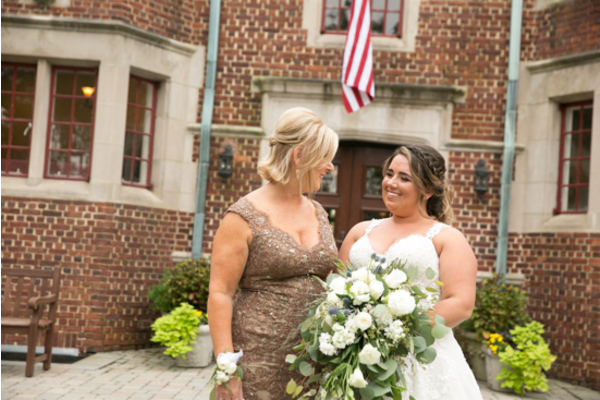 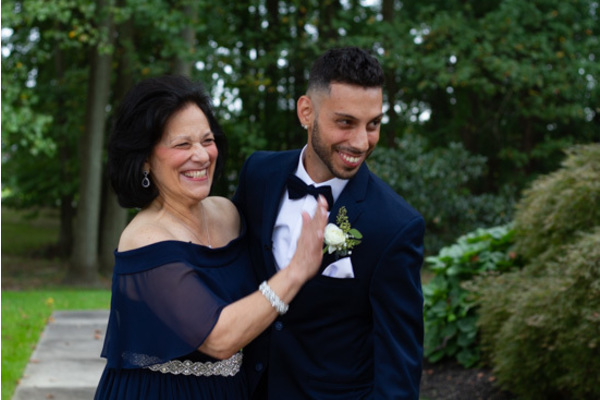 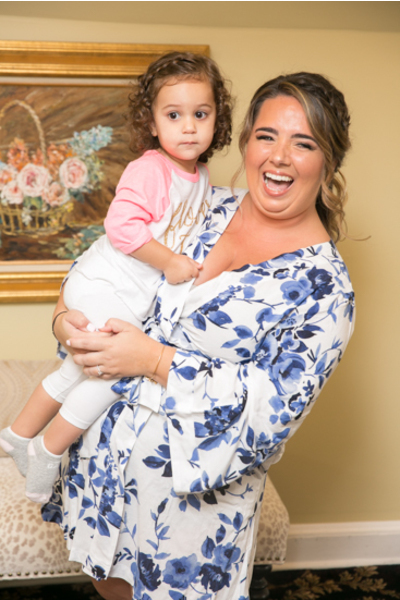 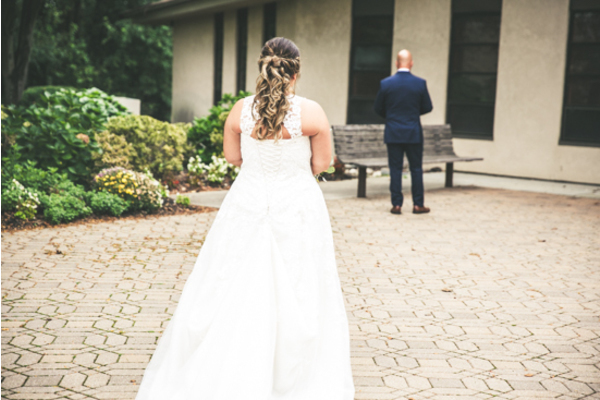 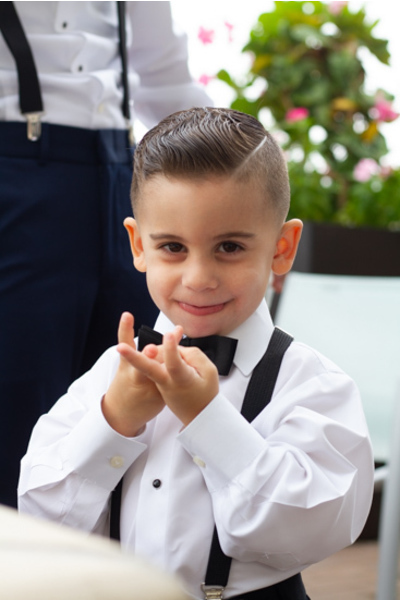 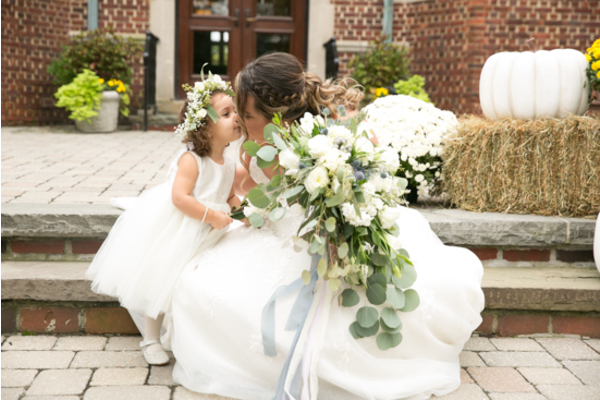 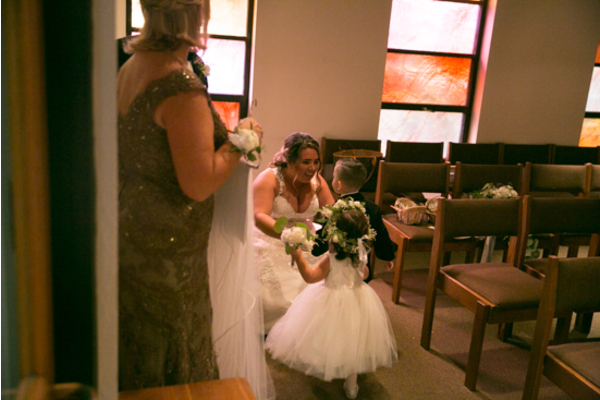 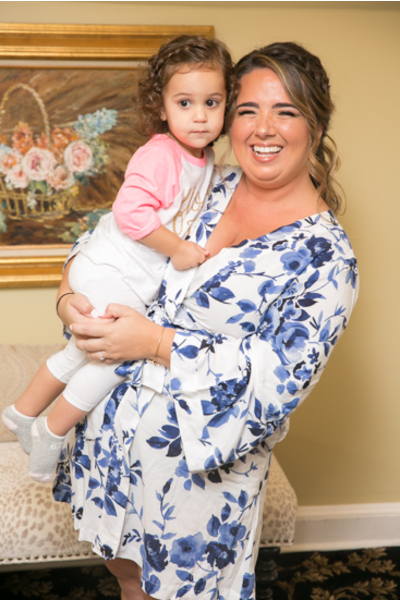 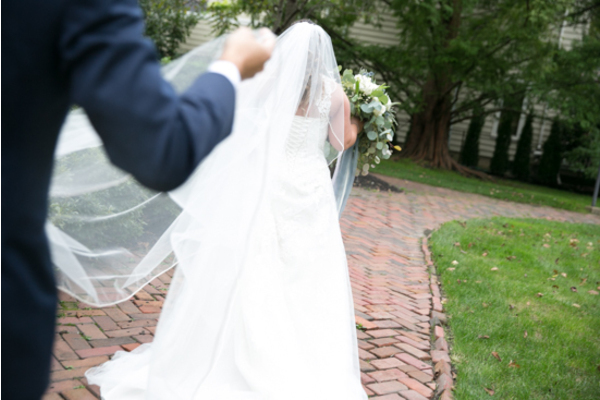 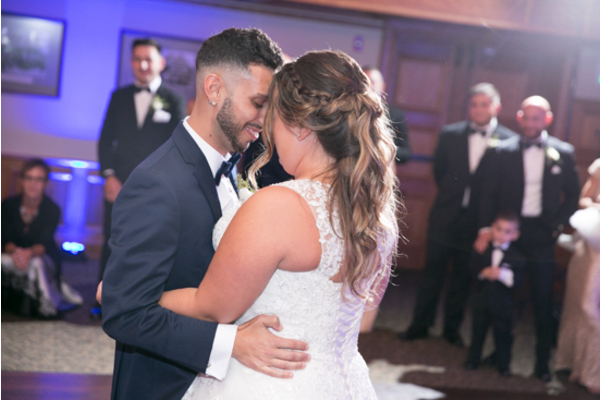 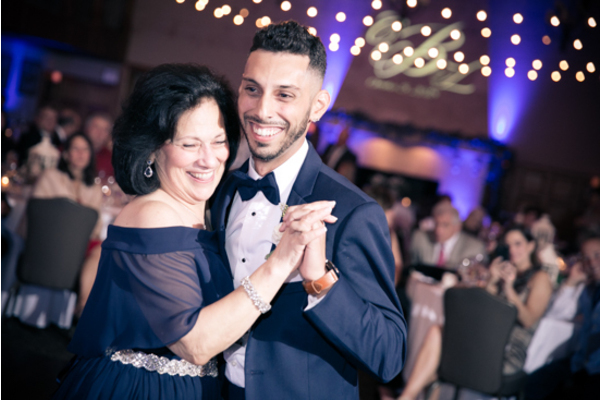 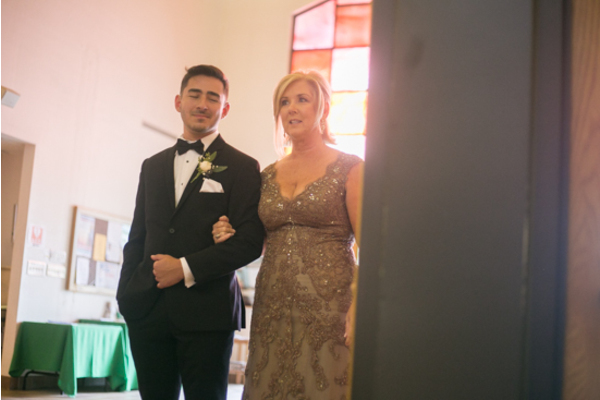 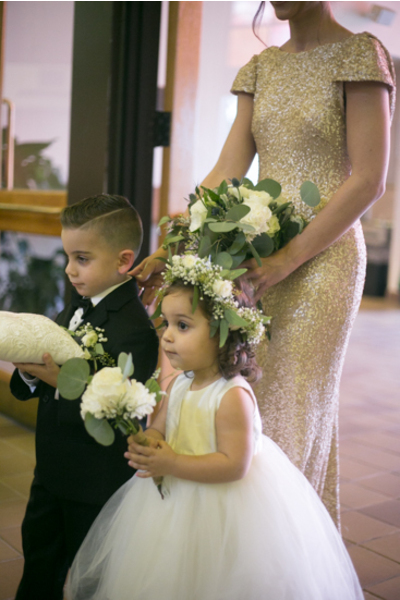 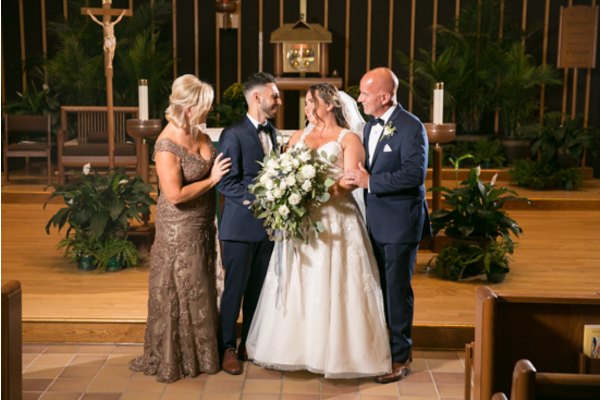 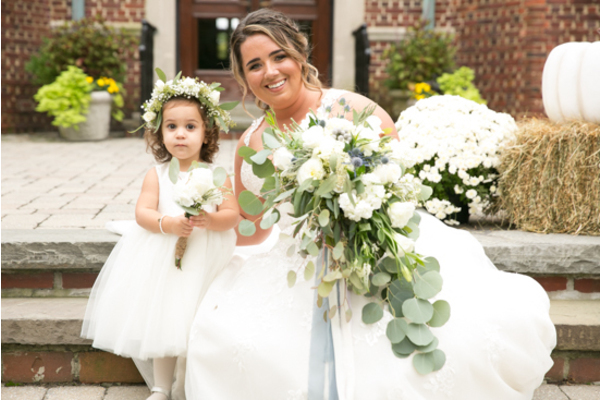 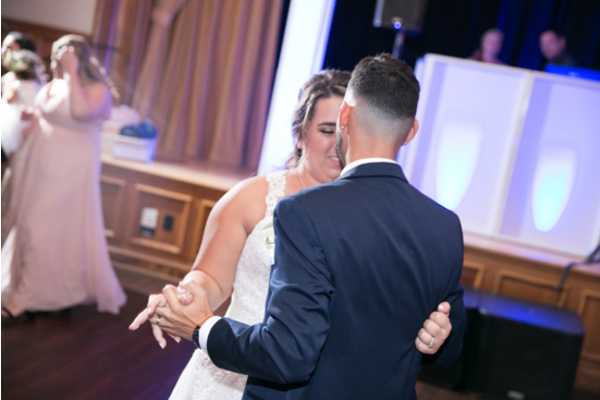 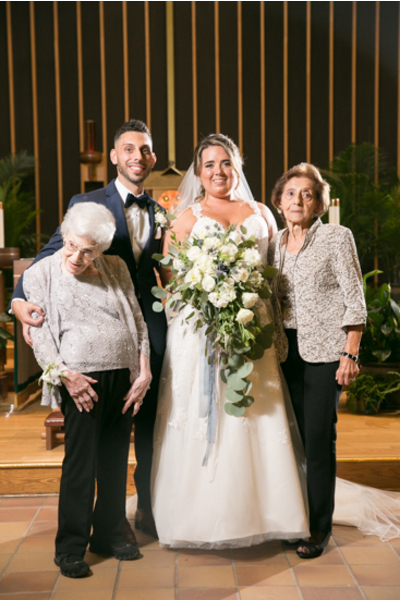 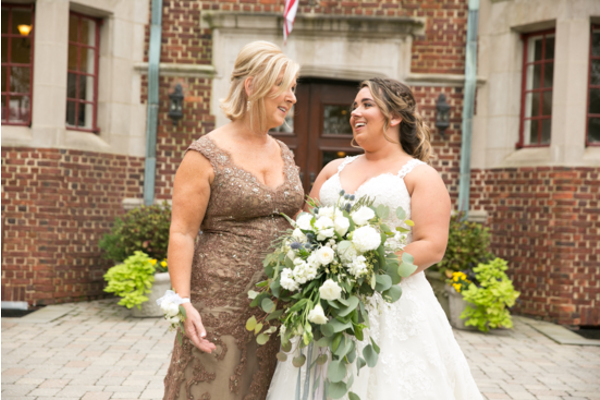 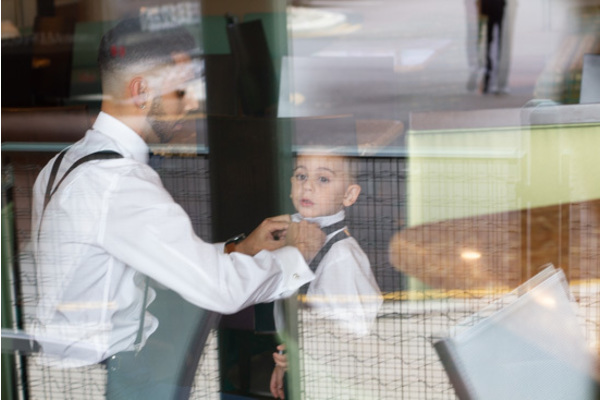 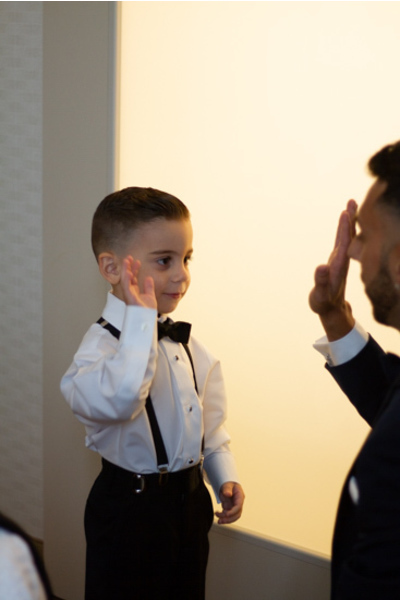 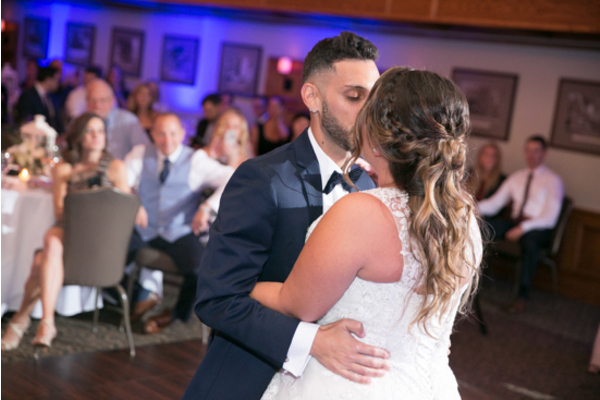 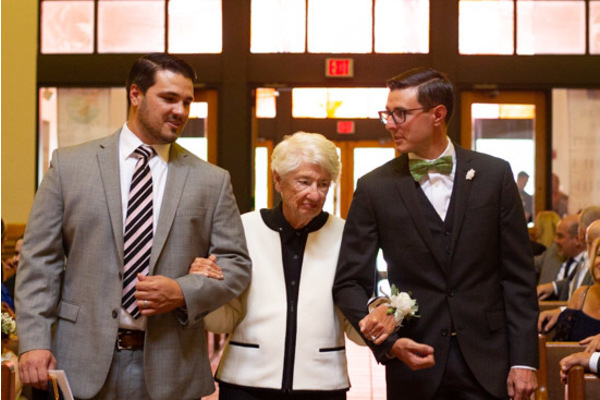 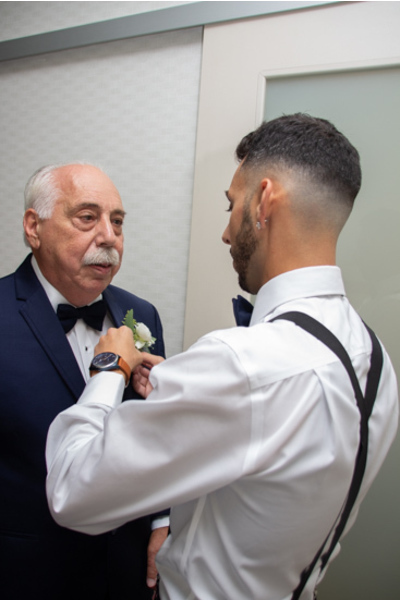 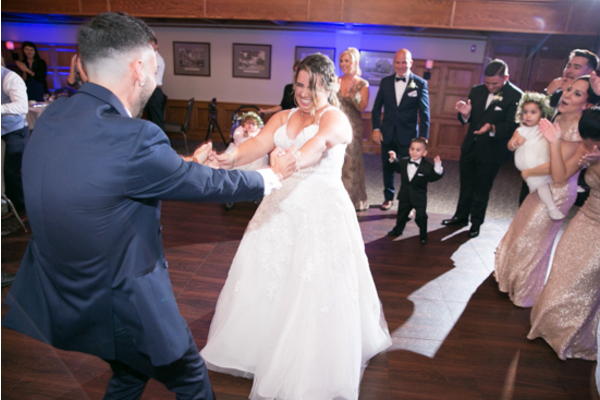 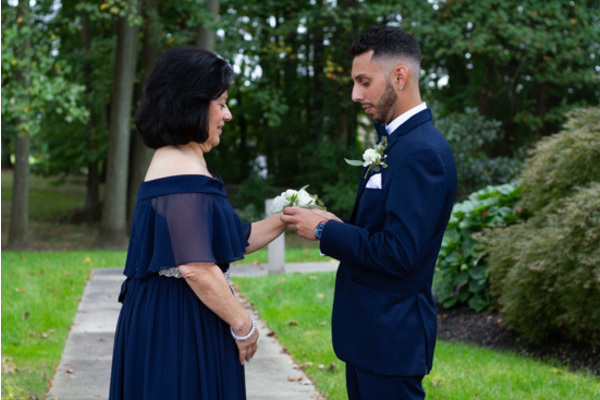 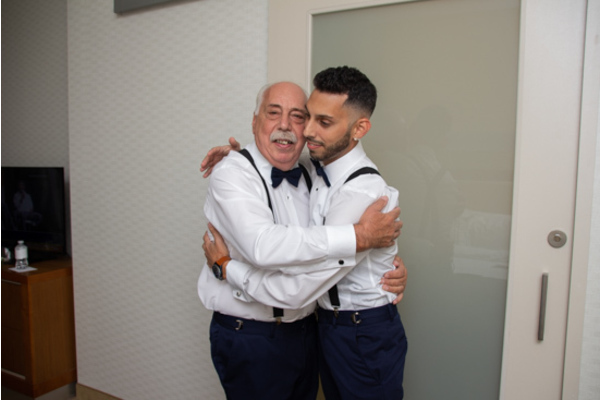 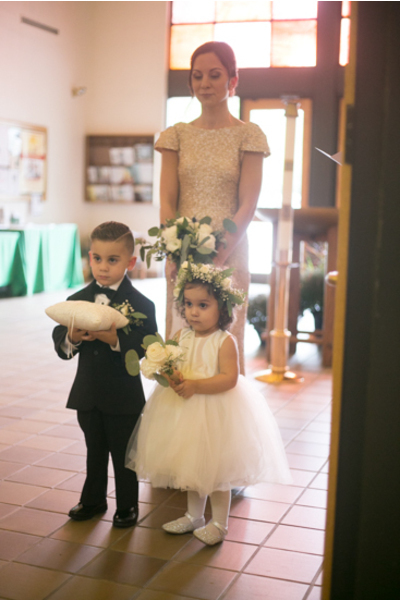 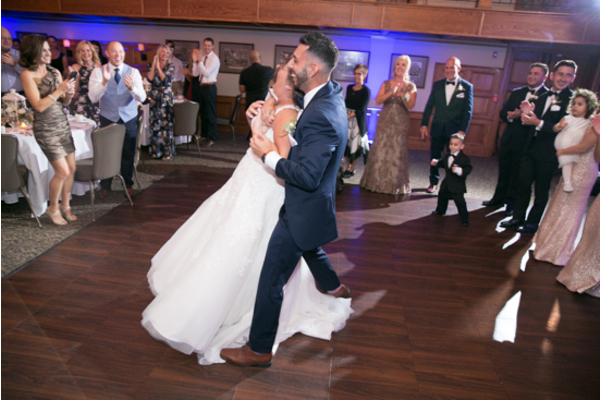 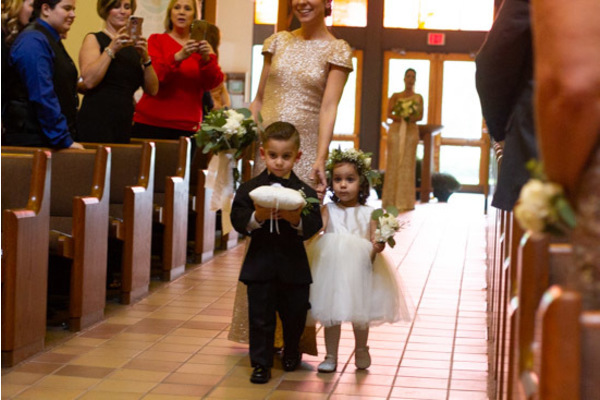 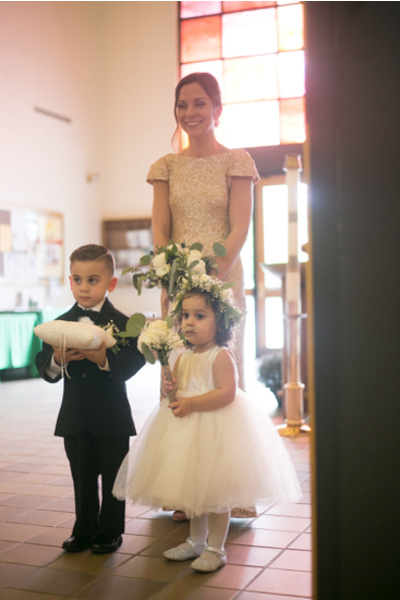 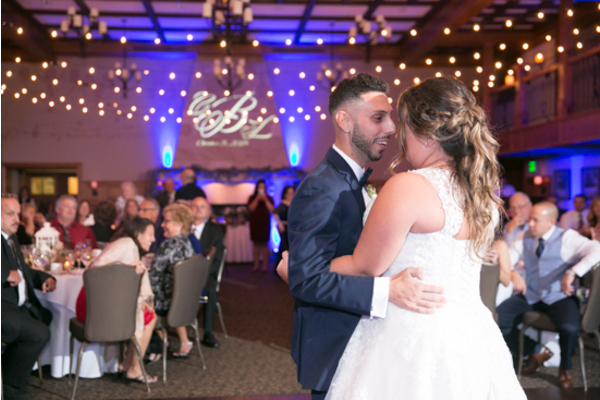 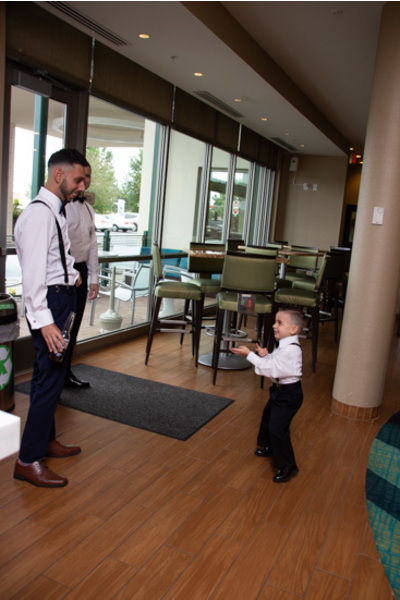 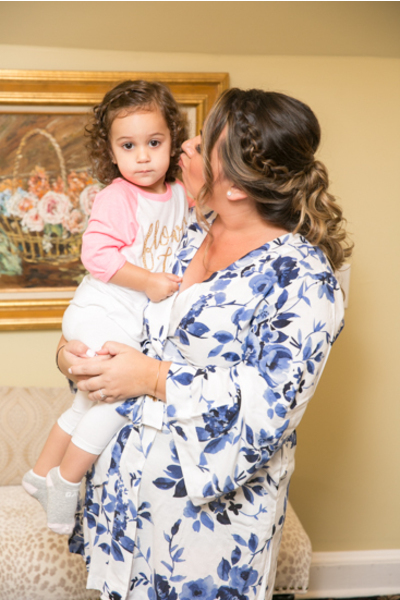 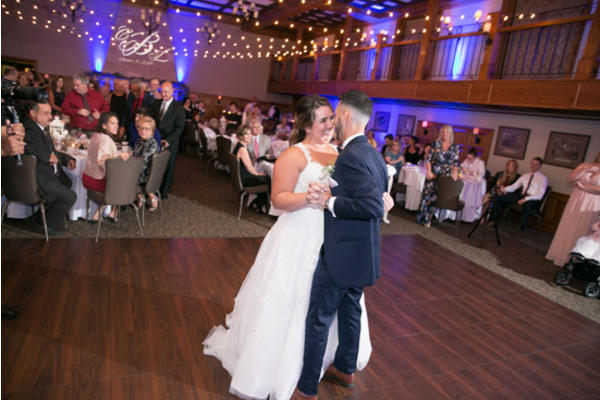 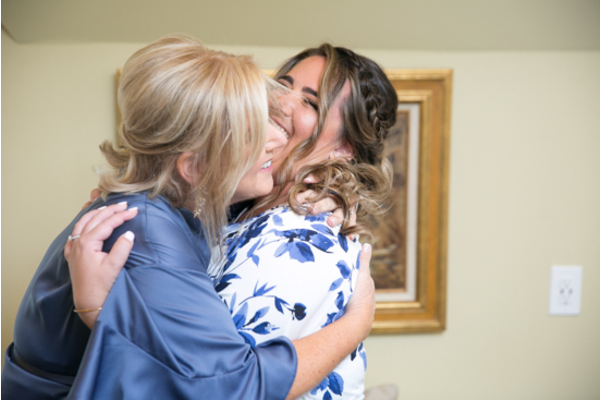 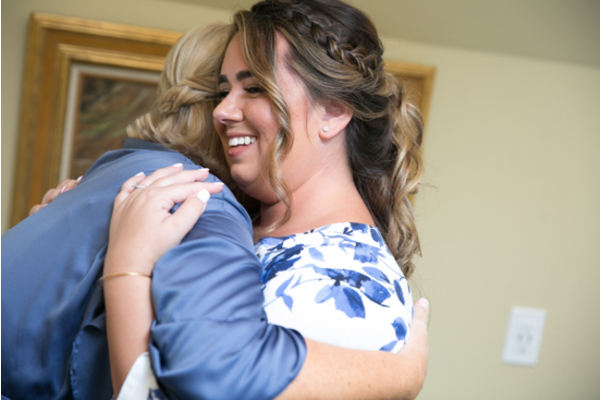 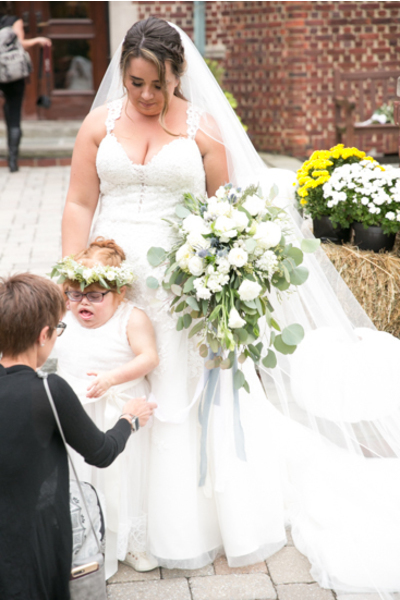 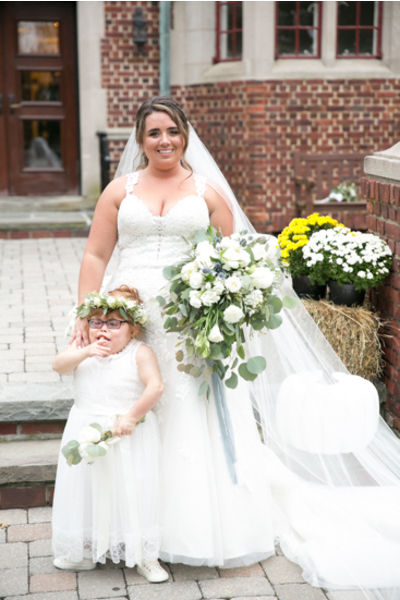 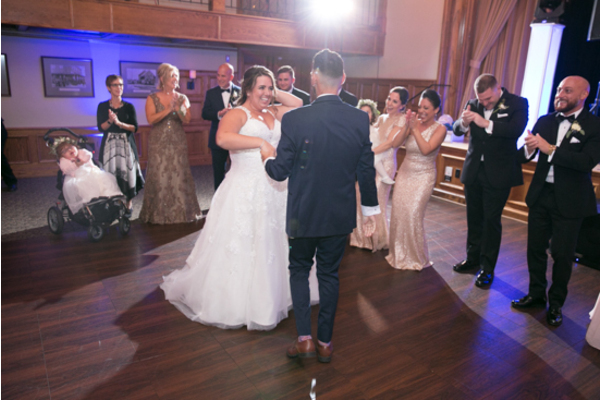 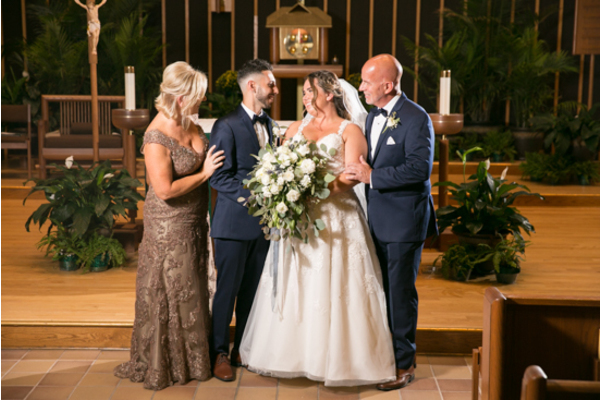 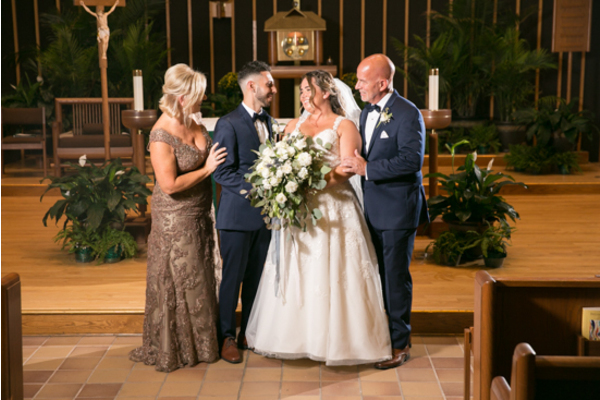 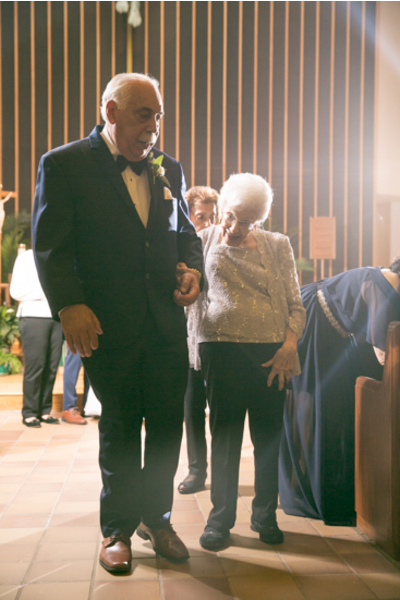 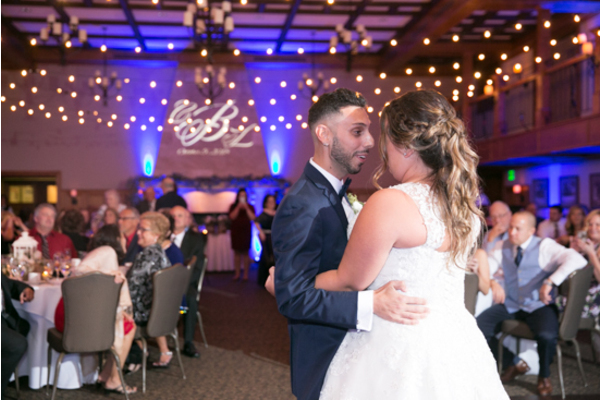 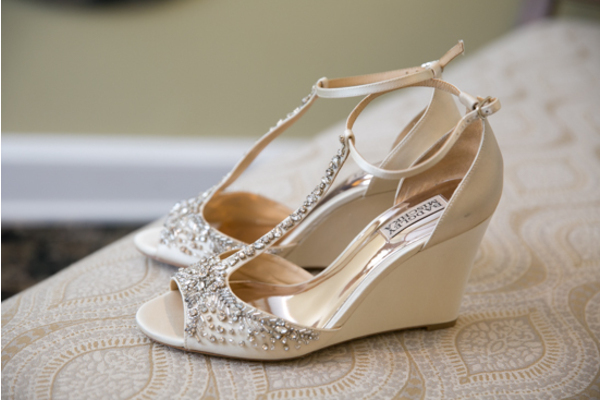 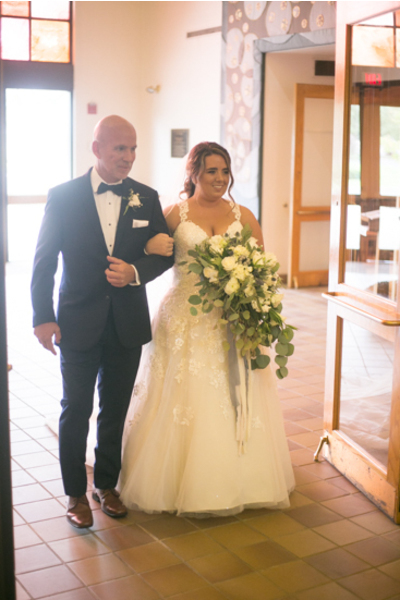 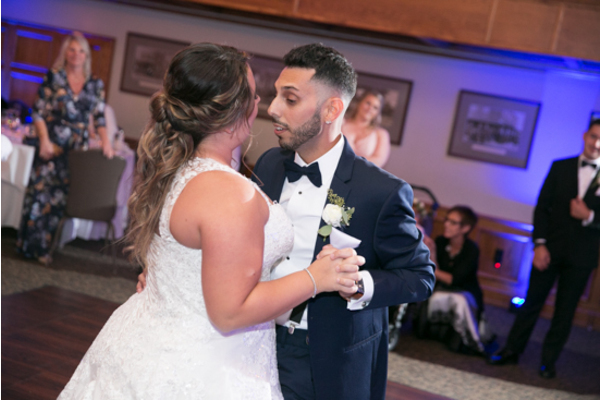 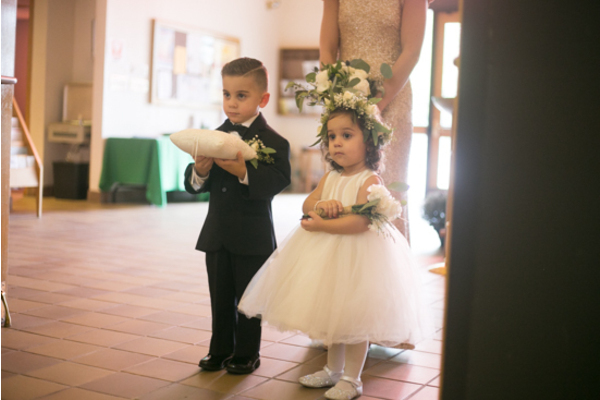 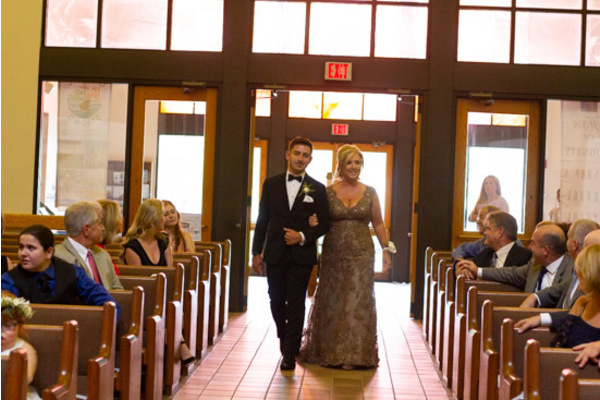 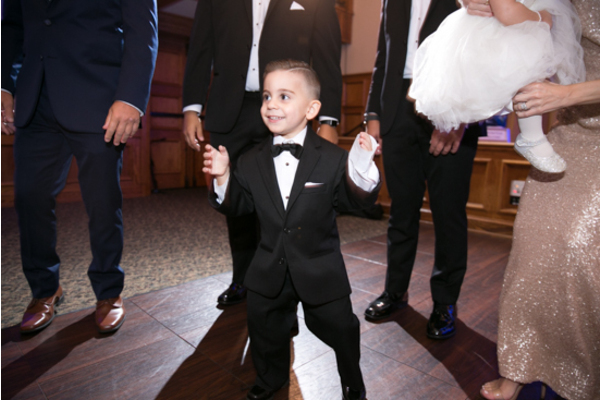 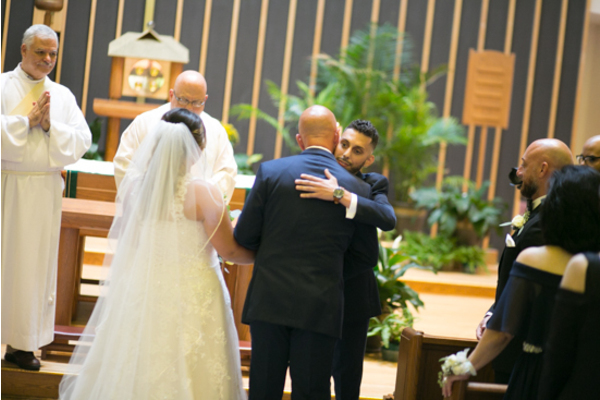 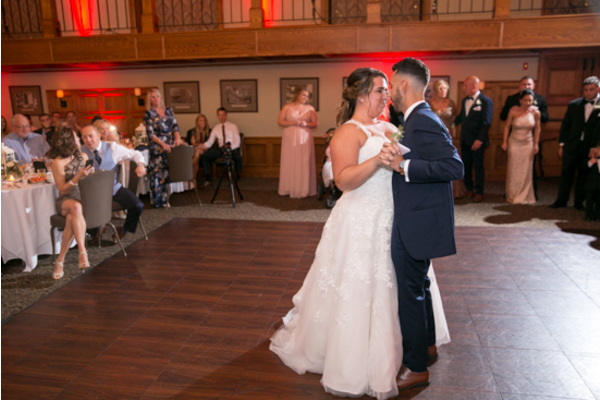 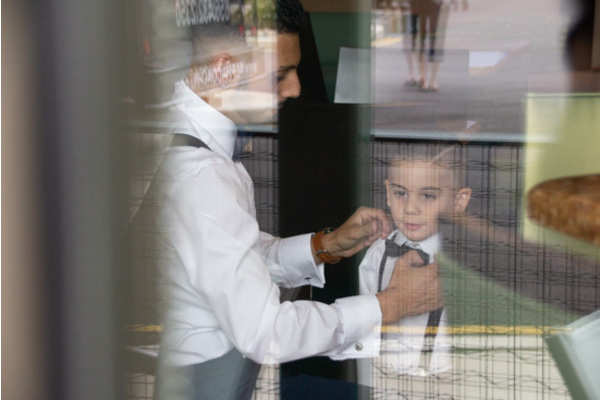 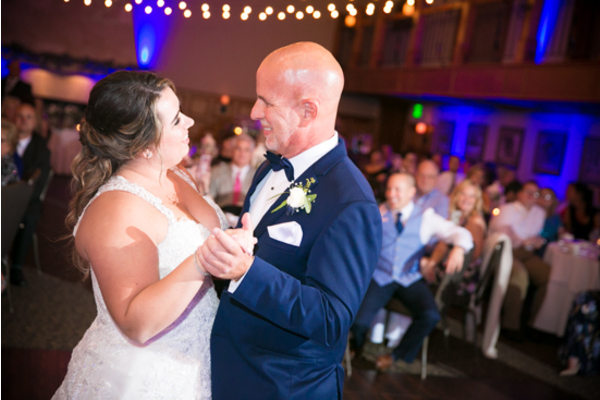 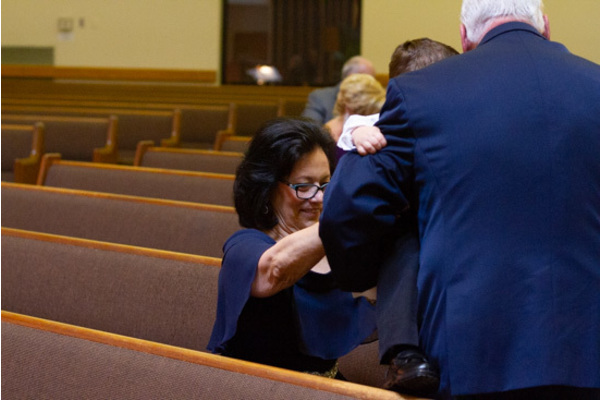 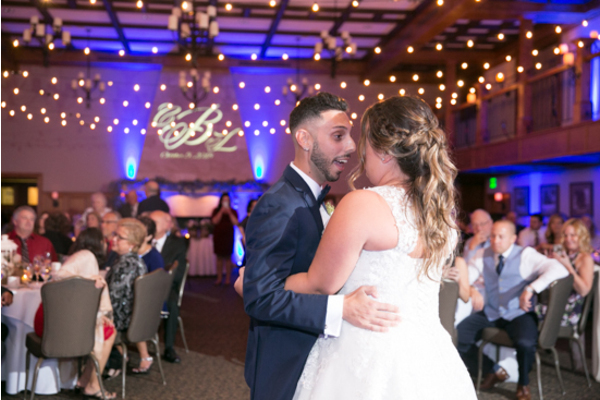 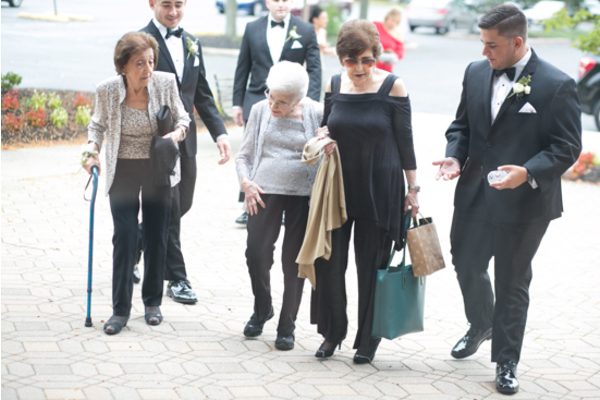 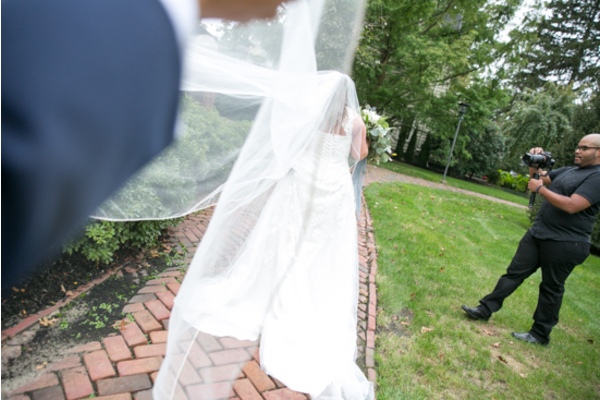 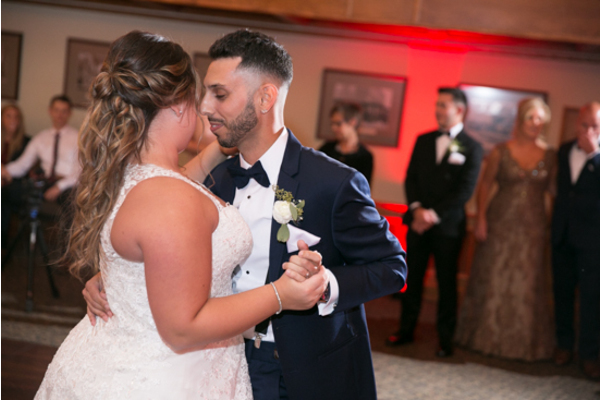 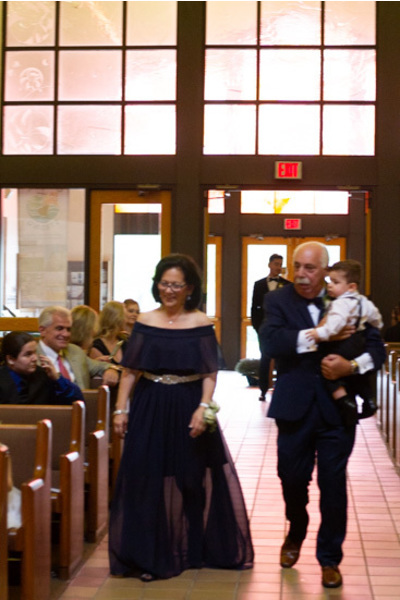 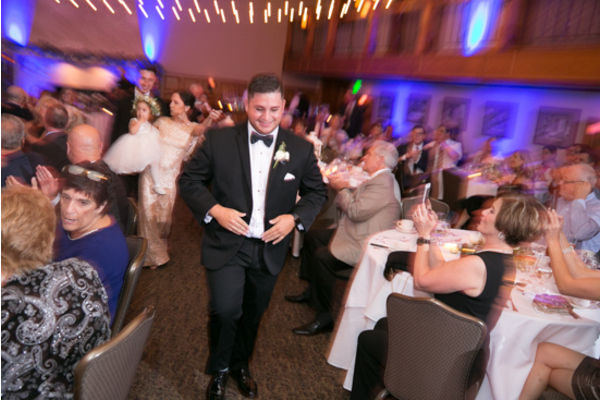 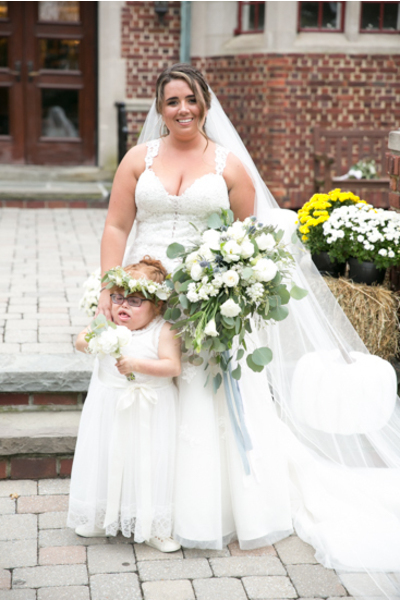 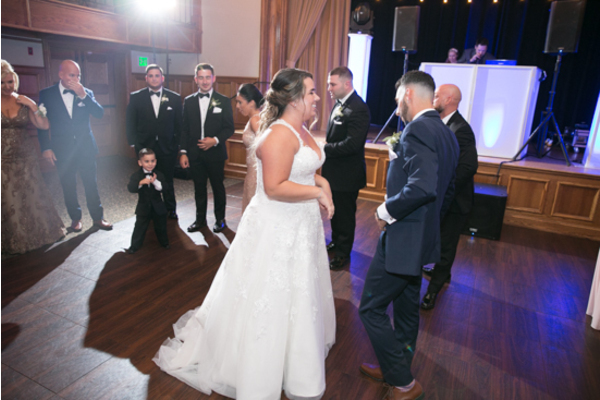 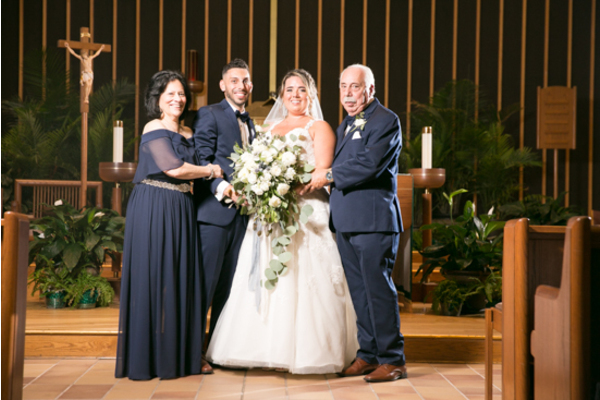 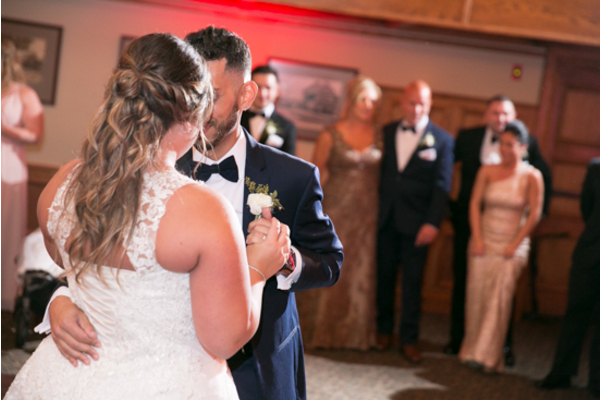 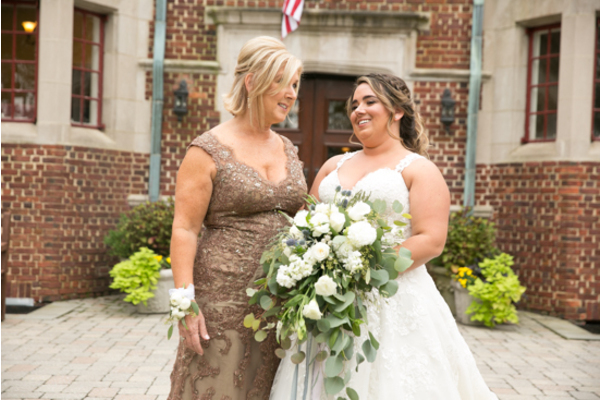 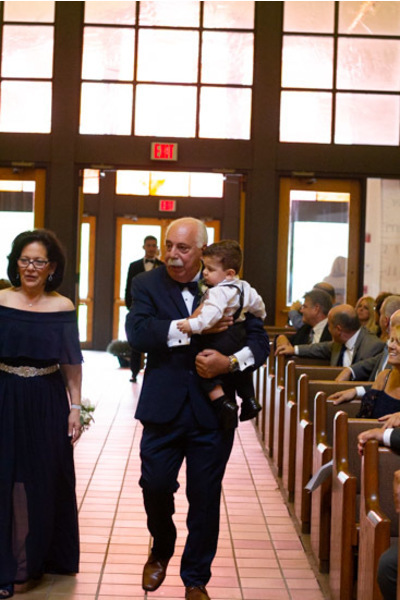 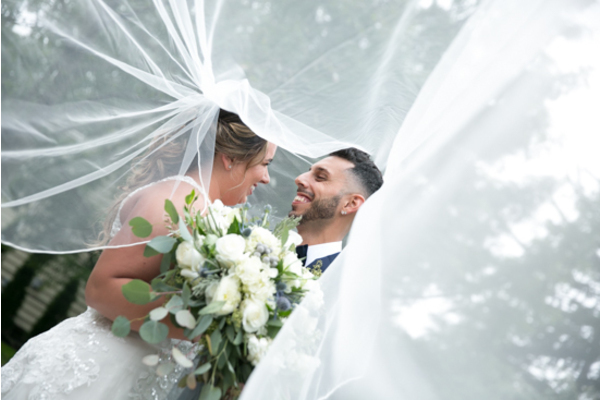 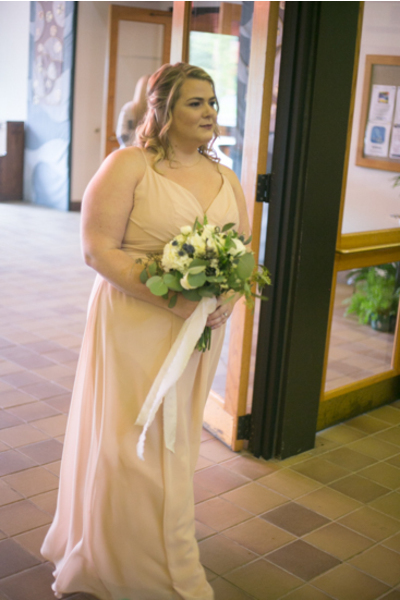 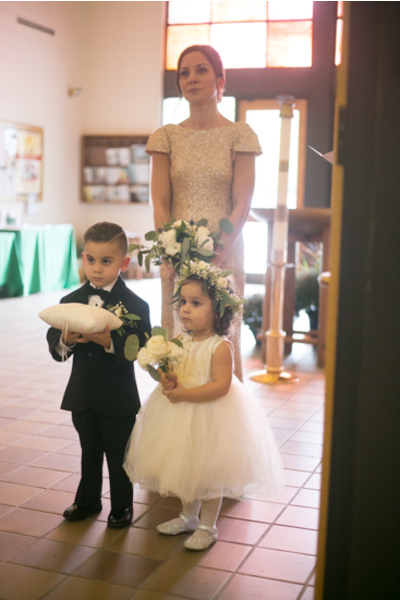 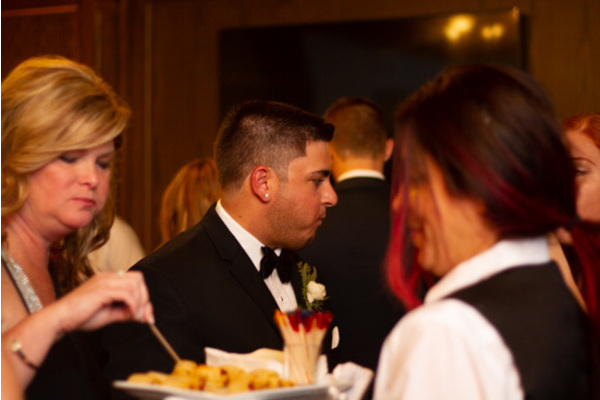 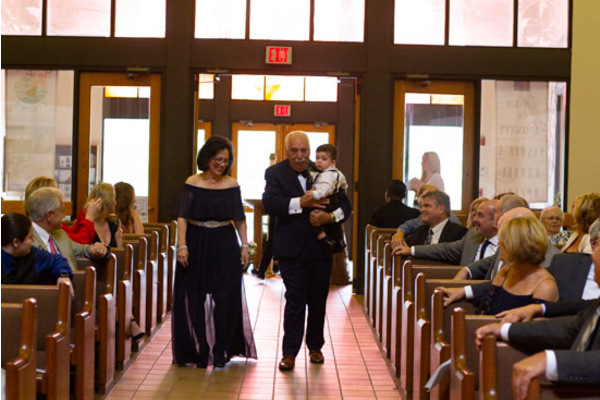 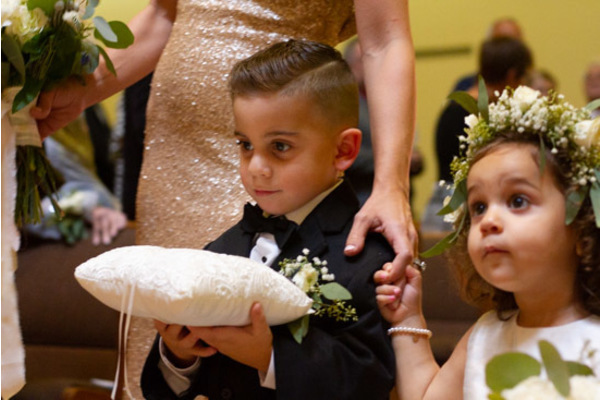 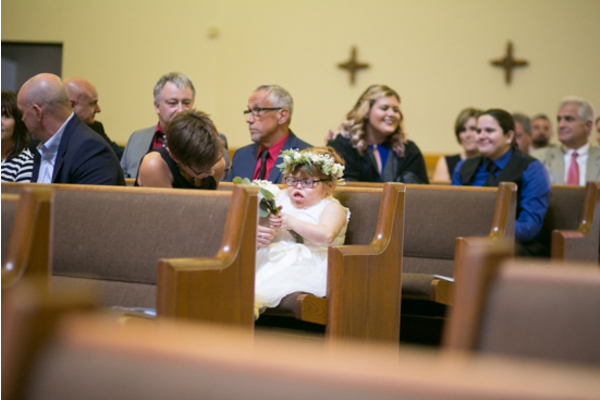 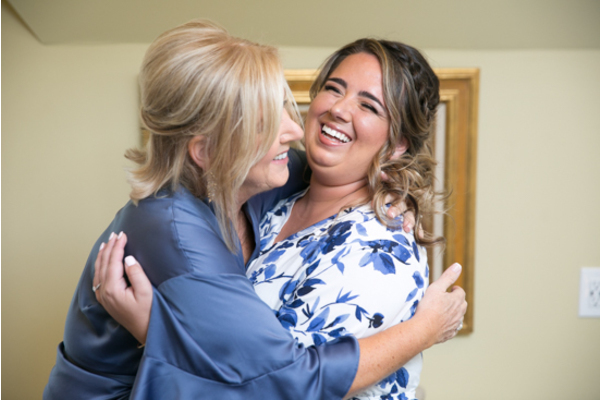 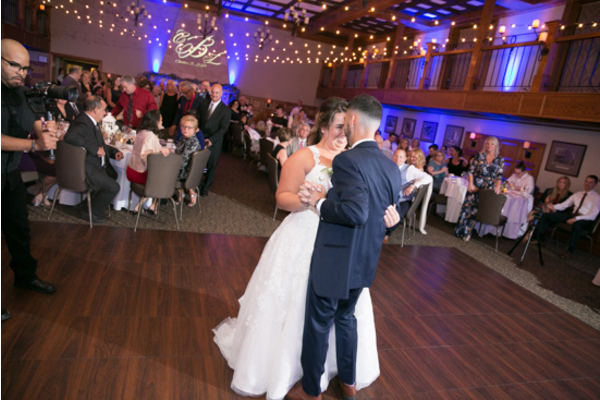 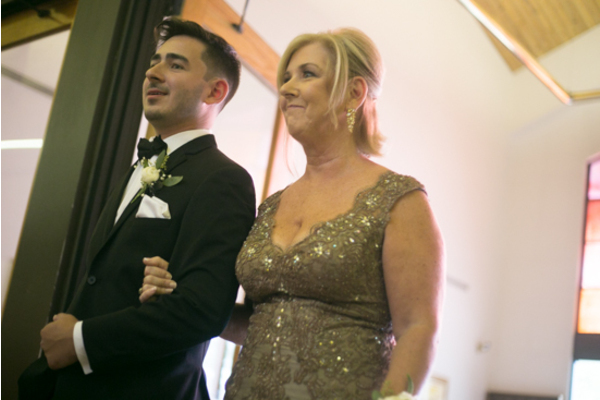 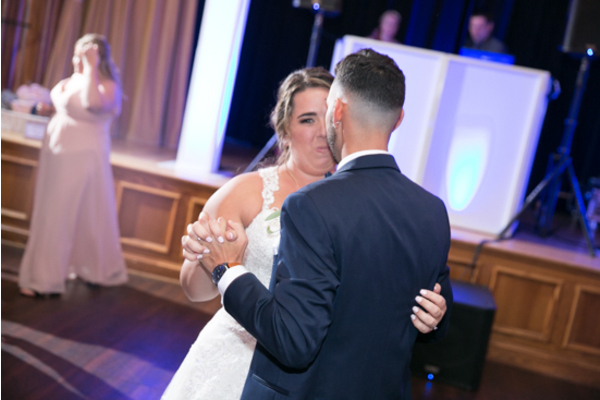 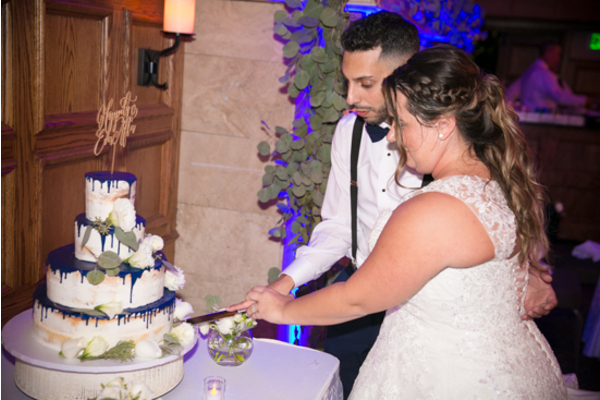 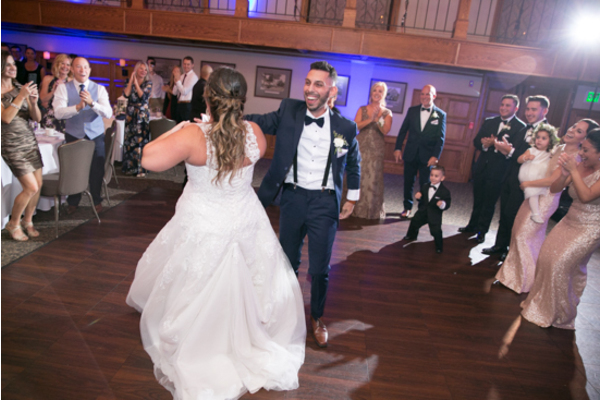 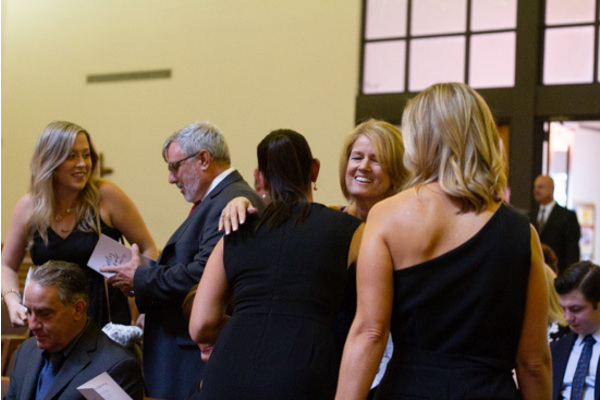 Our NJ Wedding Photographer captured all the emotions in the moment when Carly walked down the aisle to meet Lou. 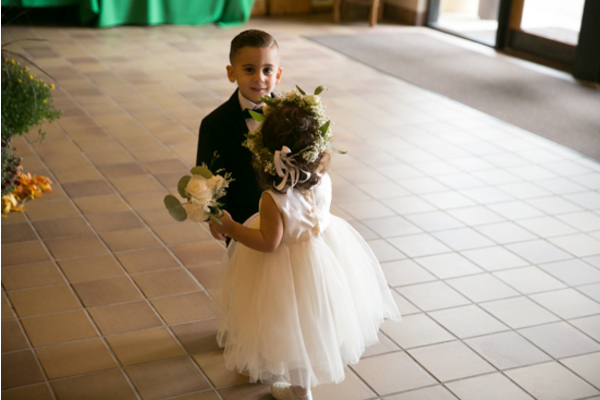 His face lit up and it was easy to tell he was so excited to see her! 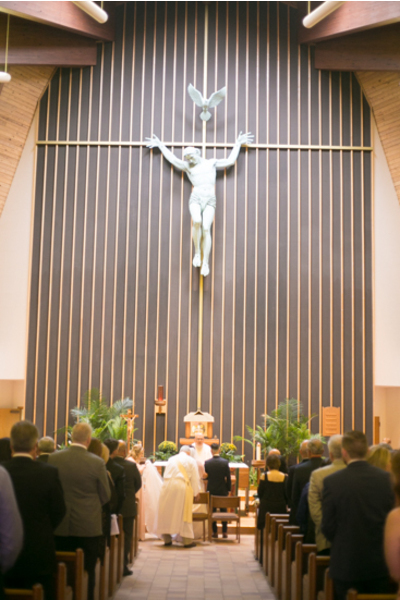 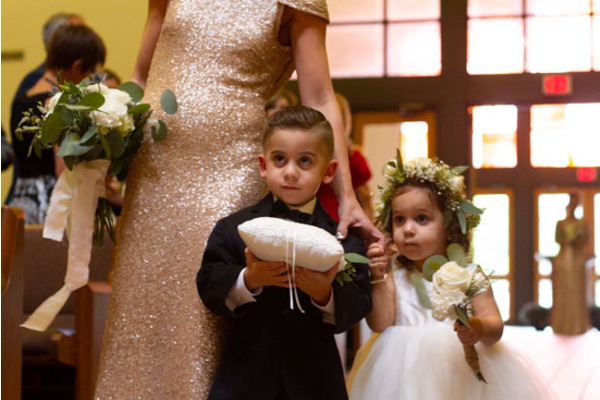 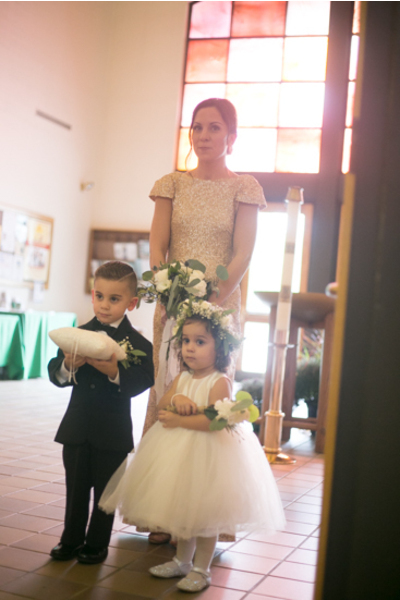 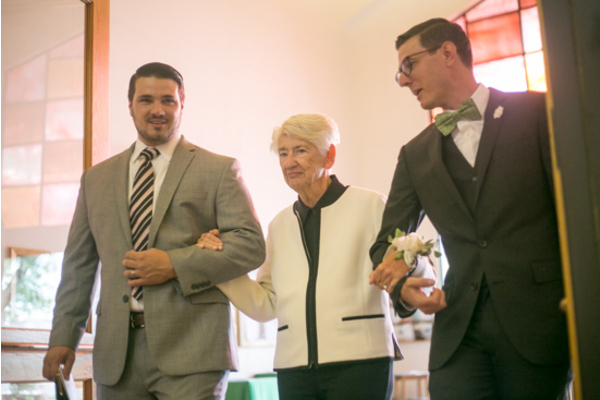 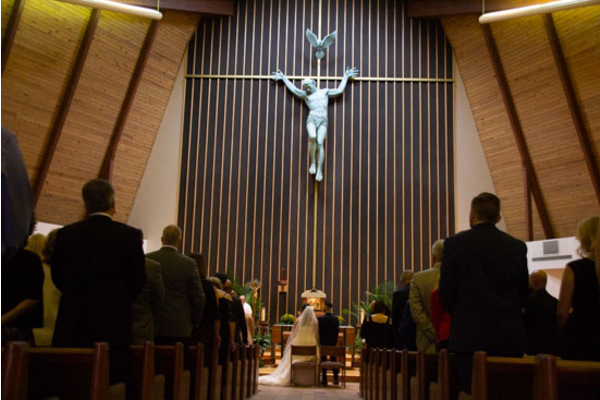 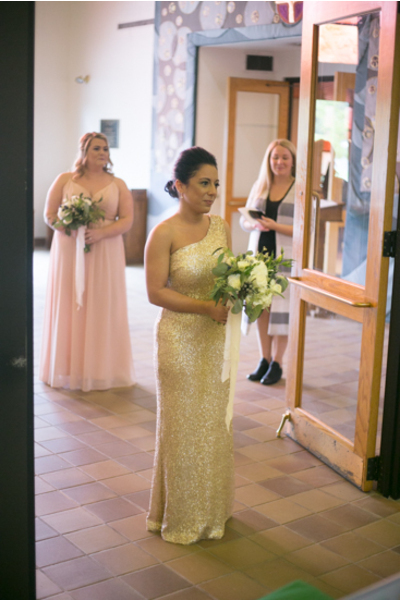 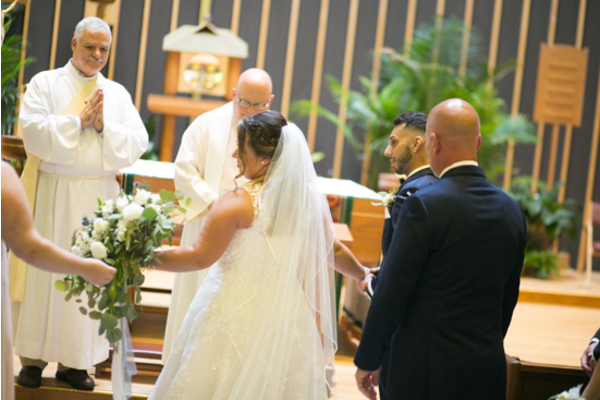 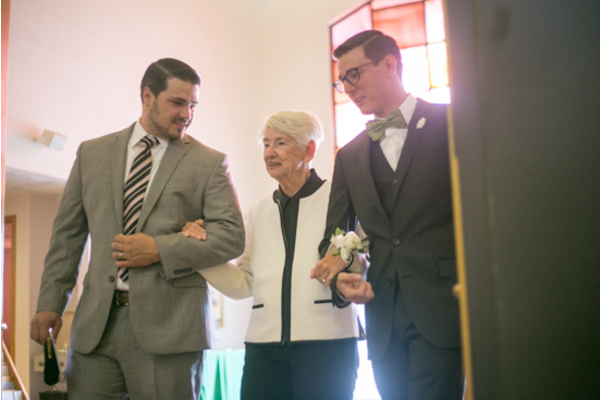 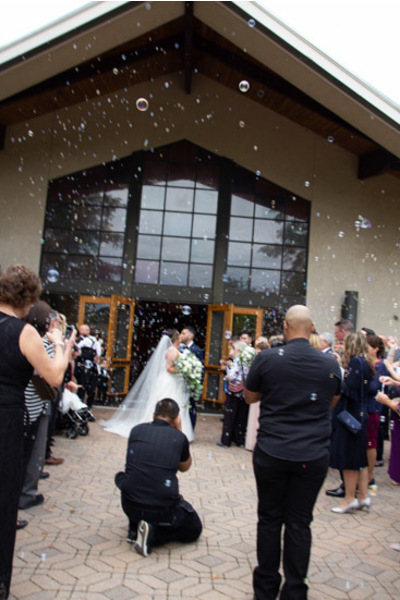 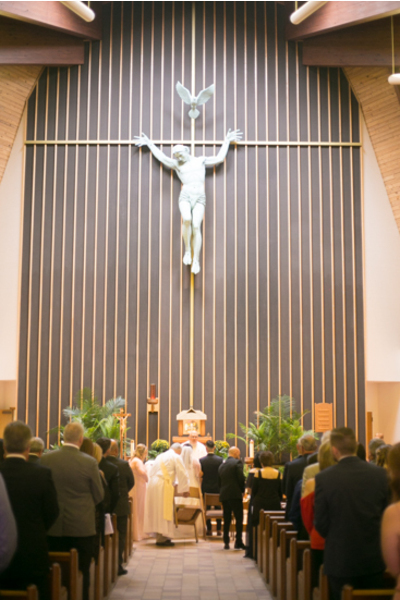 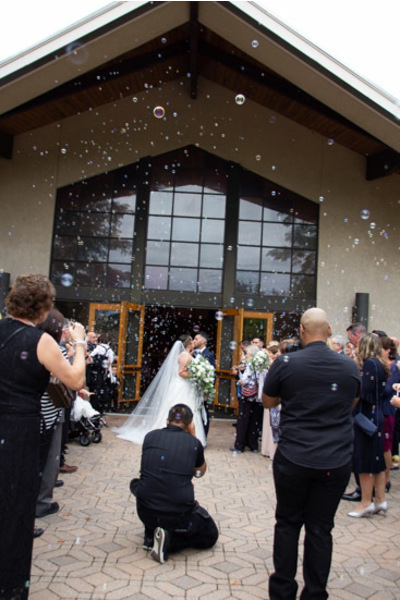 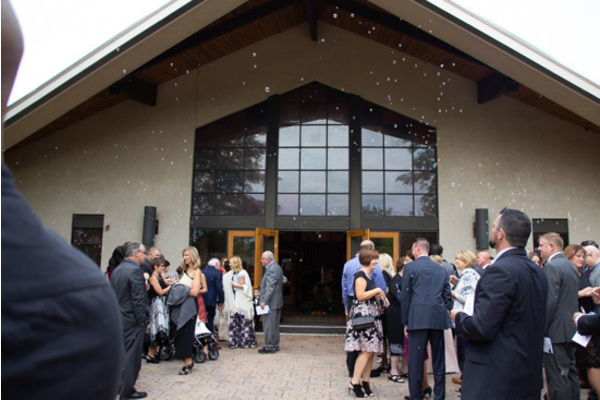 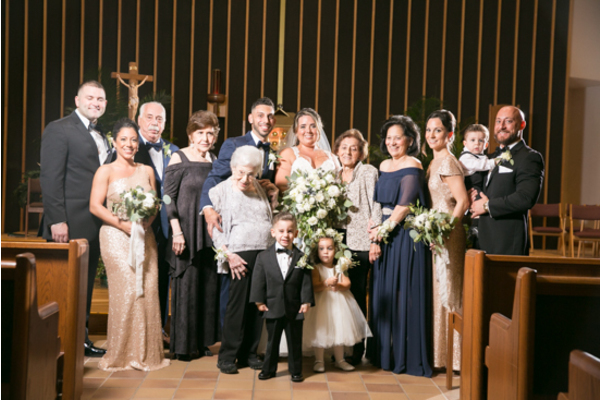 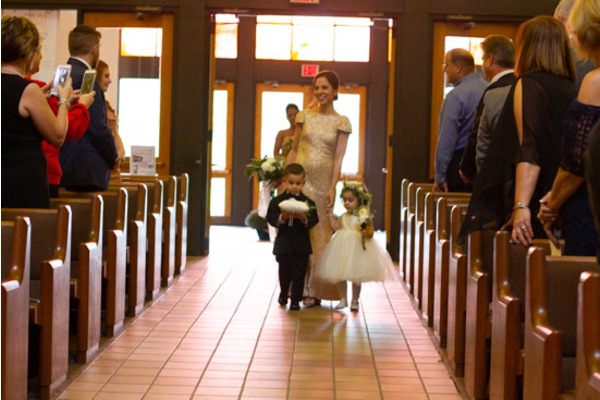 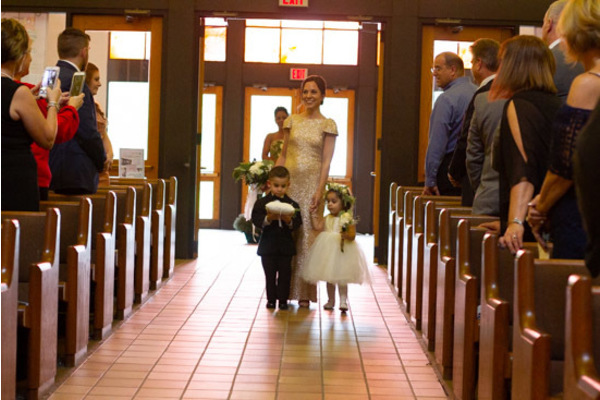 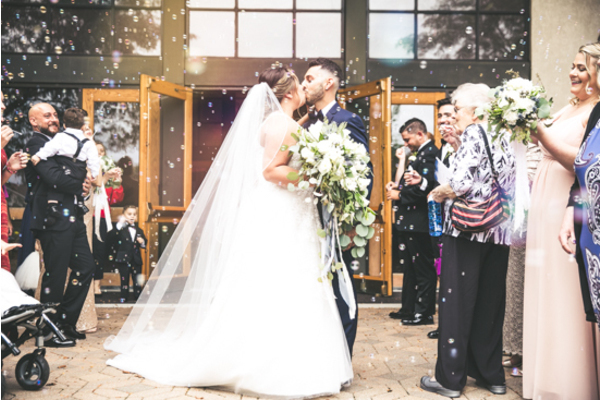 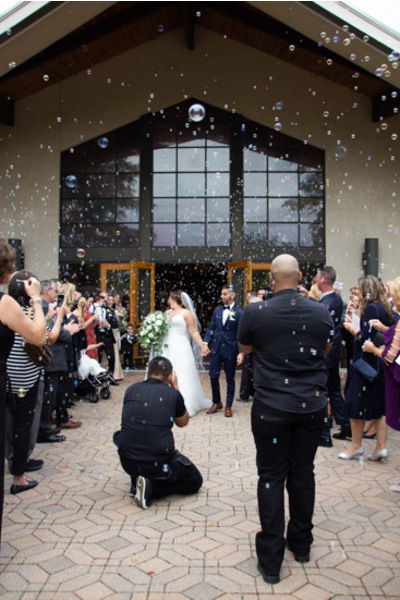 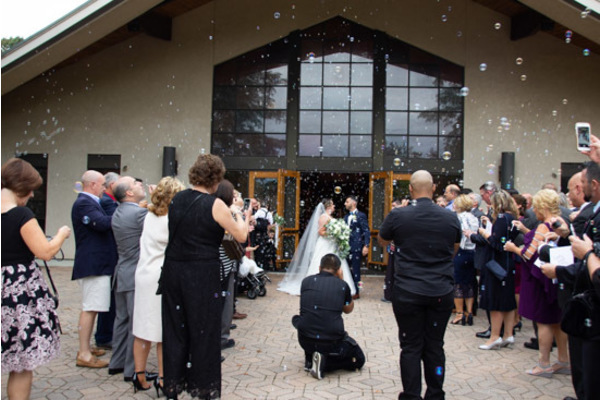 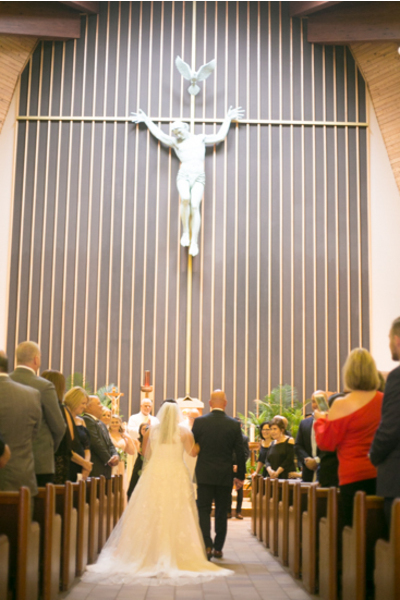 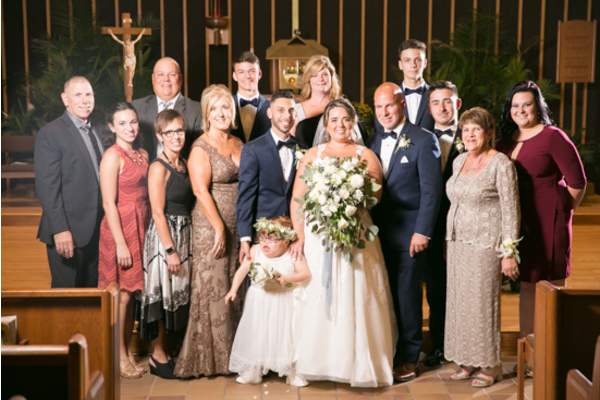 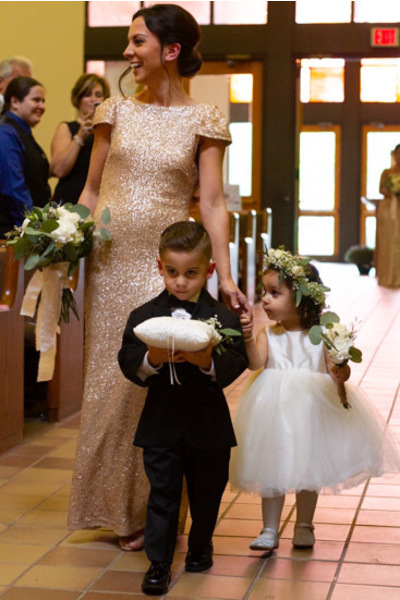 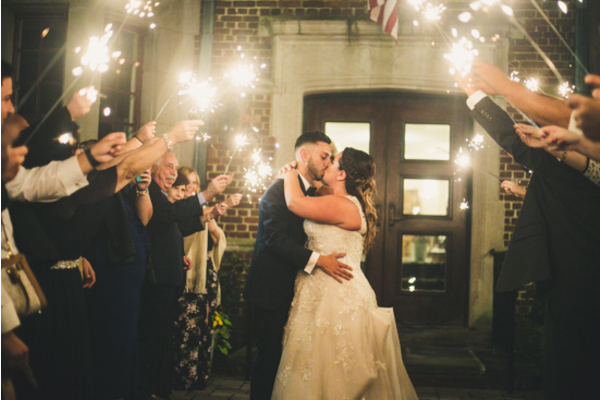 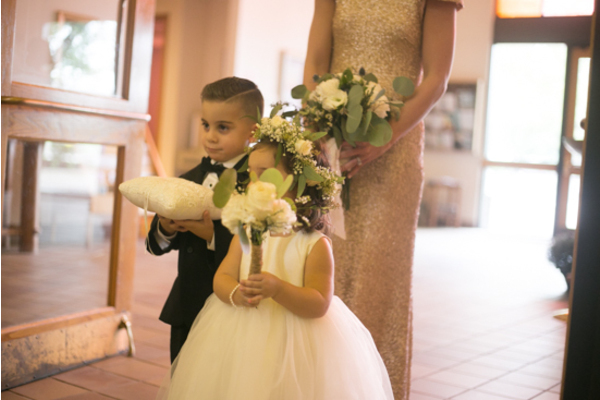 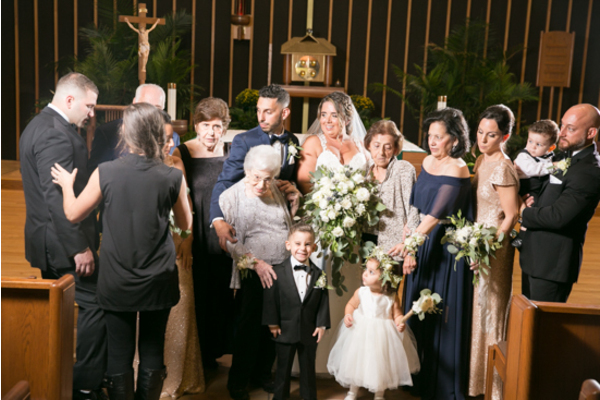 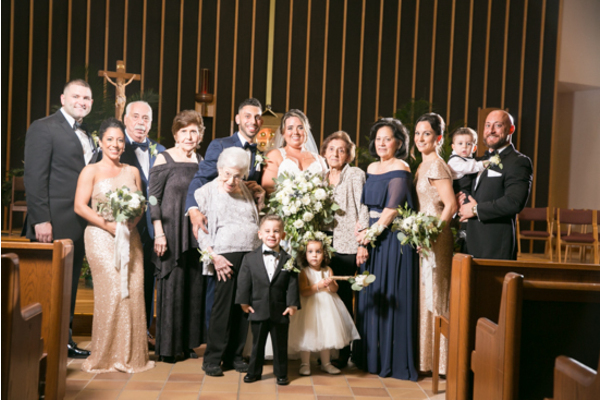 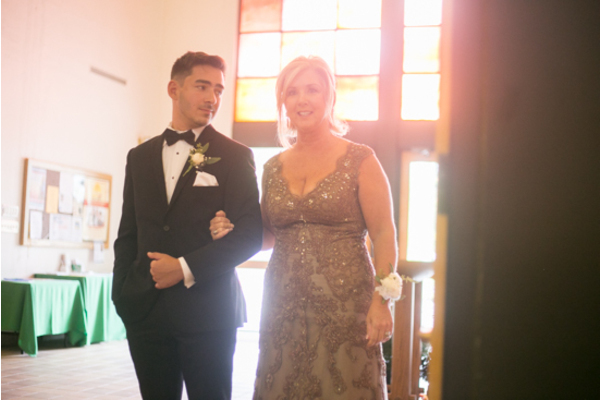 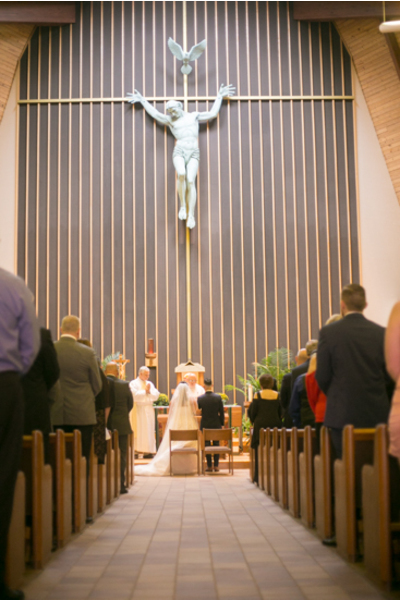 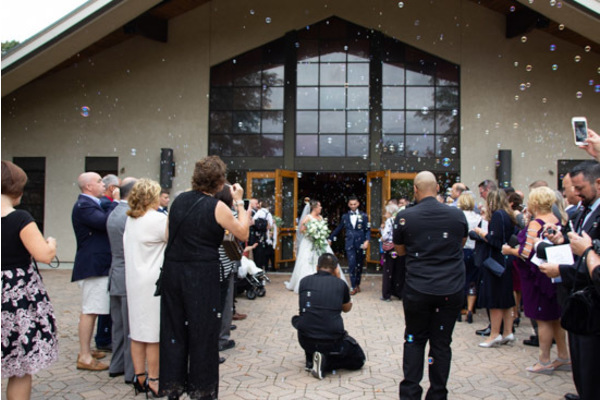 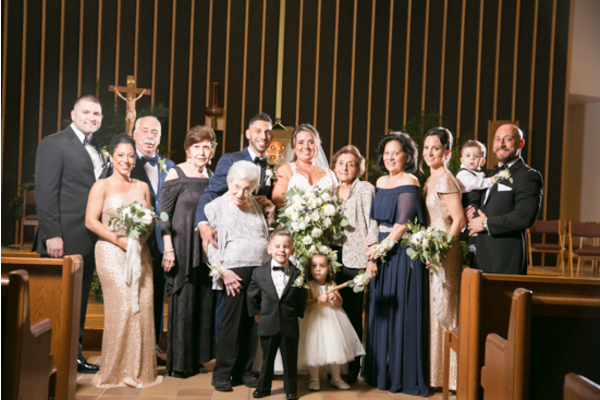 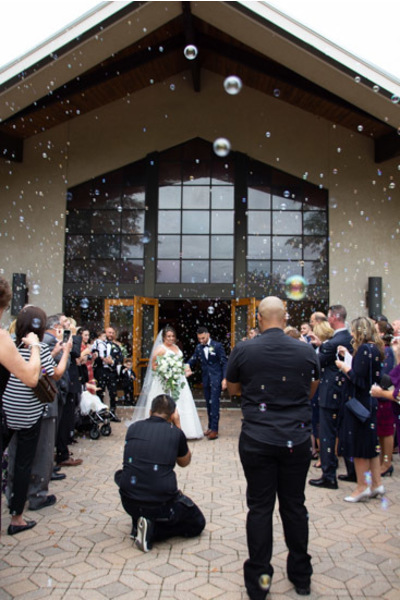 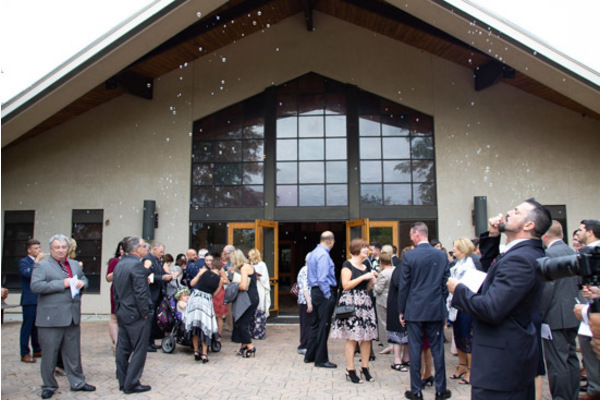 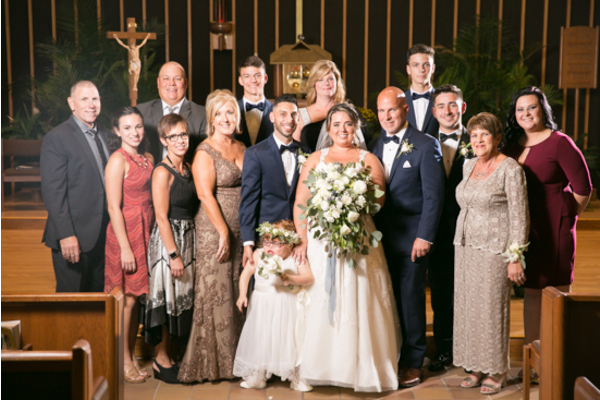 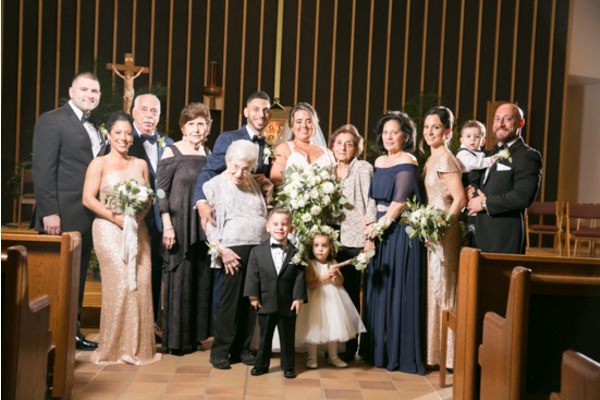 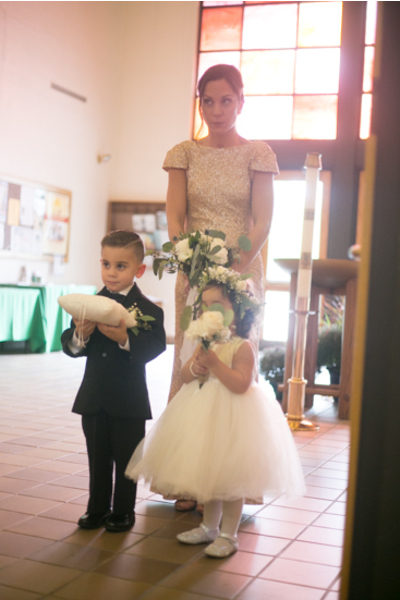 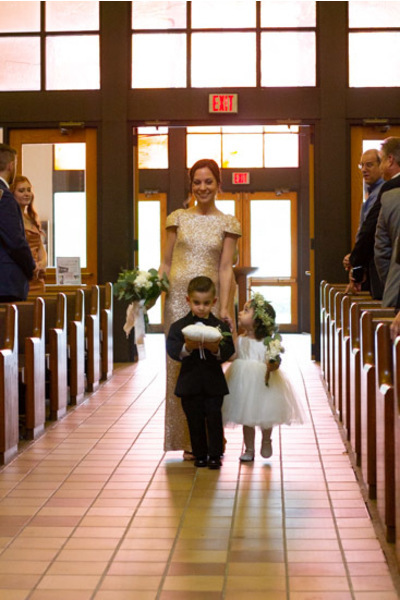 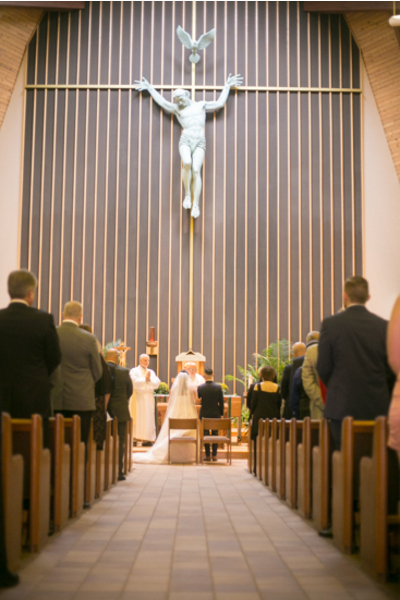 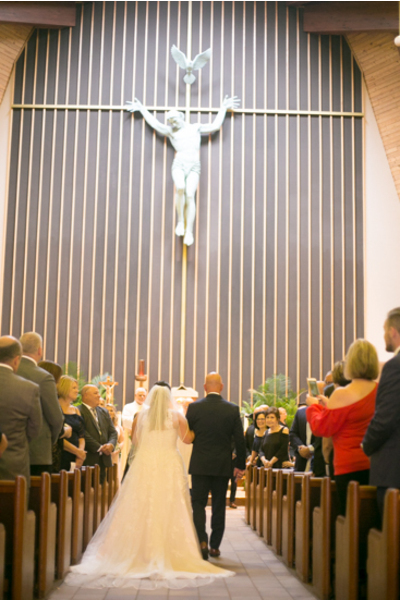 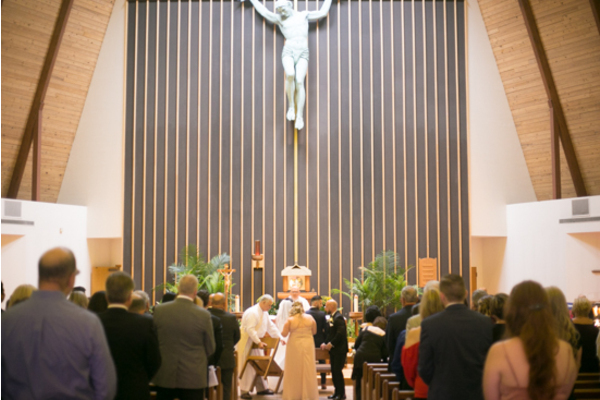 After the vows, the couple was showered with bubbles from loved ones! 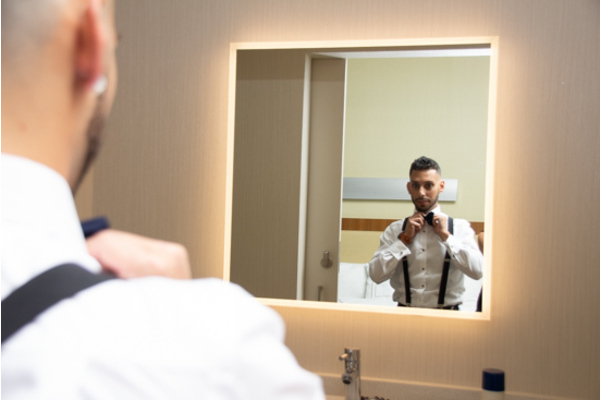 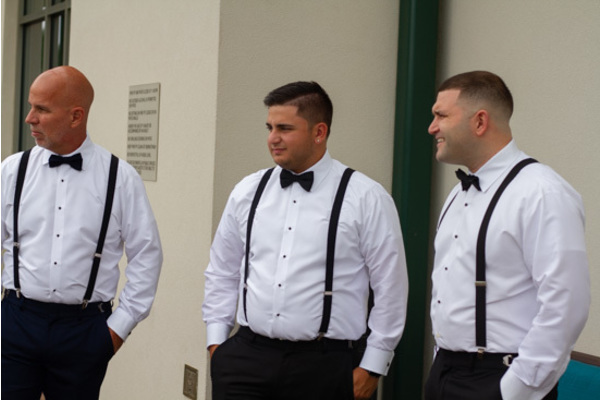 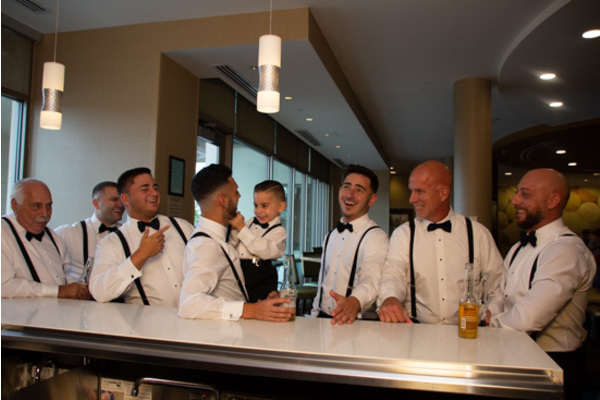 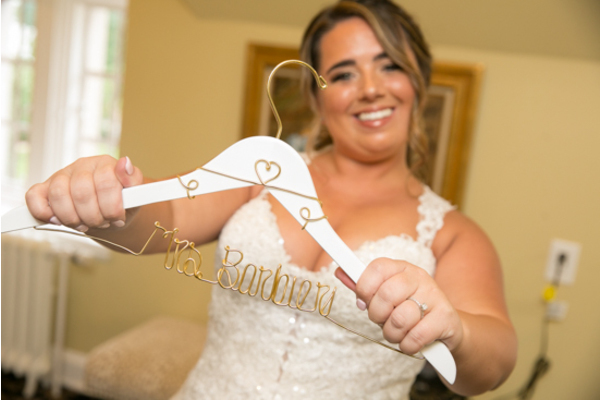 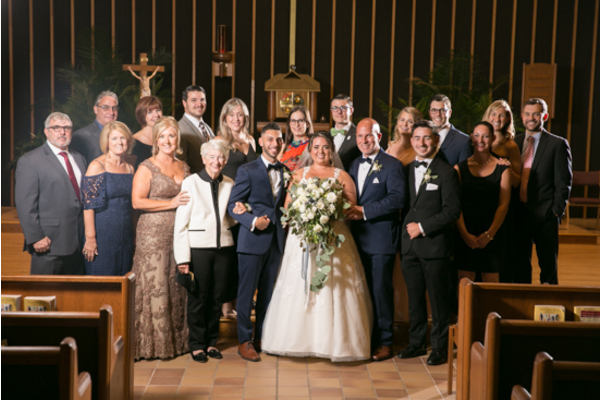 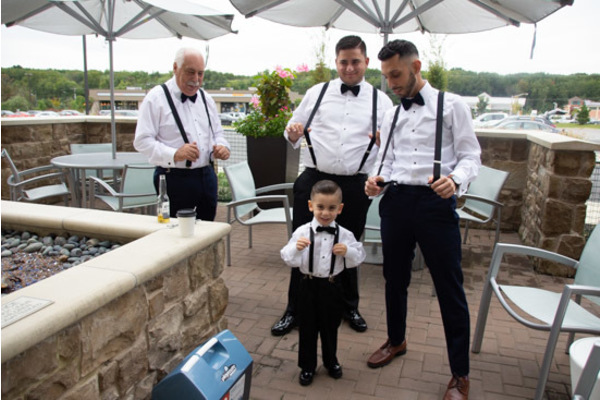 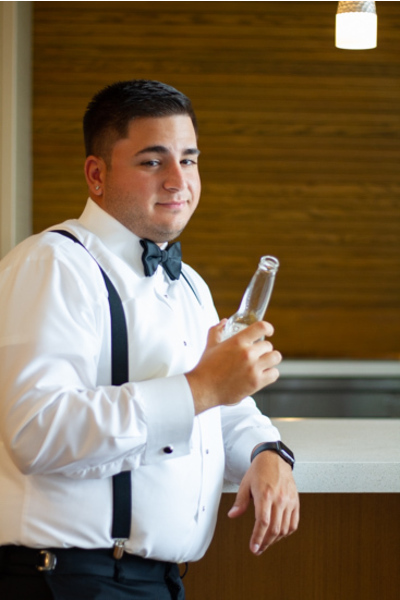 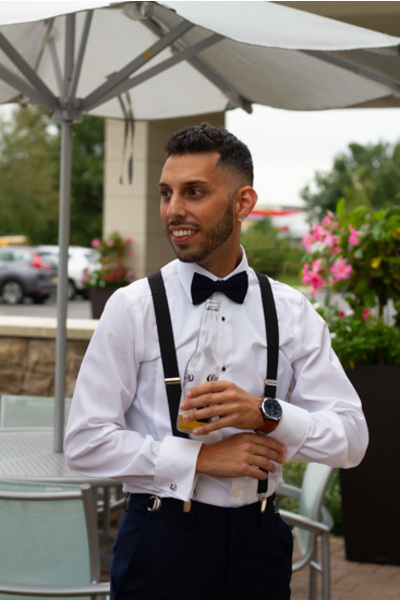 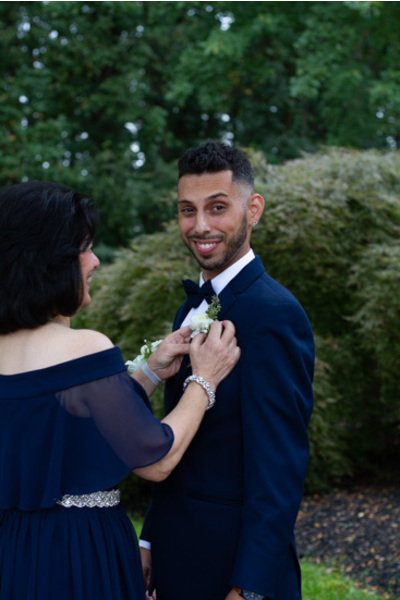 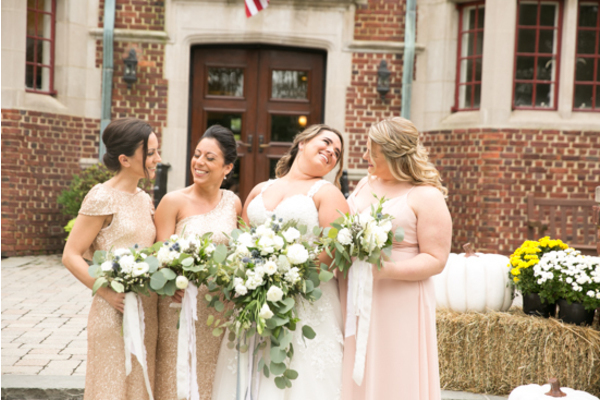 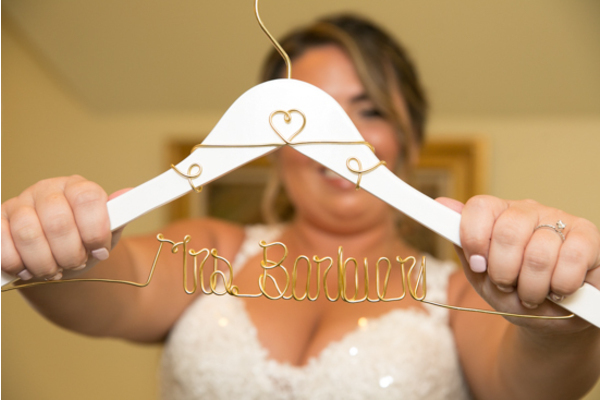 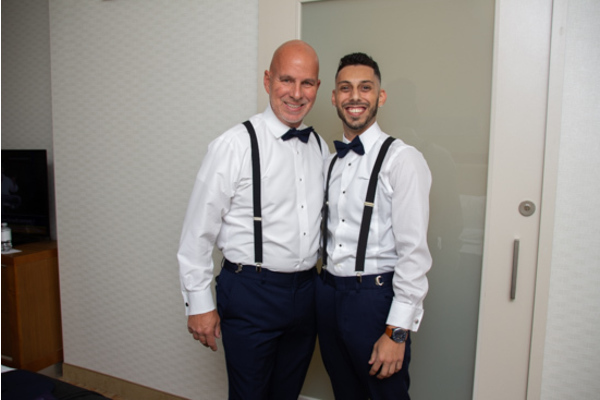 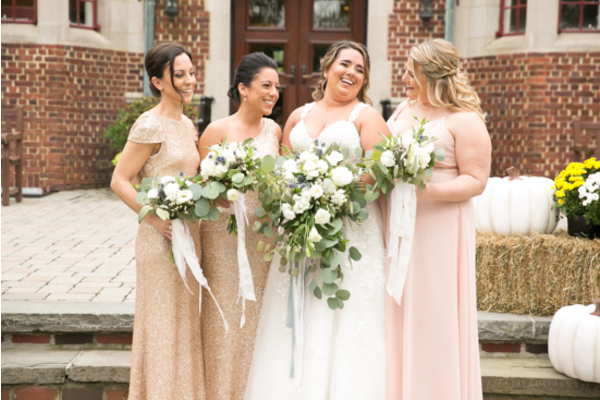 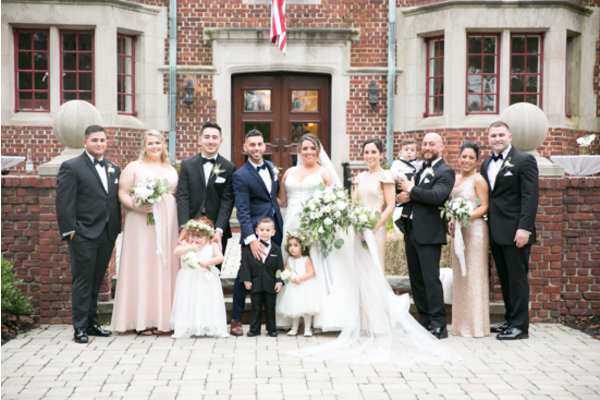 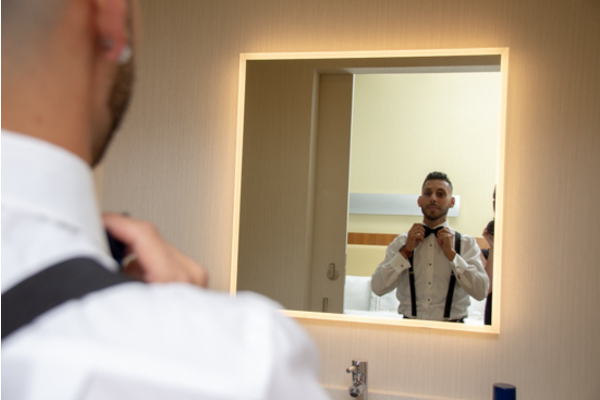 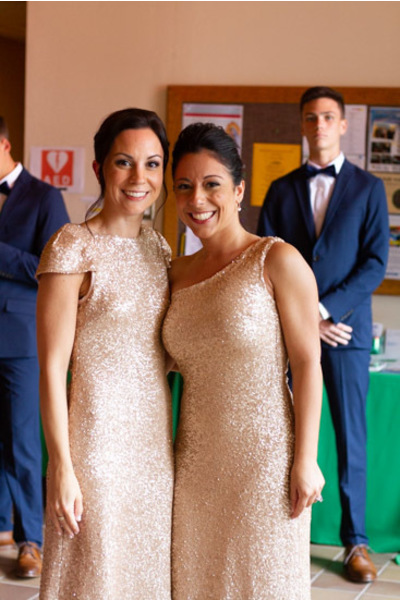 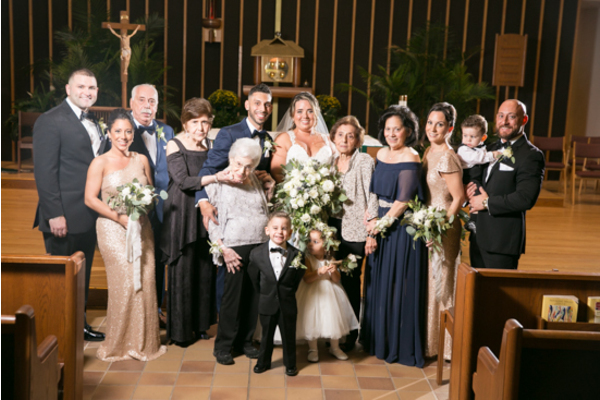 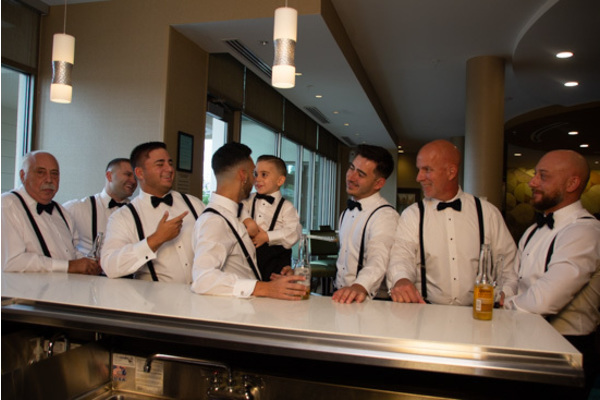 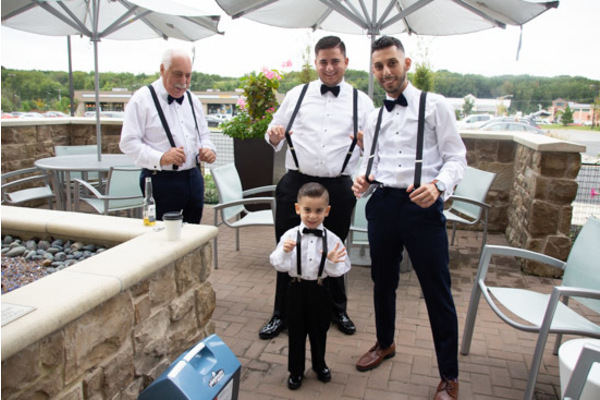 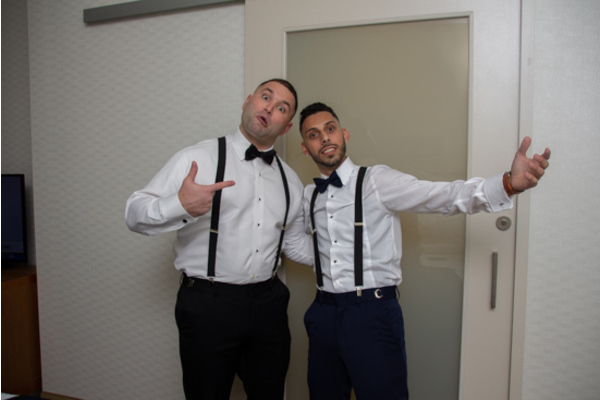 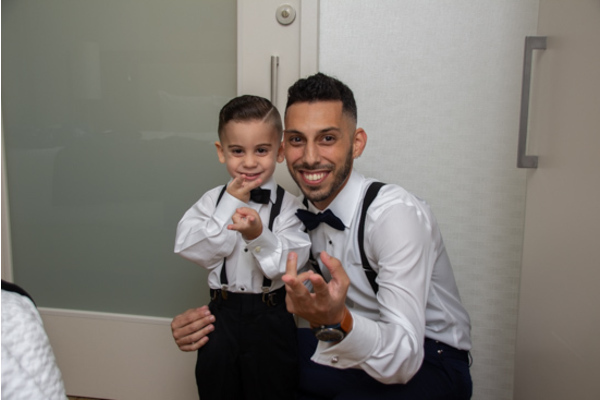 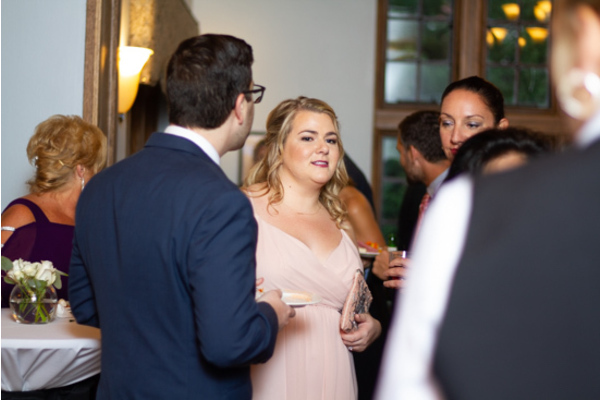 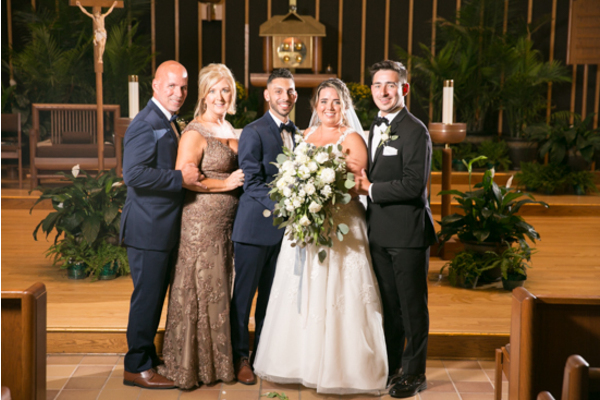 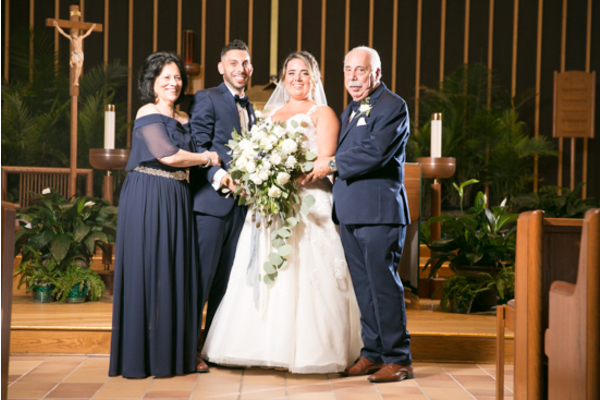 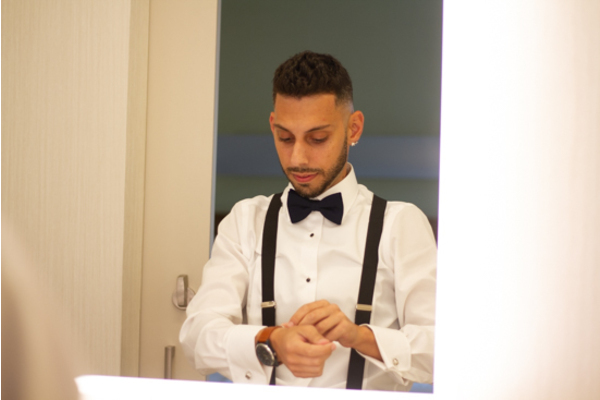 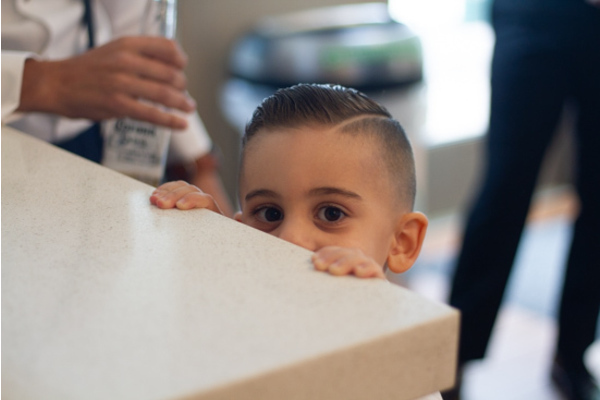 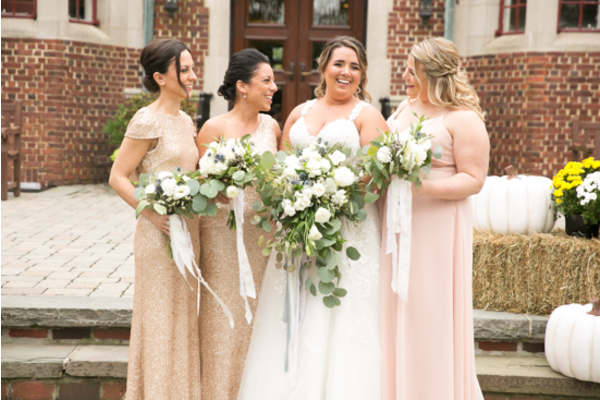 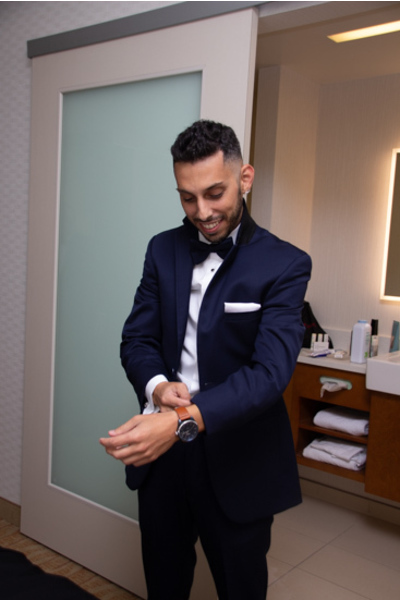 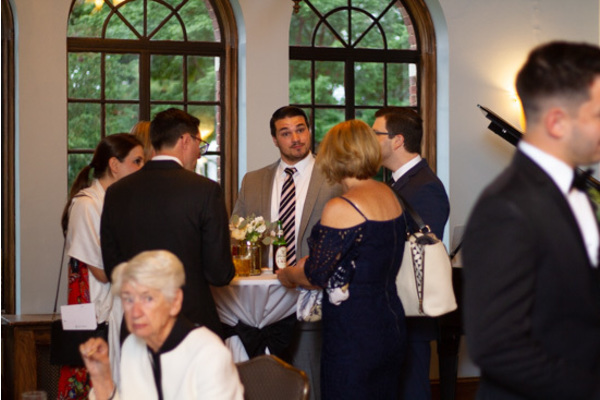 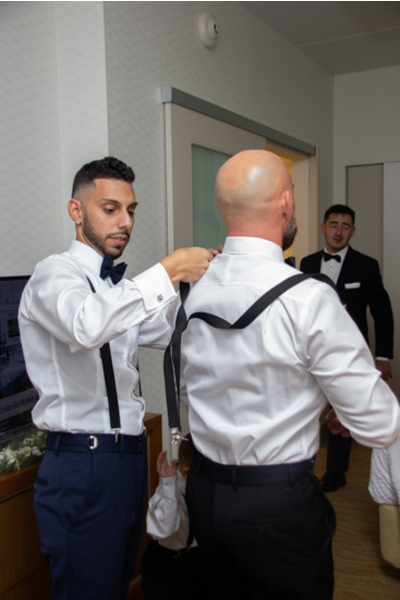 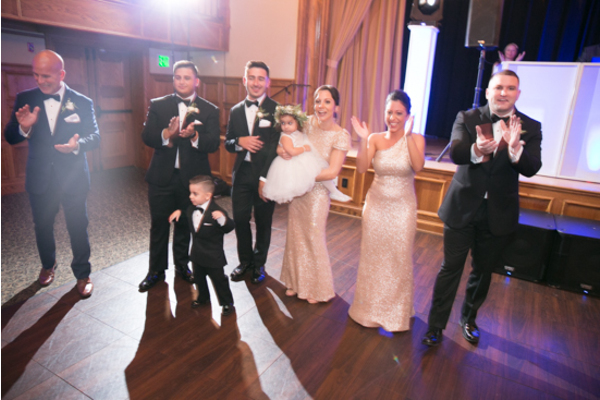 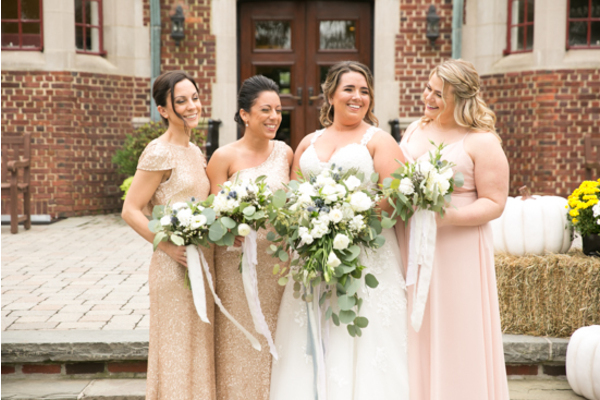 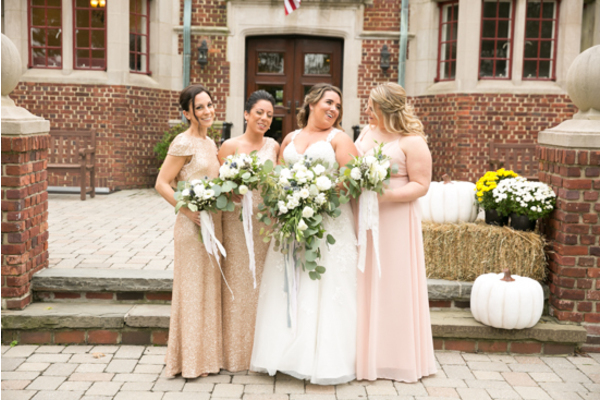 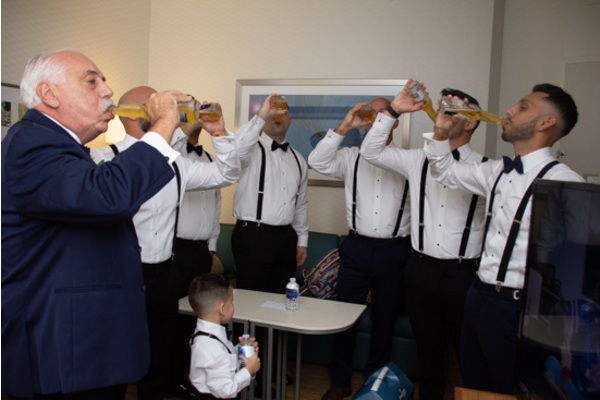 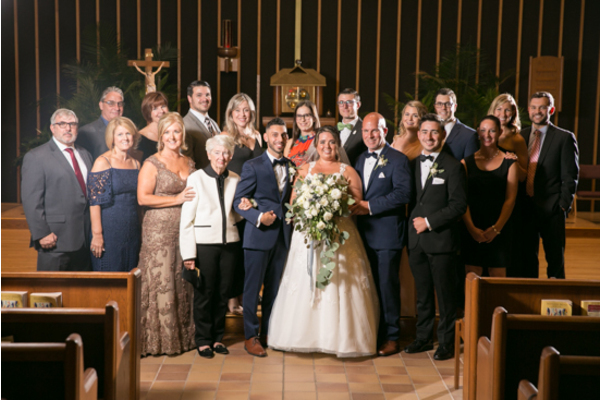 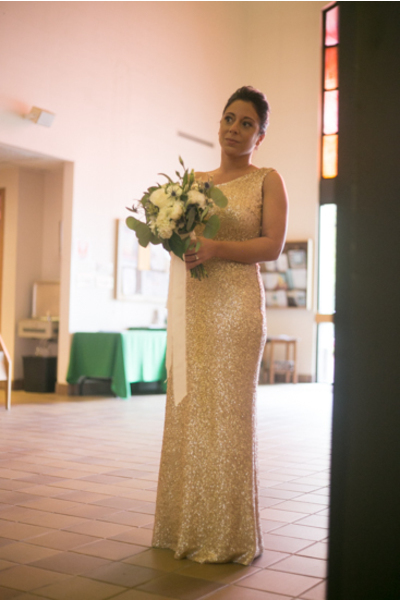 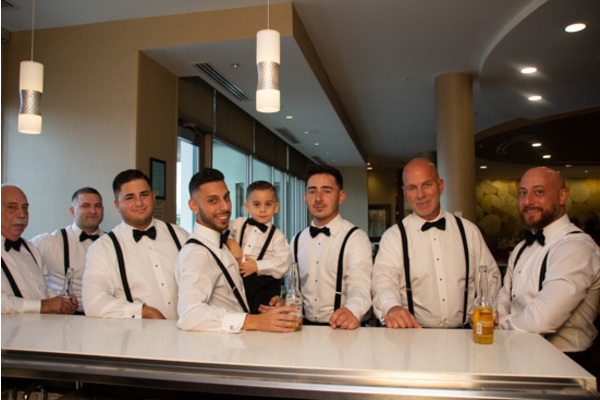 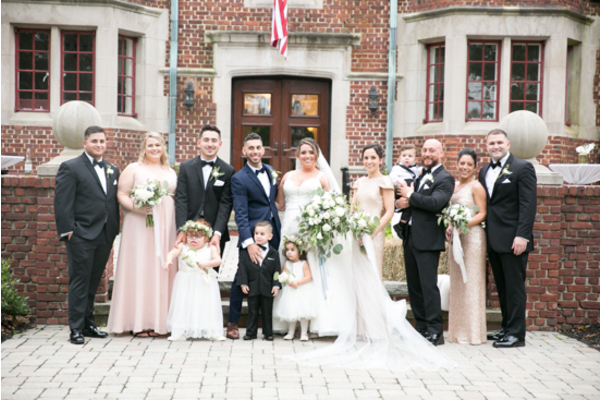 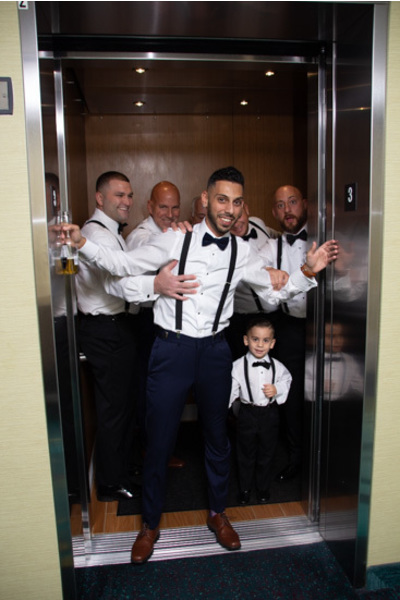 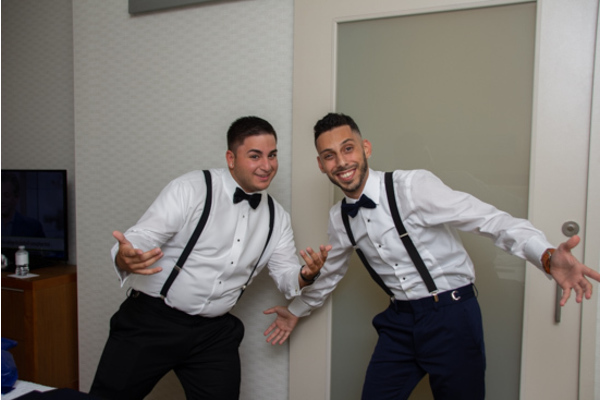 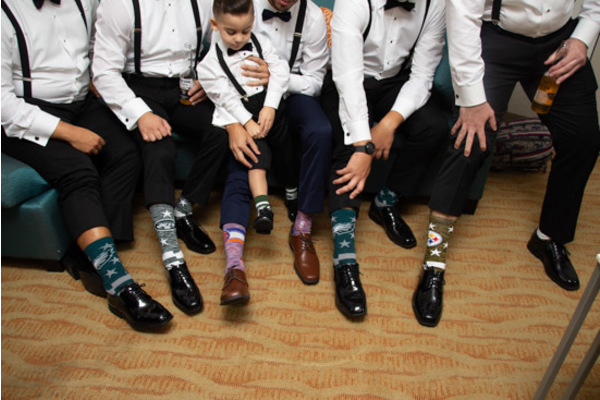 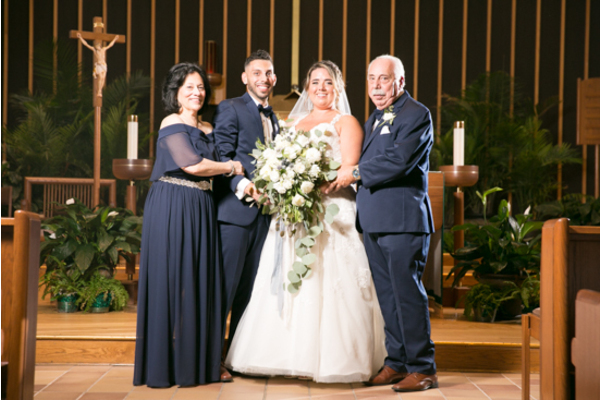 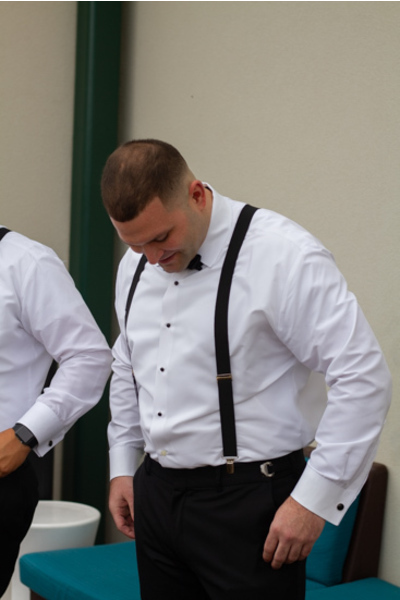 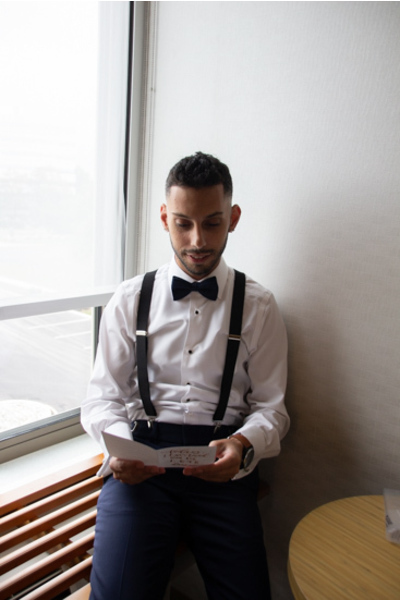 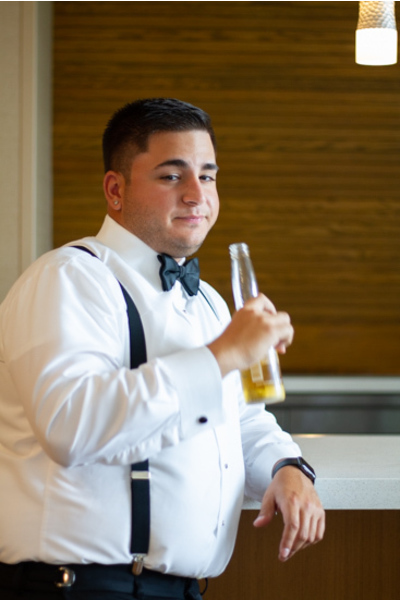 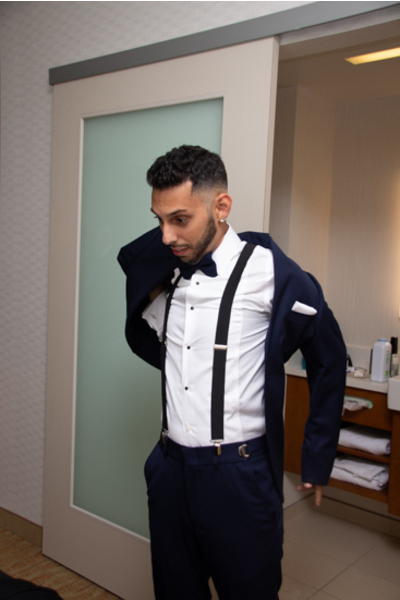 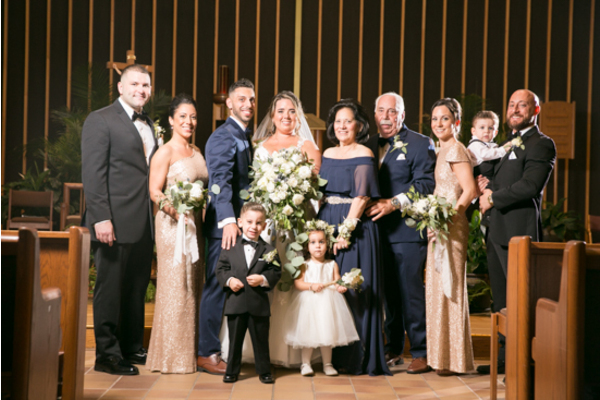 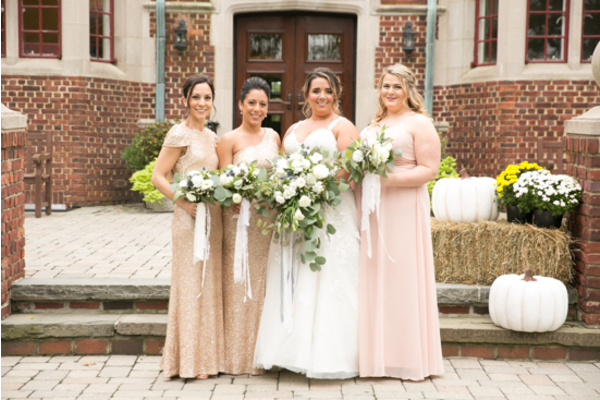 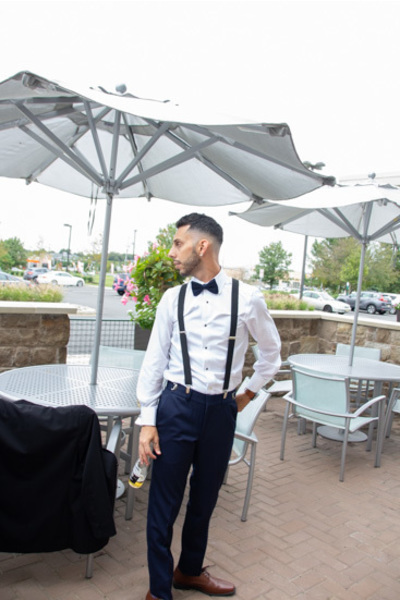 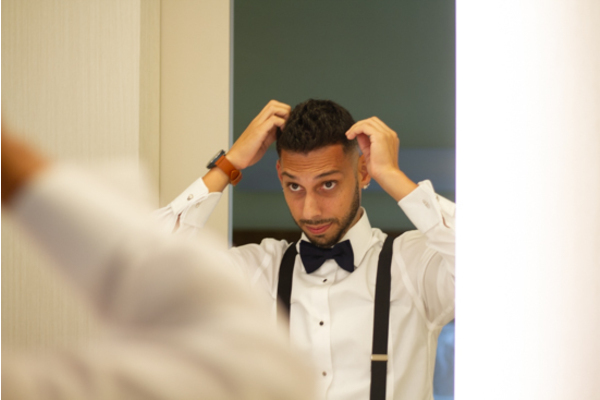 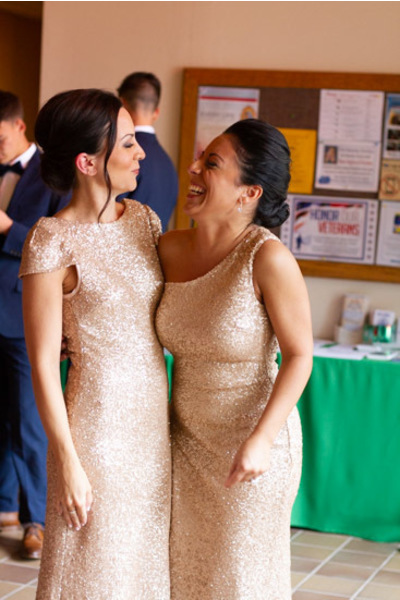 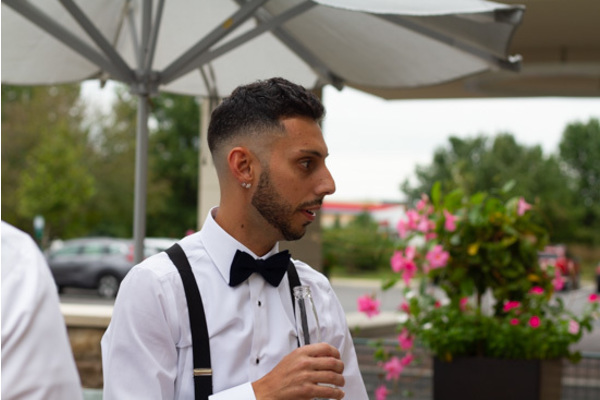 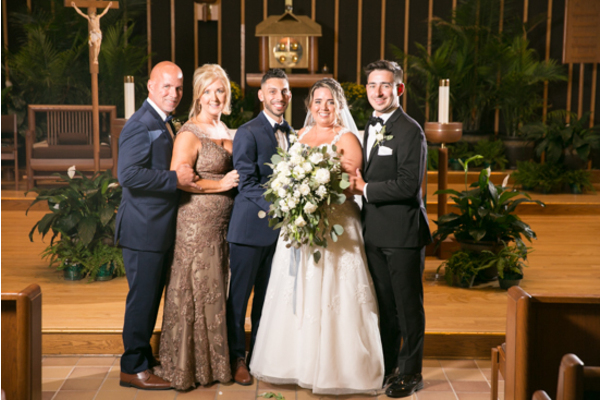 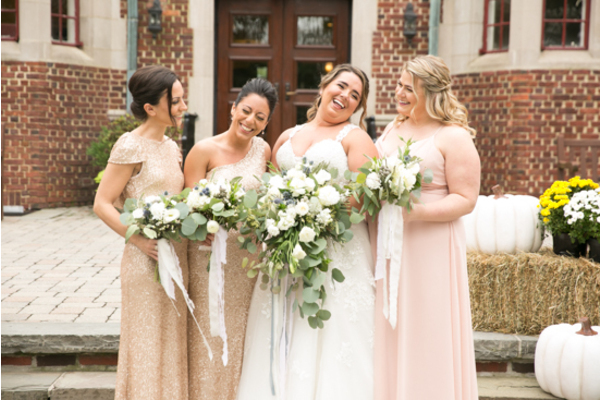 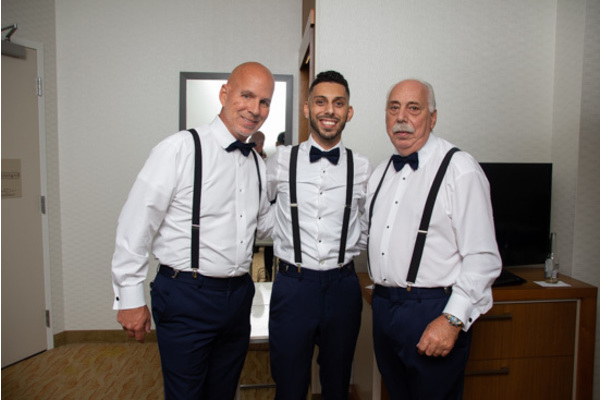 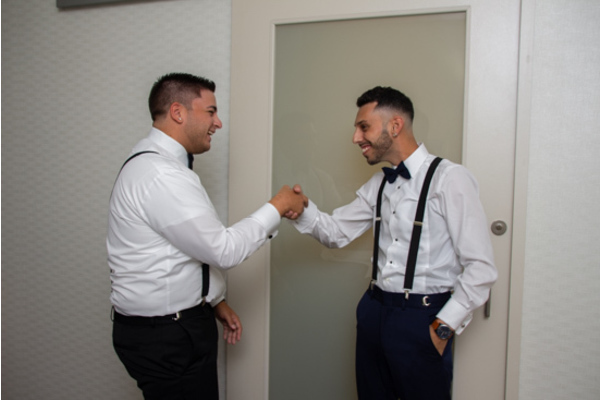 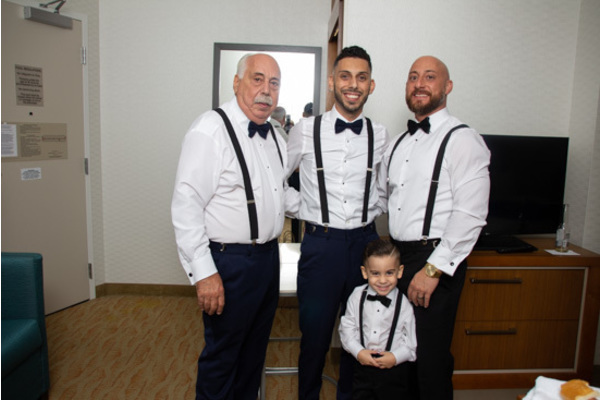 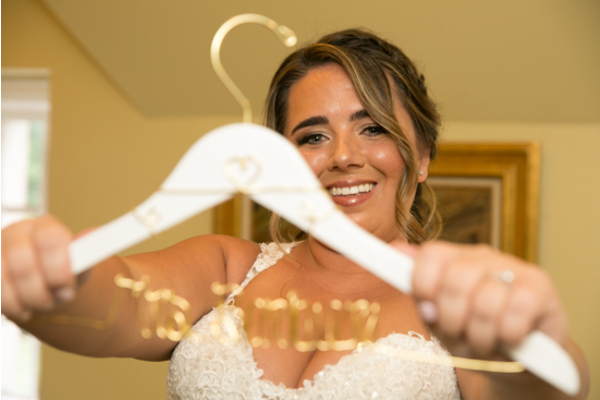 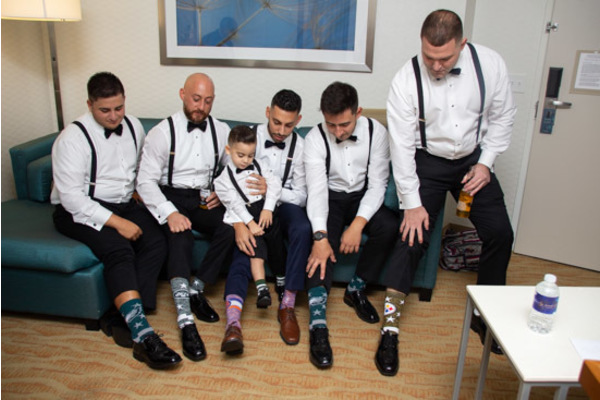 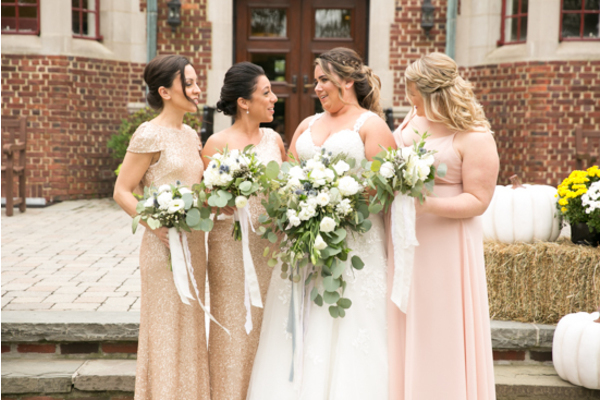 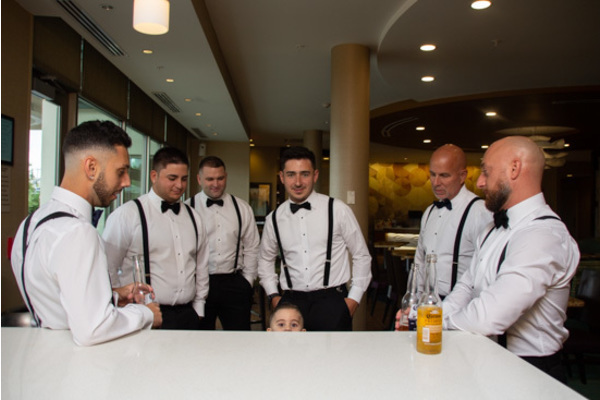 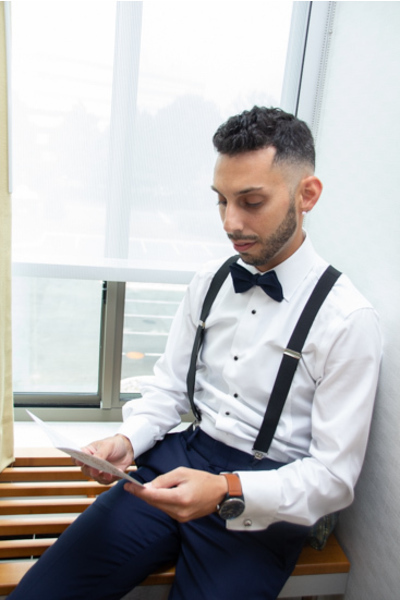 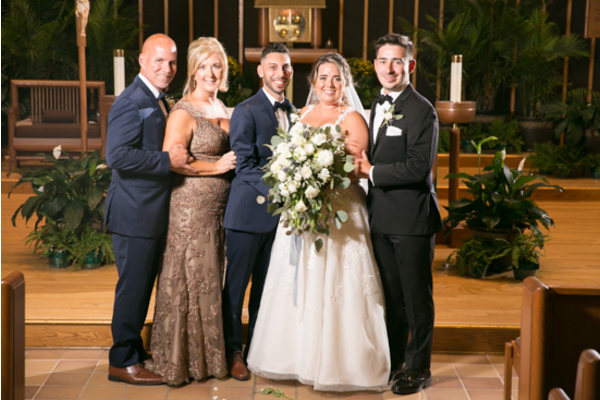 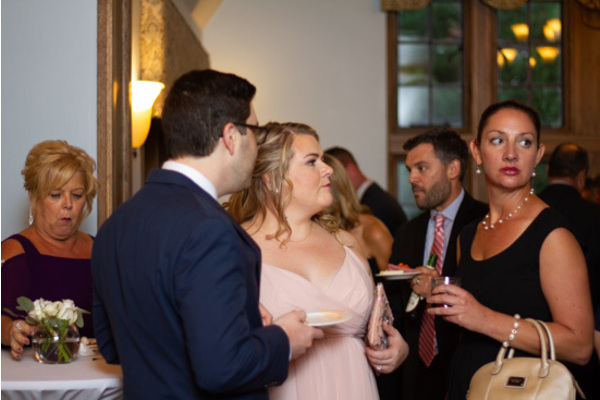 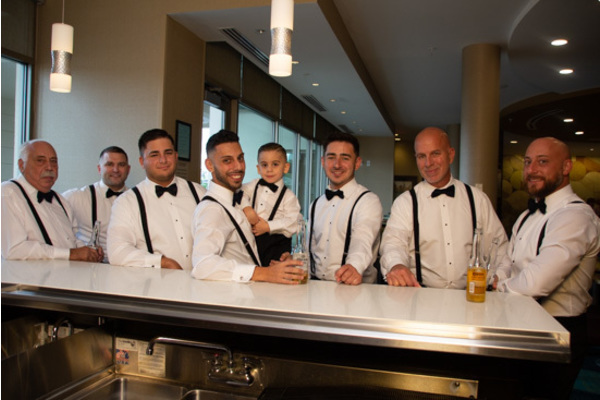 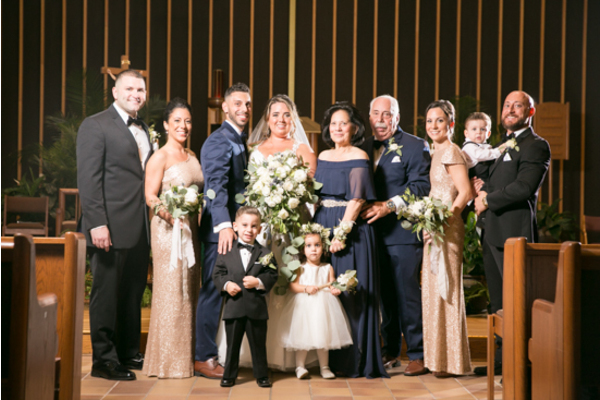 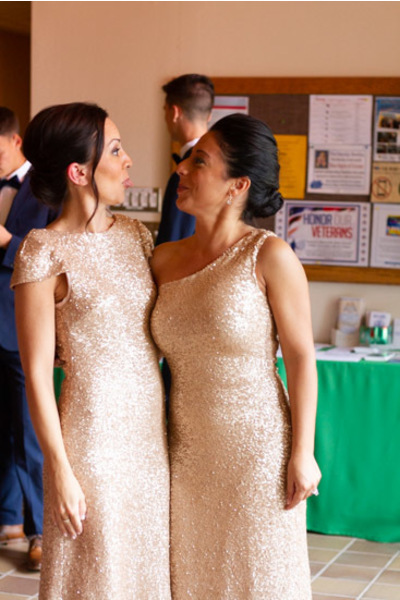 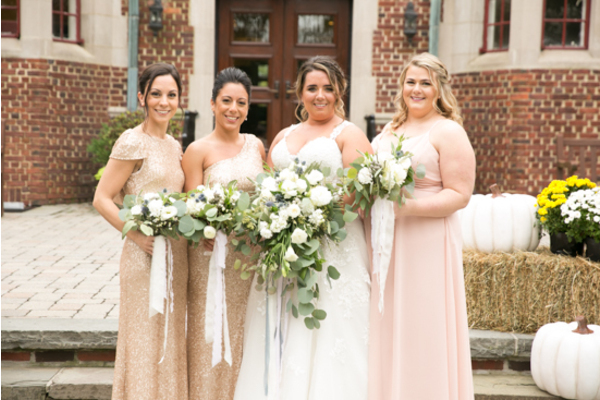 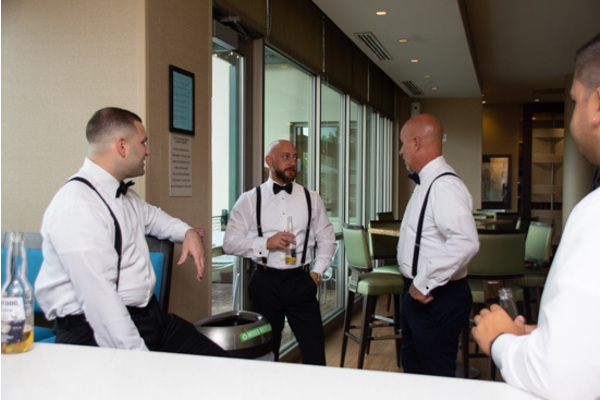 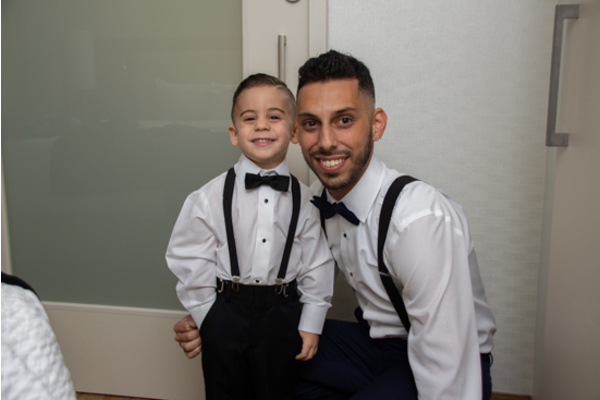 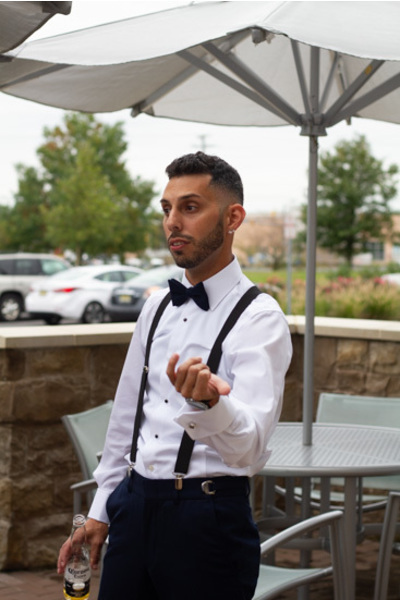 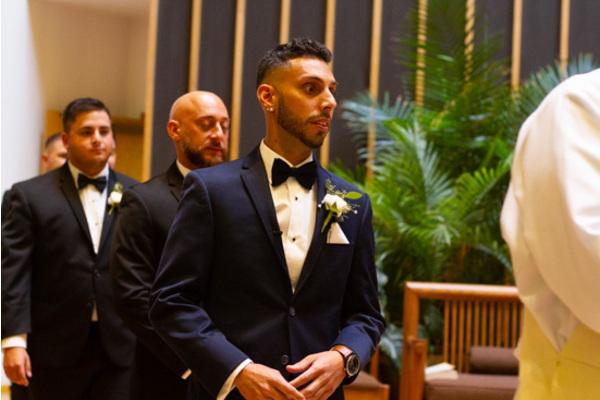 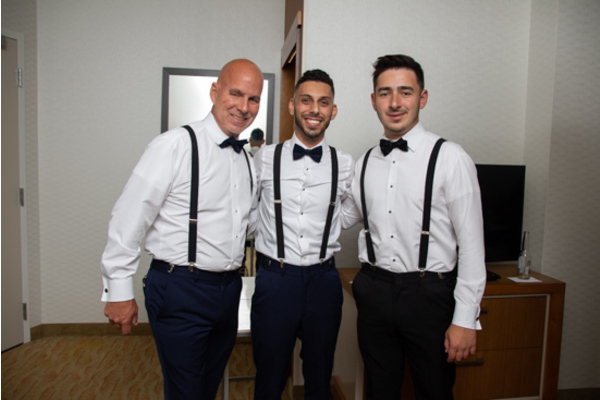 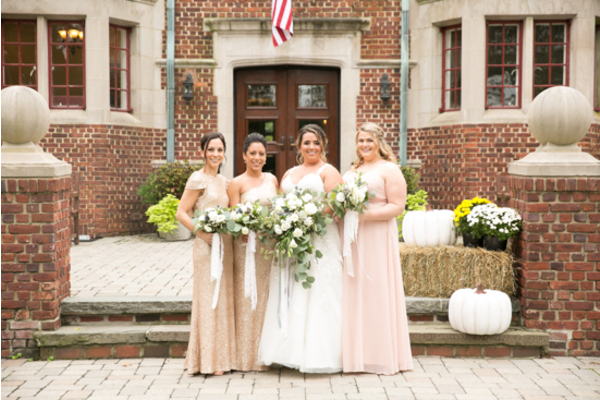 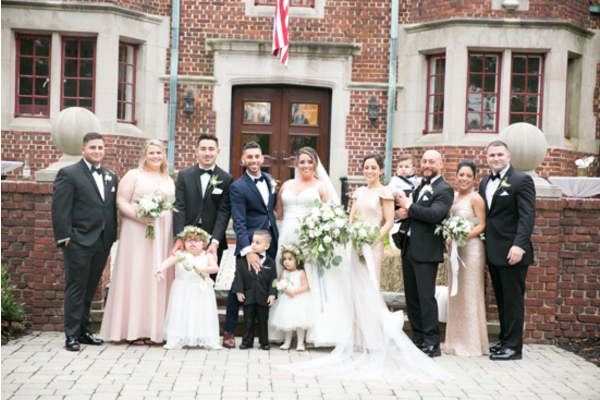 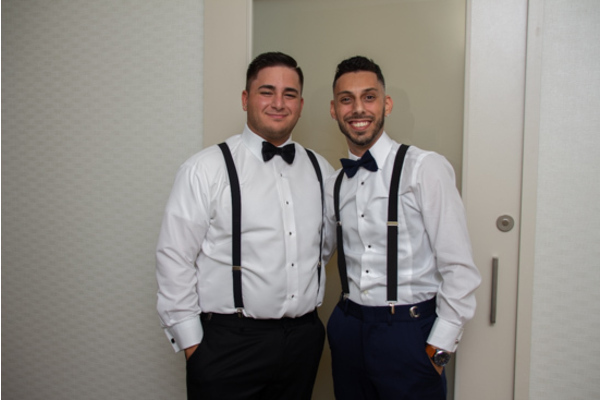 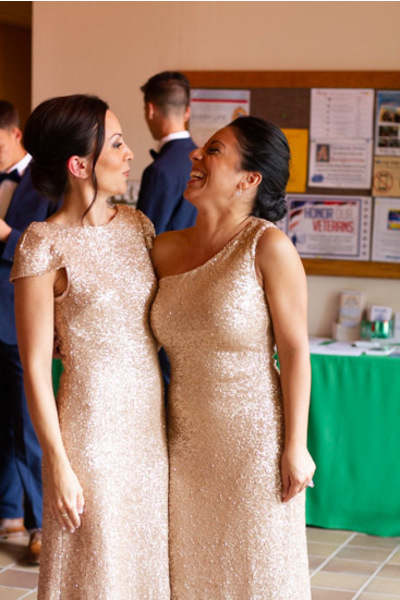 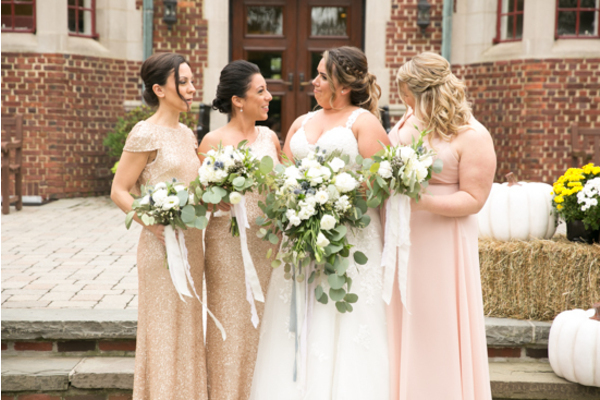 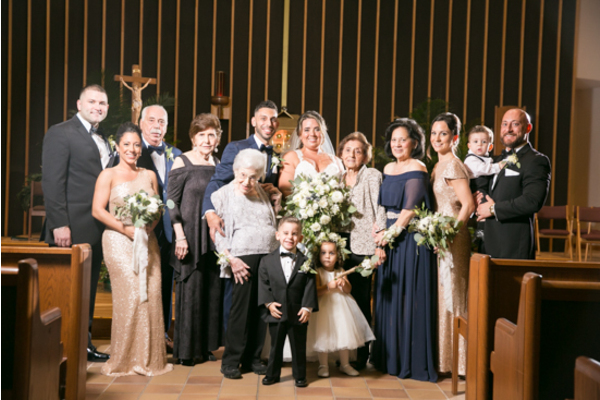 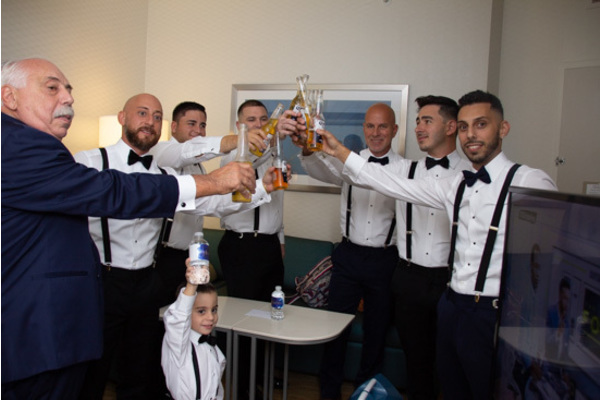 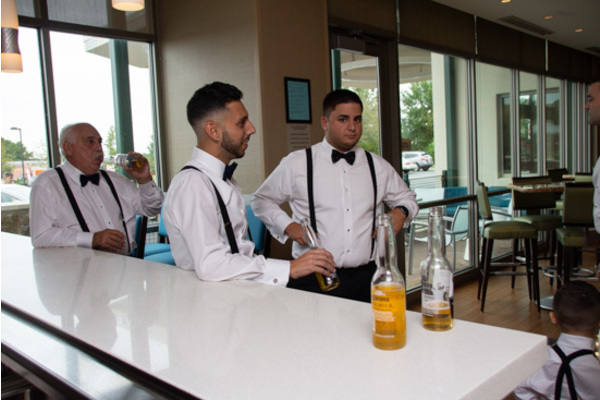 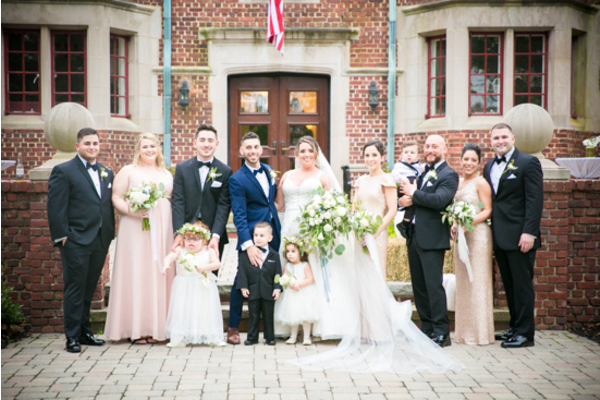 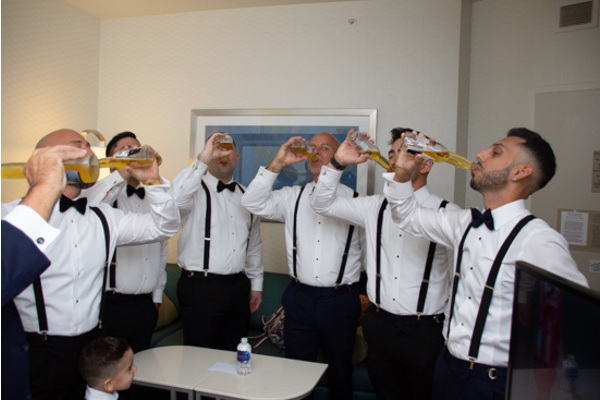 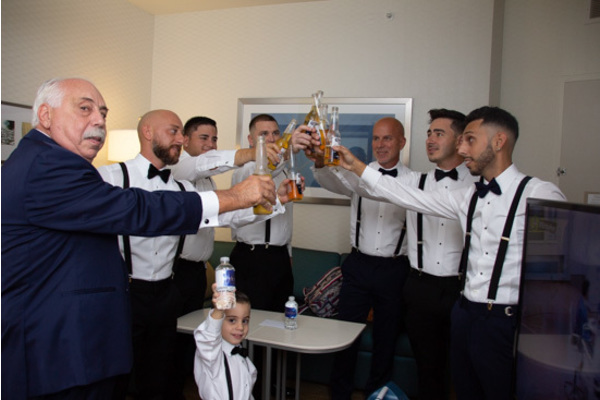 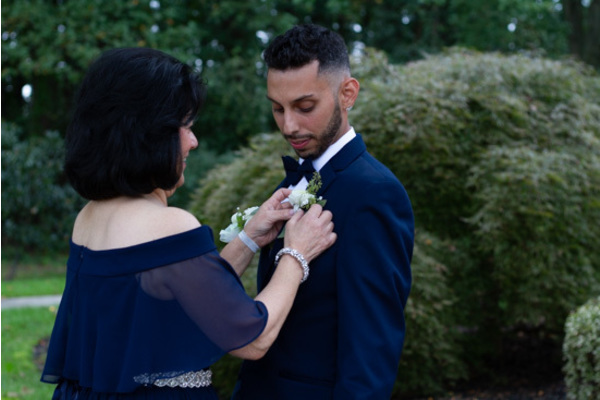 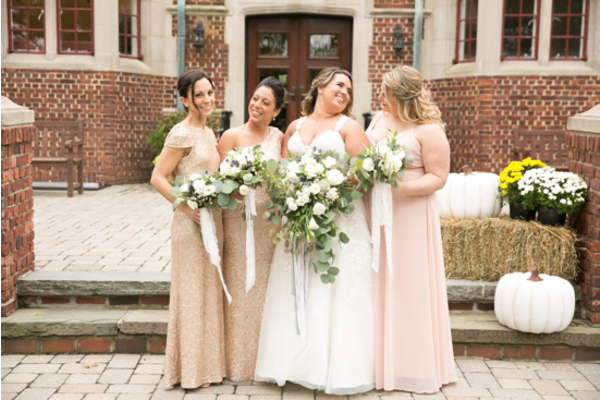 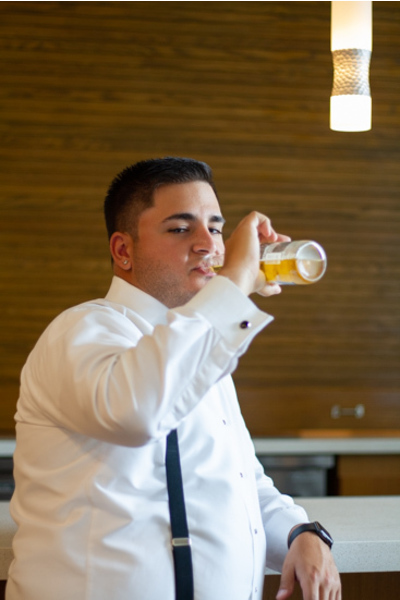 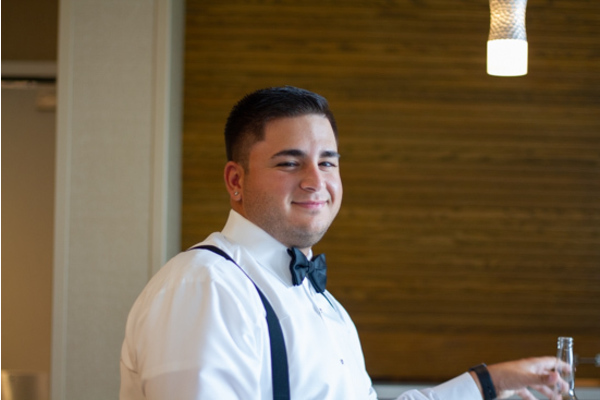 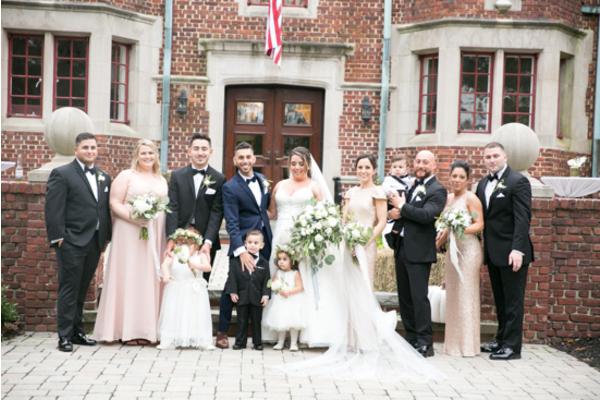 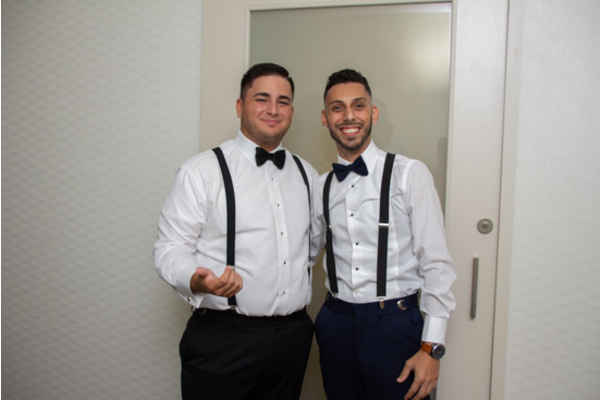 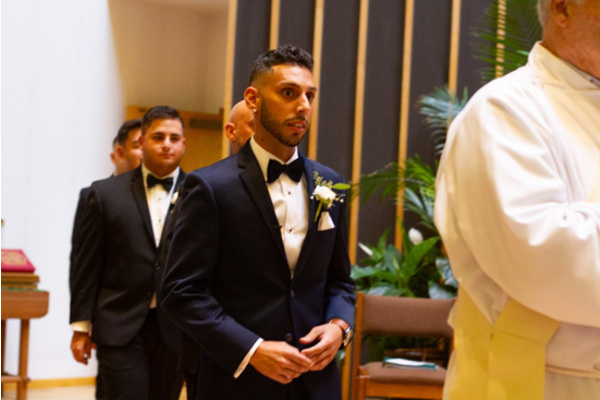 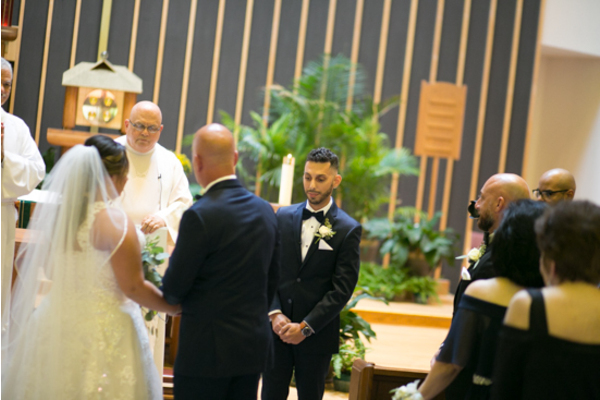 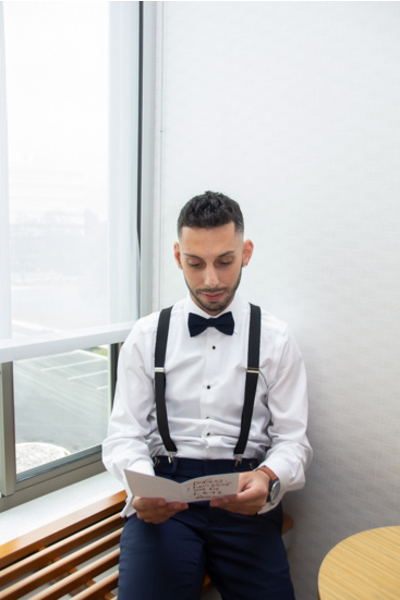 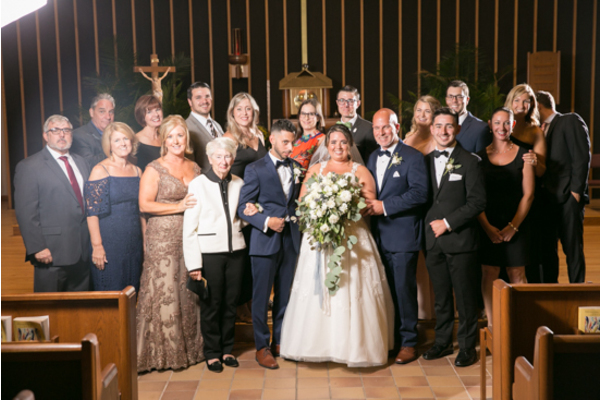 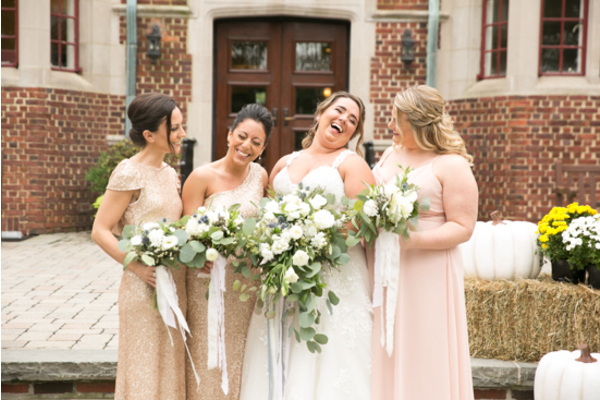 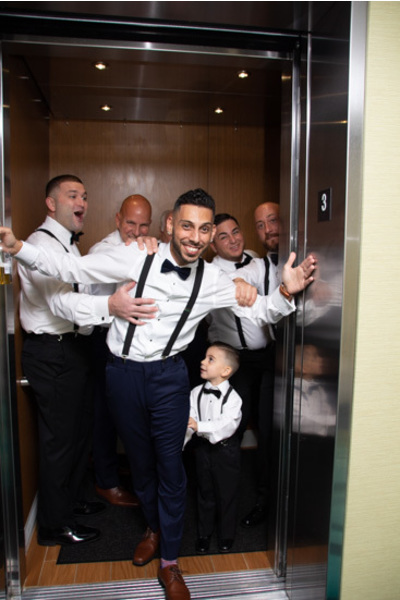 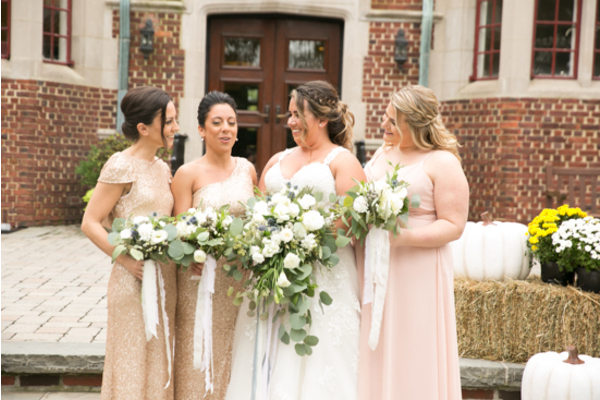 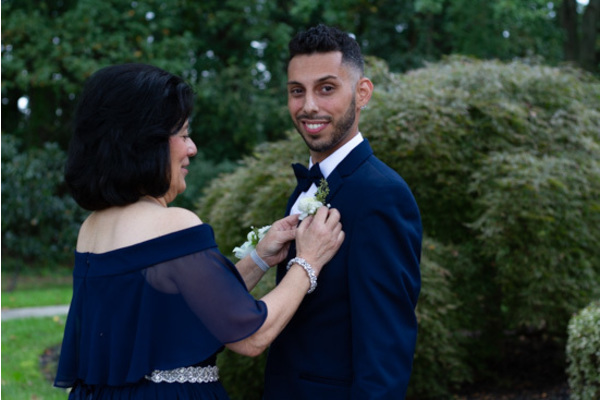 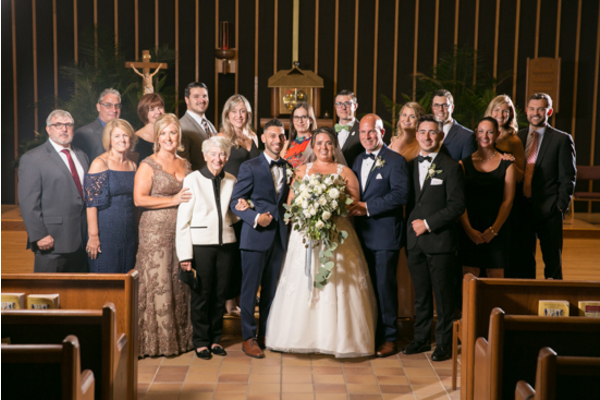 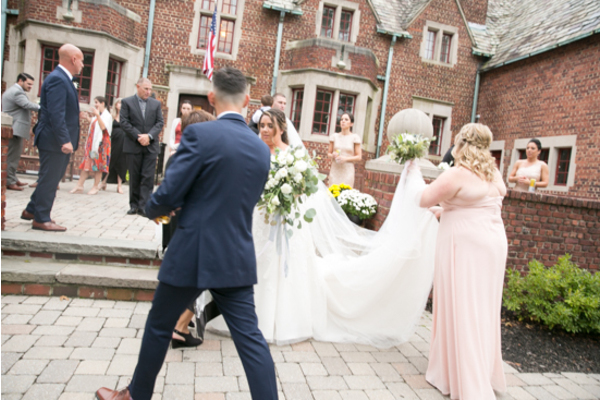 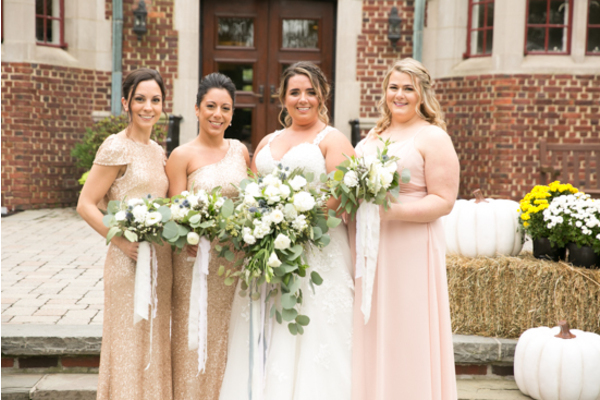 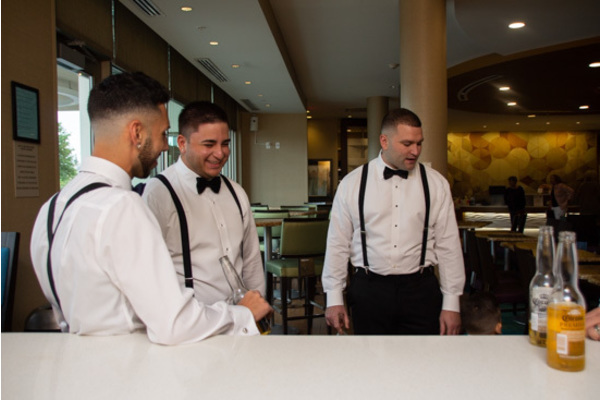 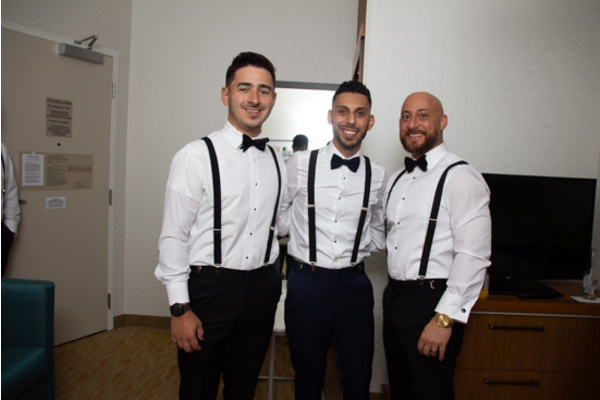 Our NJ Wedding Photographer got amazing shots of the bridal party and the newlyweds before the reception began. 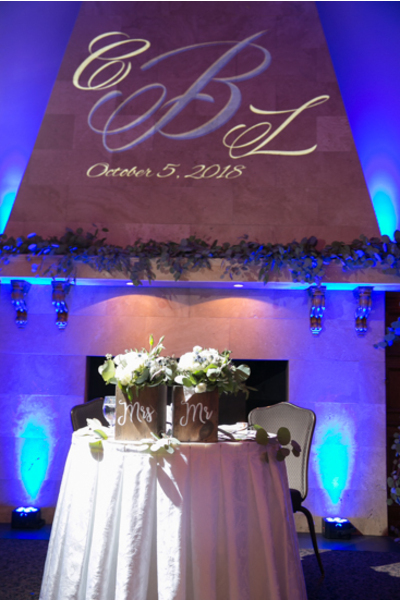 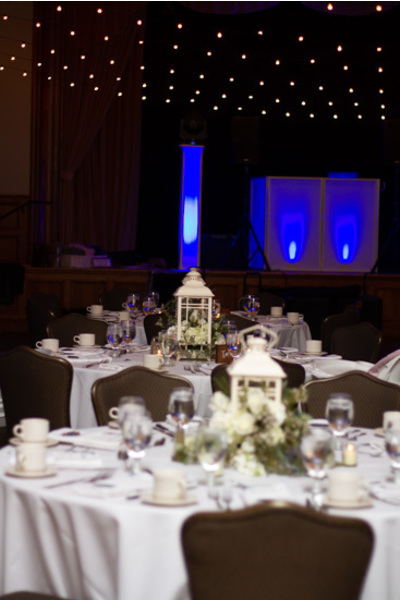 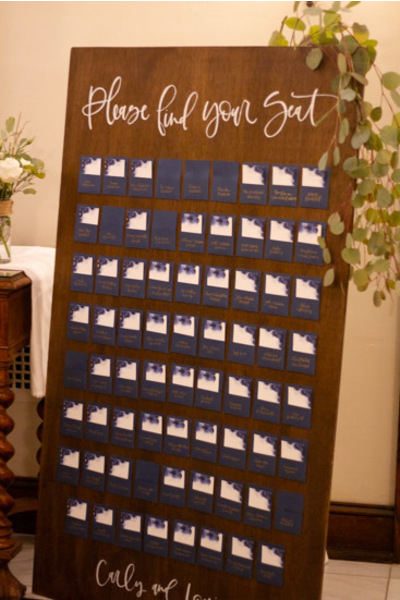 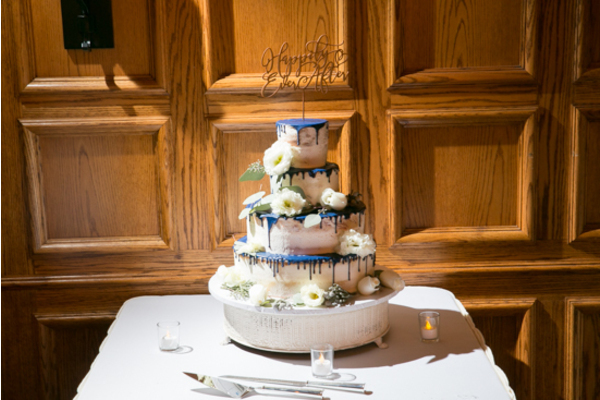 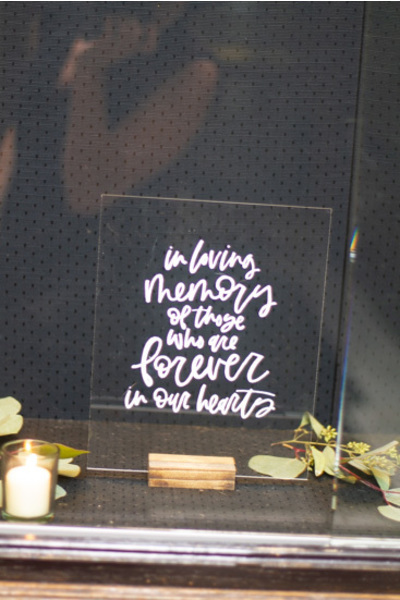 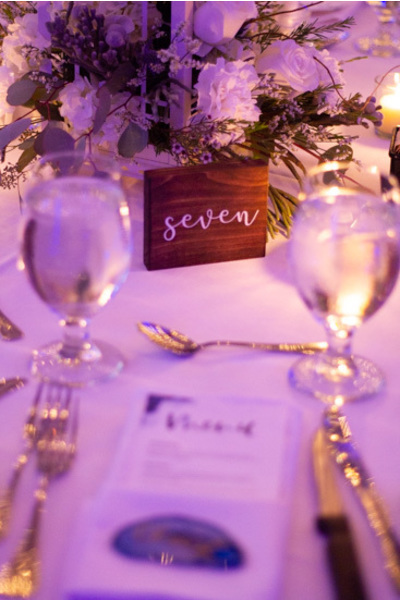 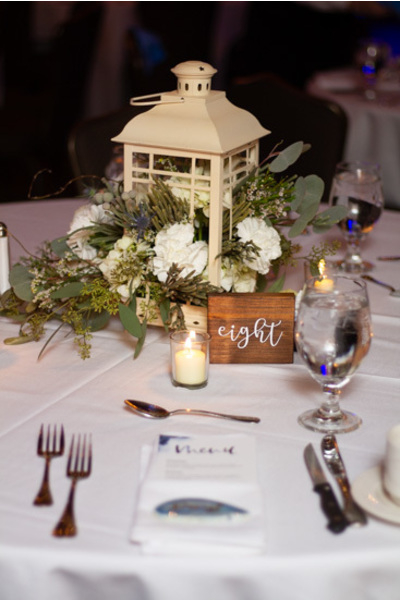 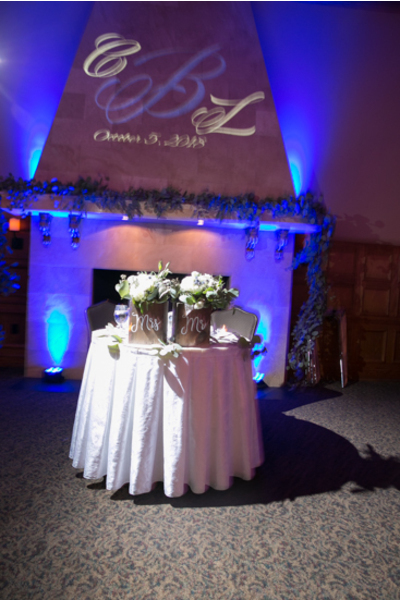 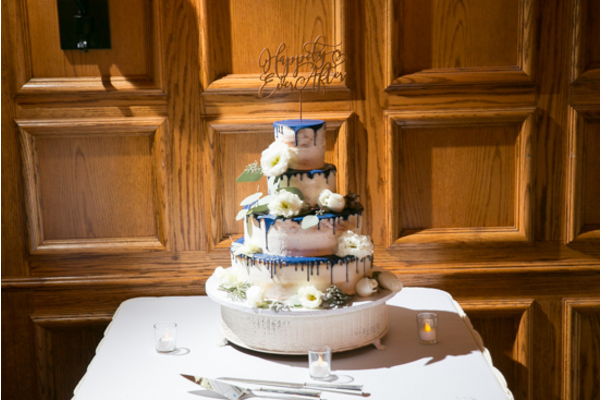 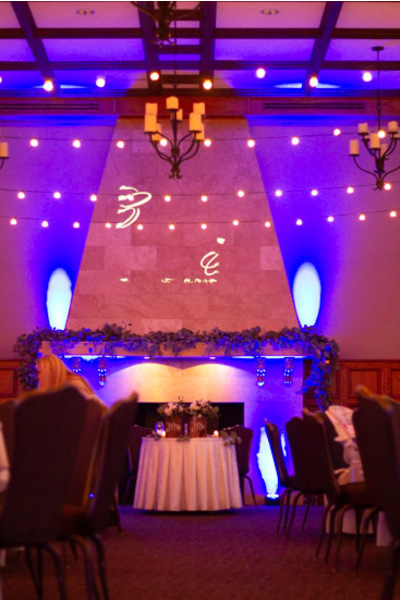 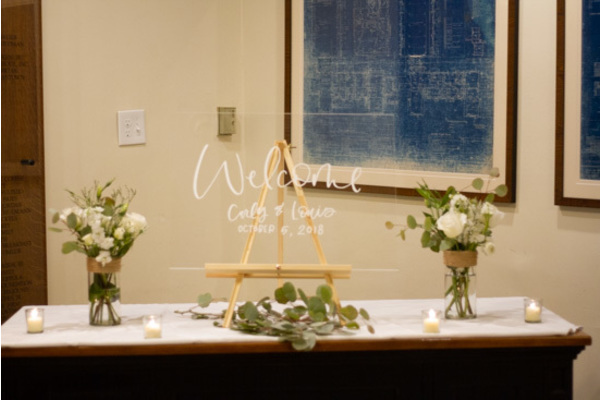 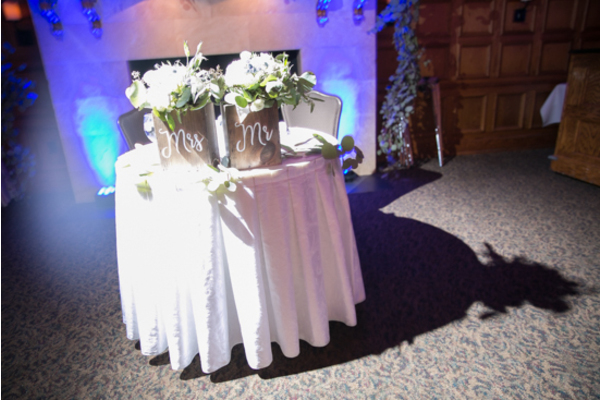 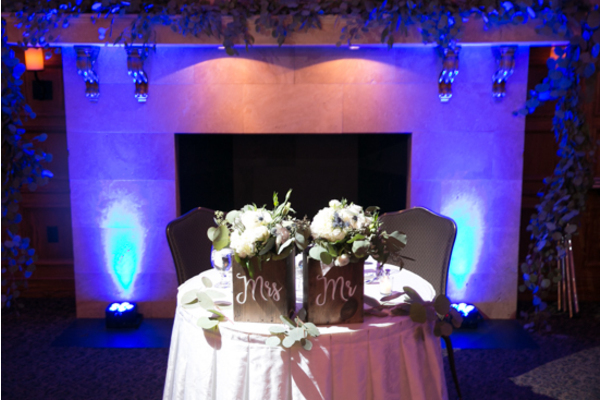 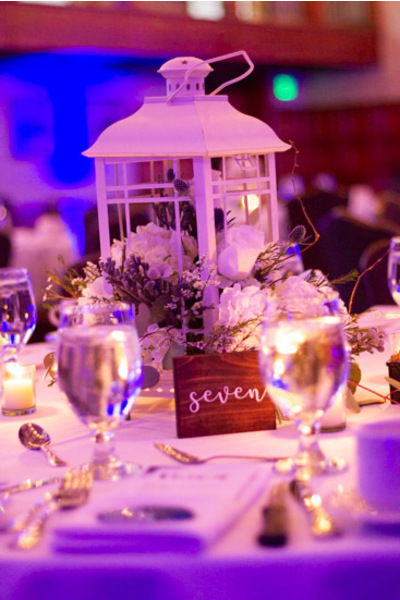 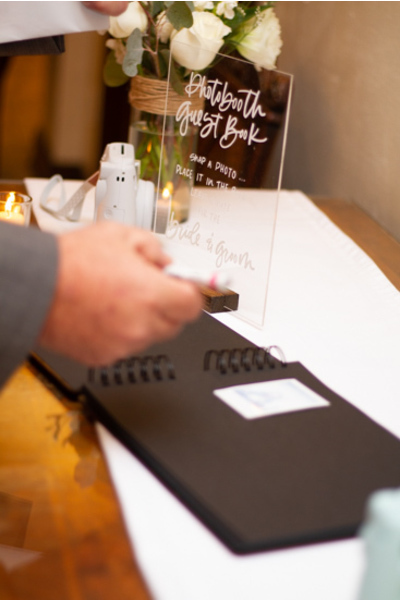 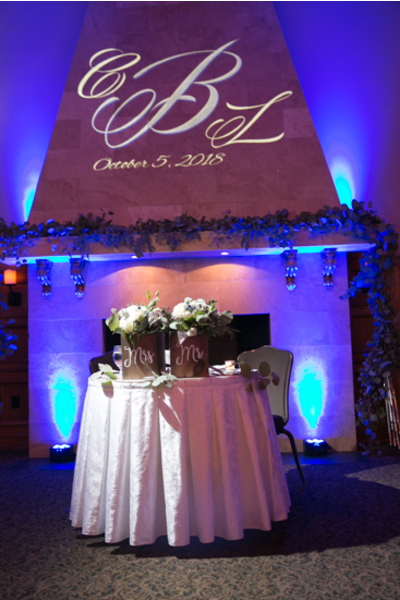 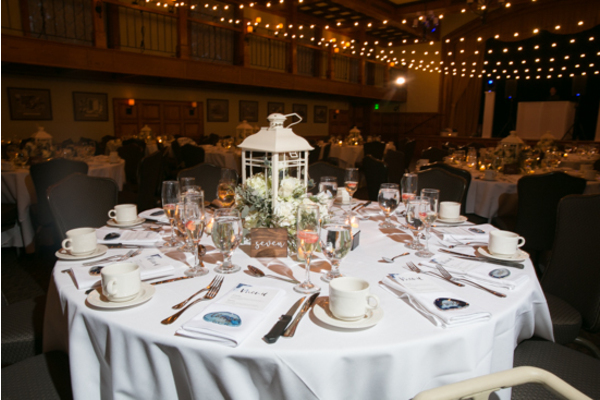 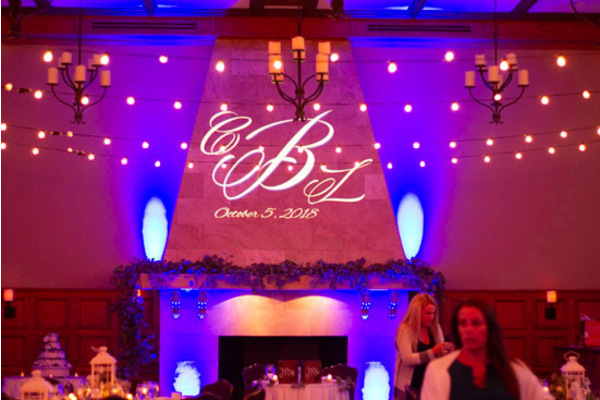 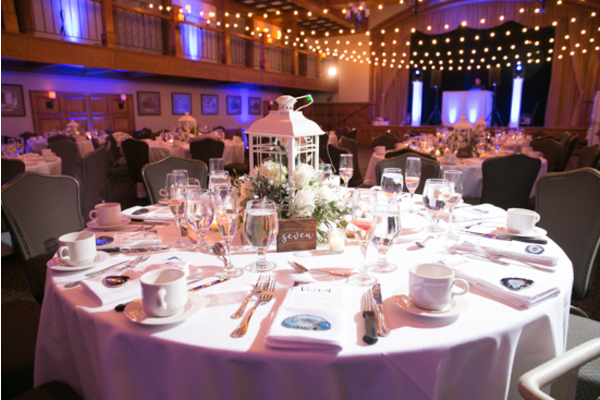 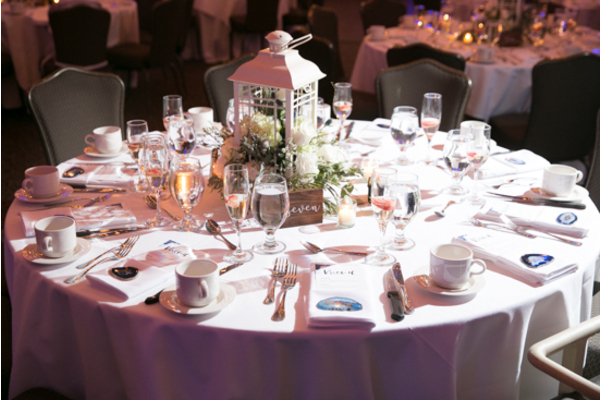 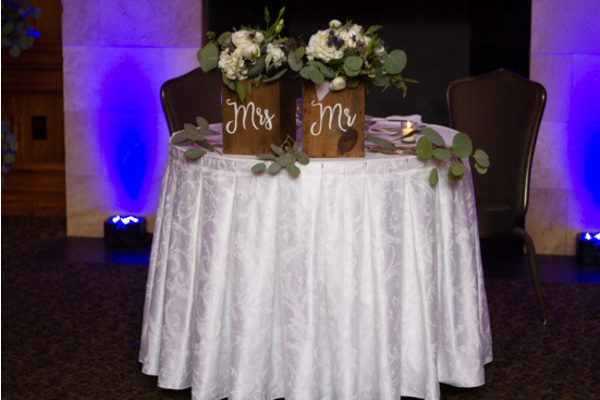 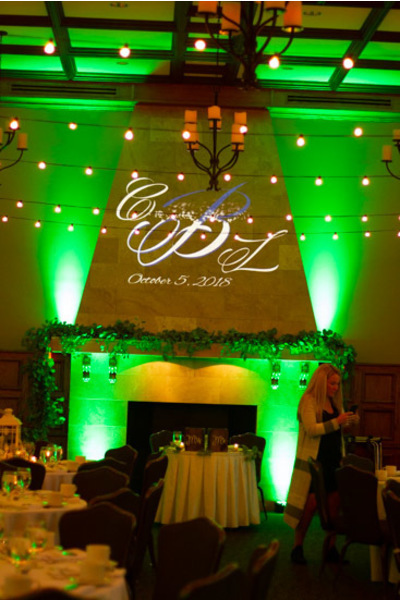 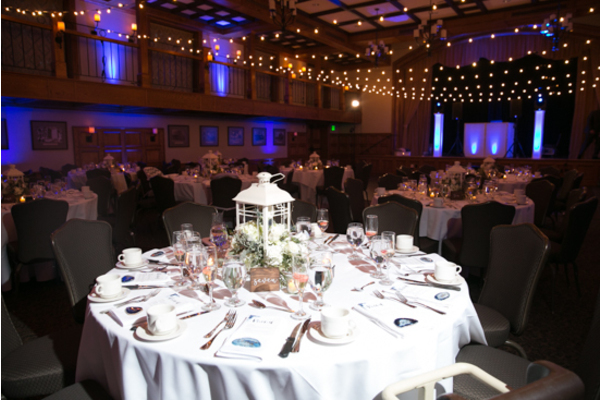 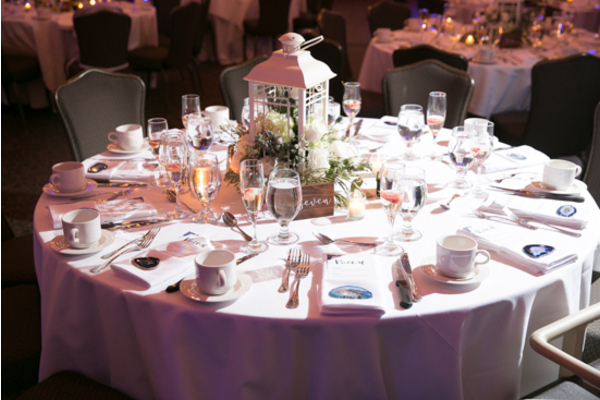 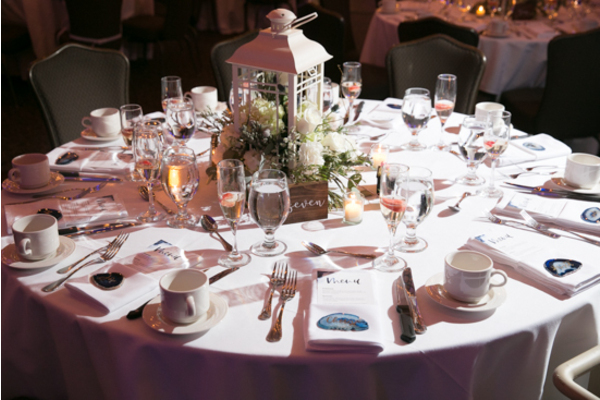 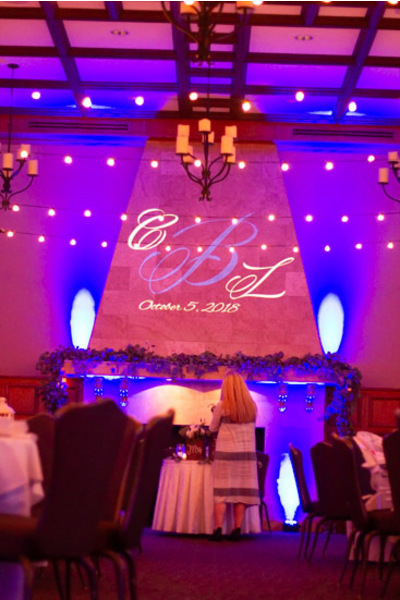 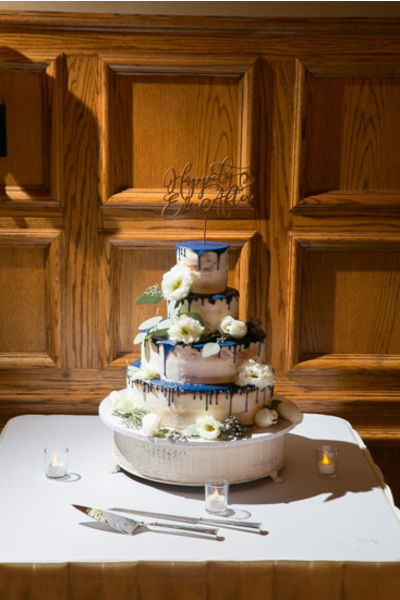 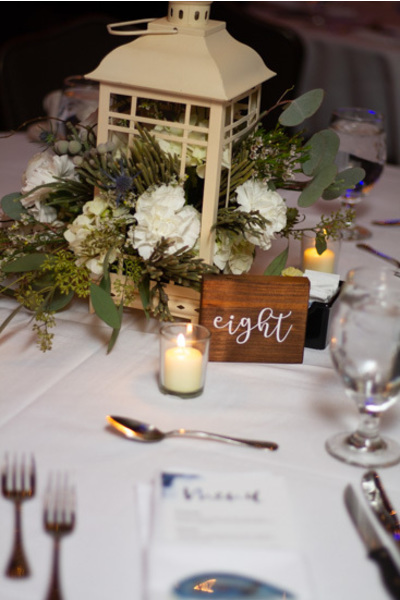 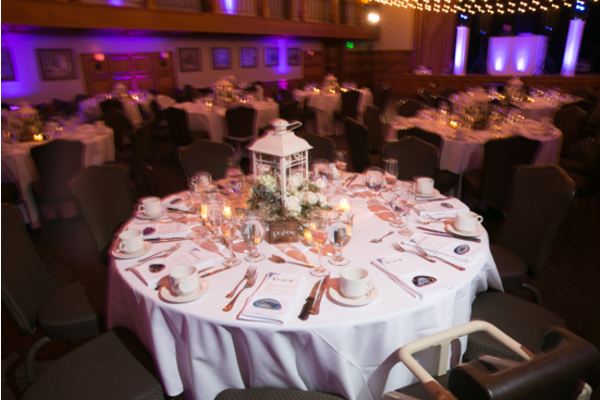 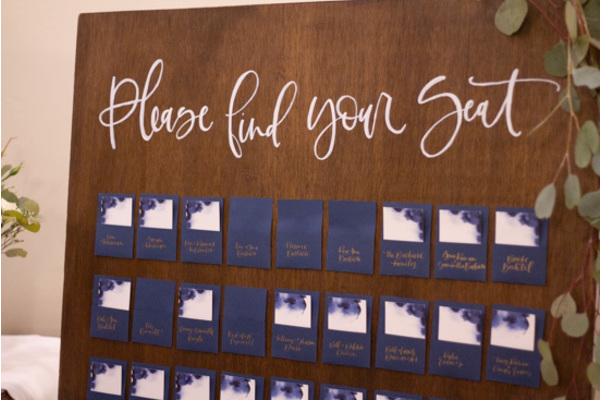 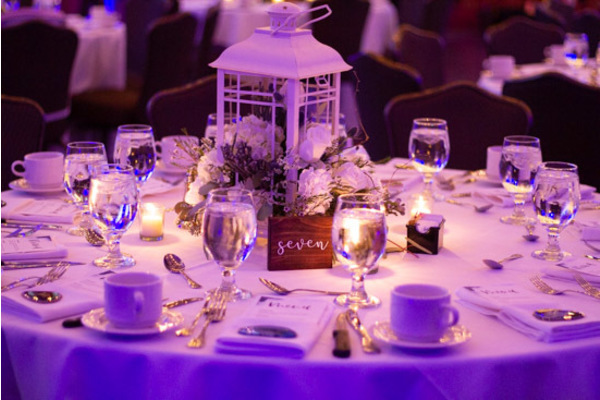 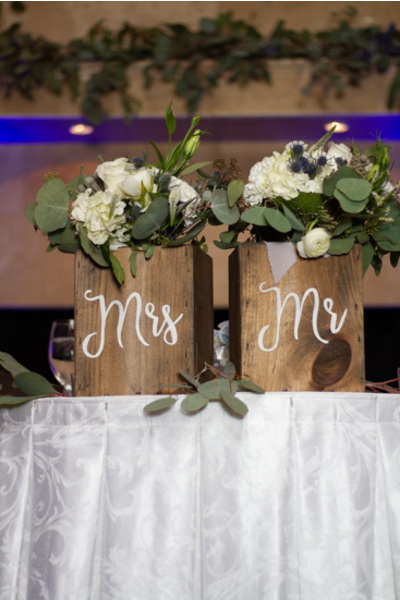 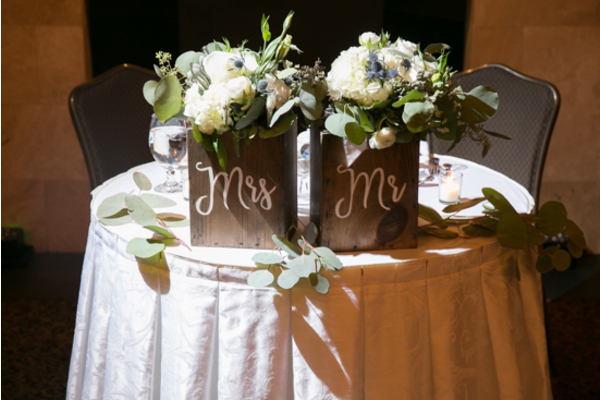 Above the sweetheart table was a monogram of their initials and their wedding date. 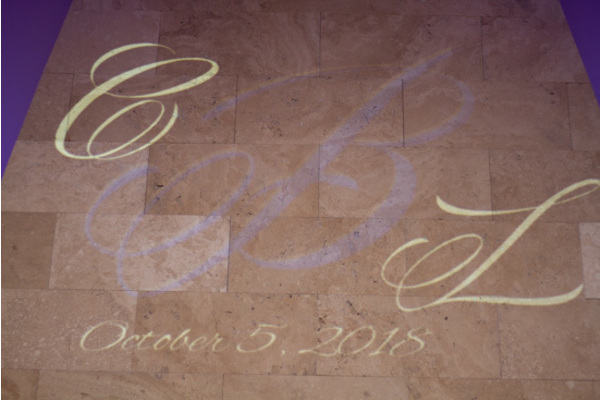 It was the perfect touch to the unforgettable night! 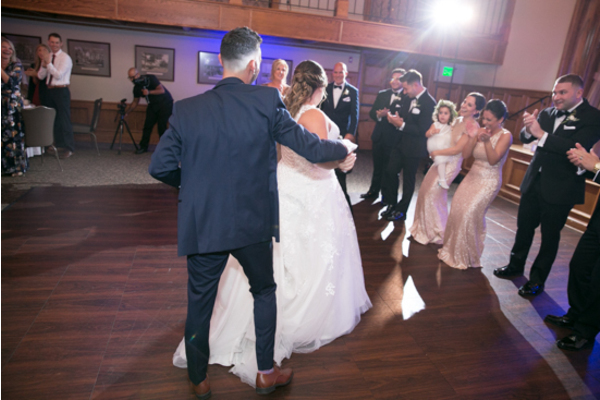 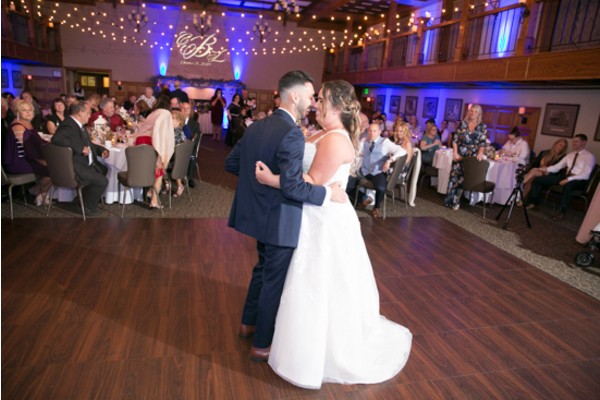 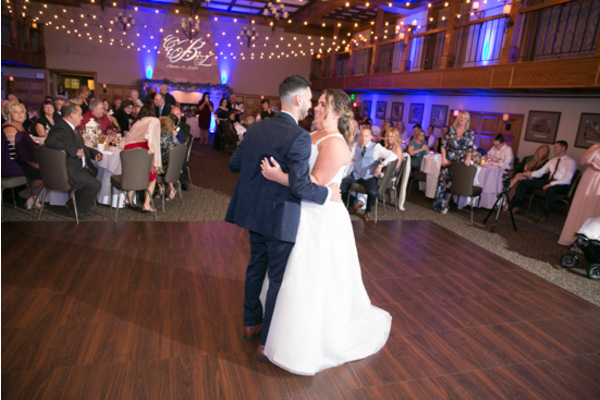 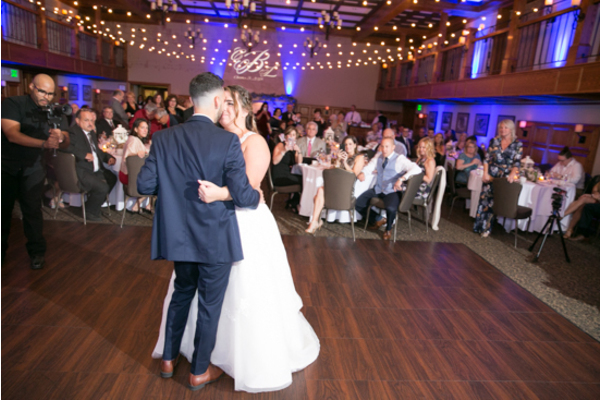 Carly and Lou took center stage under the string lighting for their first dance. 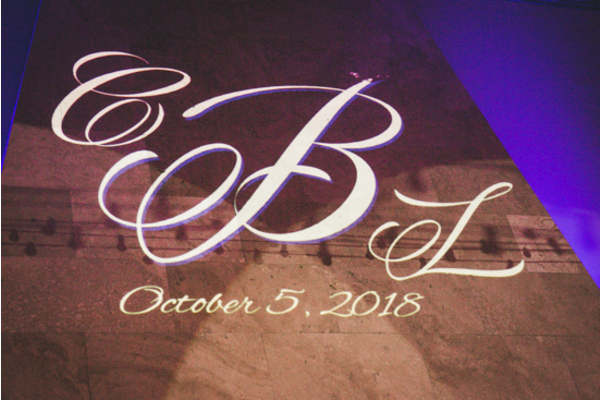 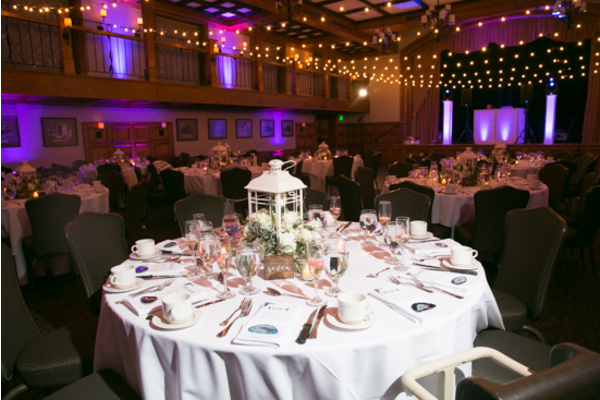 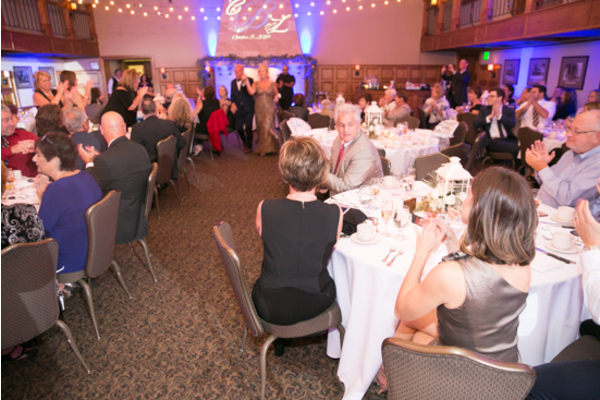 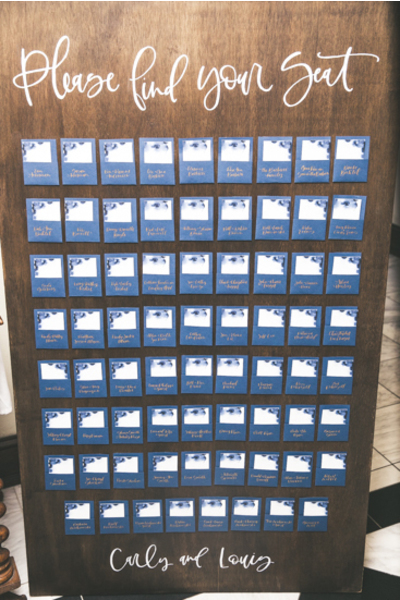 It was such a night to remember and we are so happy to have been included in it! 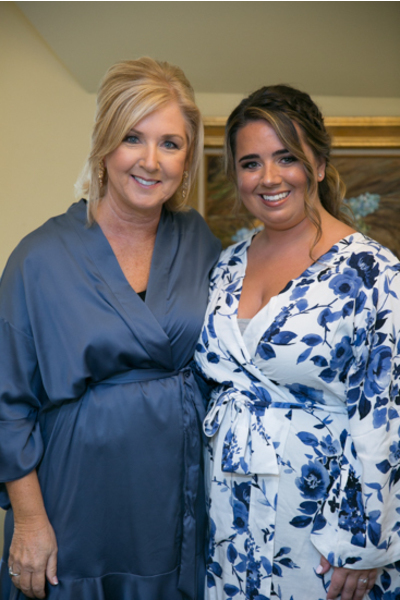 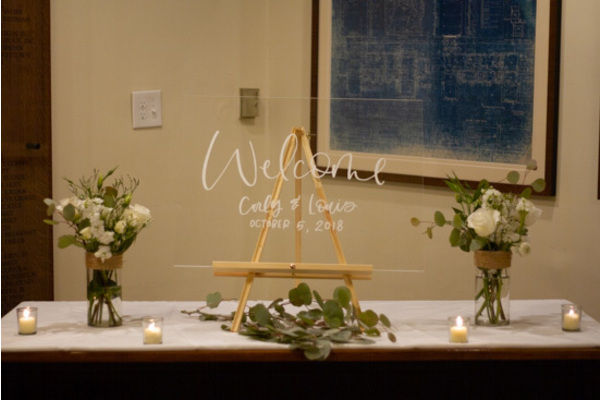 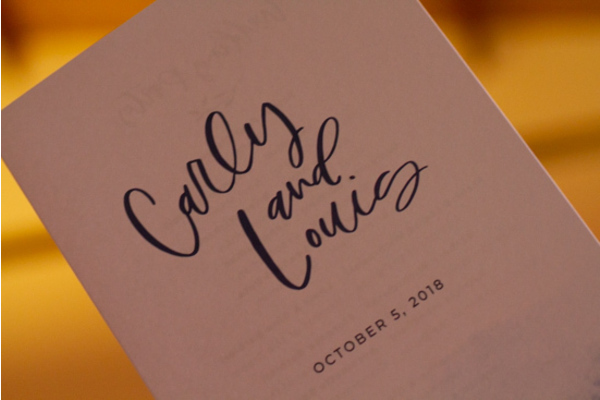 Congratulations, again, to Carly and Lou! 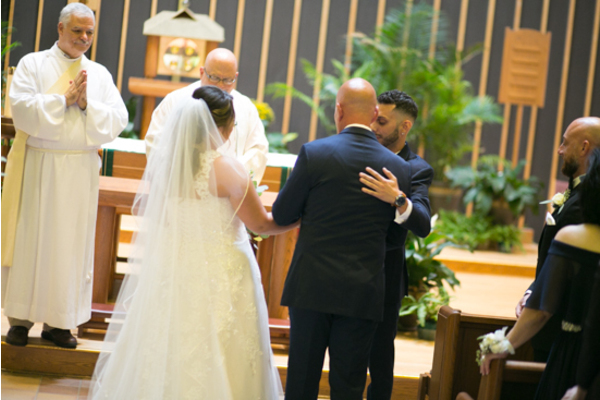 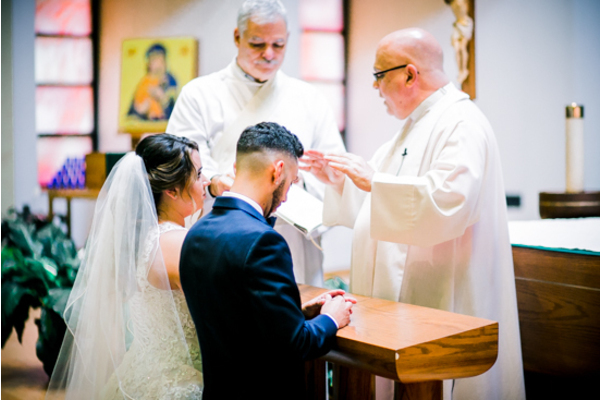 May you both have a happy and blessed life as you begin your journey as husband and wife!